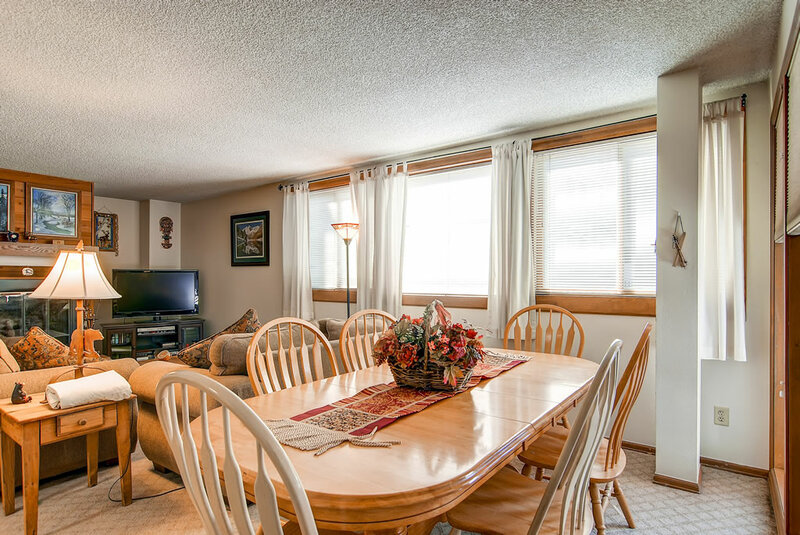 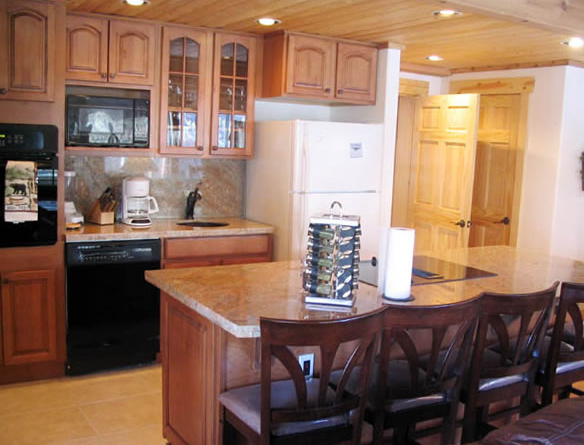 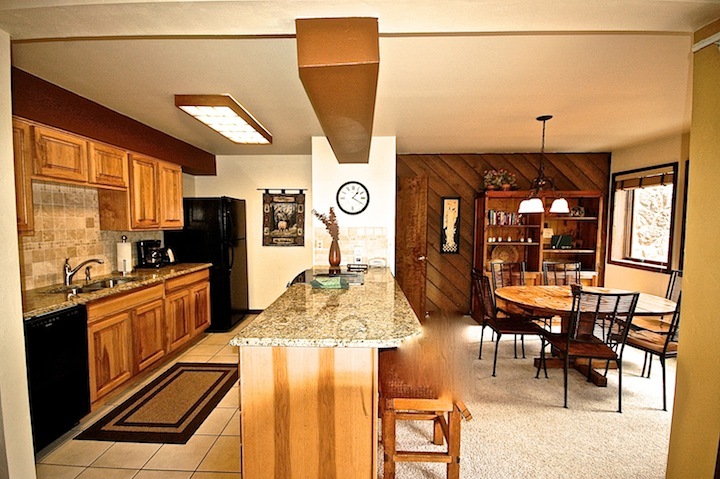 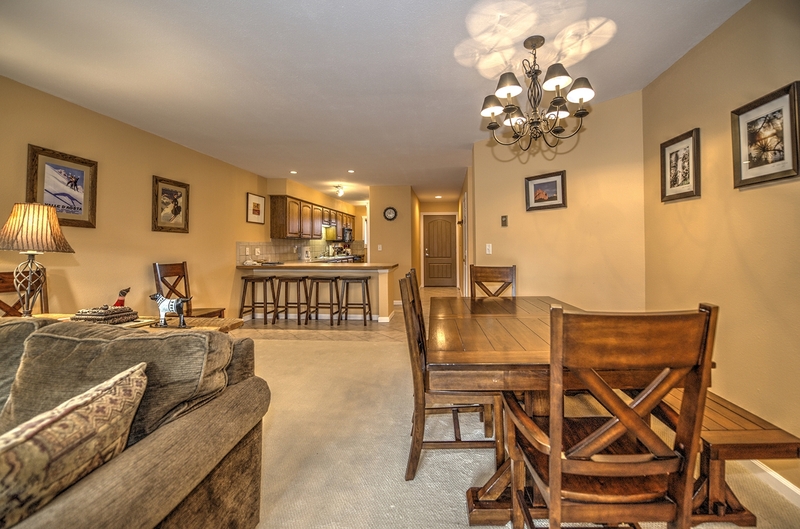 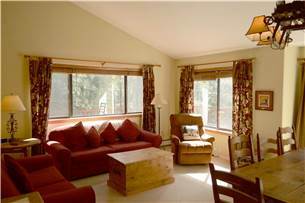 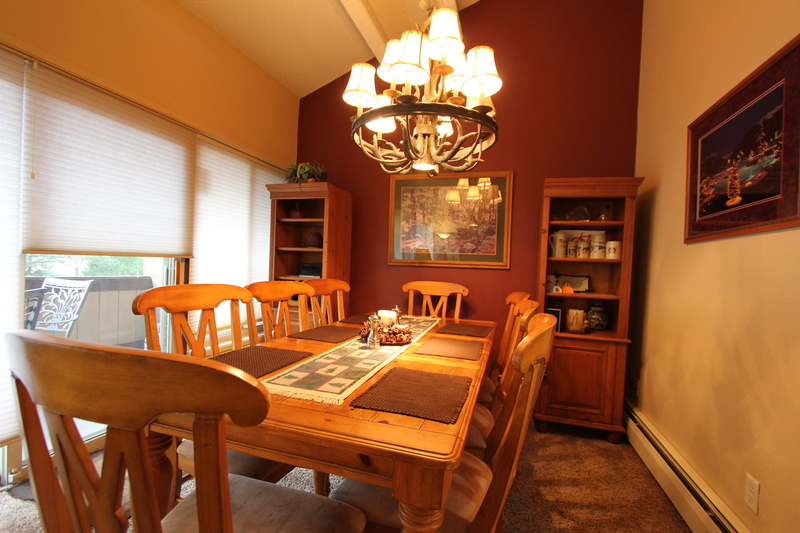 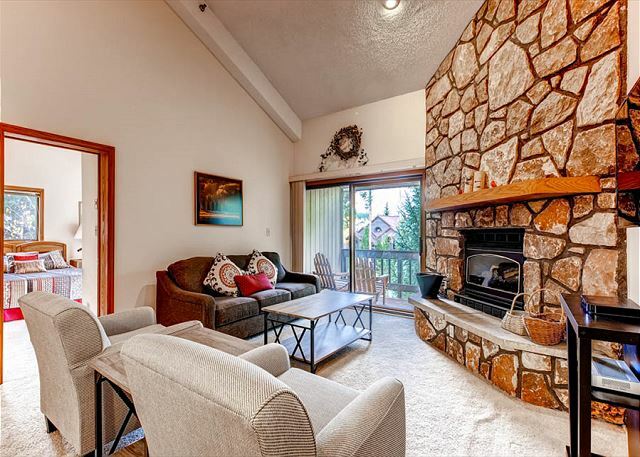 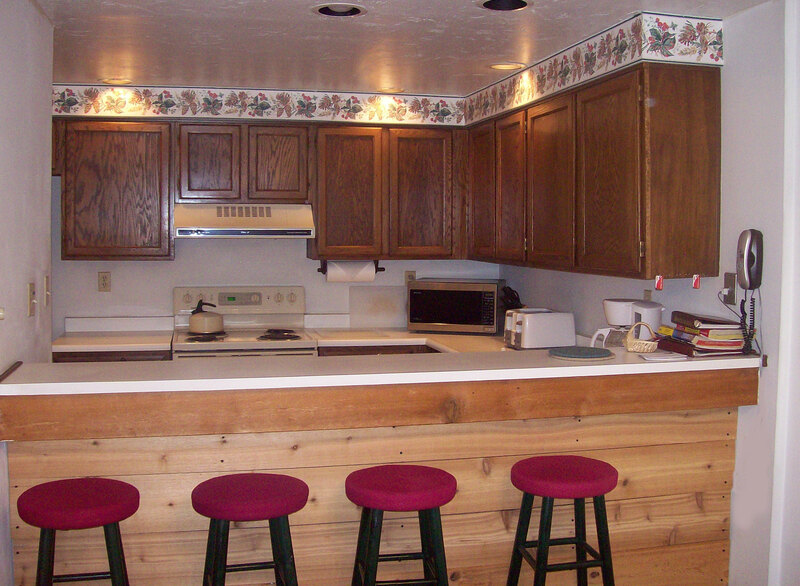 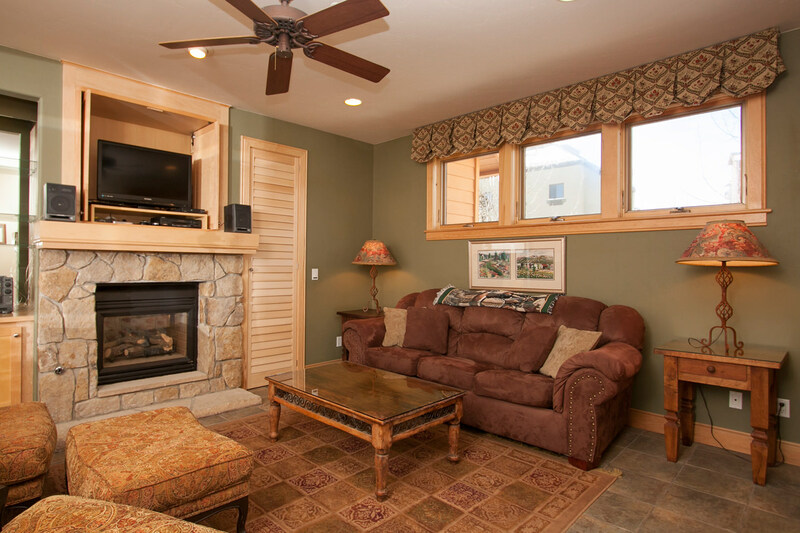 This lovely 3-bedroom, 2.5 bathroom premium home is a perfect getaway for families and groups up to 9. 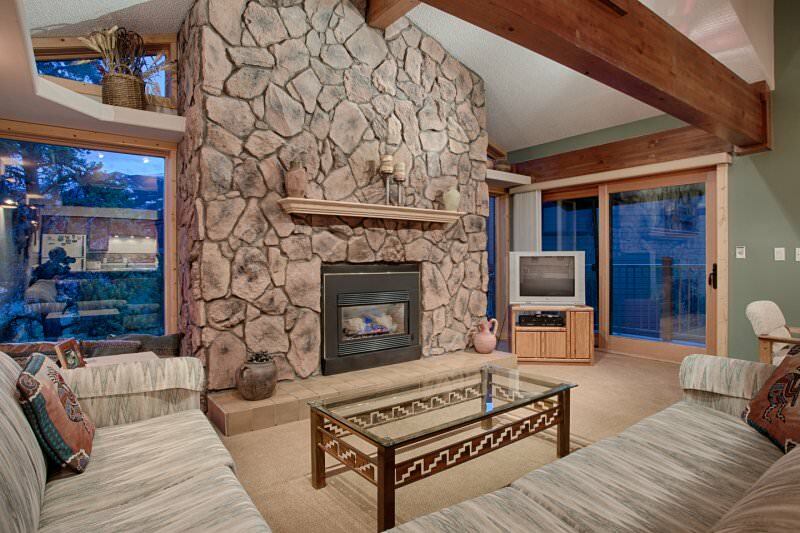 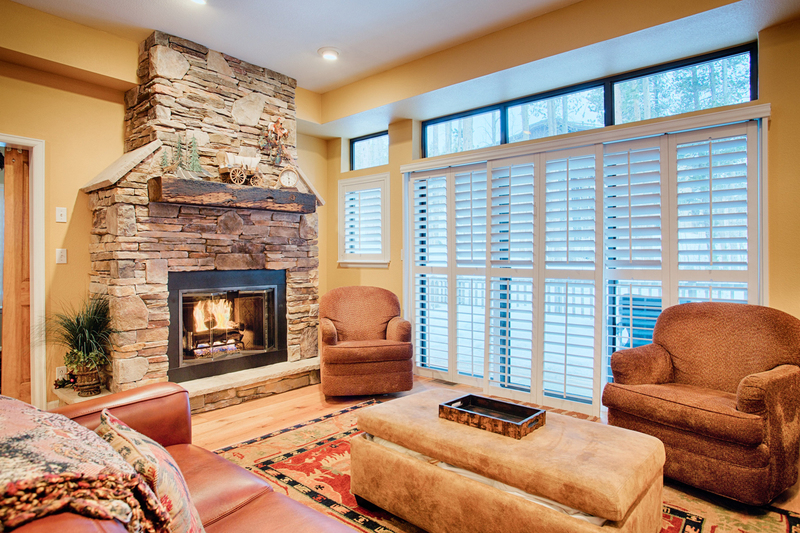 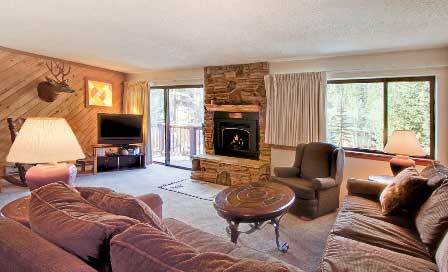 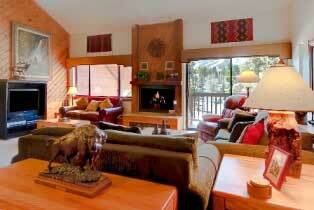 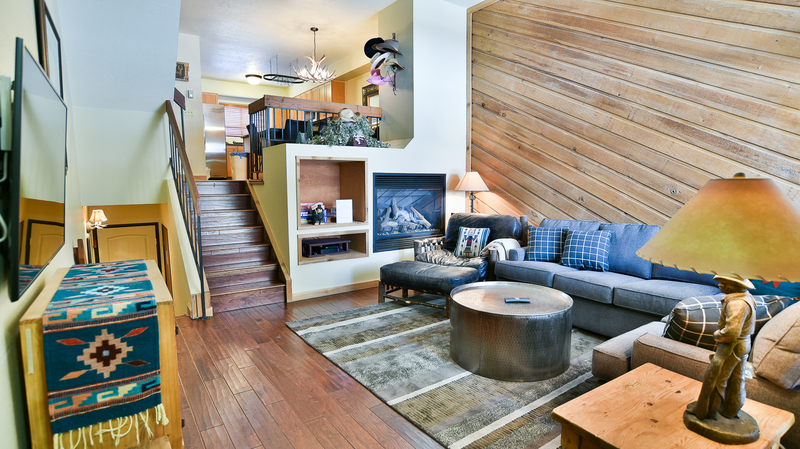 Mountain accents and modern upgrades envelope guests in comfort. 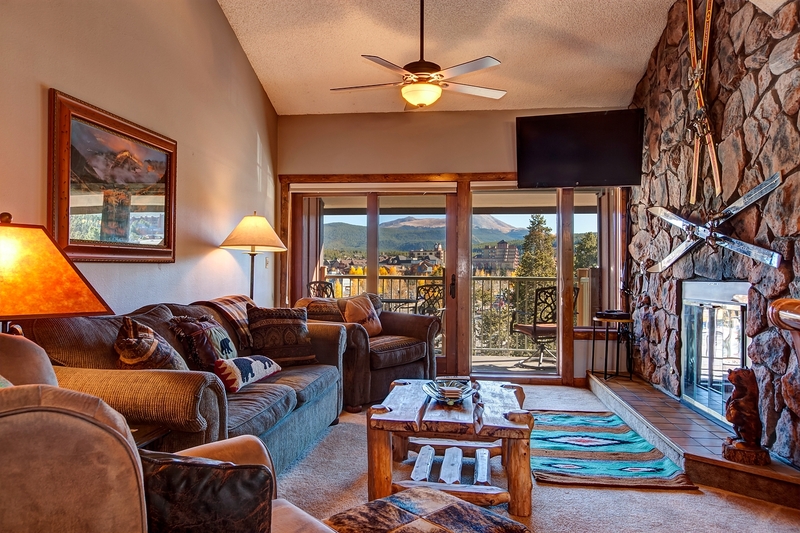 Enjoy views of Mt. 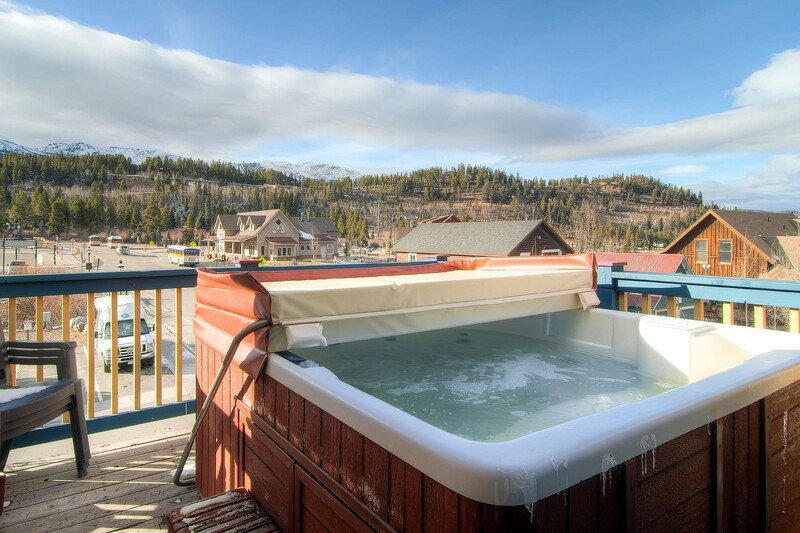 Quandary and the babbling sounds of the Blue River from one of two decks. 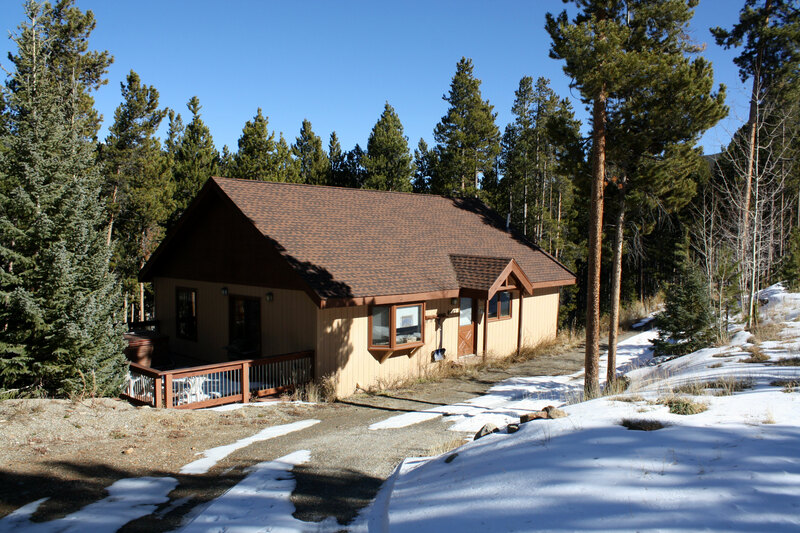 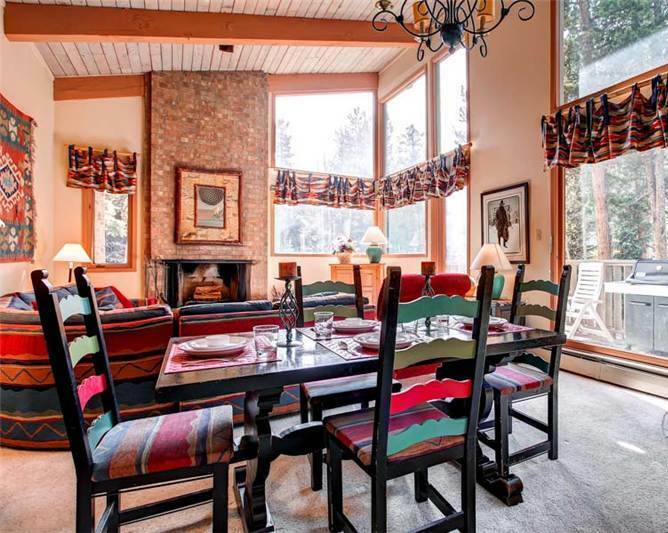 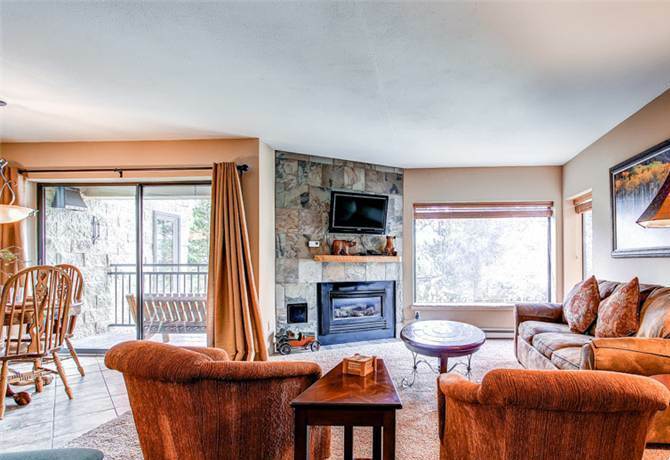 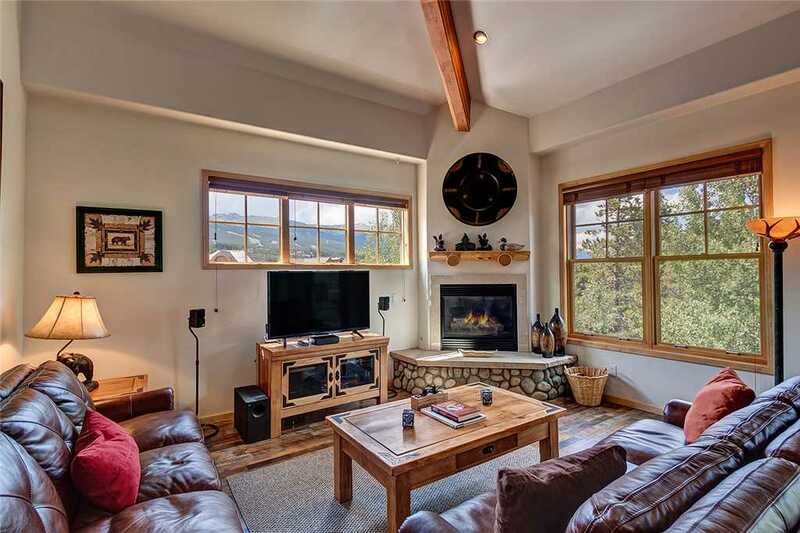 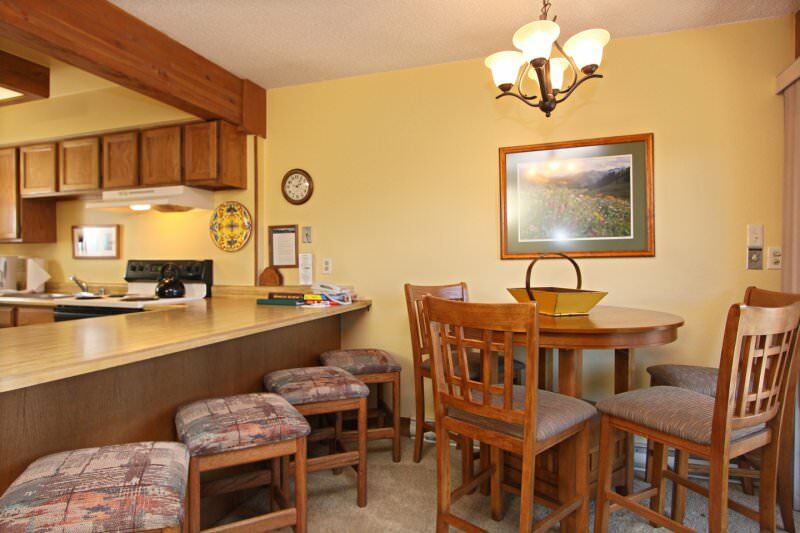 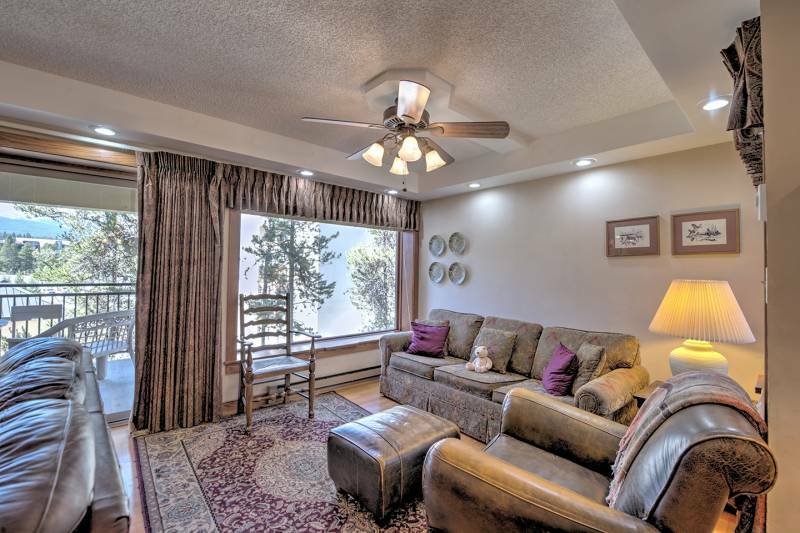 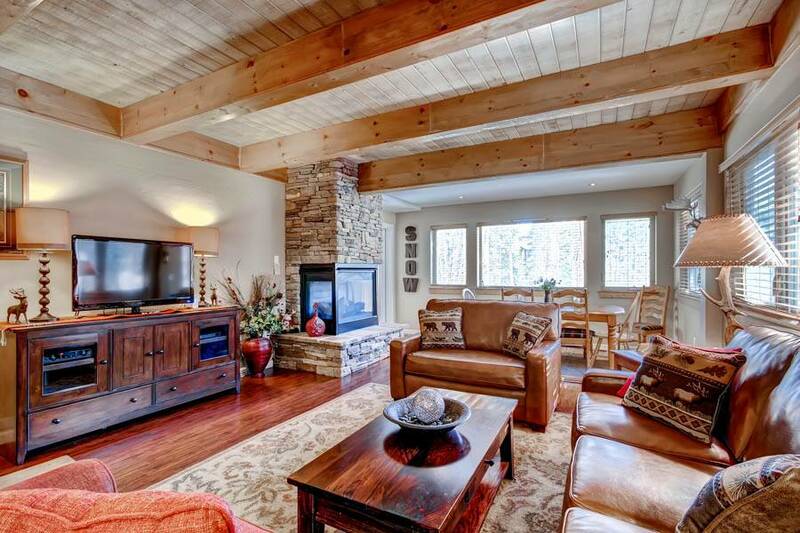 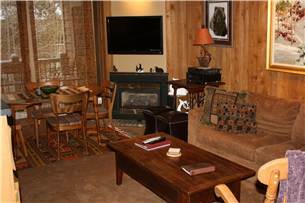 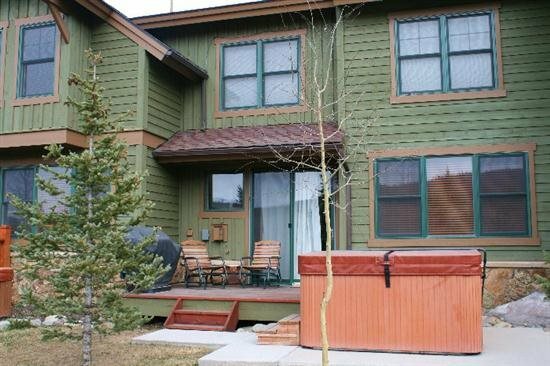 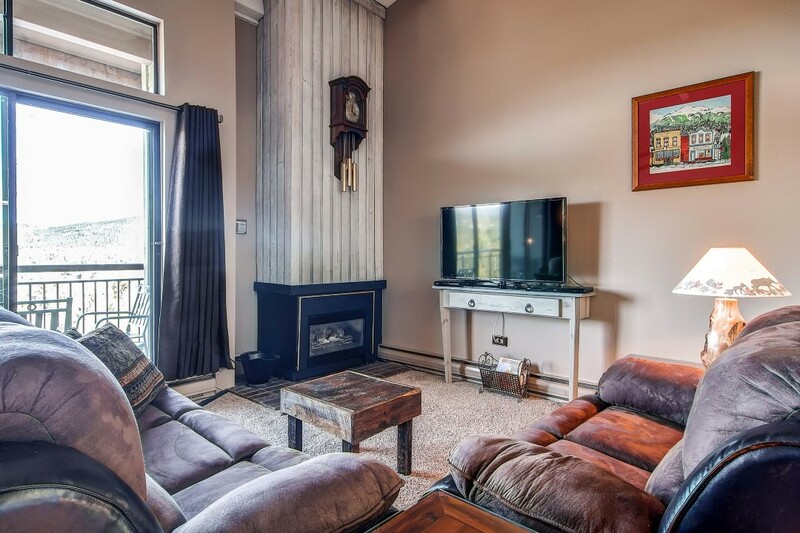 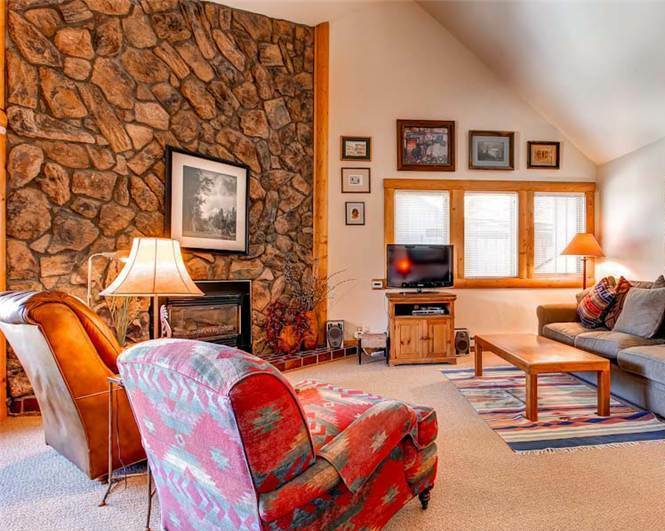 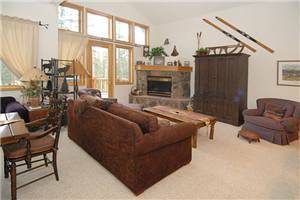 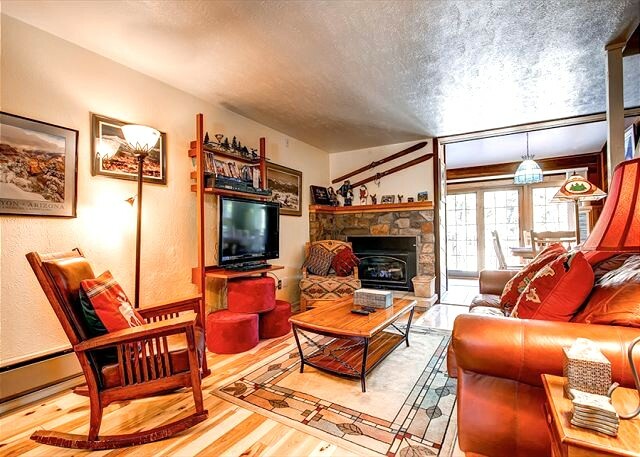 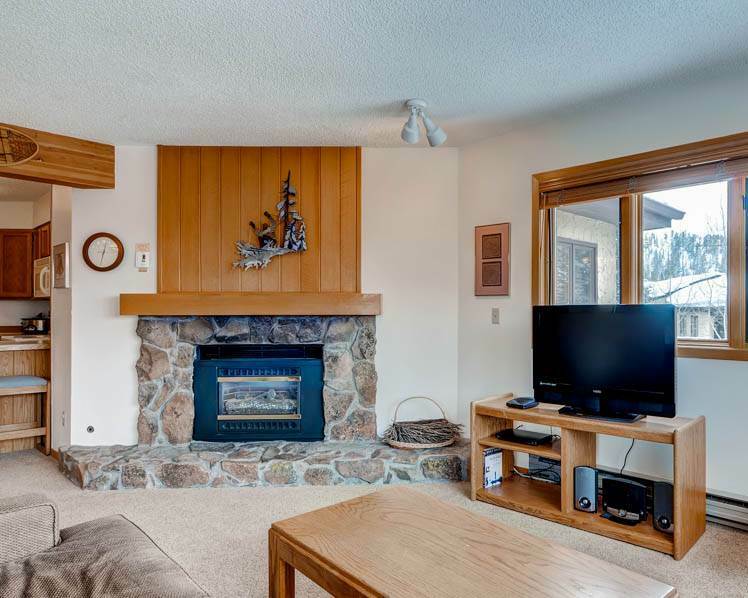 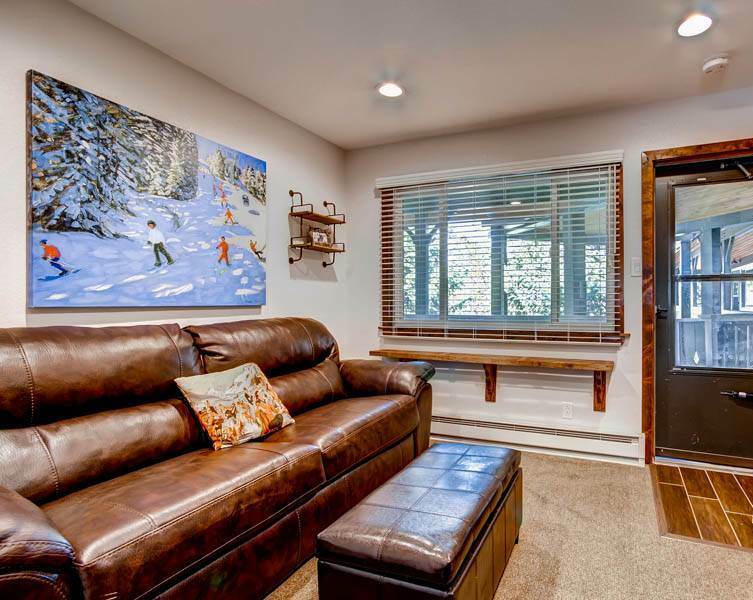 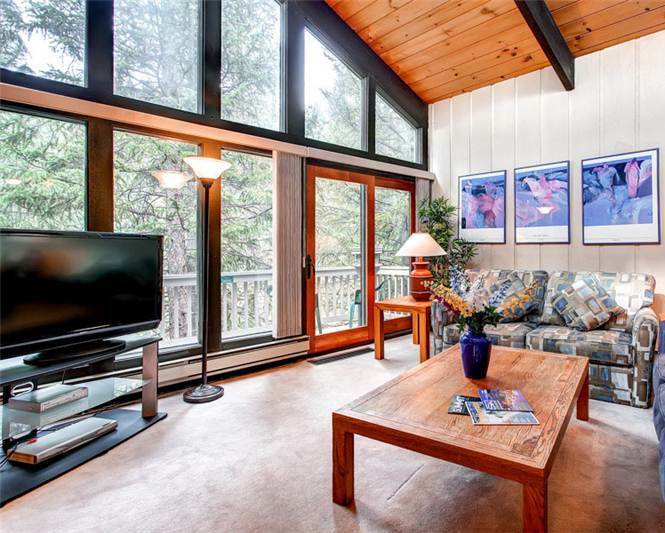 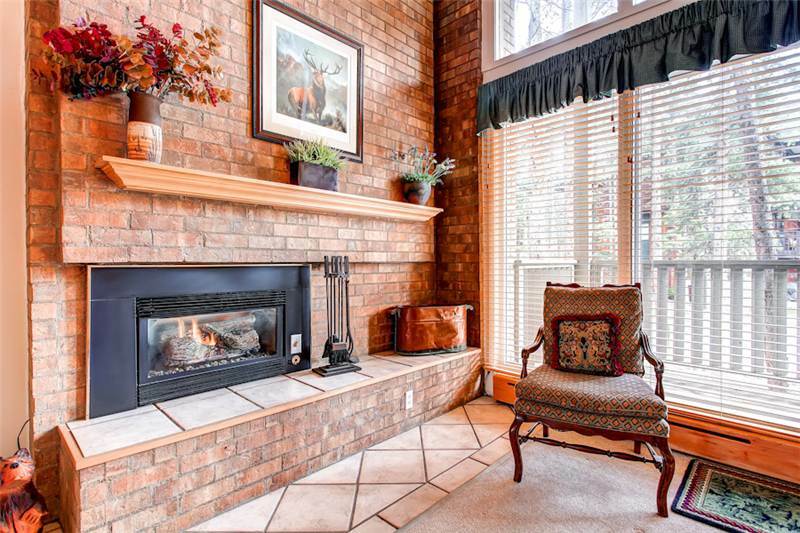 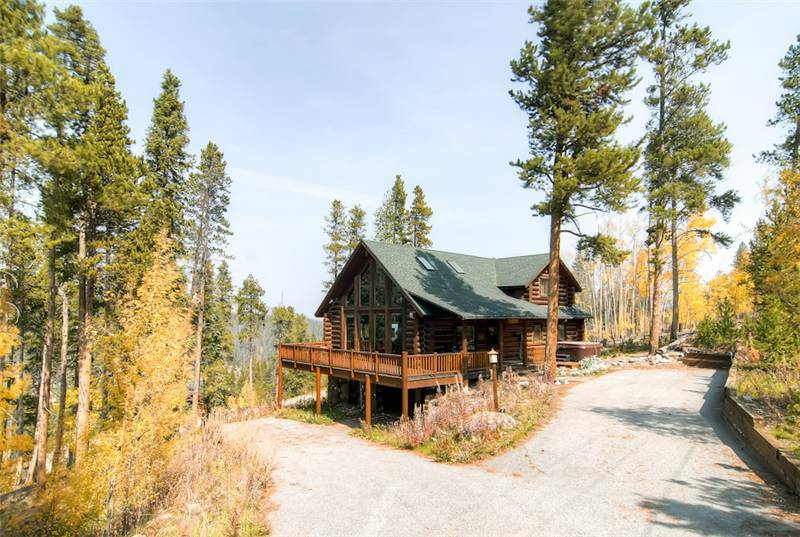 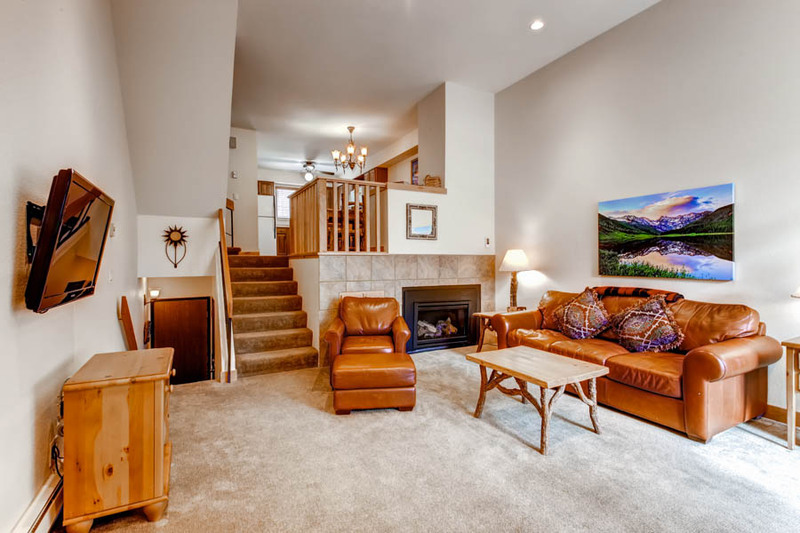 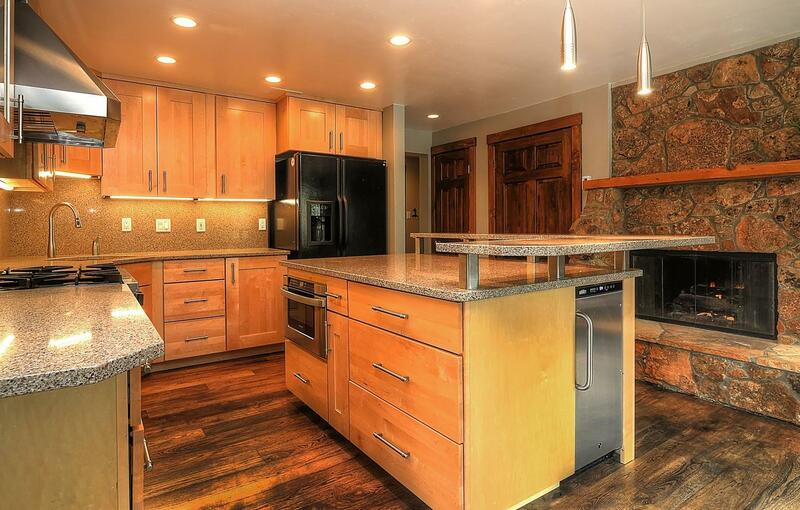 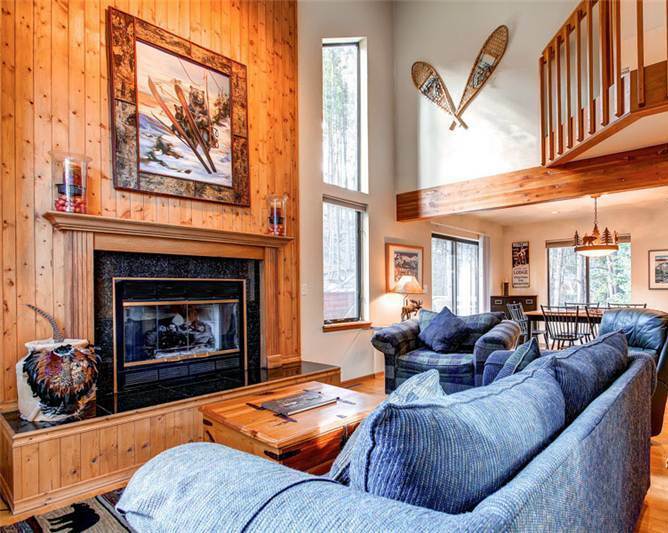 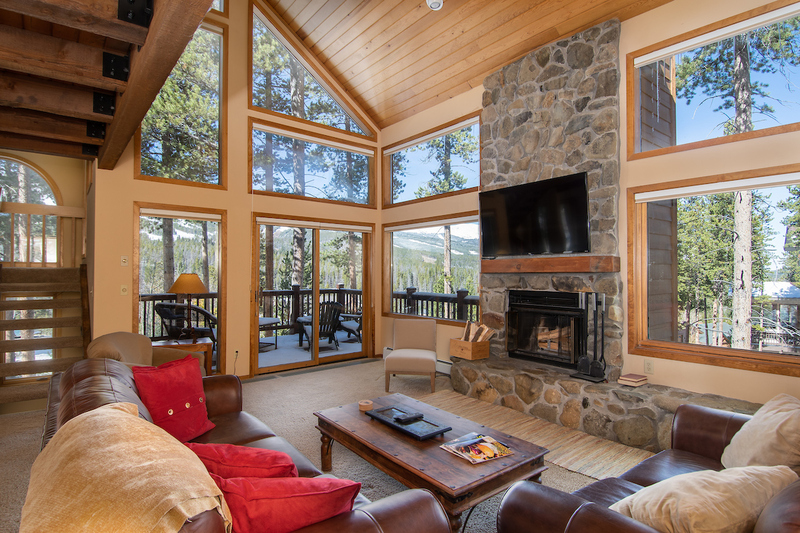 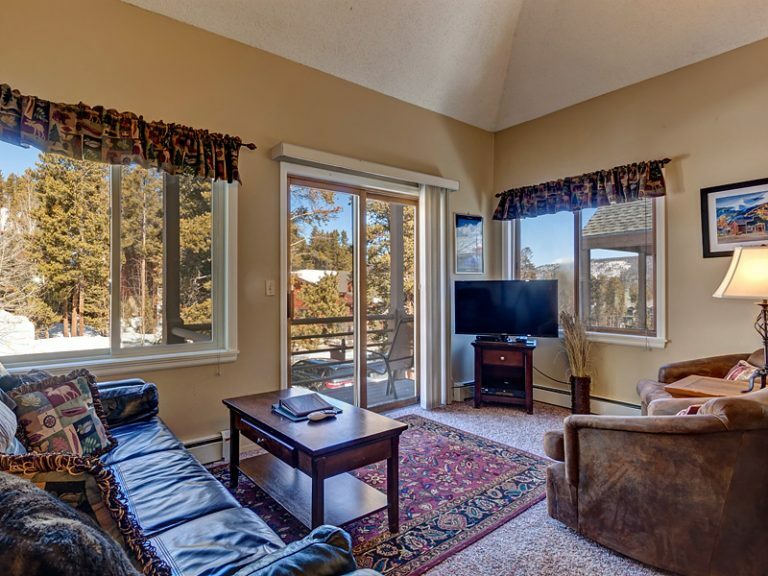 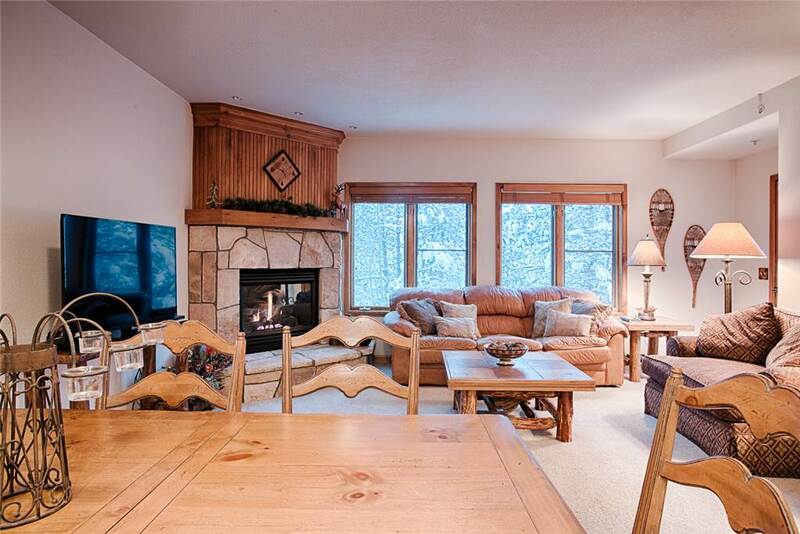 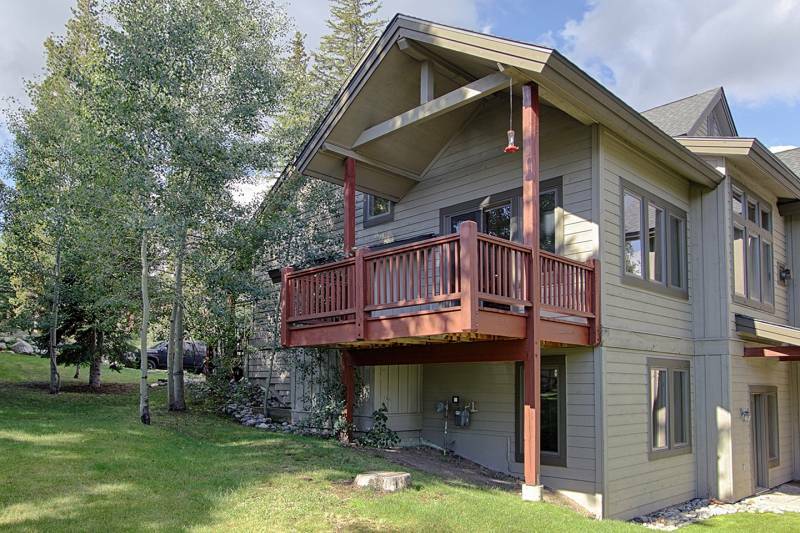 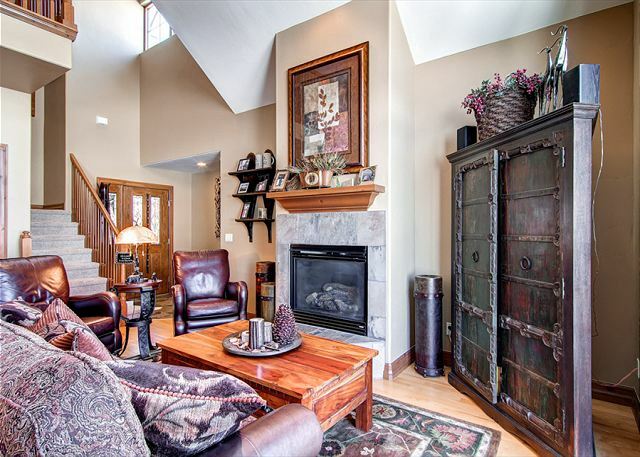 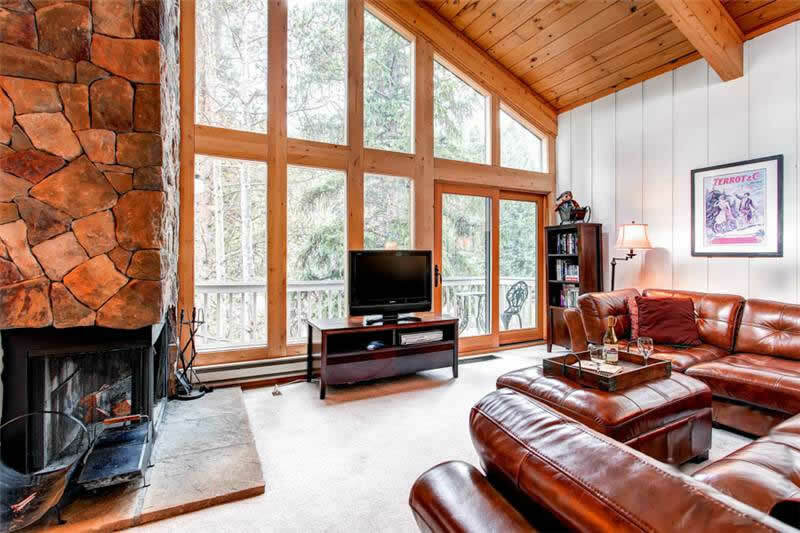 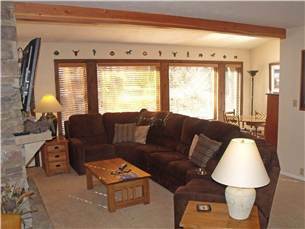 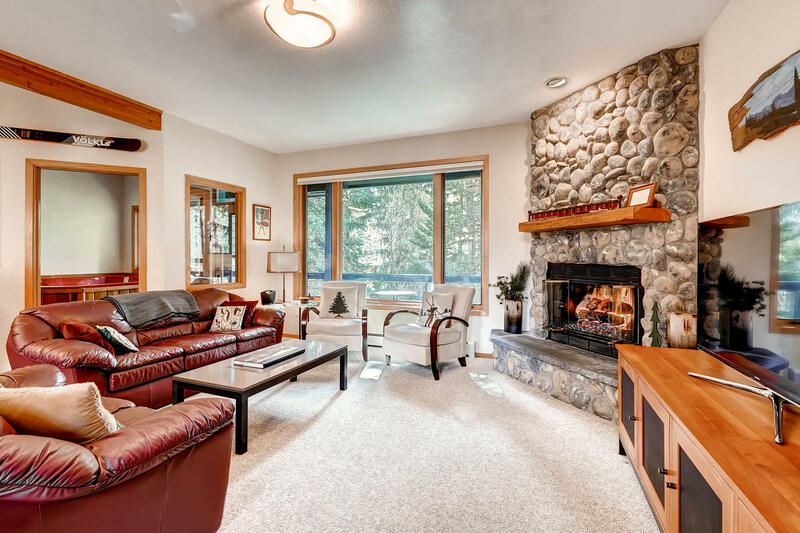 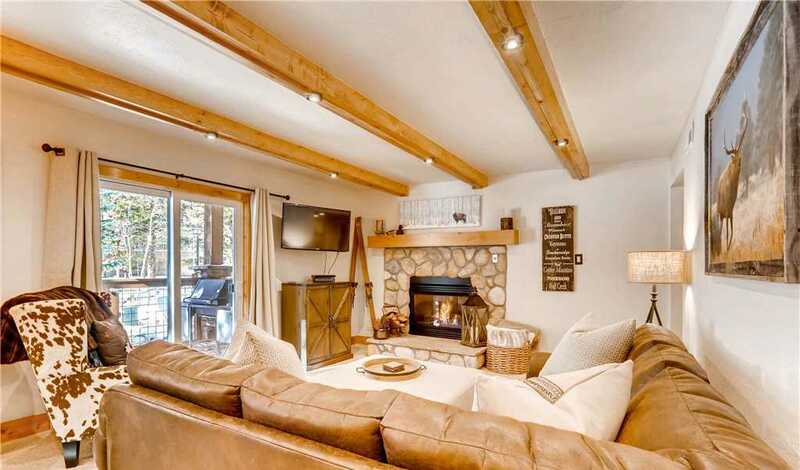 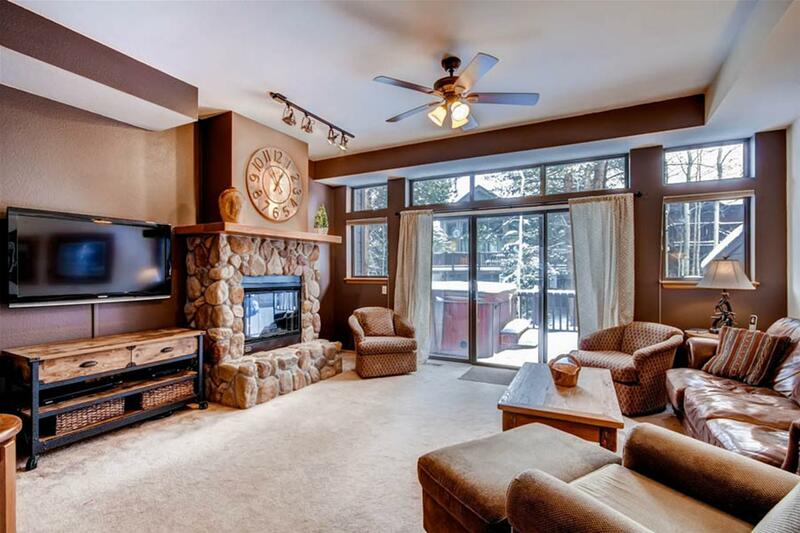 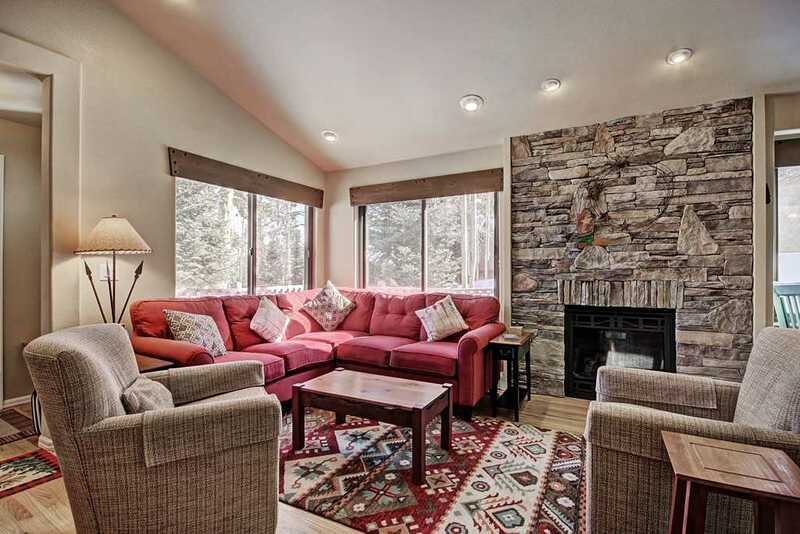 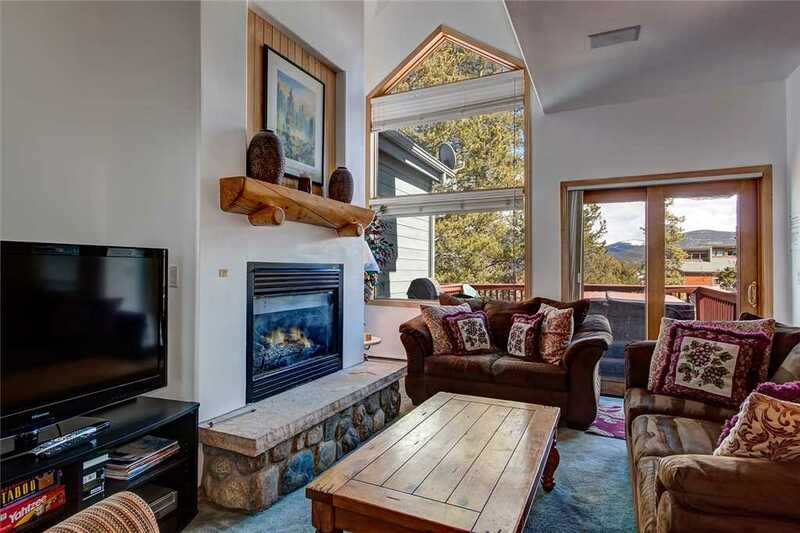 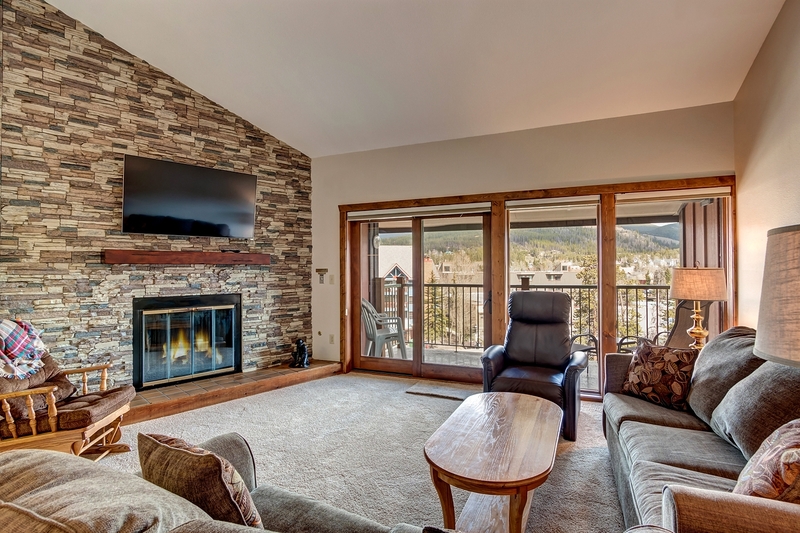 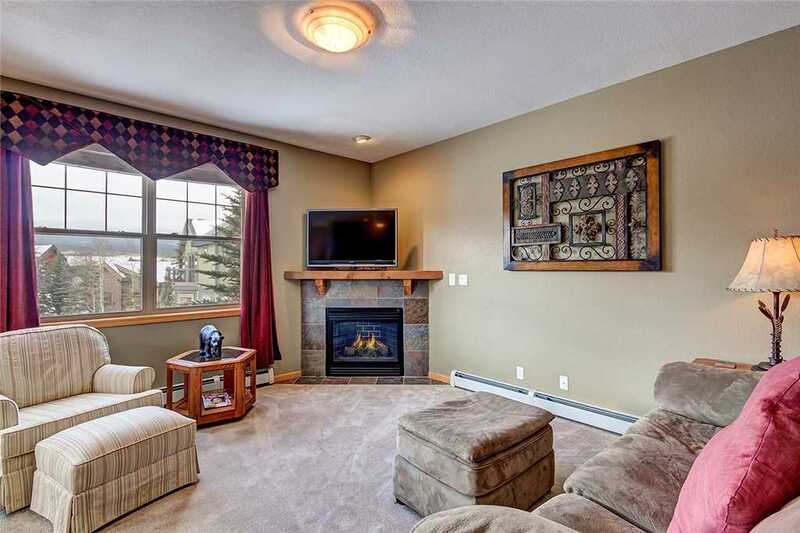 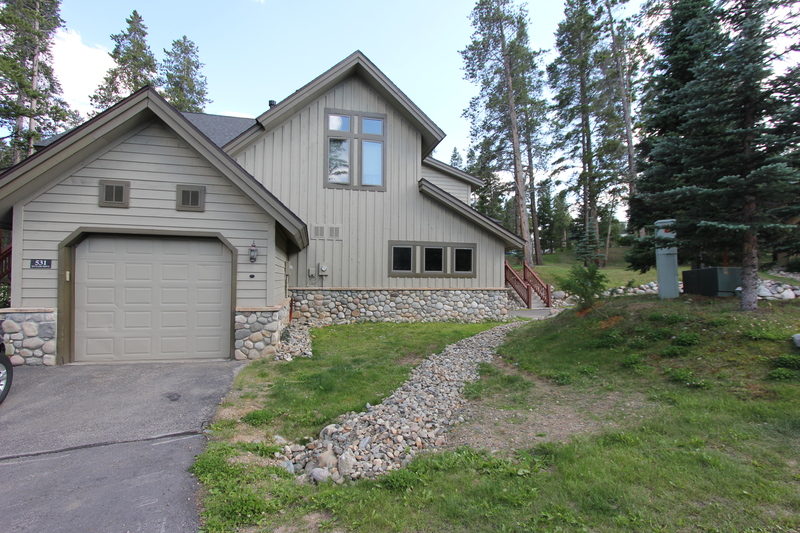 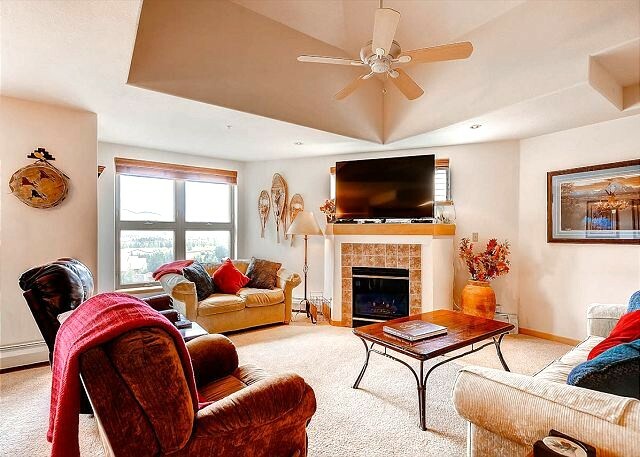 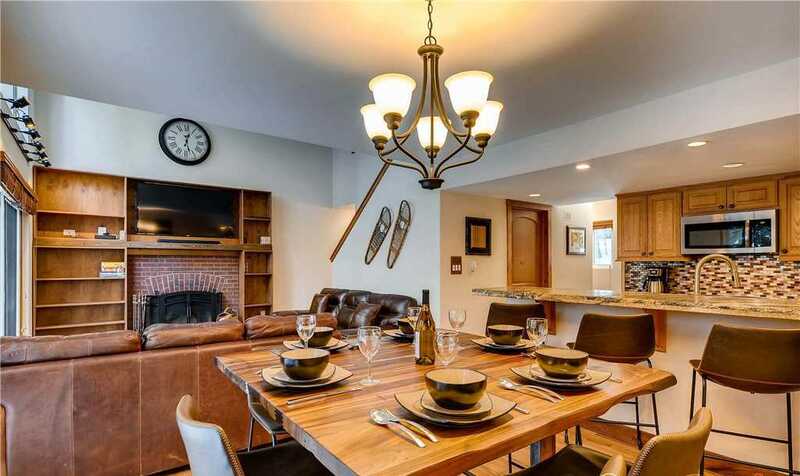 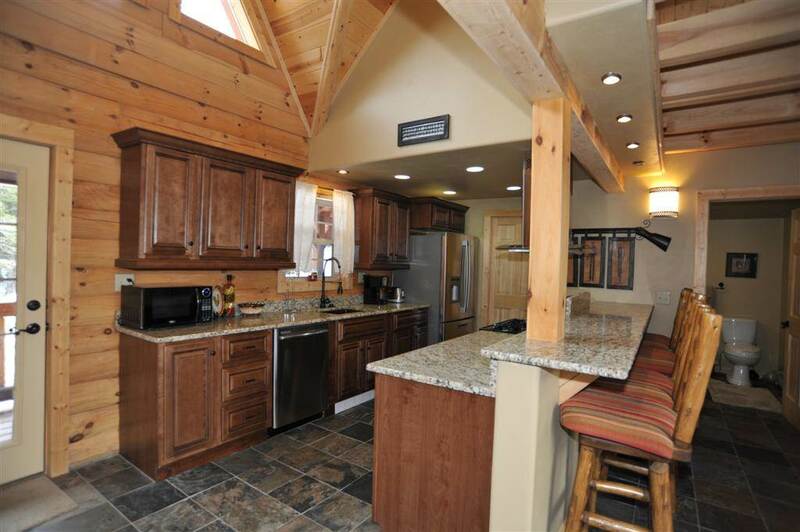 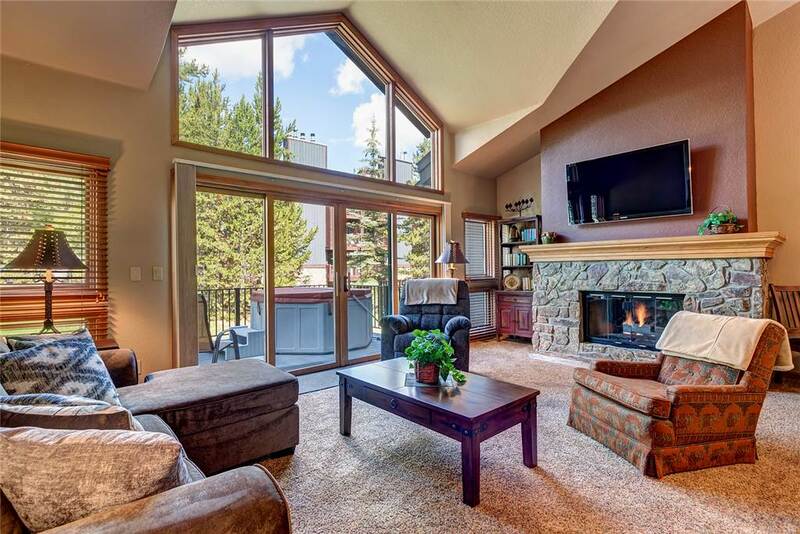 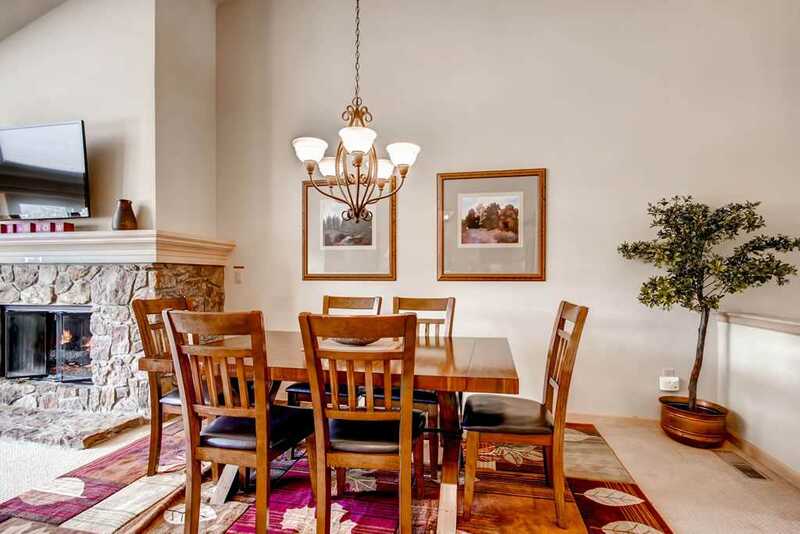 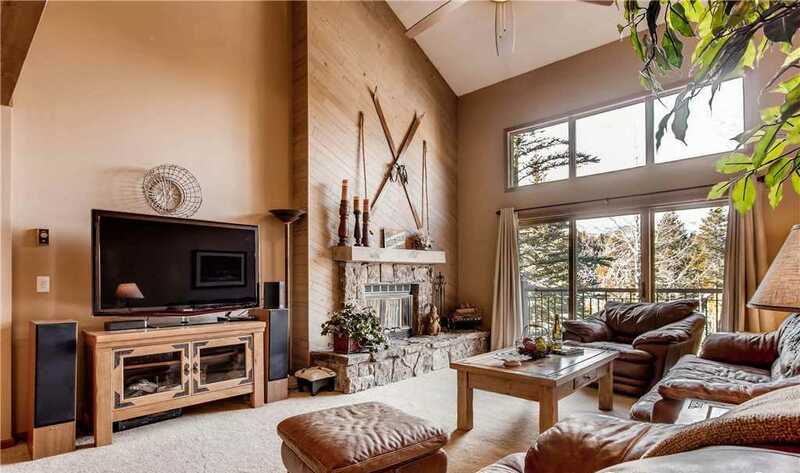 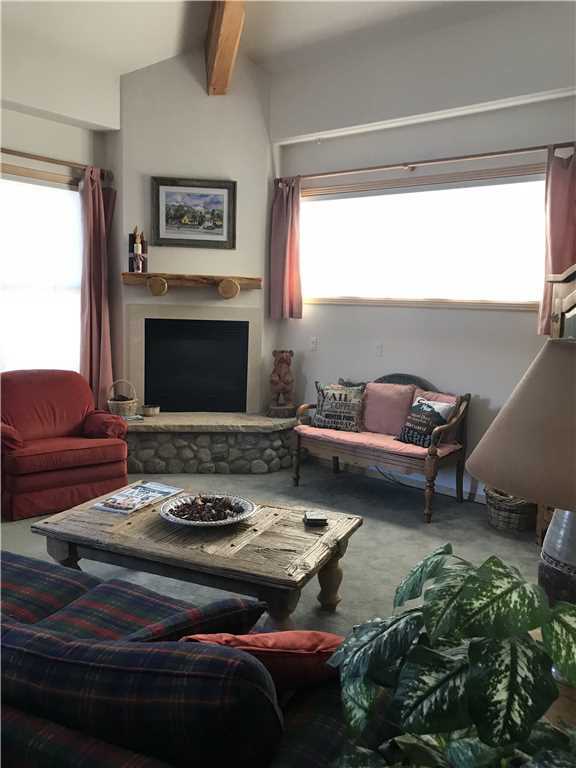 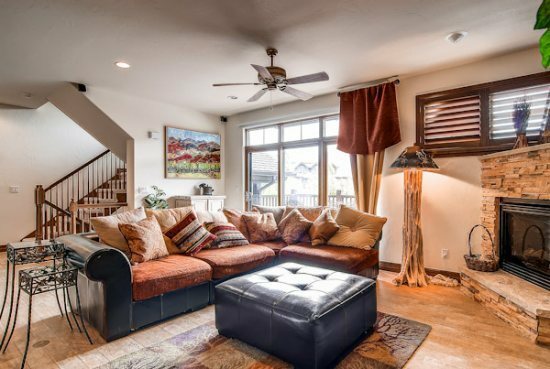 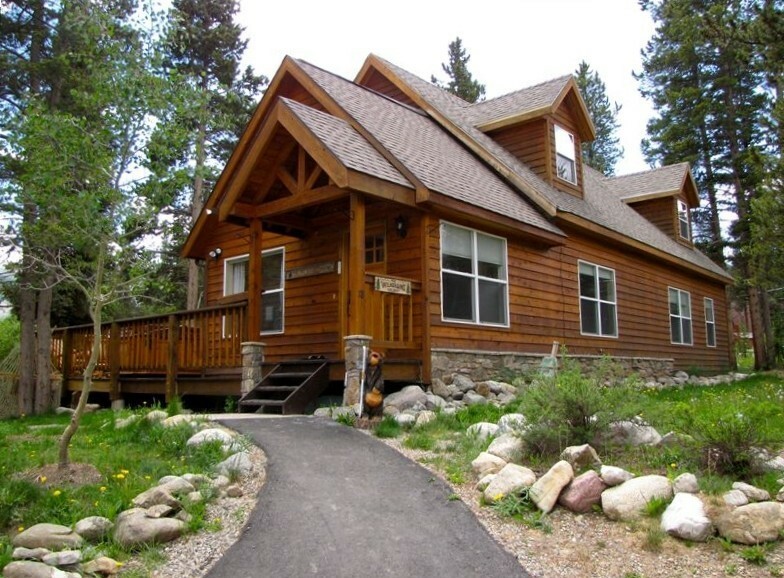 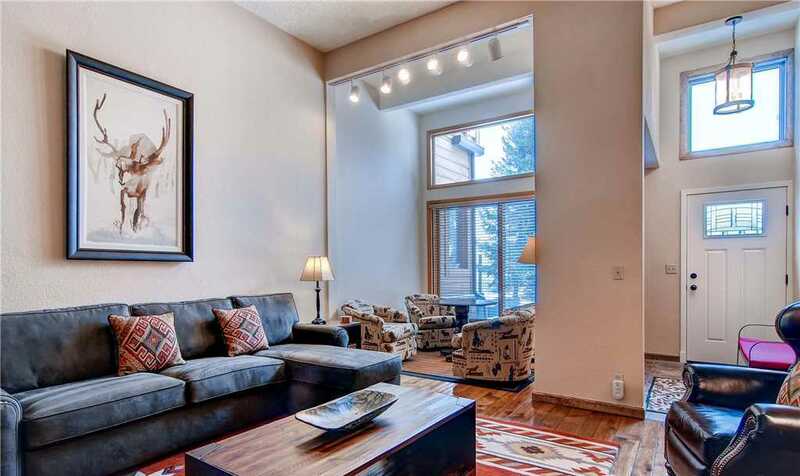 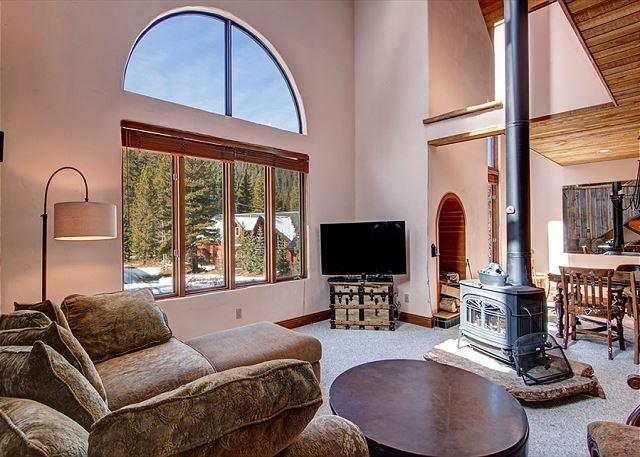 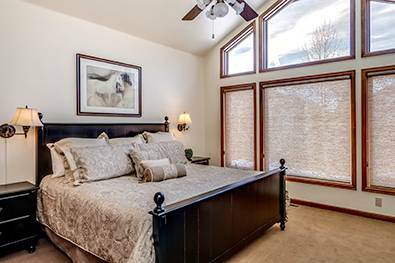 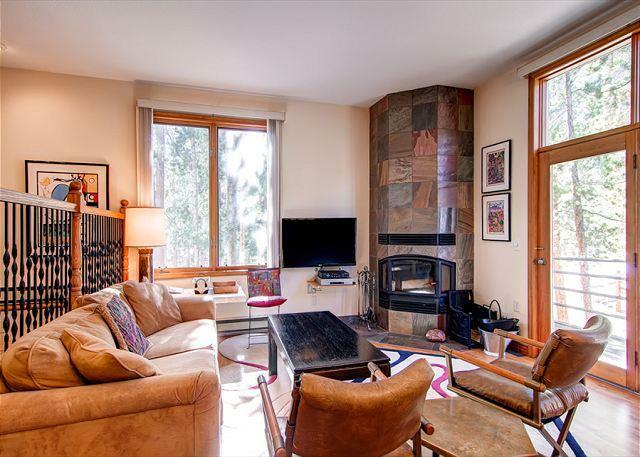 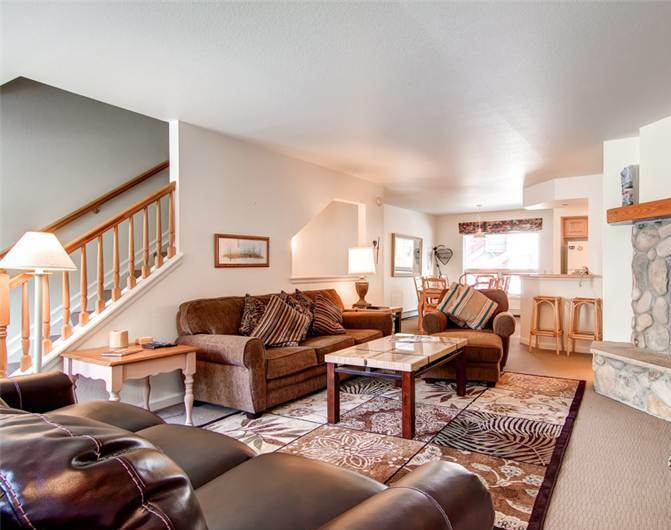 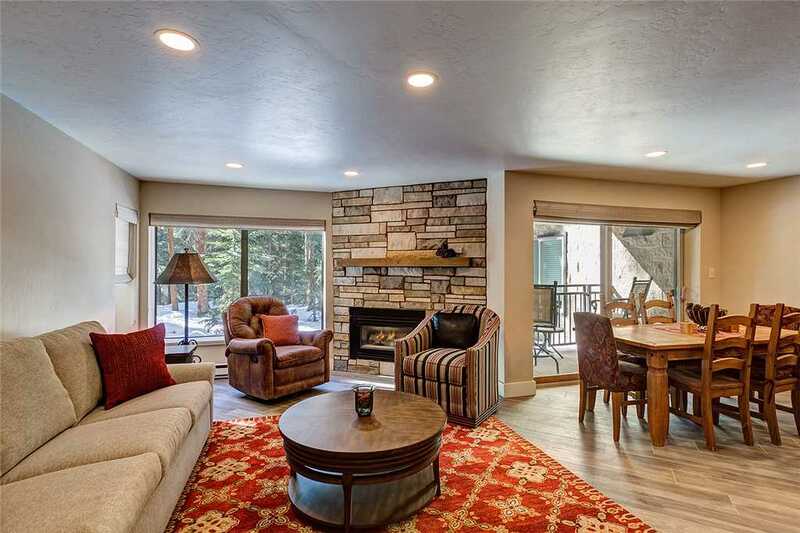 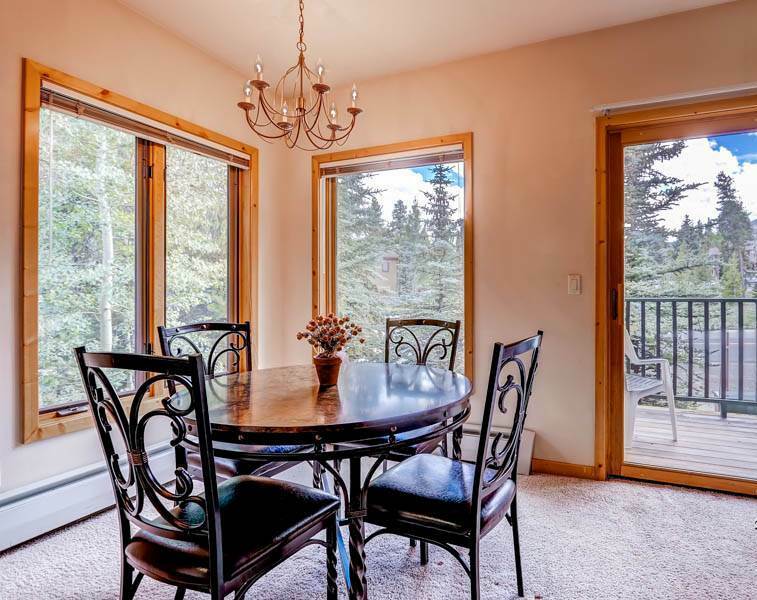 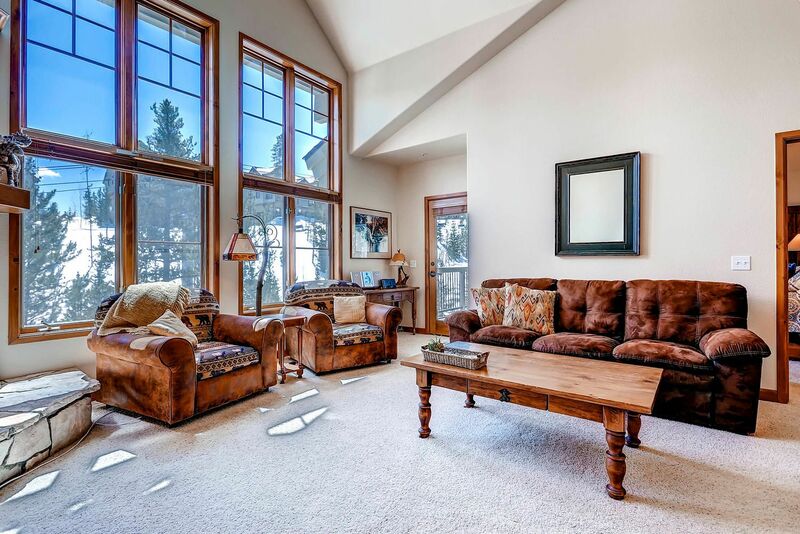 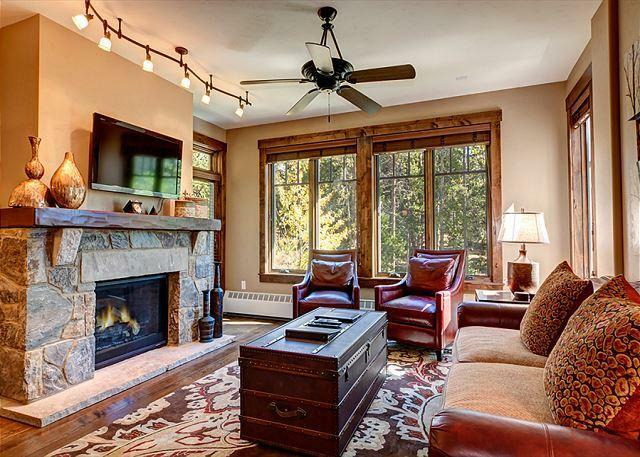 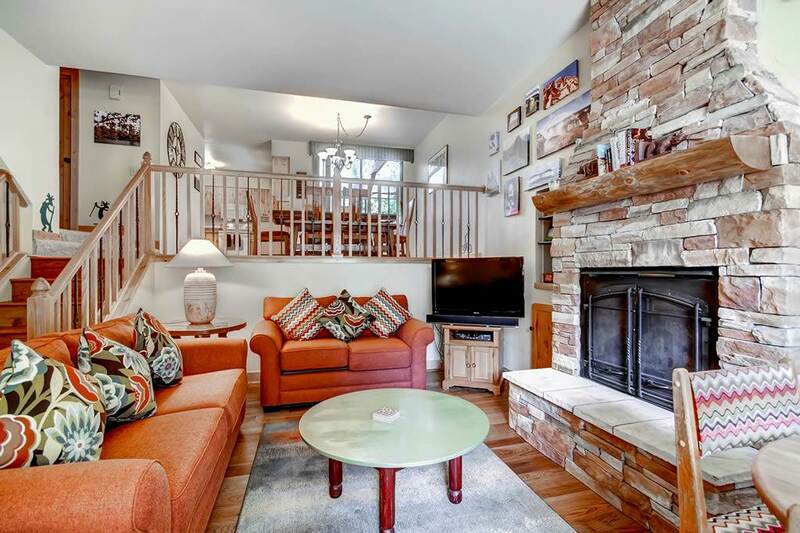 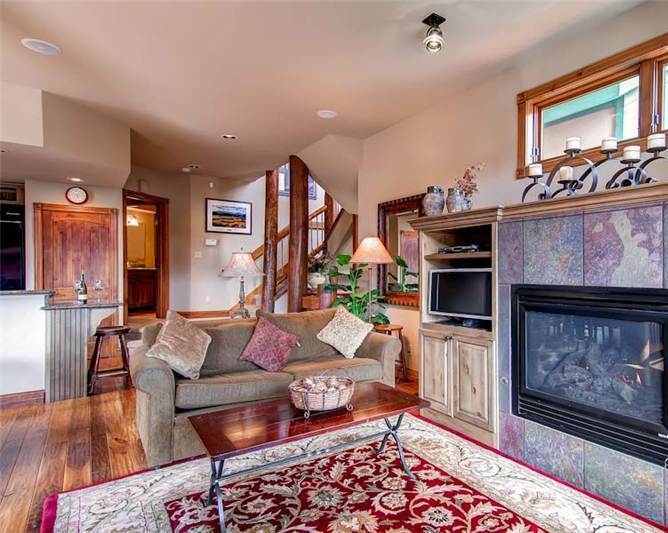 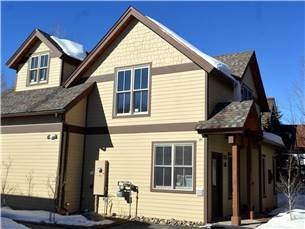 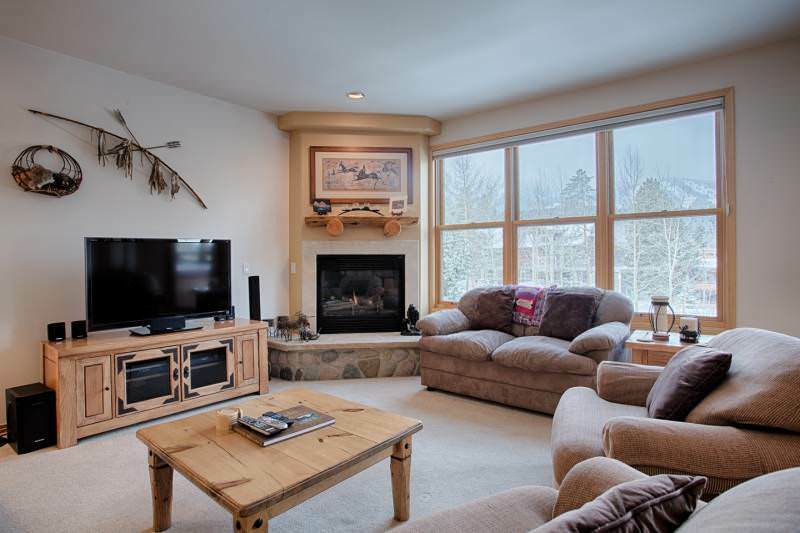 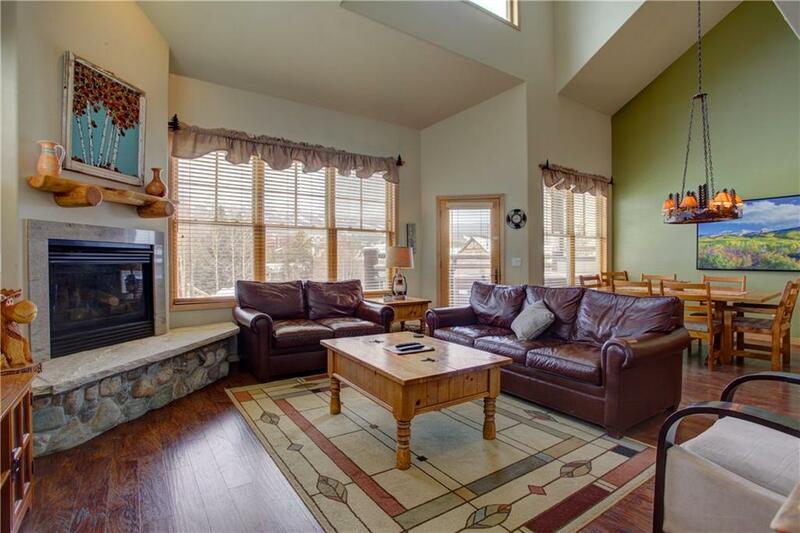 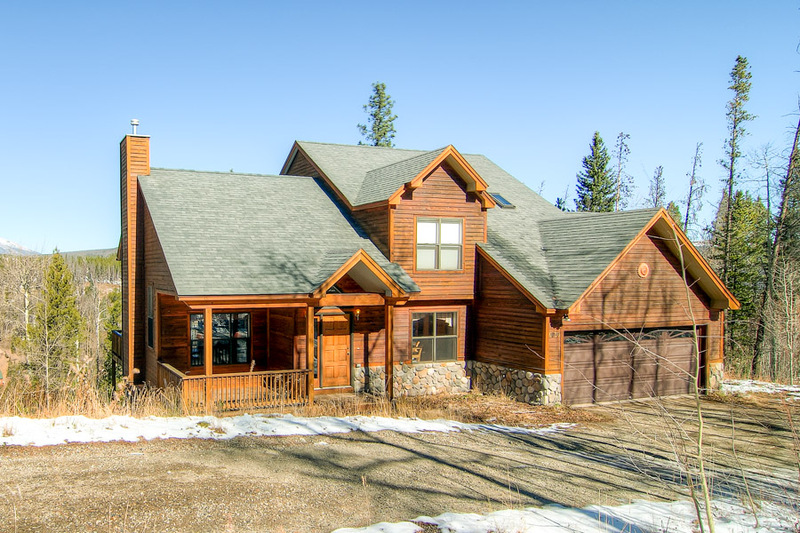 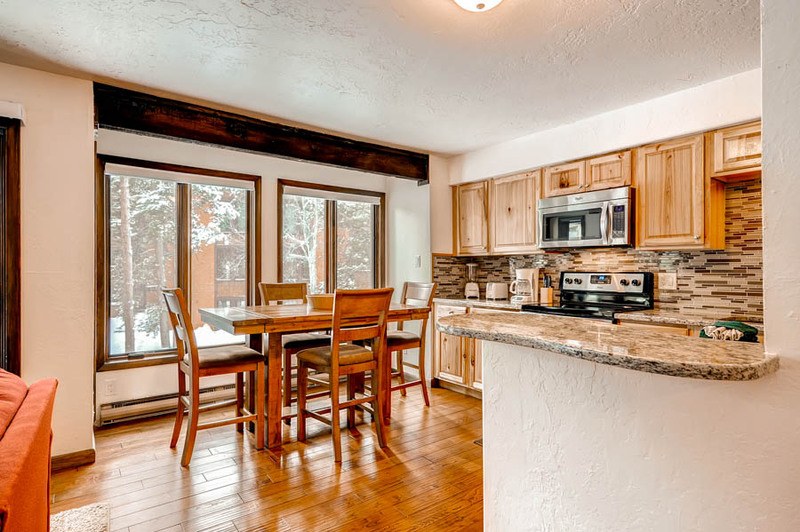 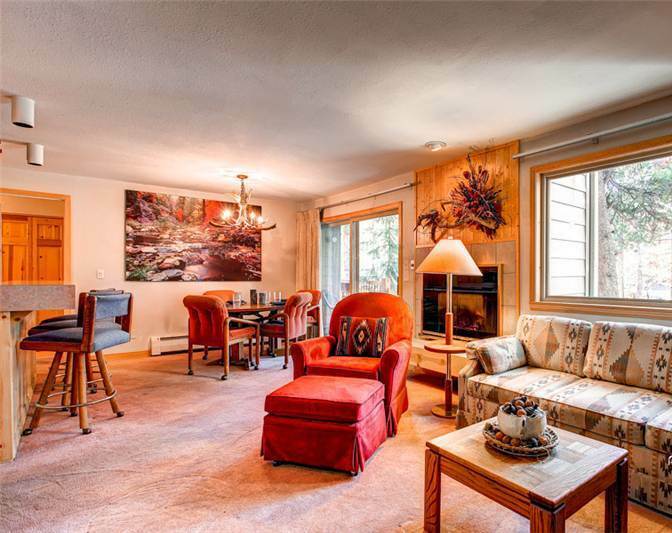 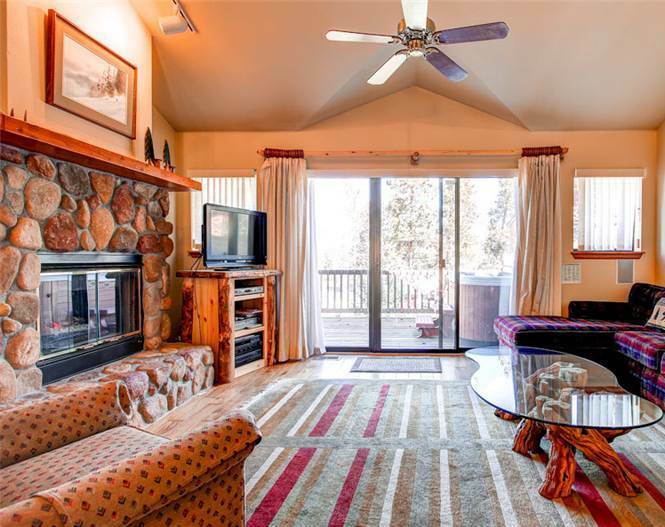 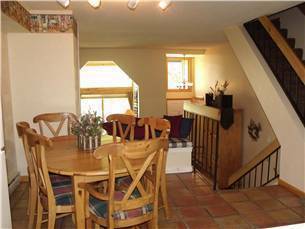 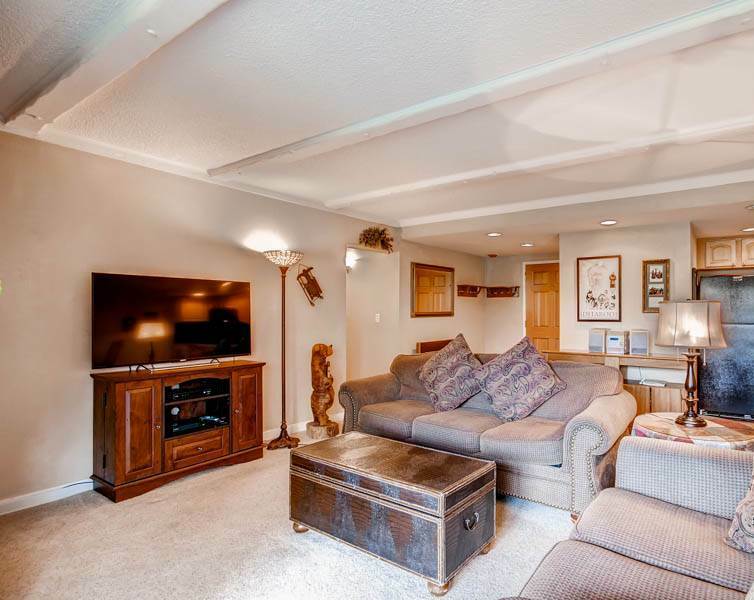 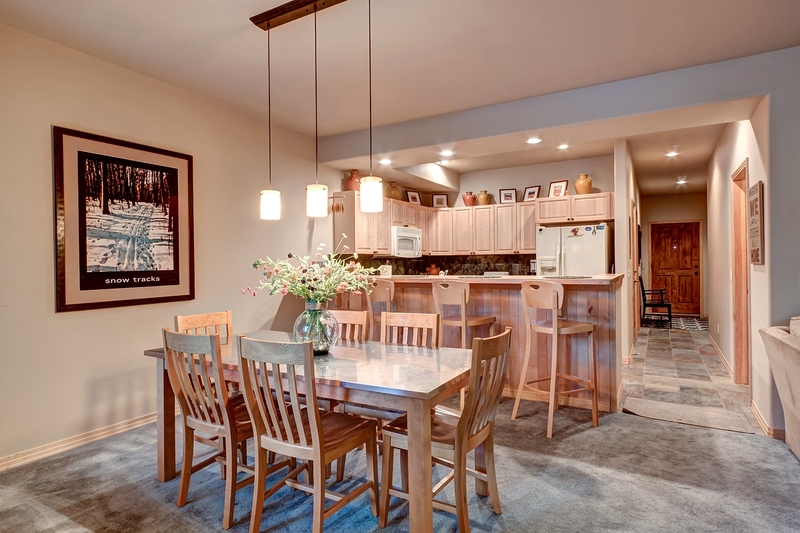 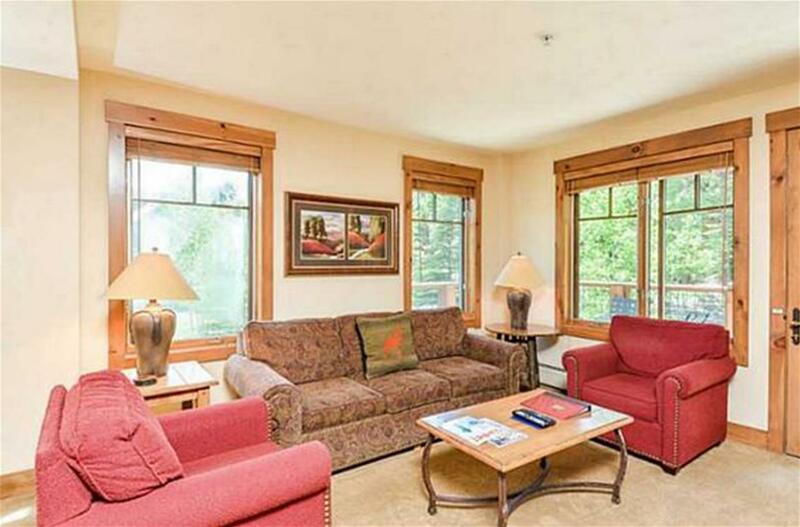 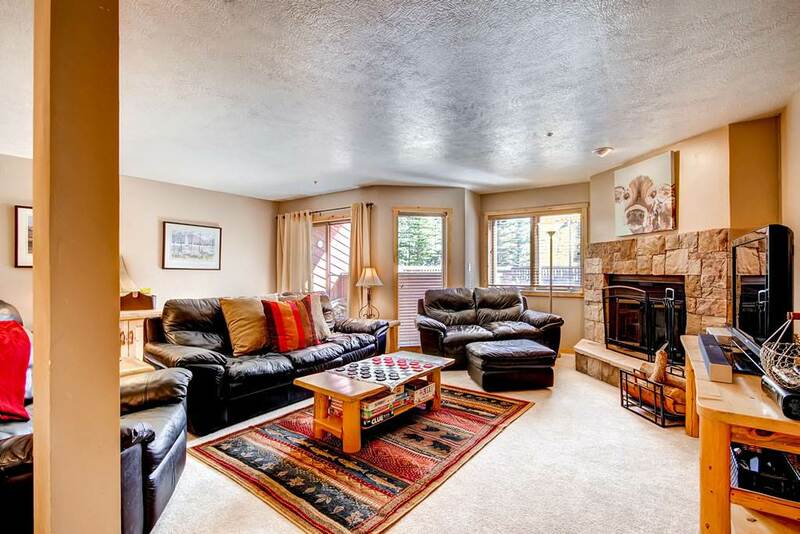 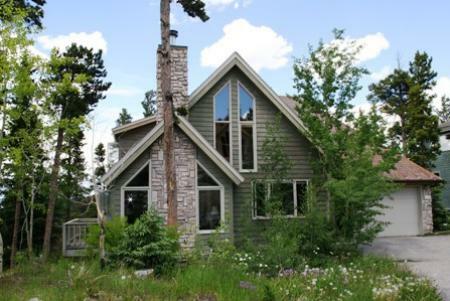 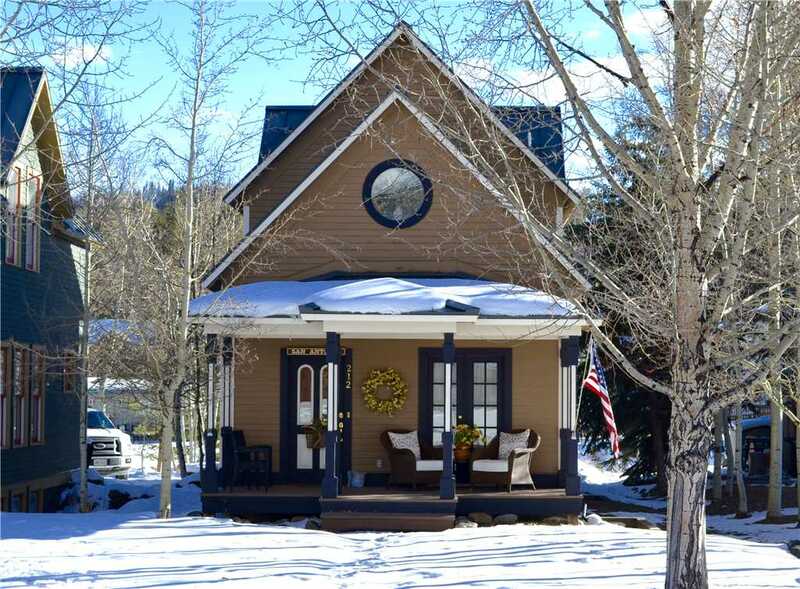 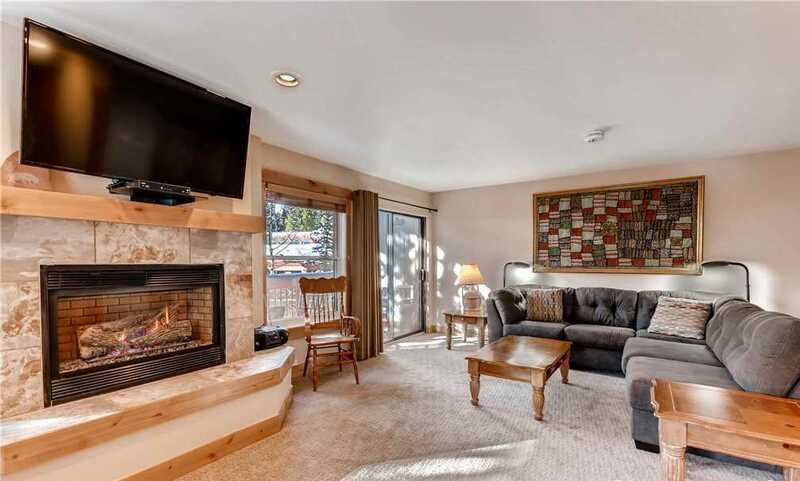 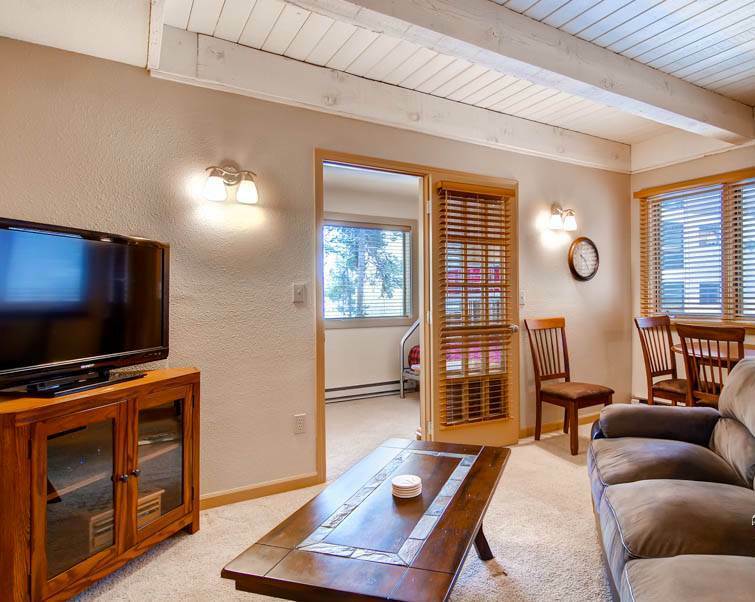 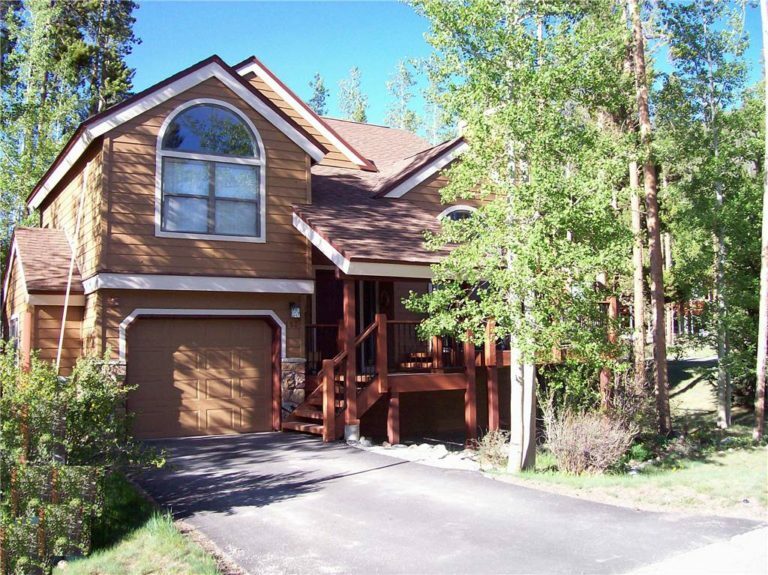 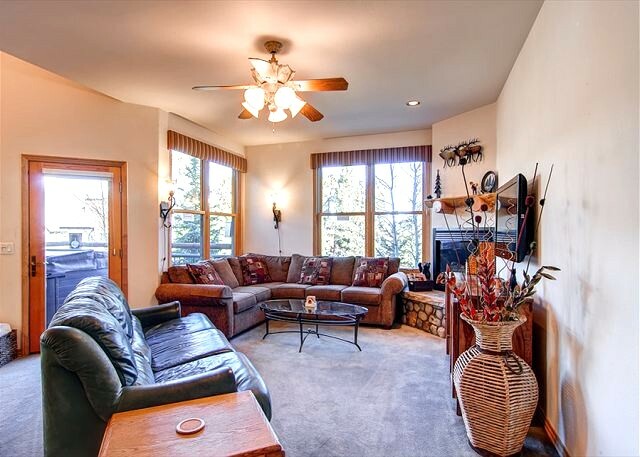 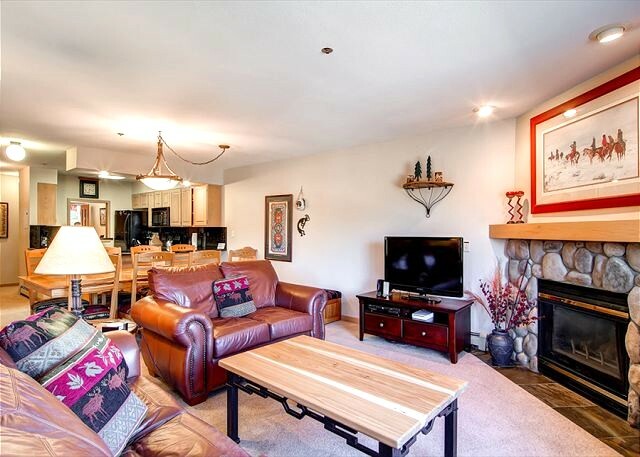 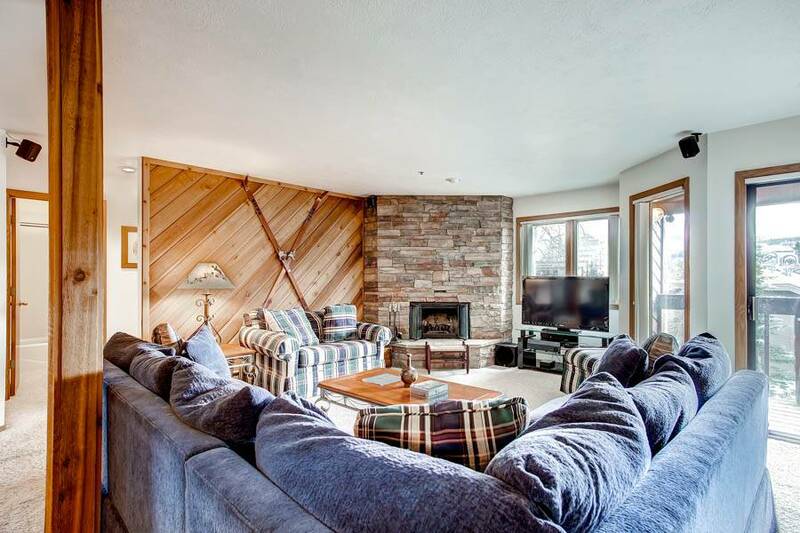 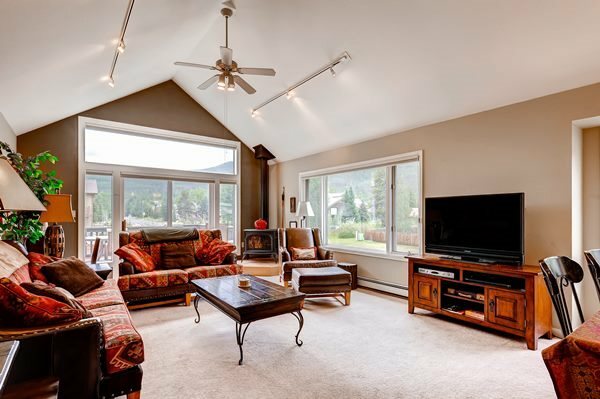 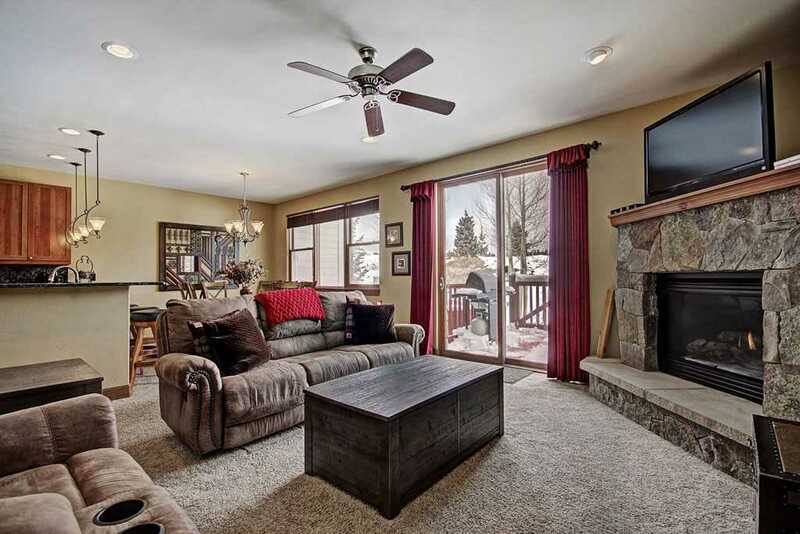 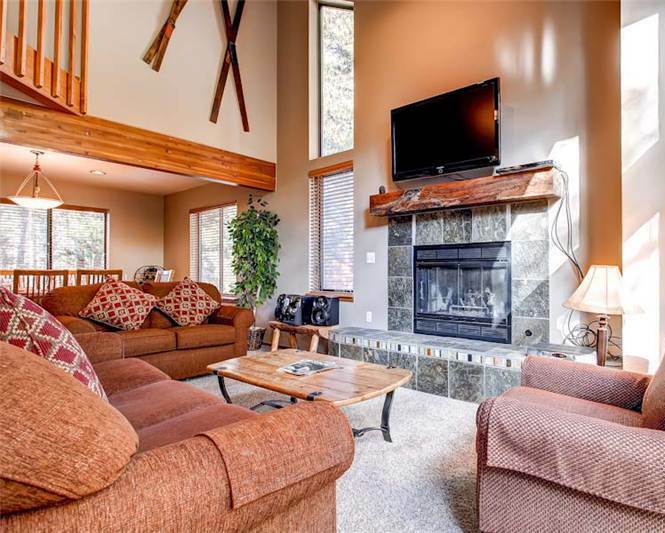 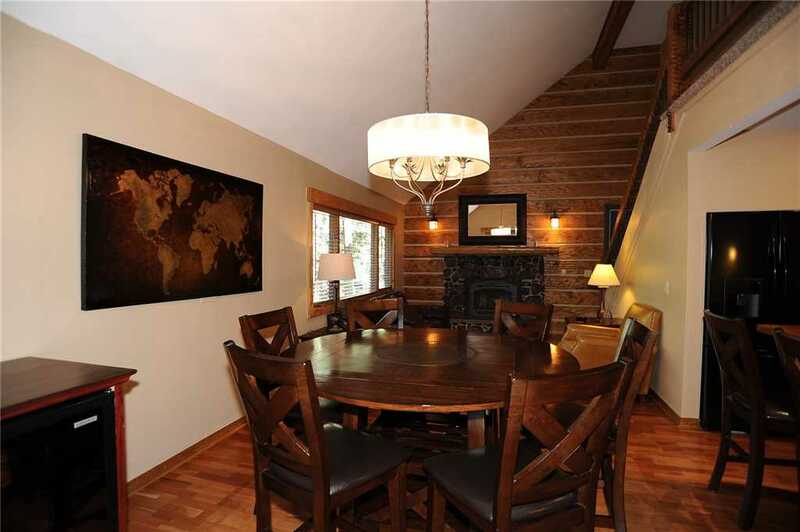 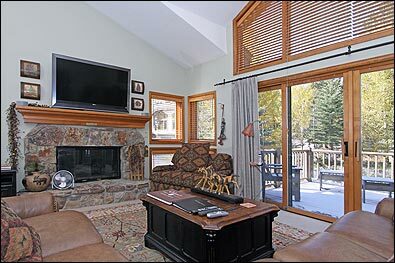 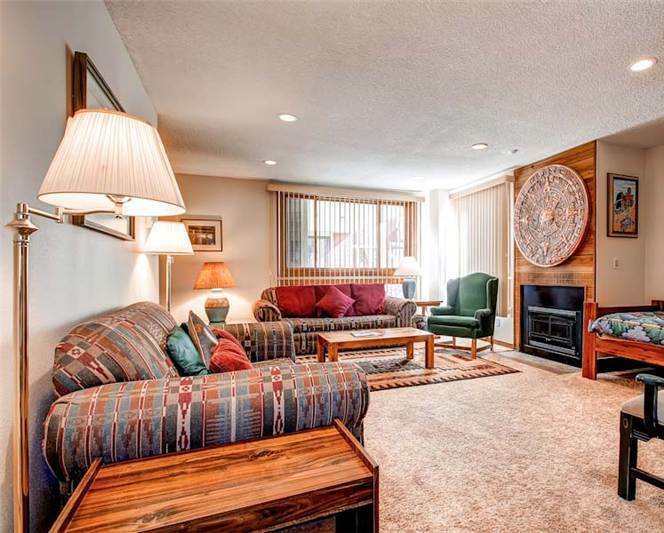 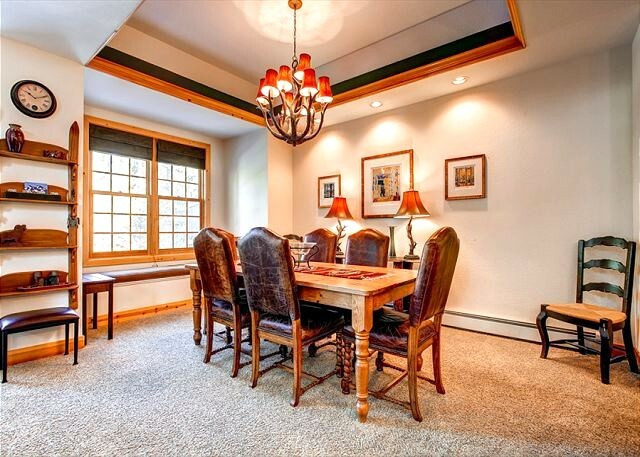 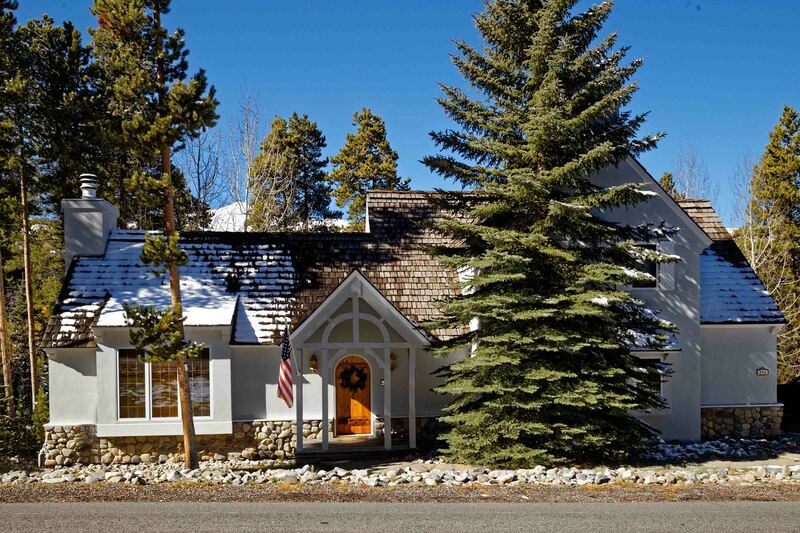 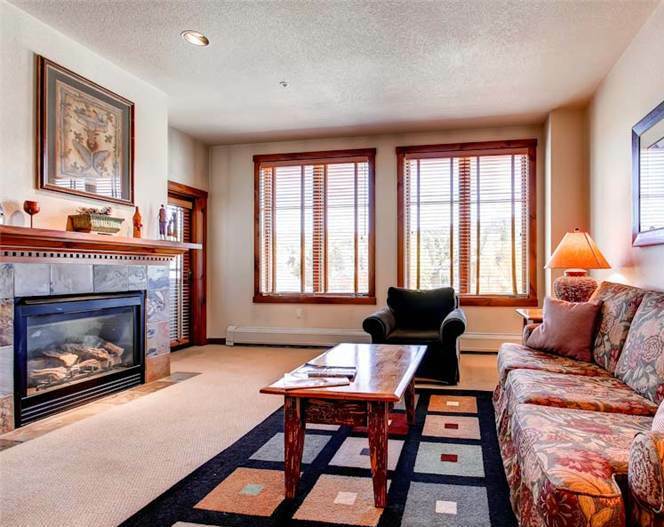 Just a short ten minute drive to Downtown Breckenridge, this home offers a quiet escape with convenient access. 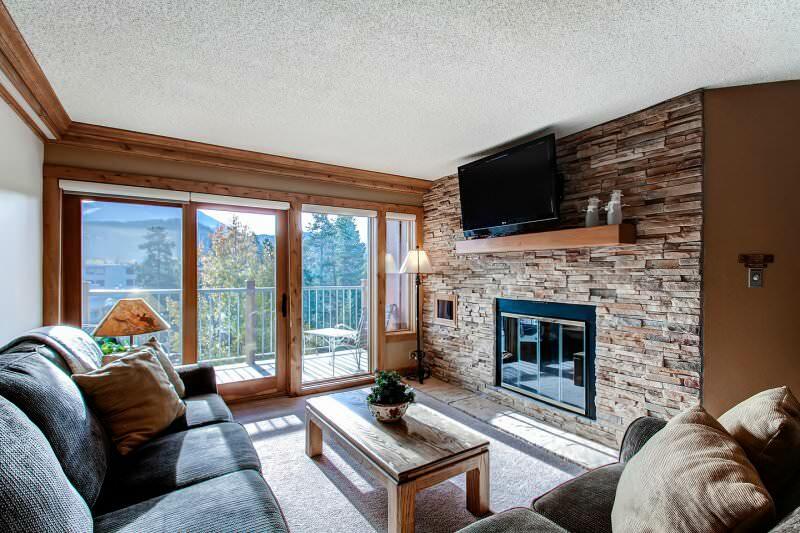 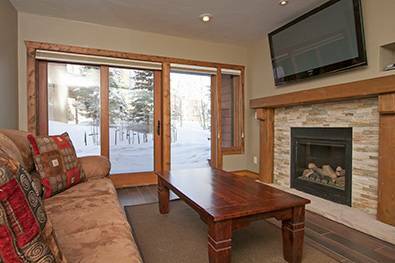 Arrive at the front door, then step inside to the living room with a gas fireplace, LCD TV and windows to take in the views. 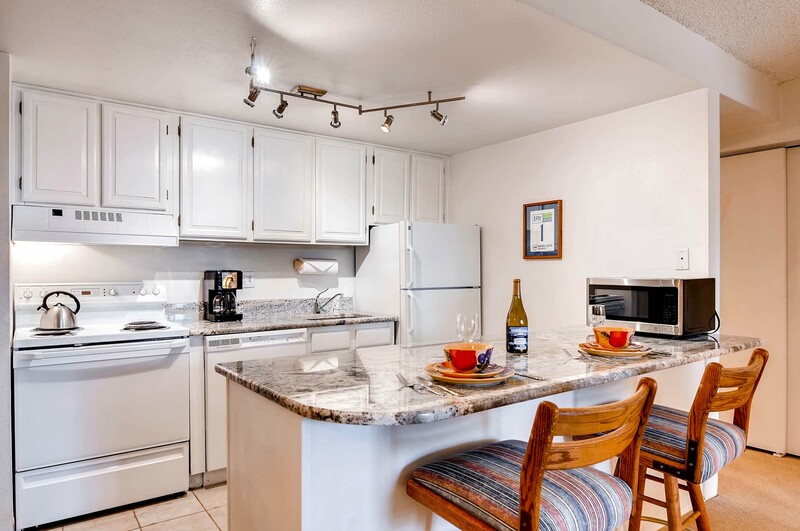 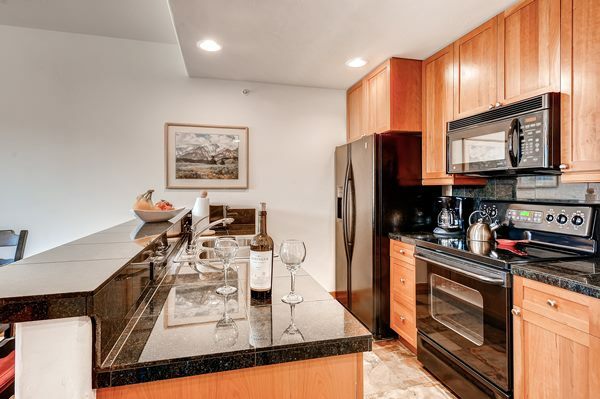 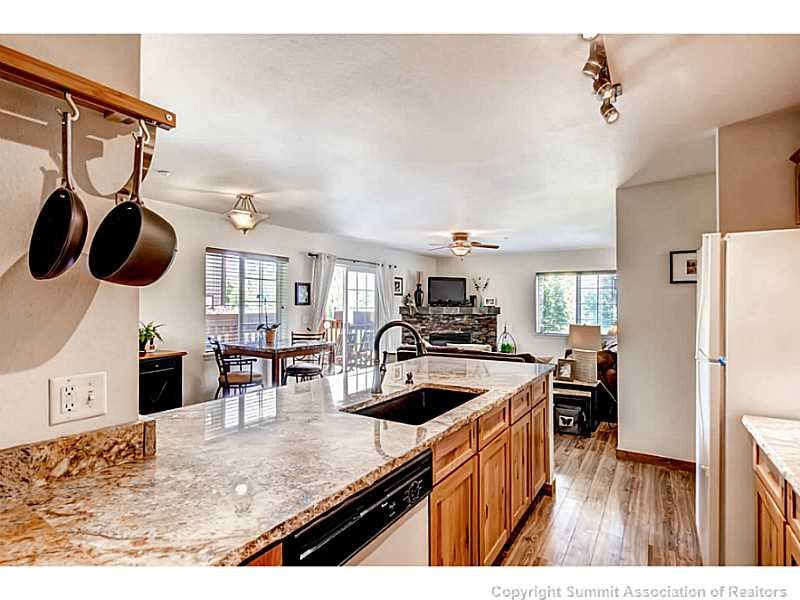 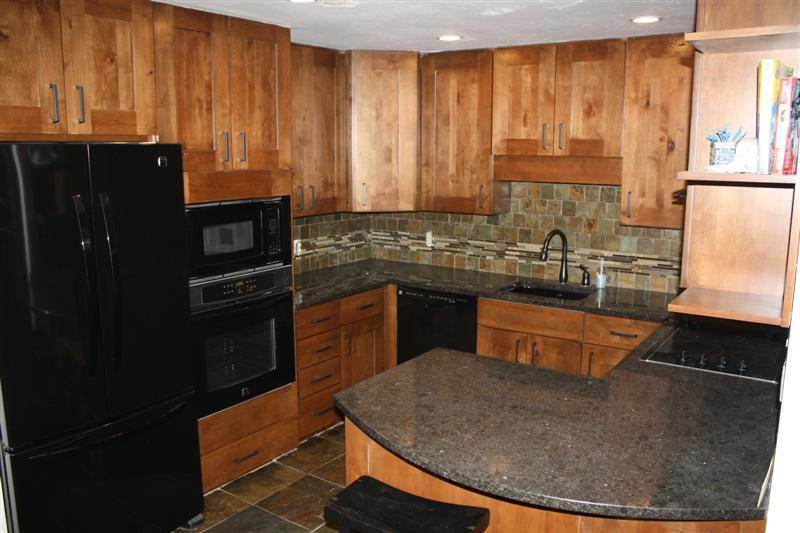 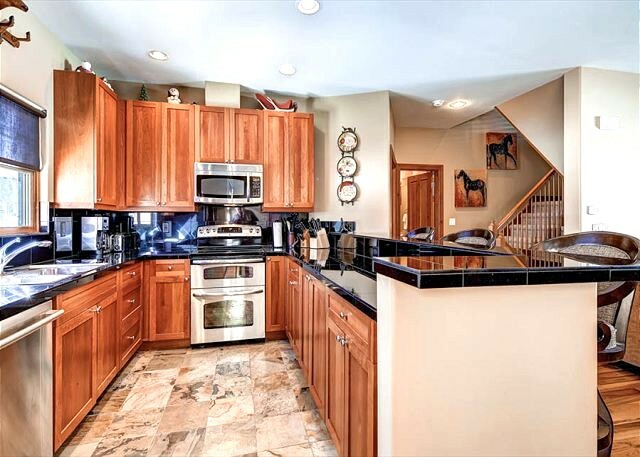 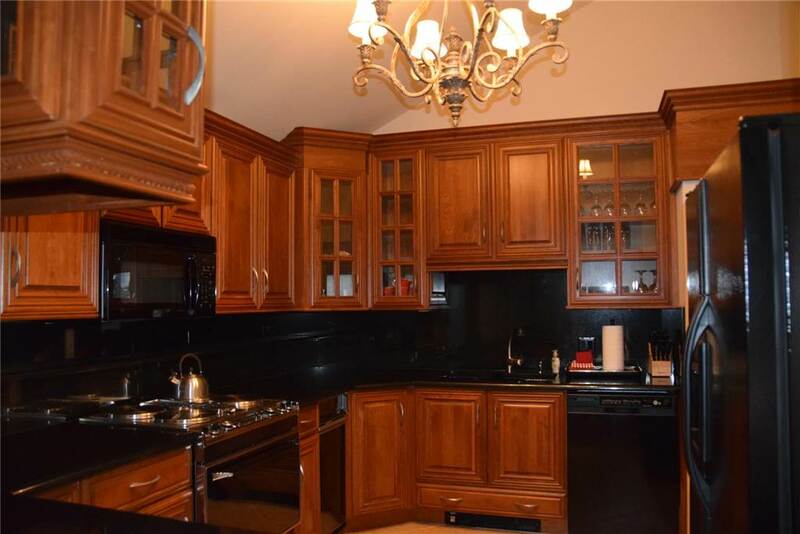 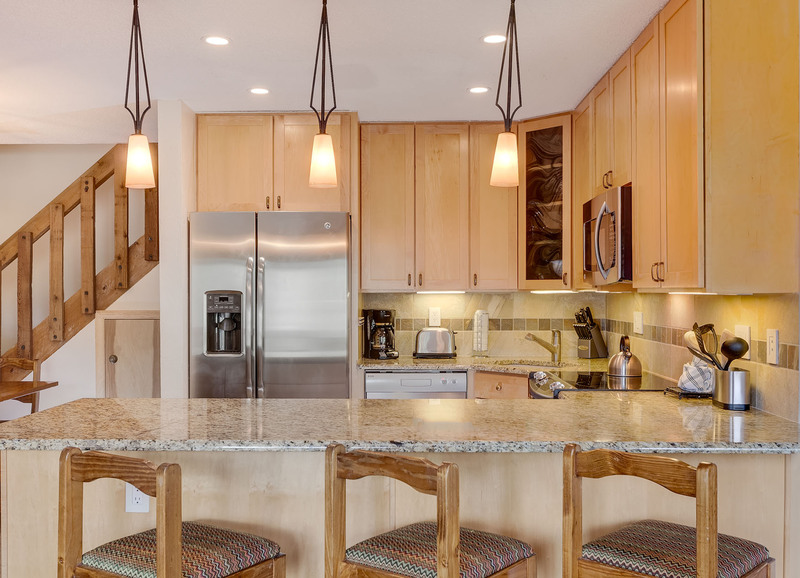 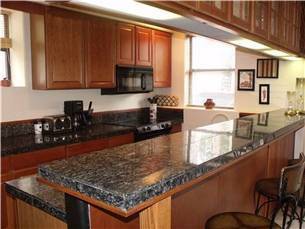 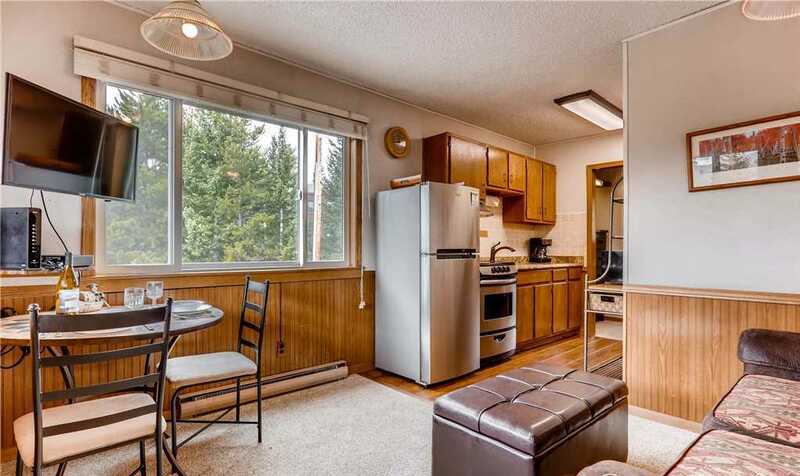 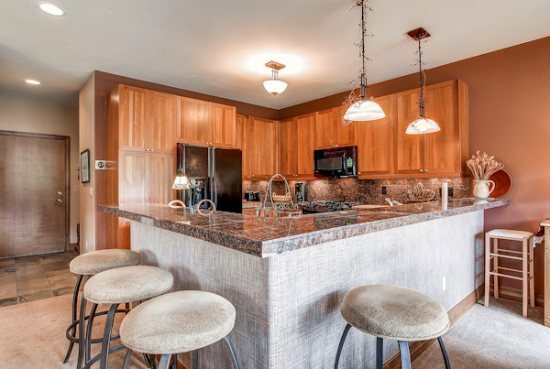 The nicely appointed kitchen features quartz counters, cherry cabinets and a large stainless steel refrigerator with ample room to host family or friends. 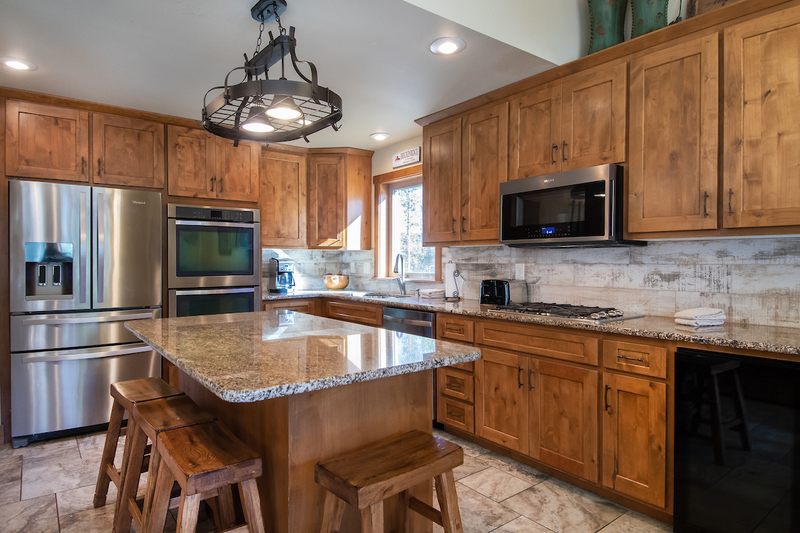 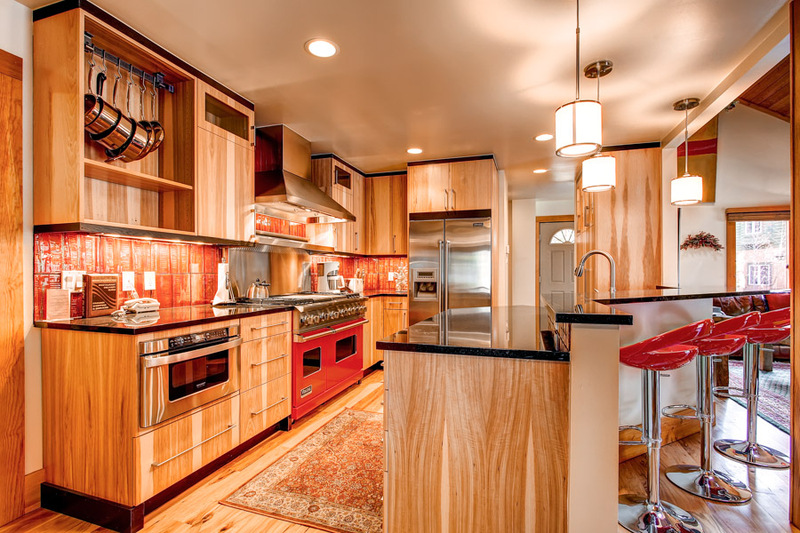 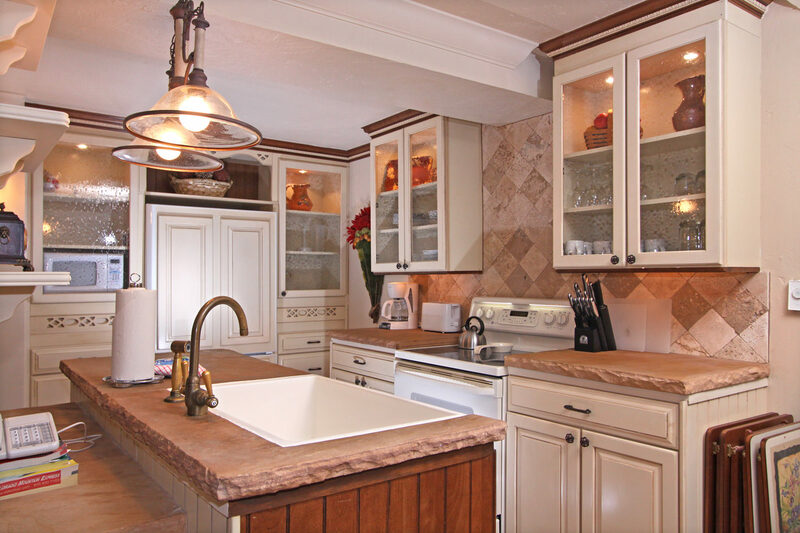 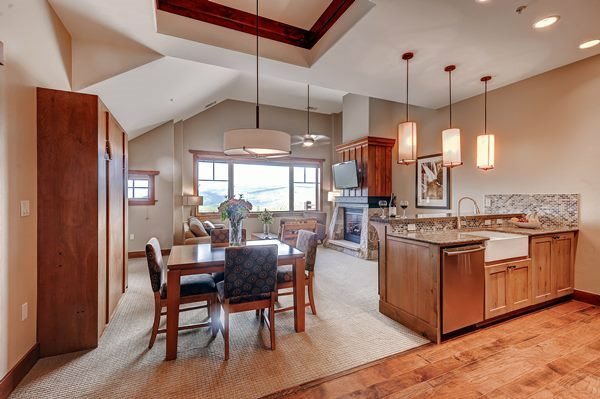 Culinary enthusiasts will enjoy prepping meals around the large central island in the kitchen, and will find the six-burner gas stove a delight. 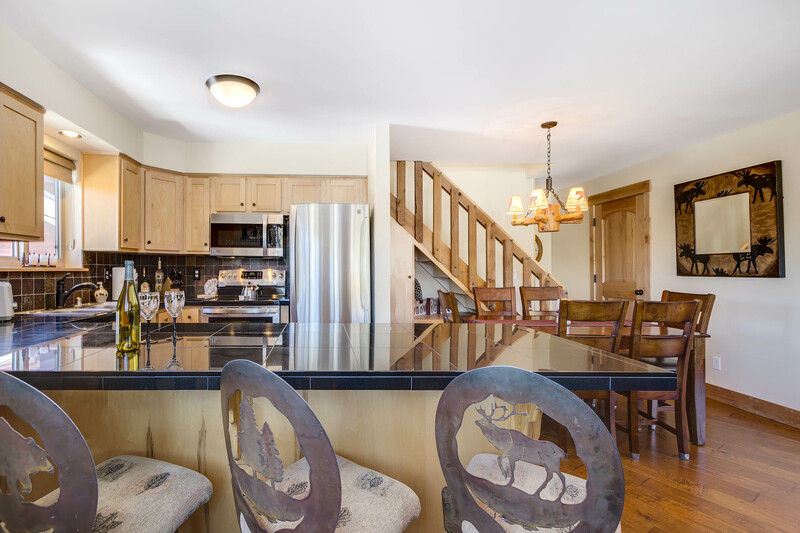 The dining area features seating for six at the table and for added entertainment, the bar counter offers 3 additional seats – perfect for breakfast or casual dining. 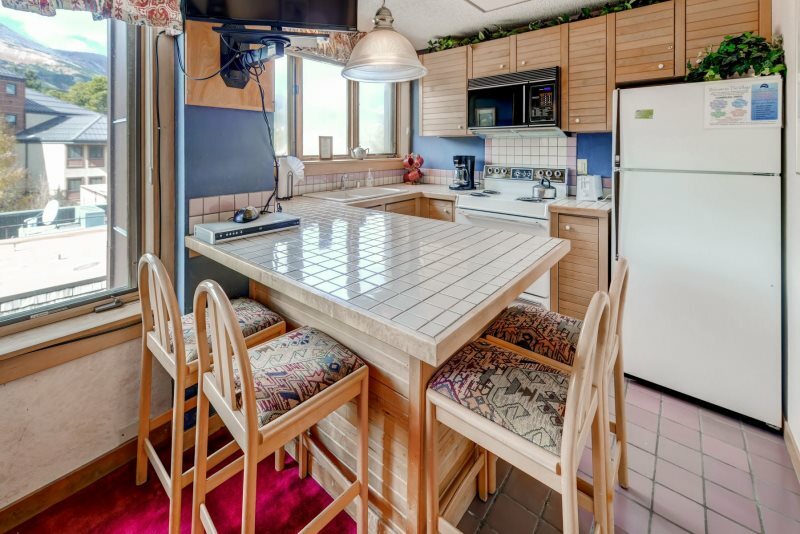 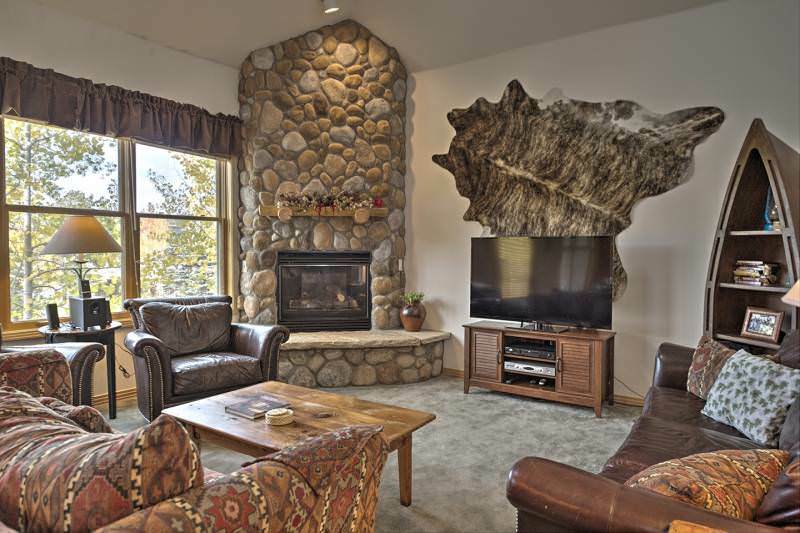 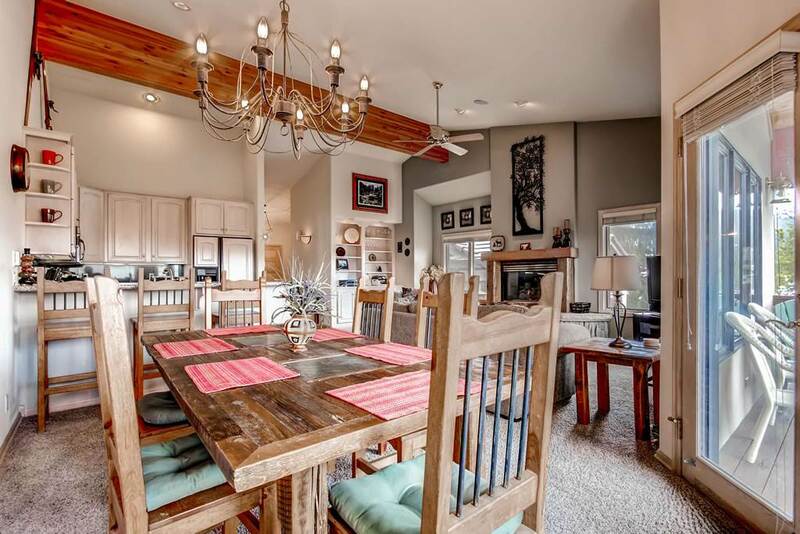 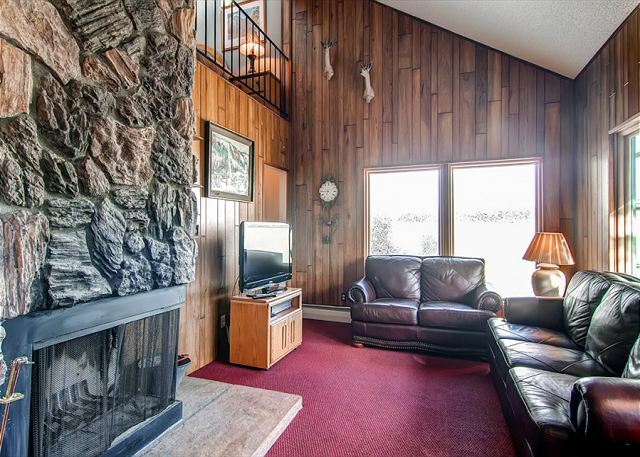 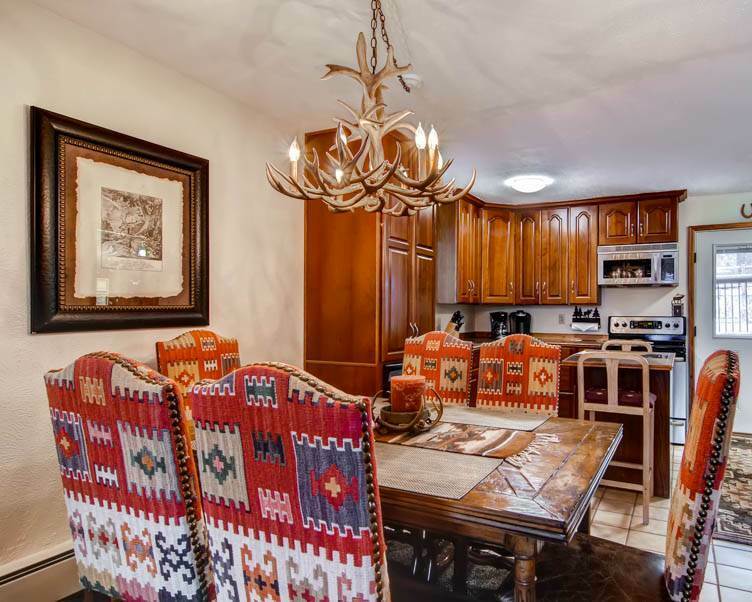 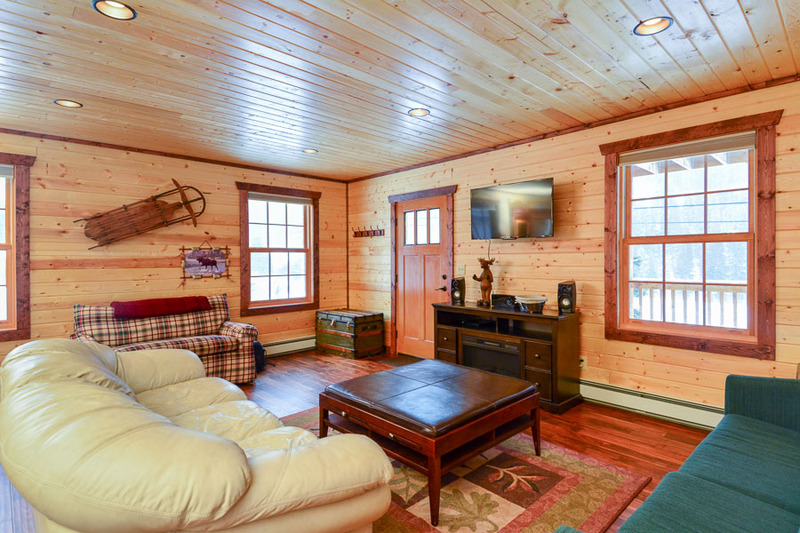 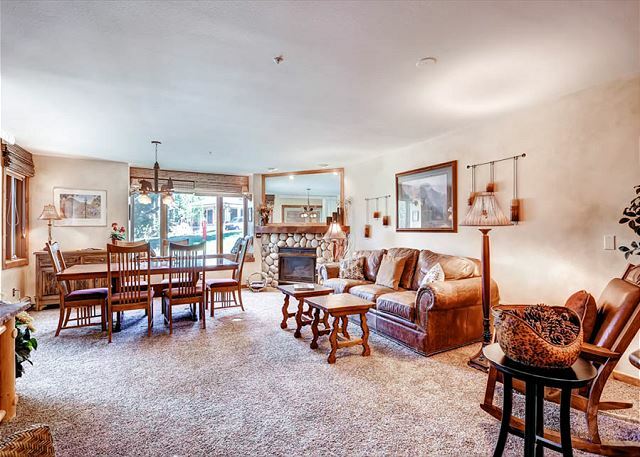 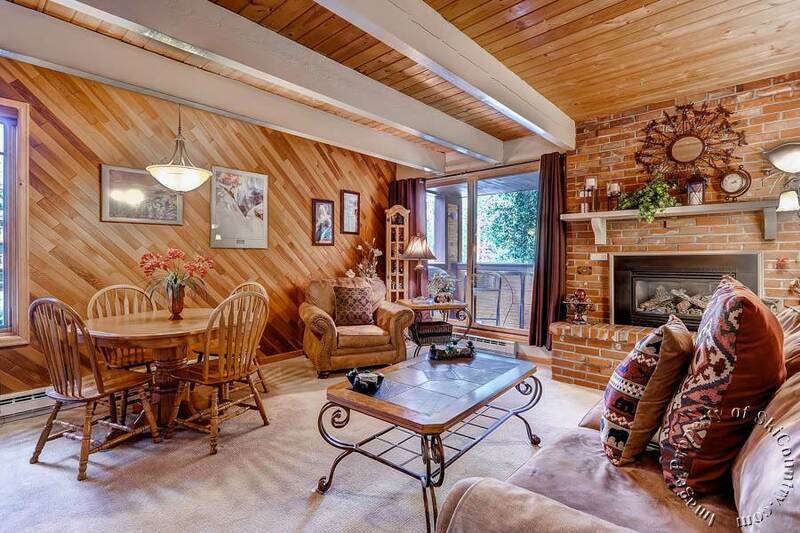 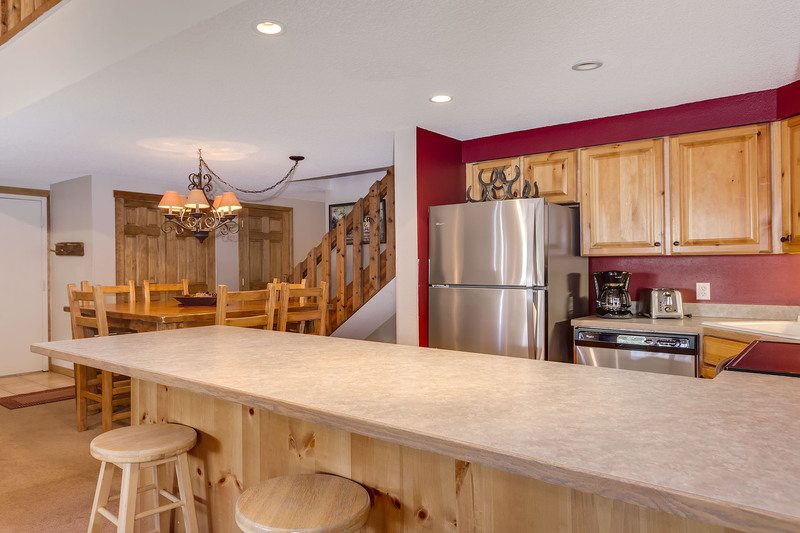 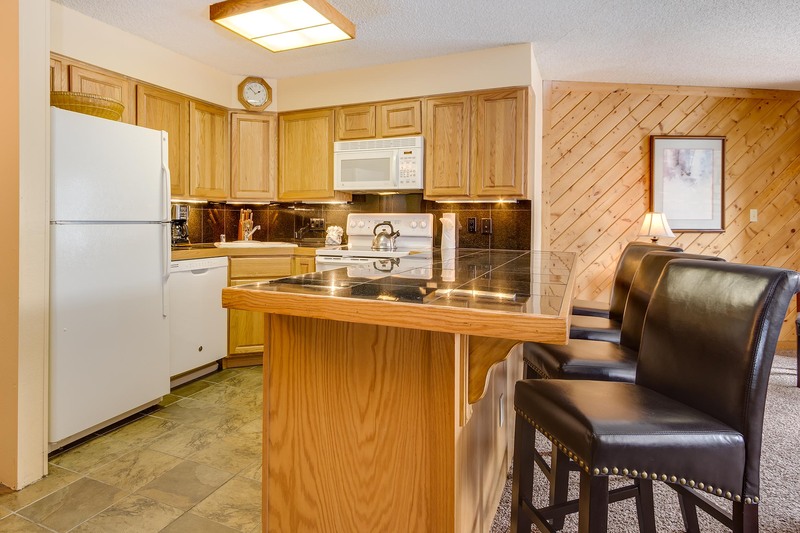 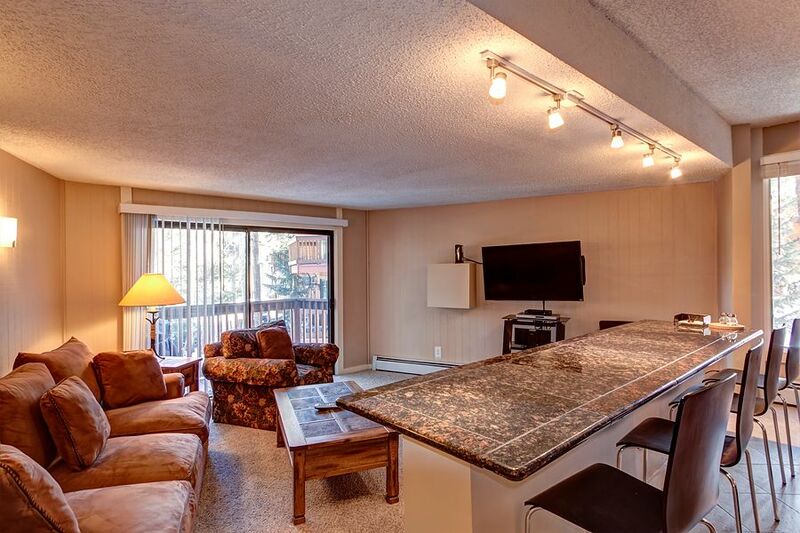 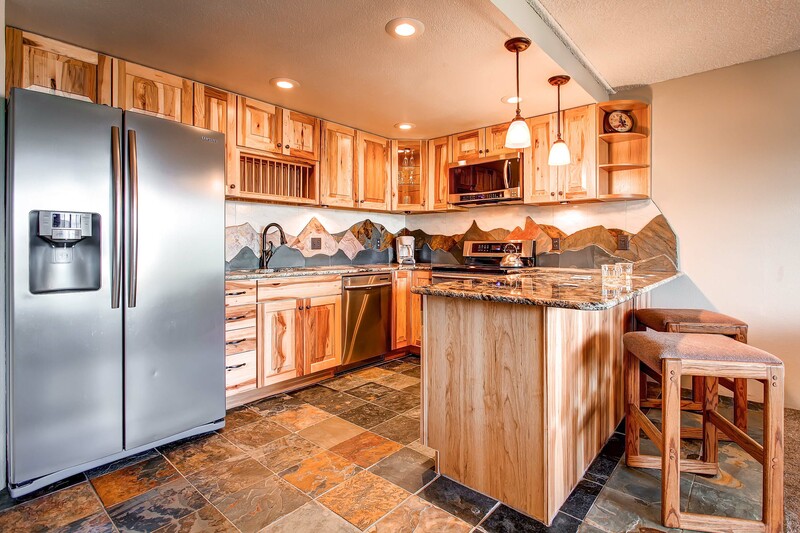 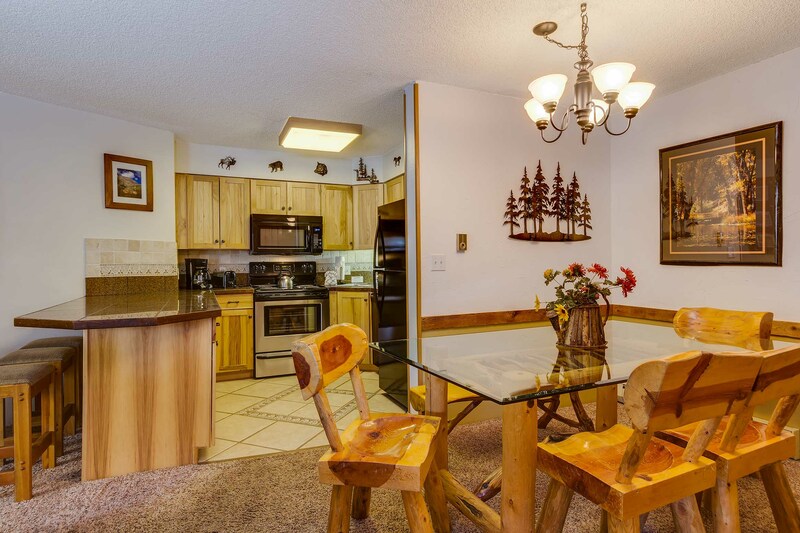 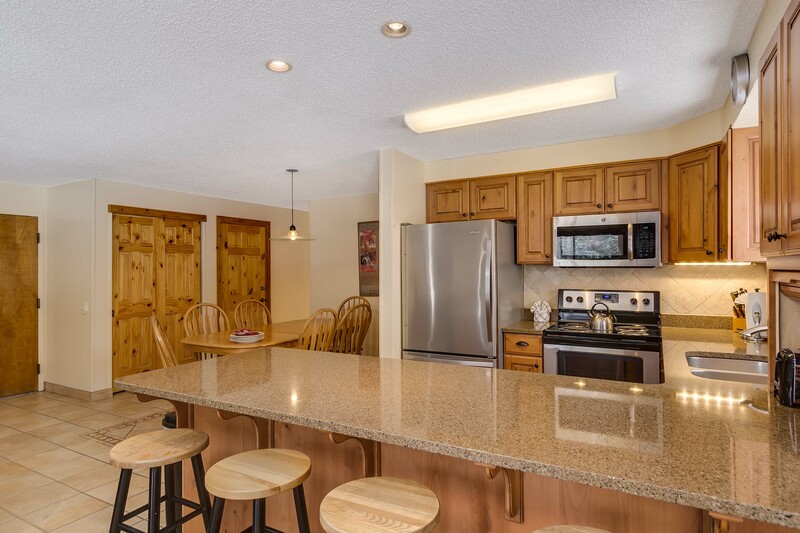 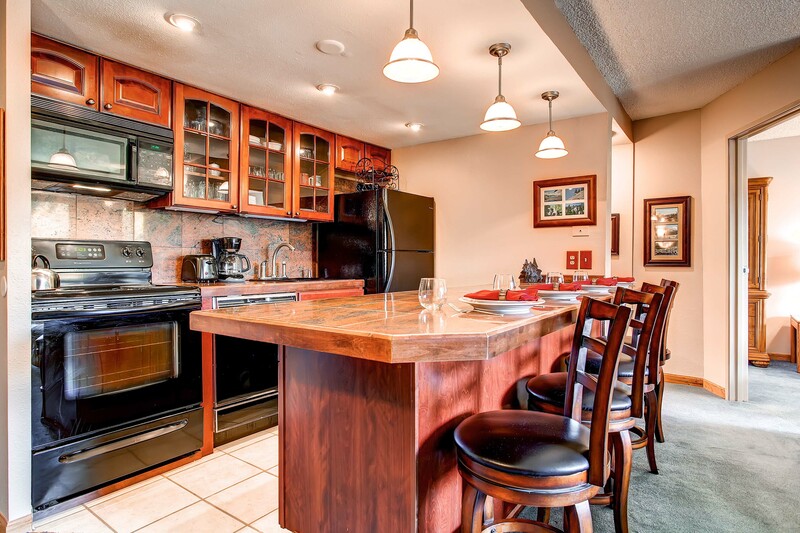 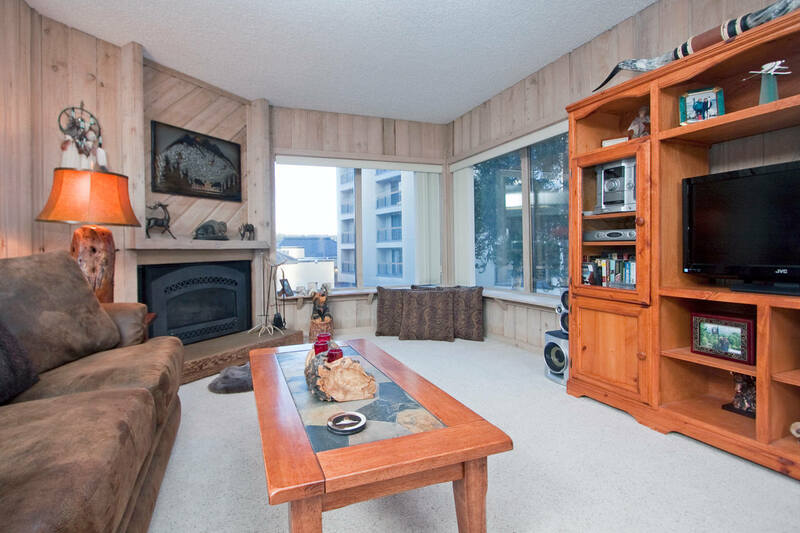 Just off the living area, guests can enjoy the sounds of the babbling Blue River while the chef in your crew prepares dinner on the gas grill. 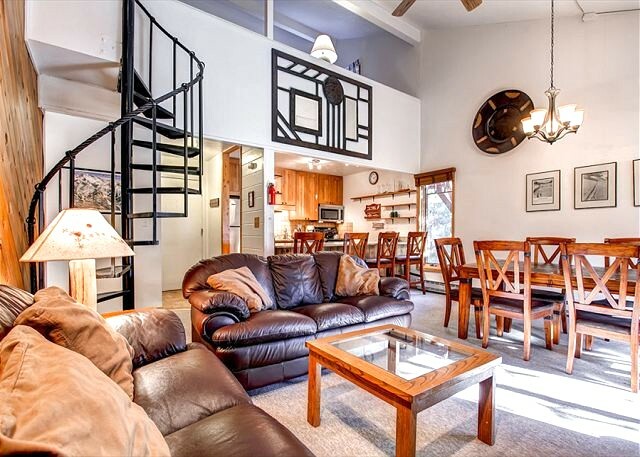 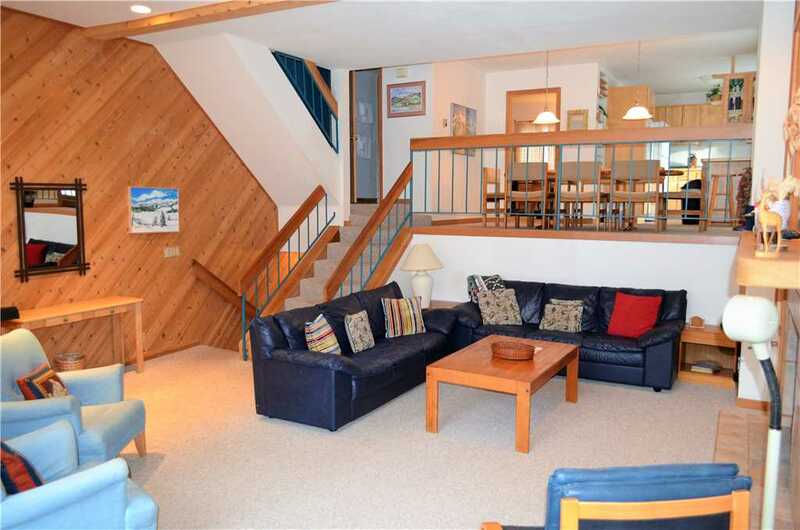 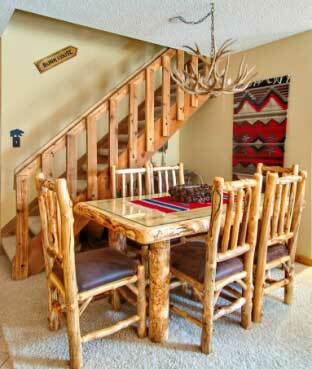 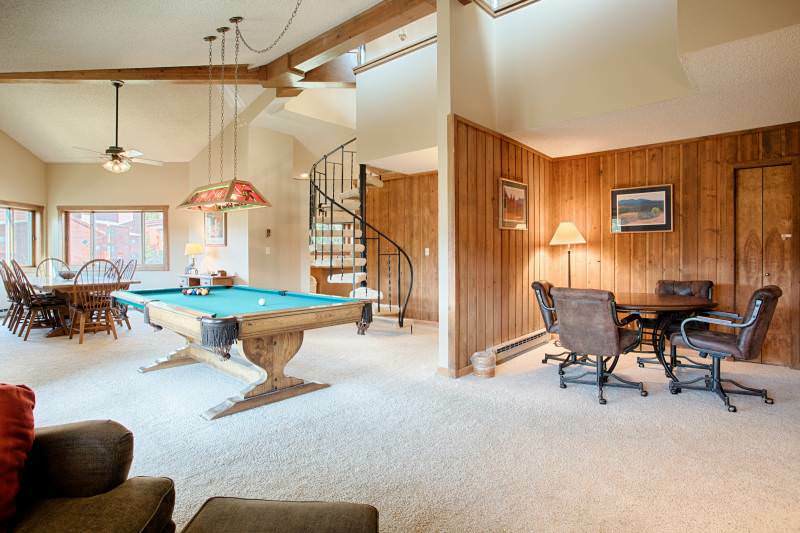 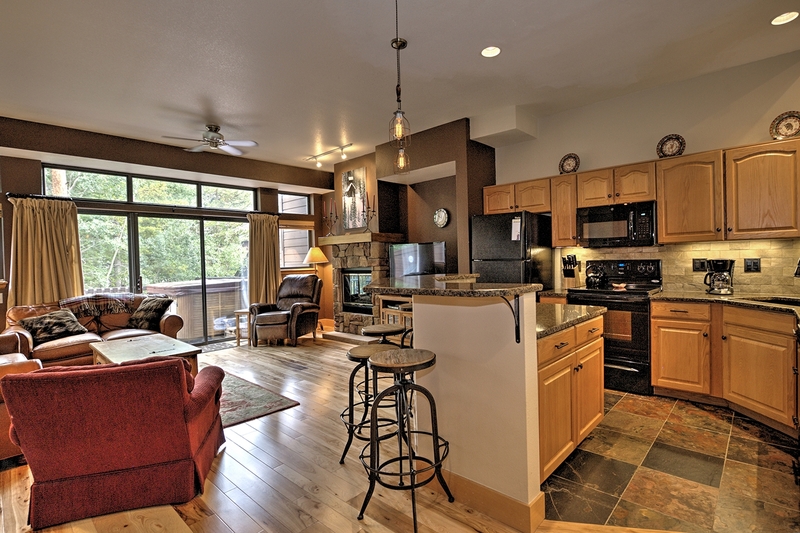 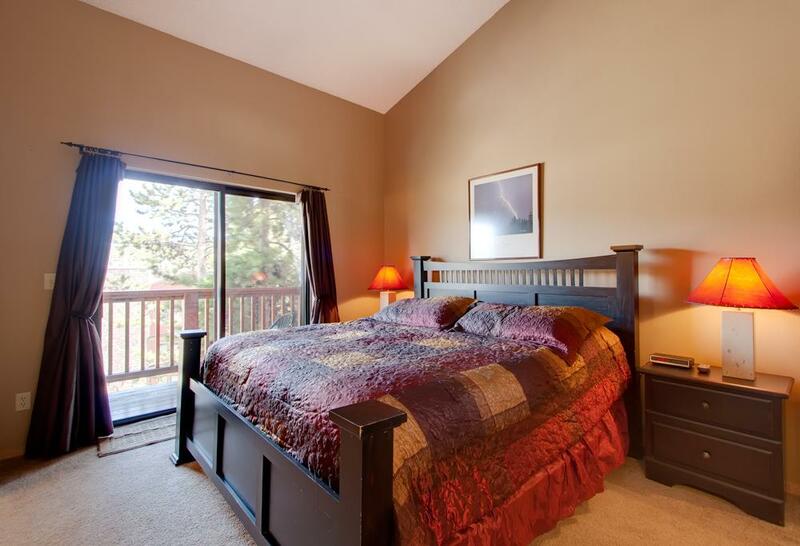 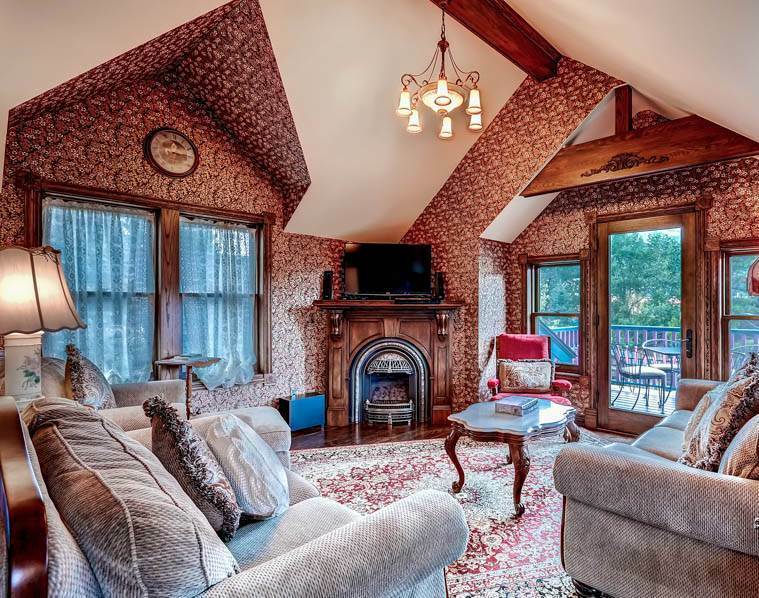 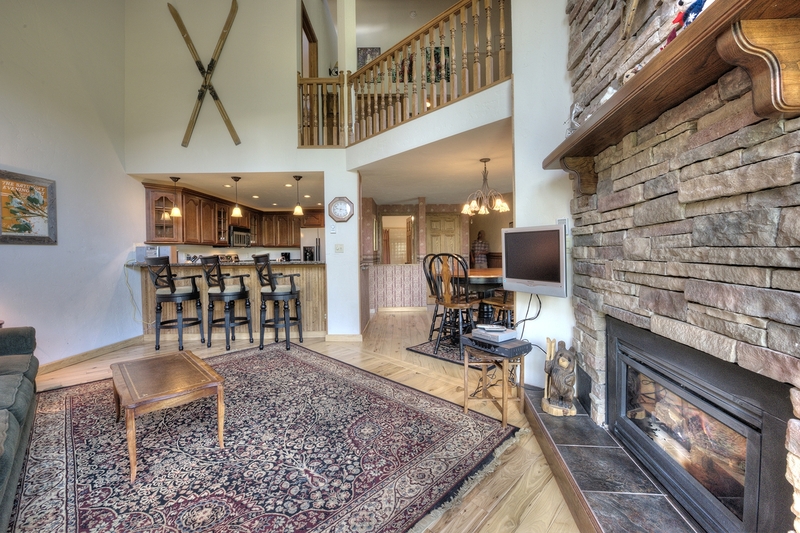 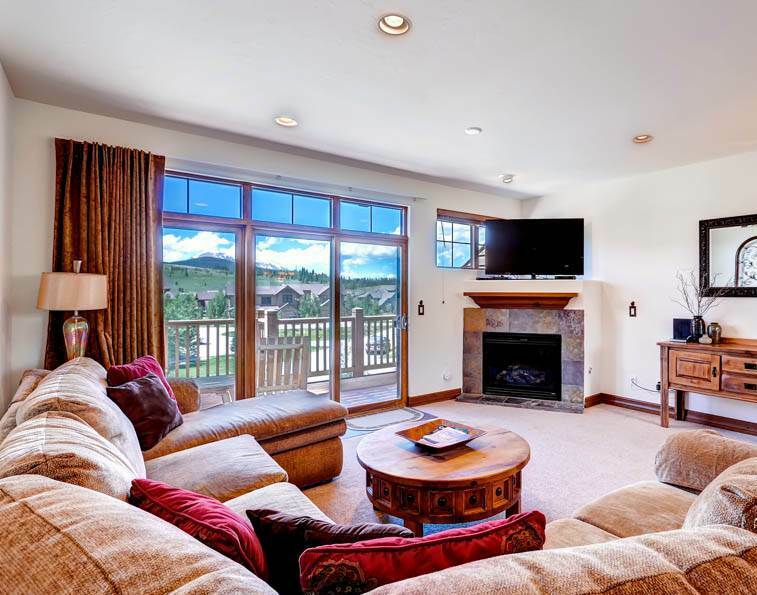 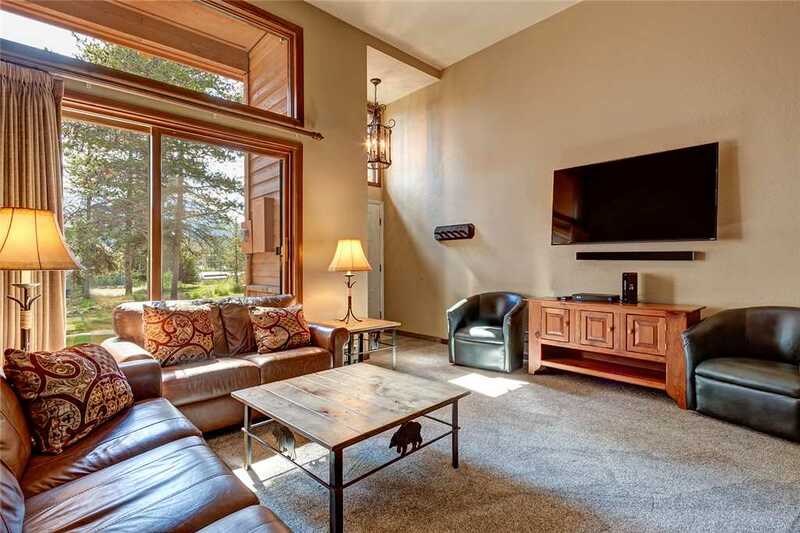 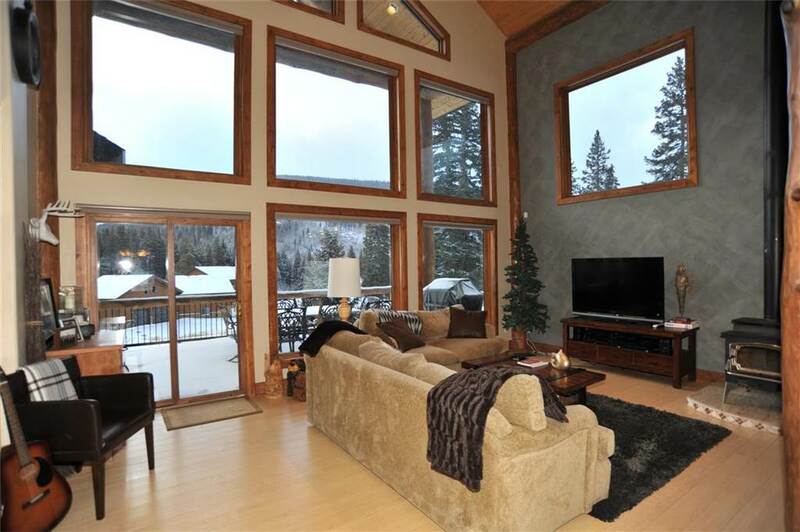 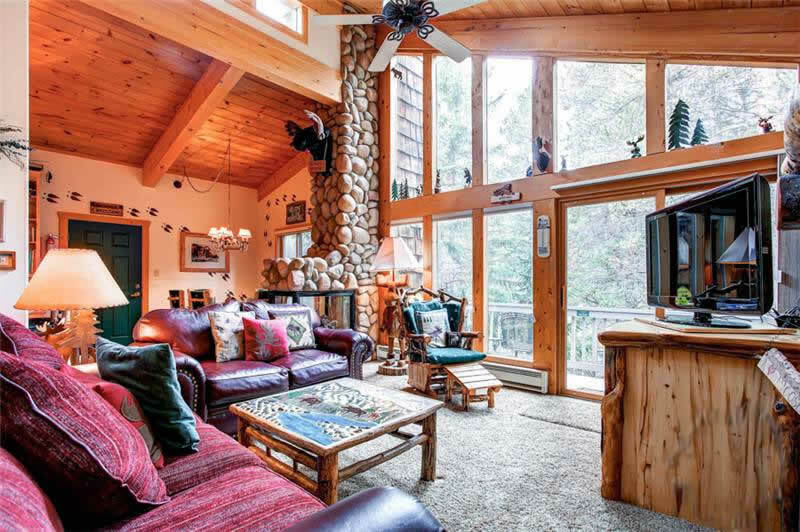 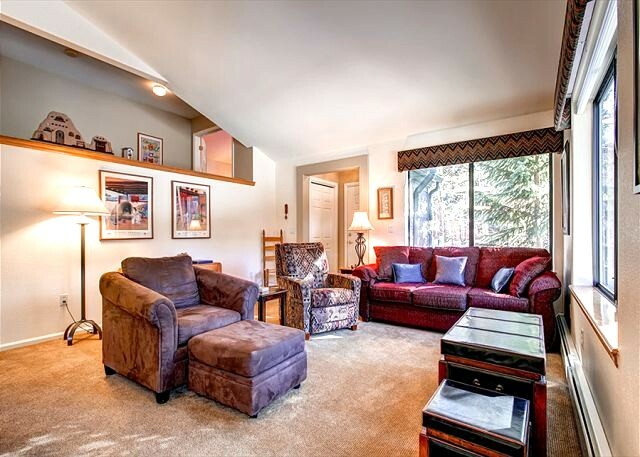 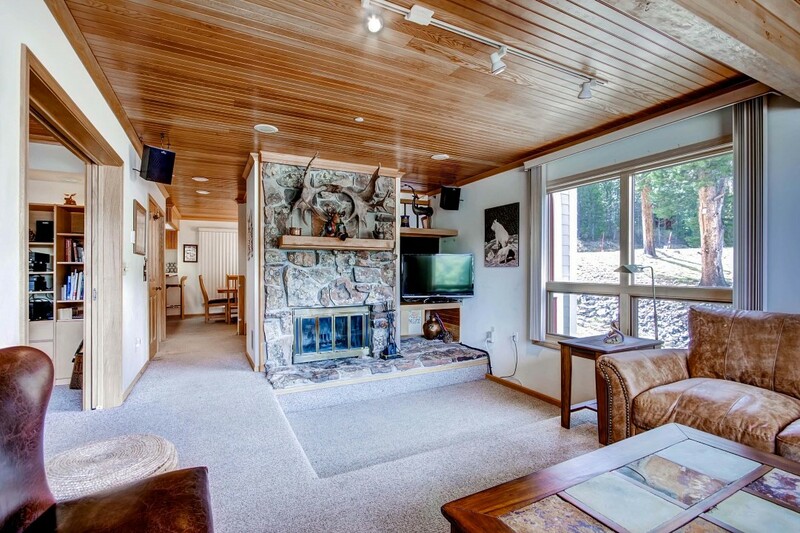 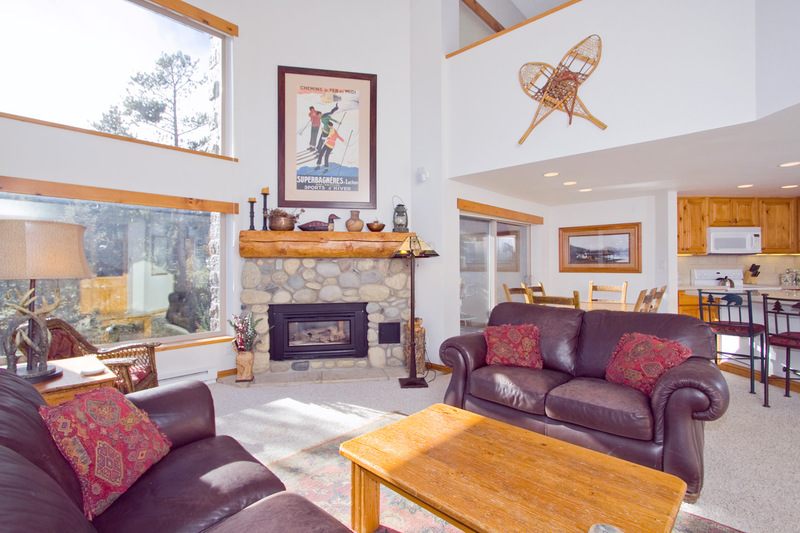 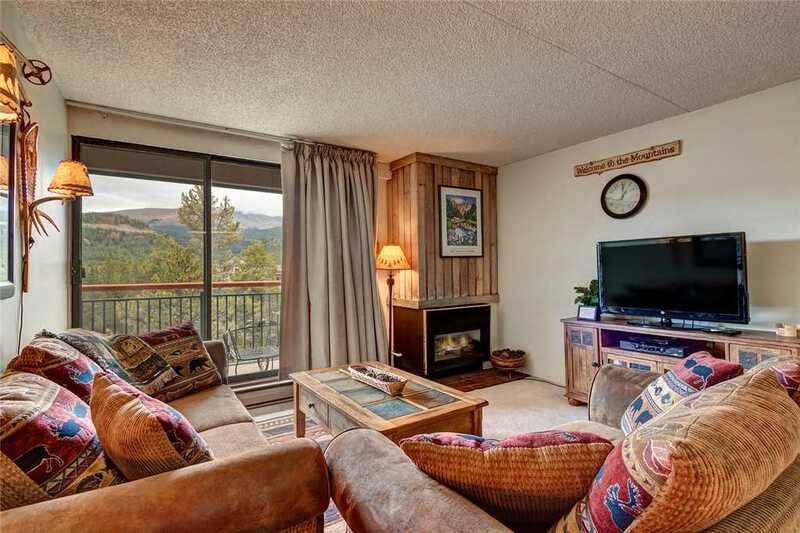 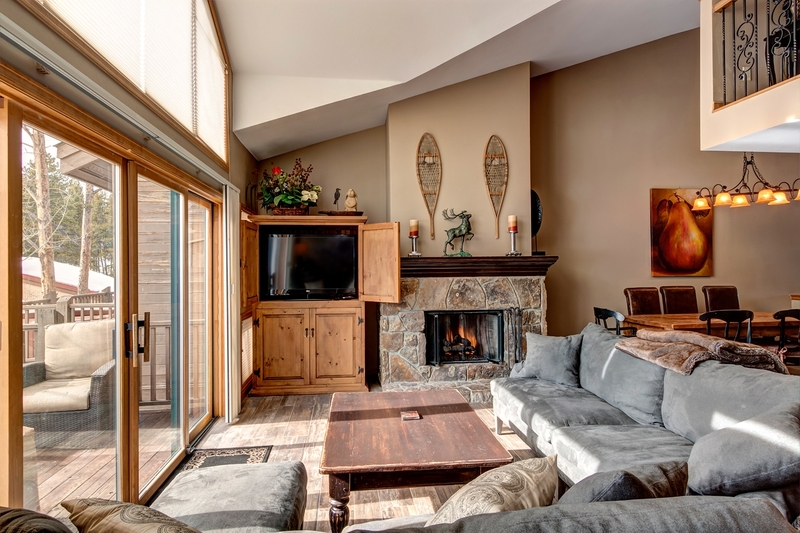 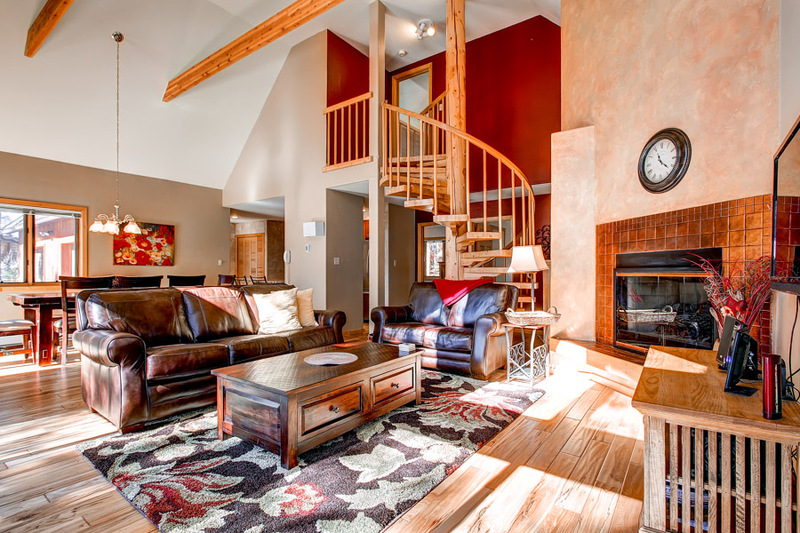 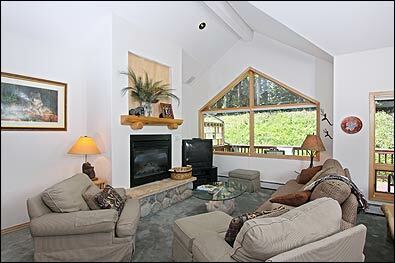 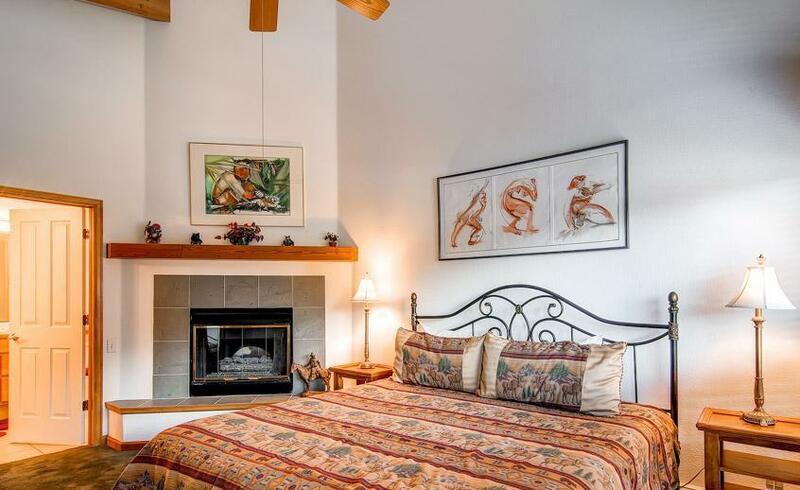 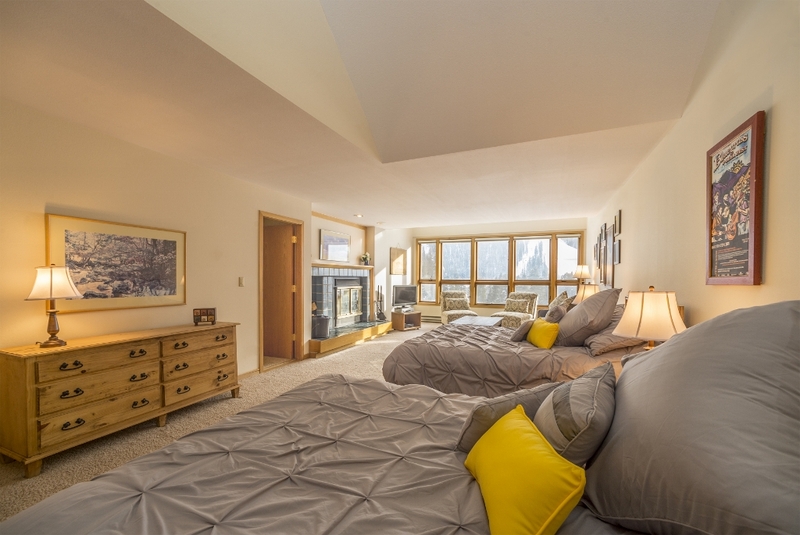 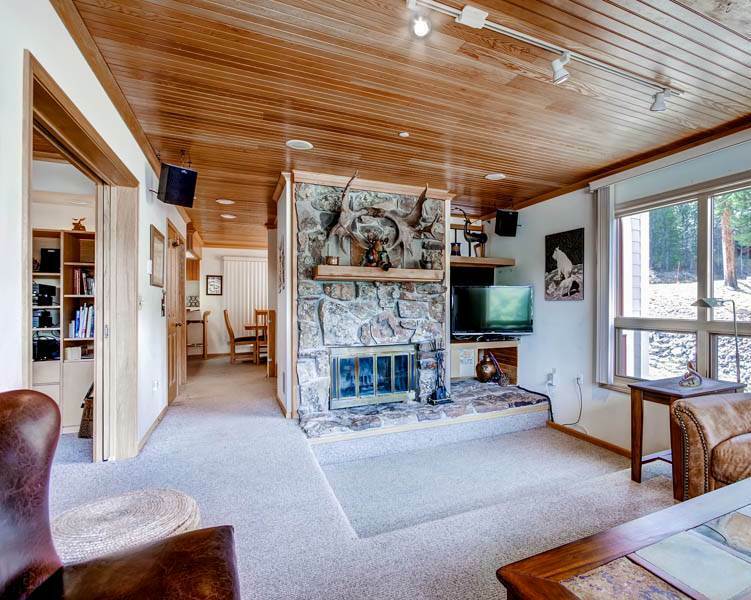 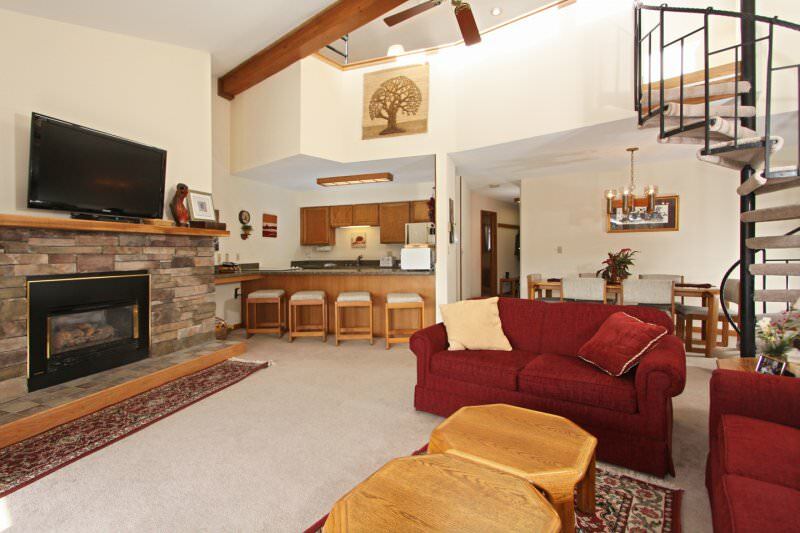 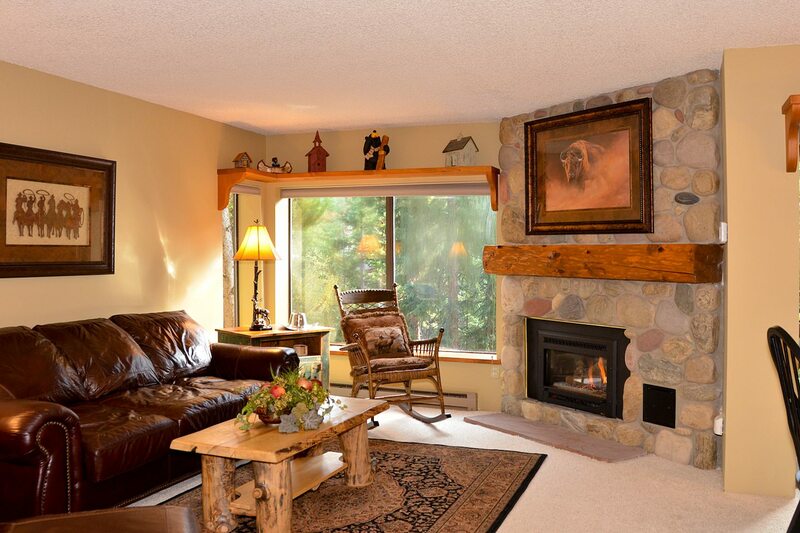 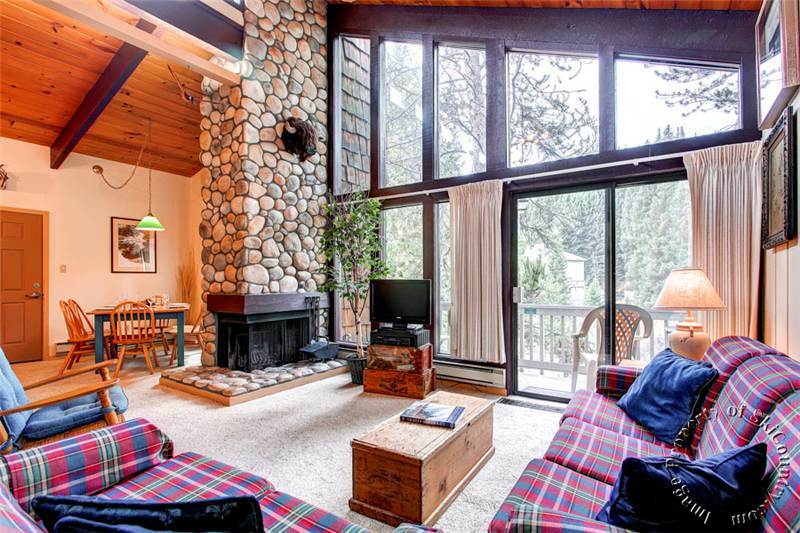 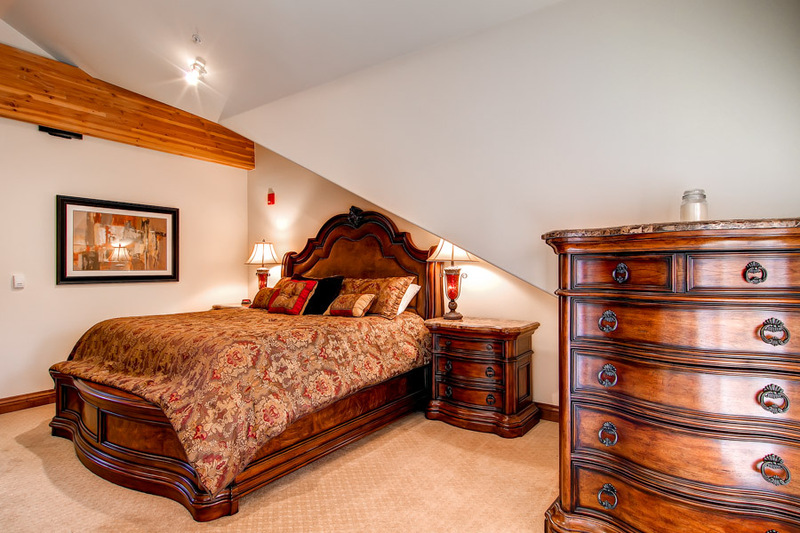 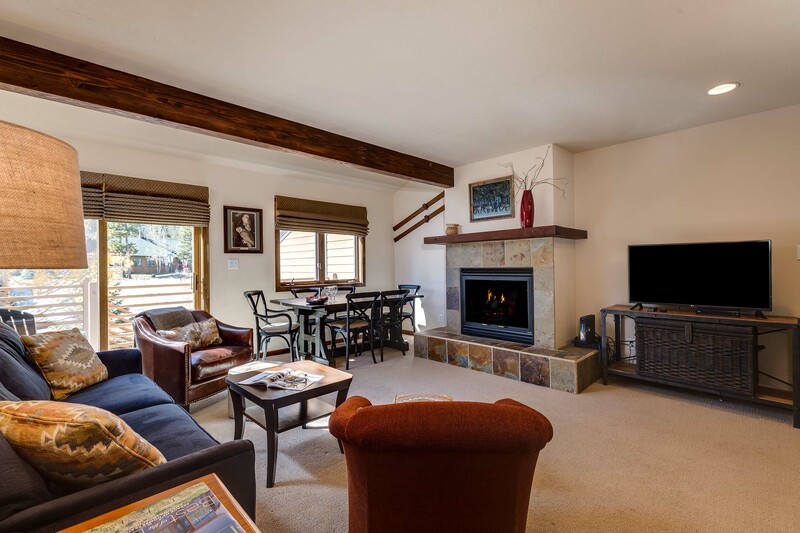 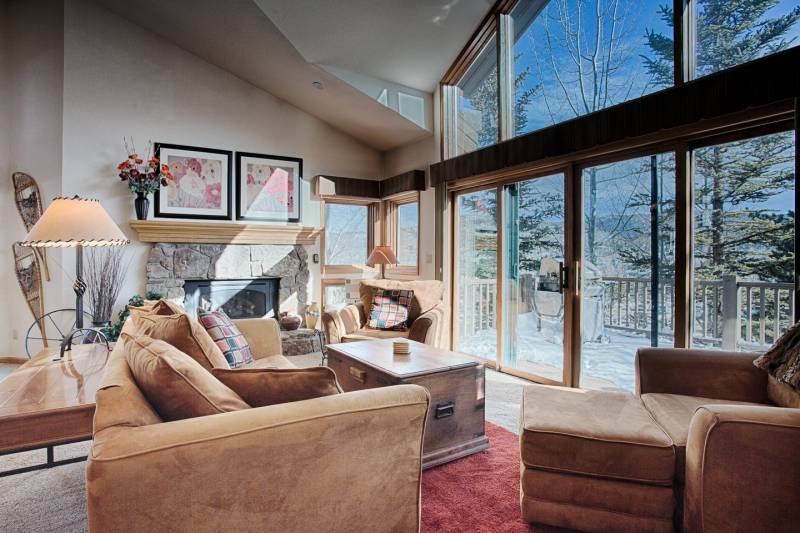 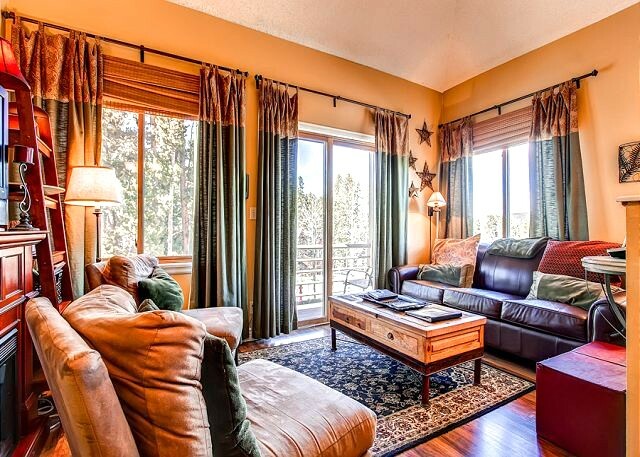 Upstairs, the master suite provides and escape with its own deck perched above the river with views of Mt. 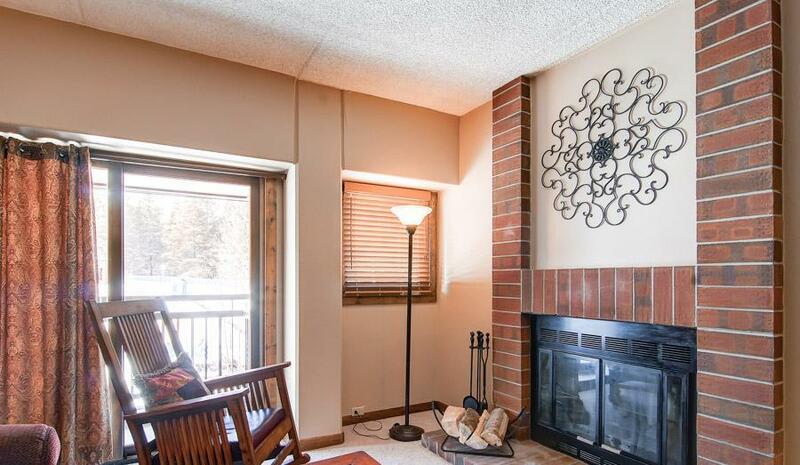 Quandary. 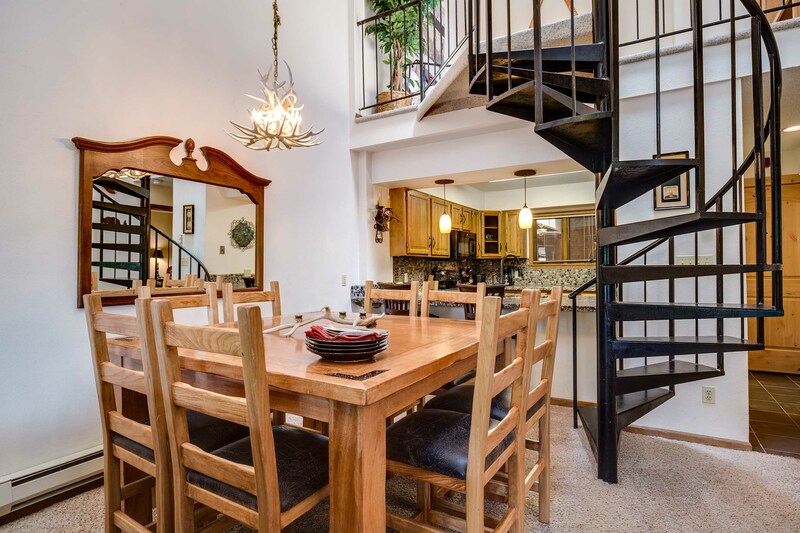 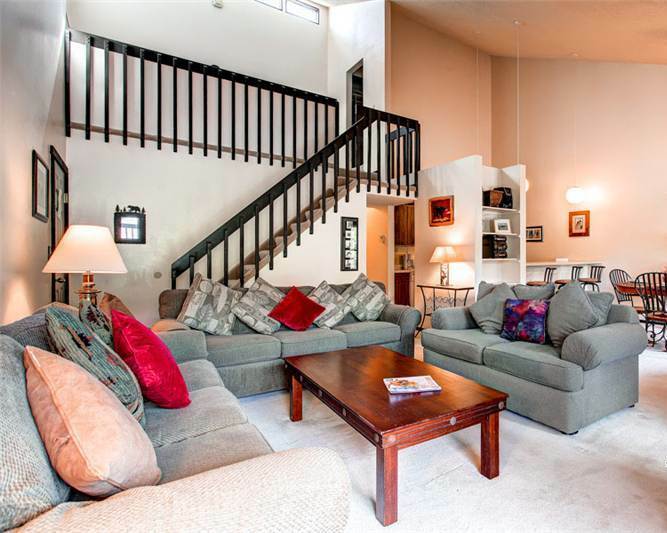 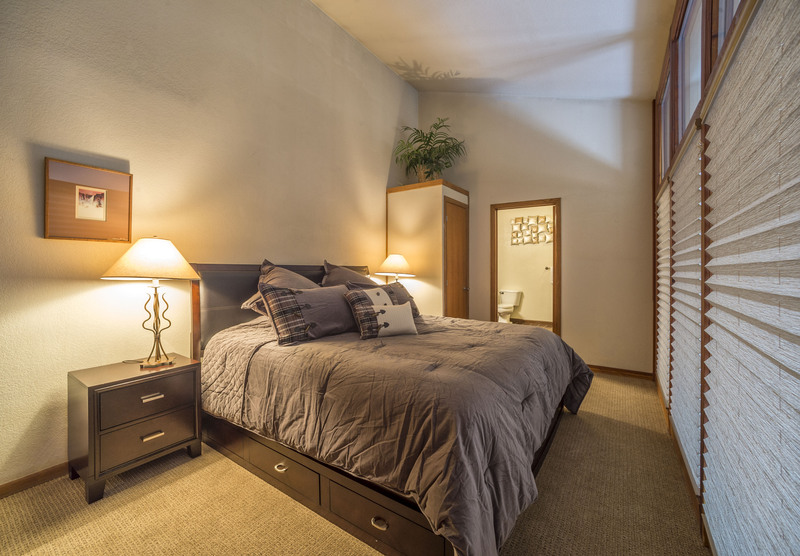 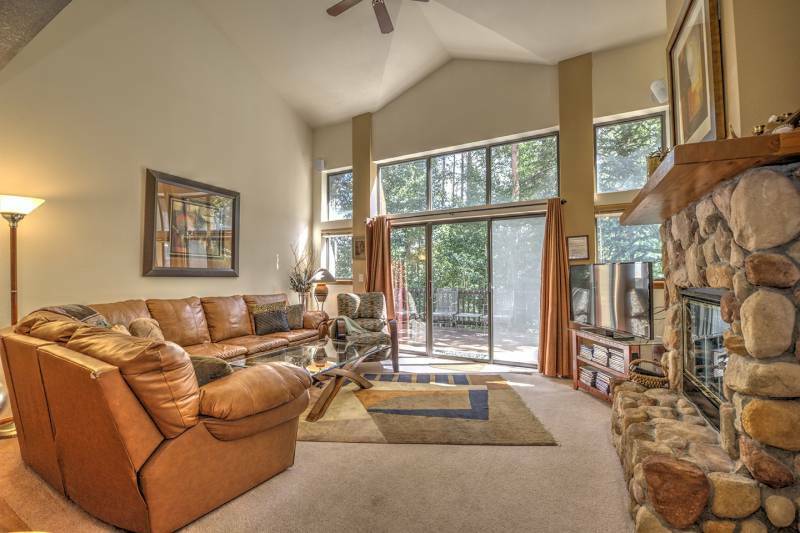 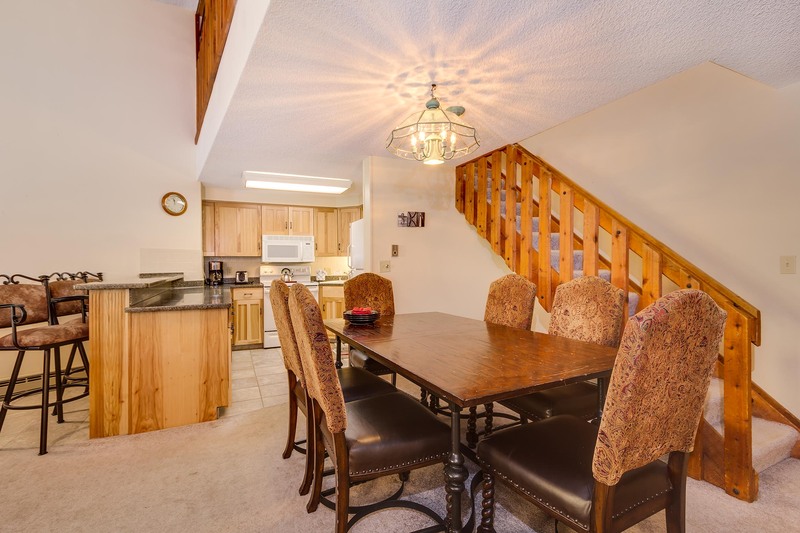 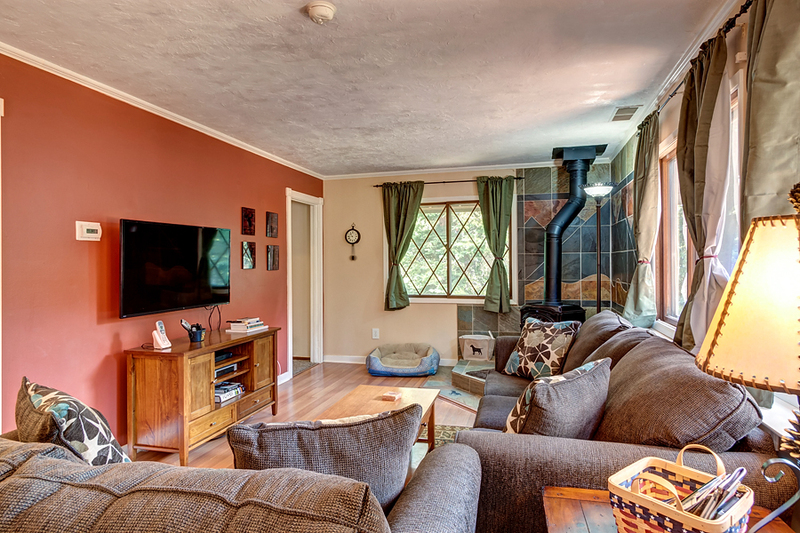 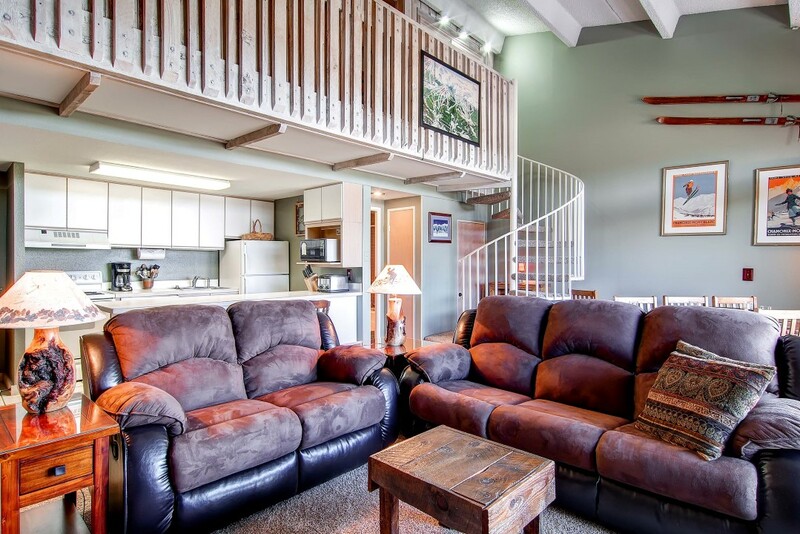 Two additional bedrooms on the upper level and the conveniently located upstairs laundry area provide separate sleeping quarters from the downstairs entertaining space. 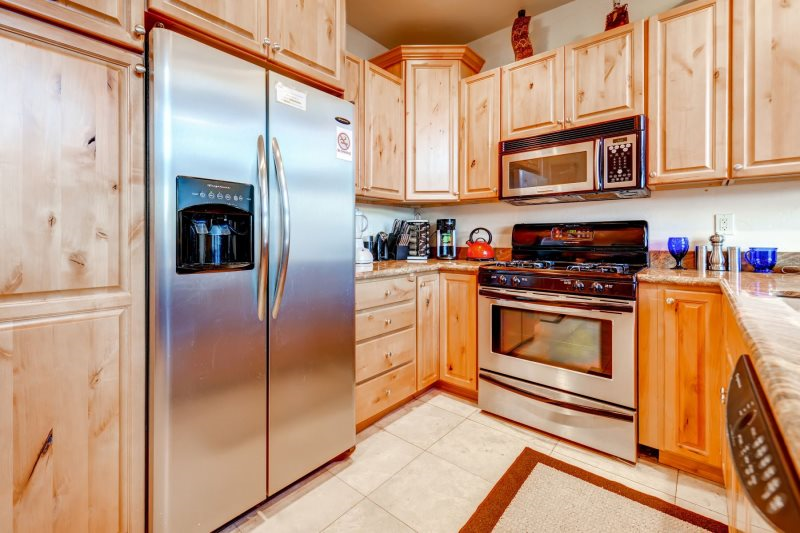 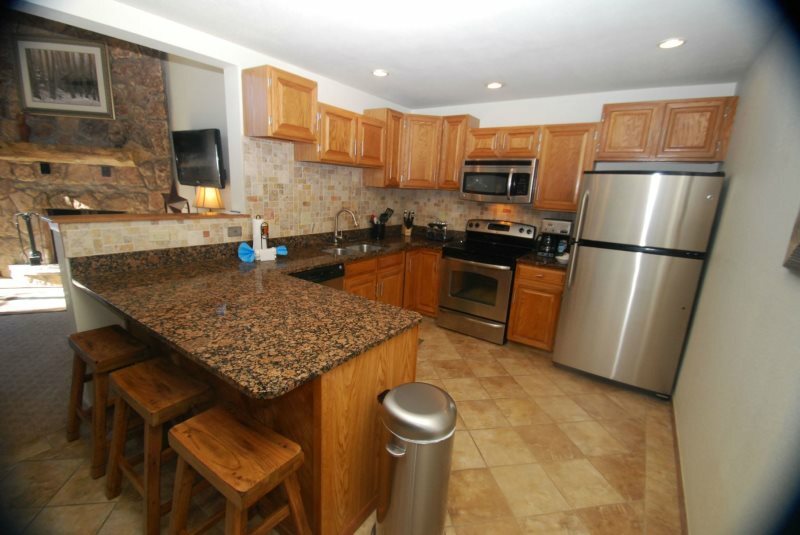 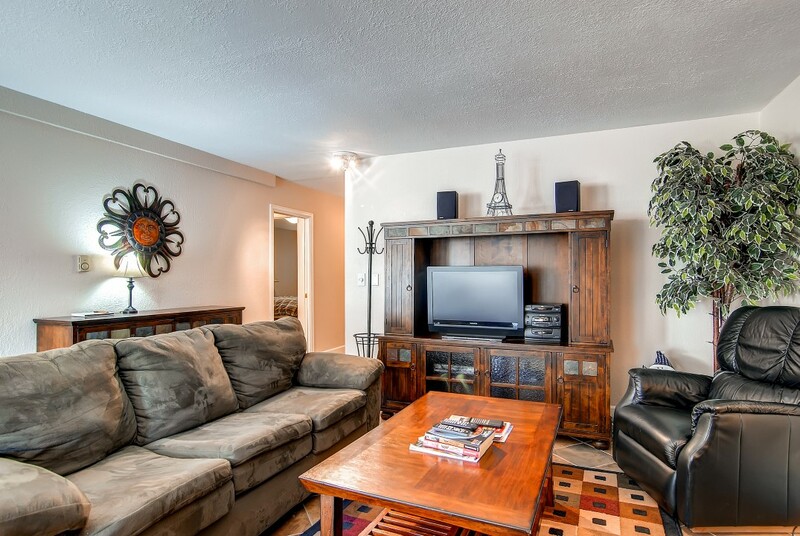 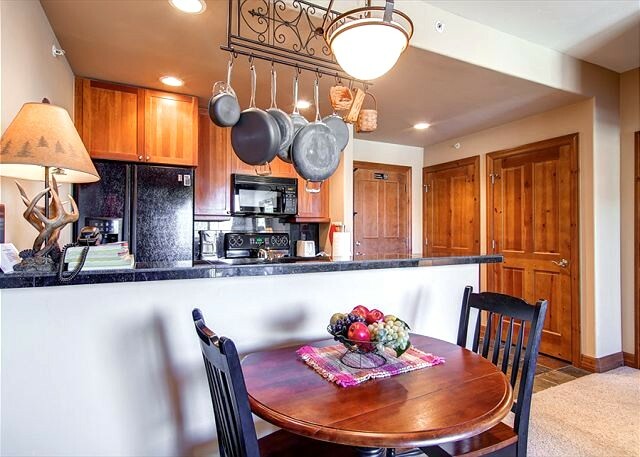 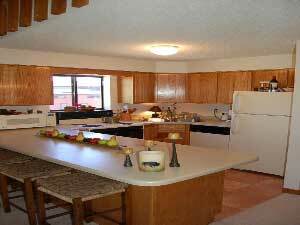 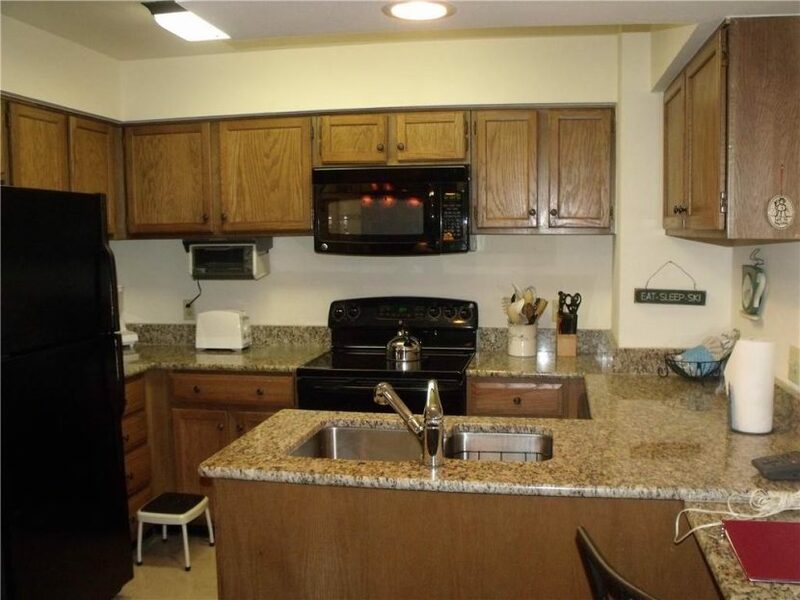 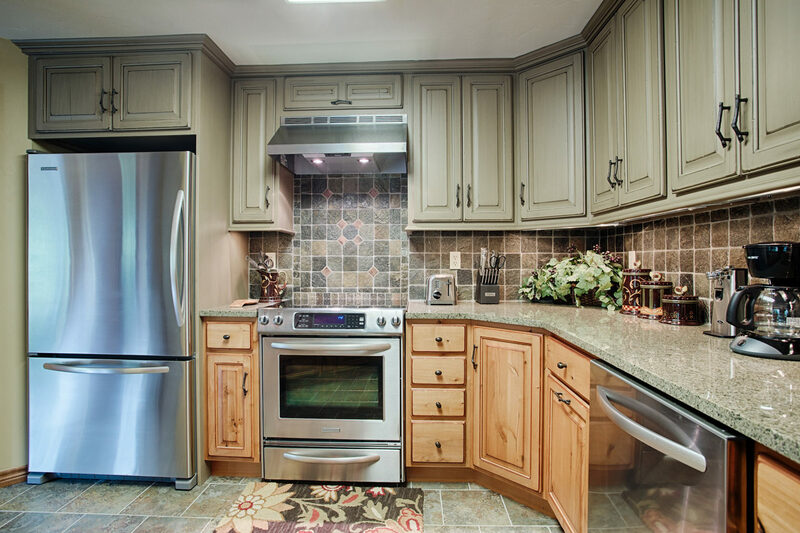 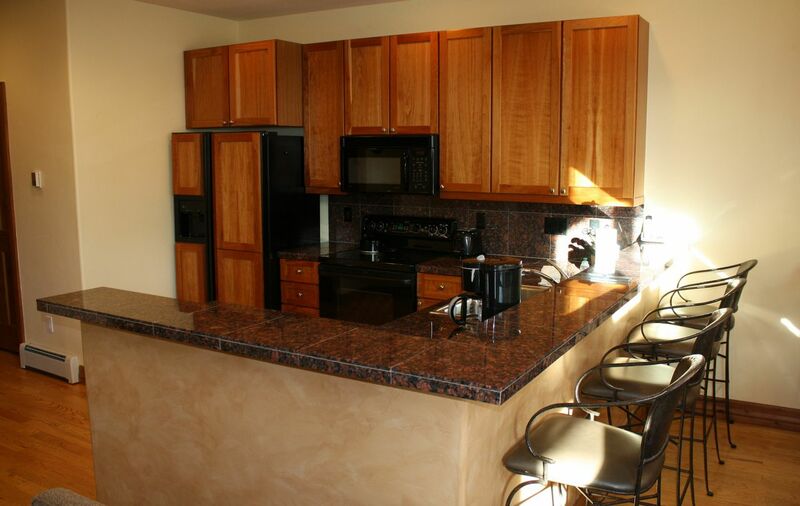 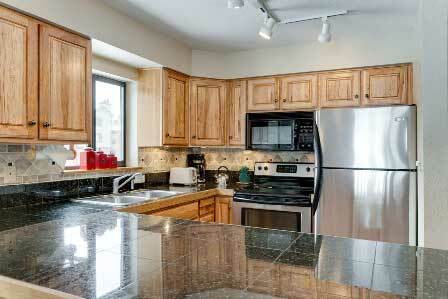 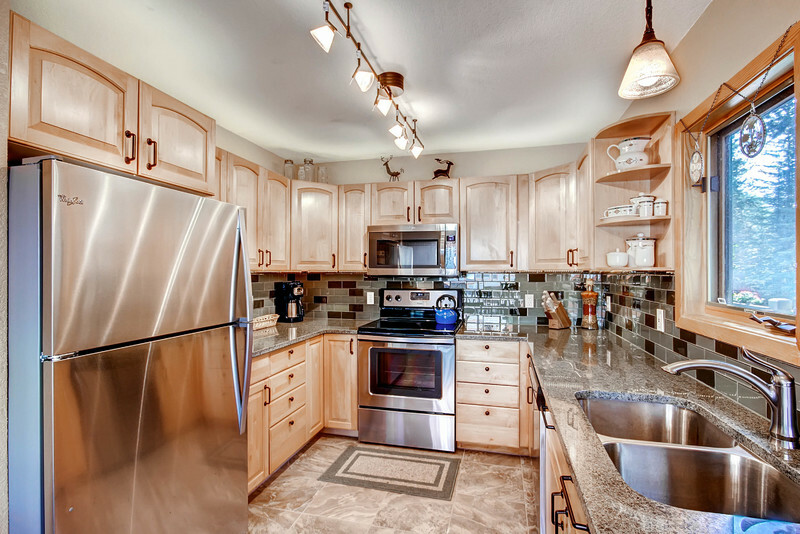 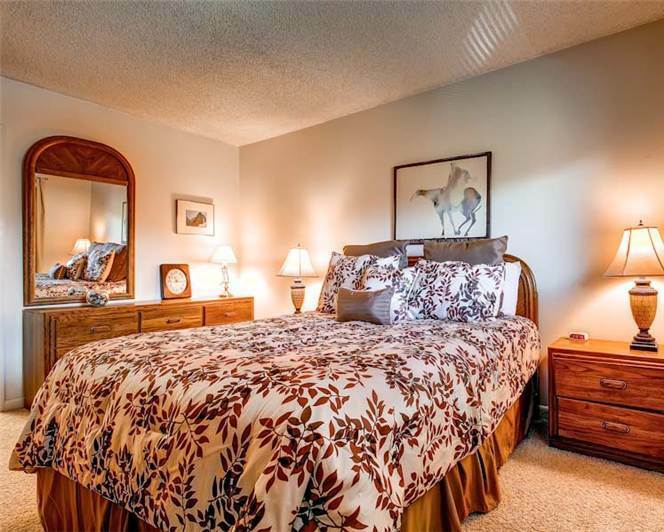 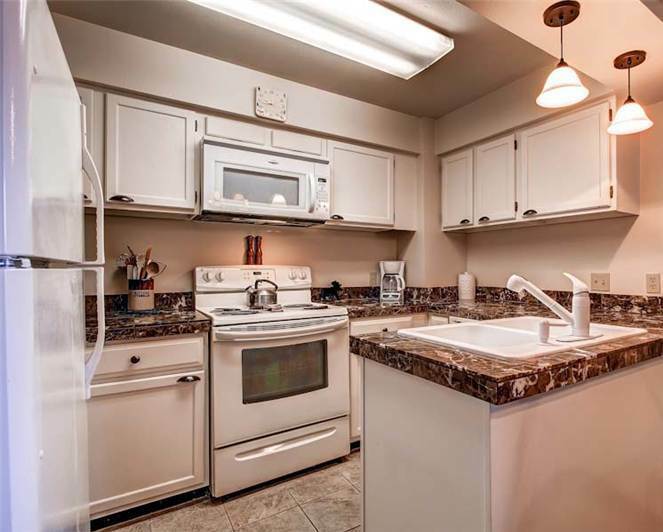 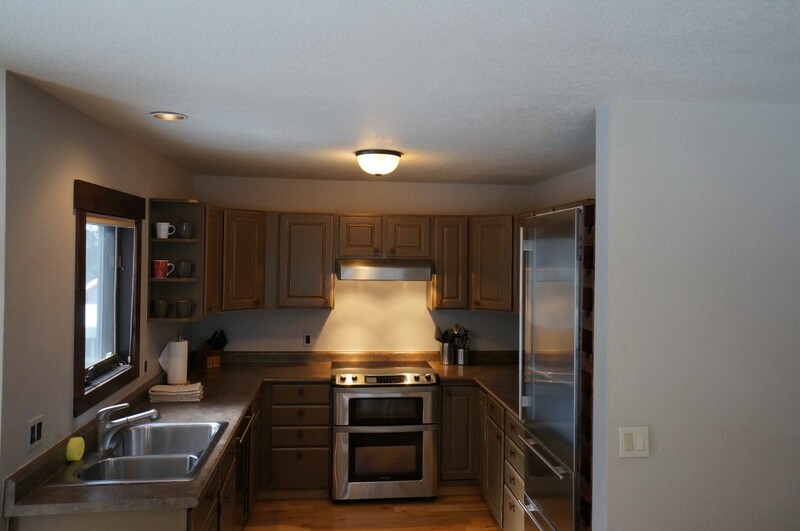 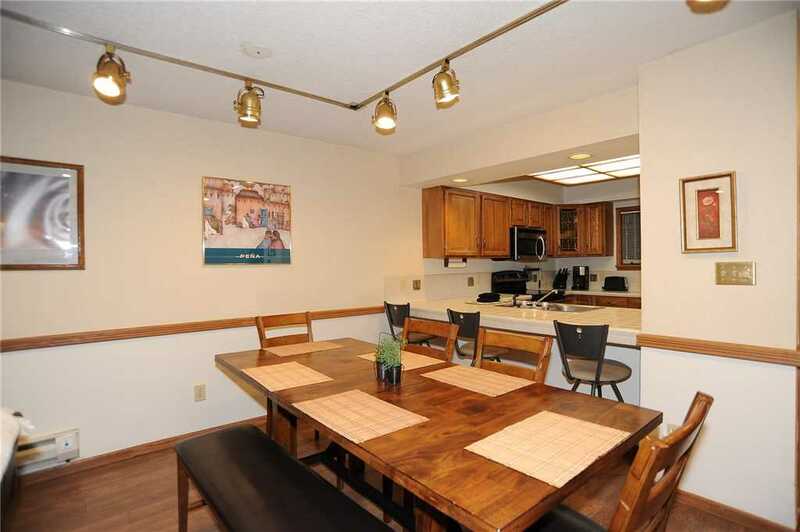 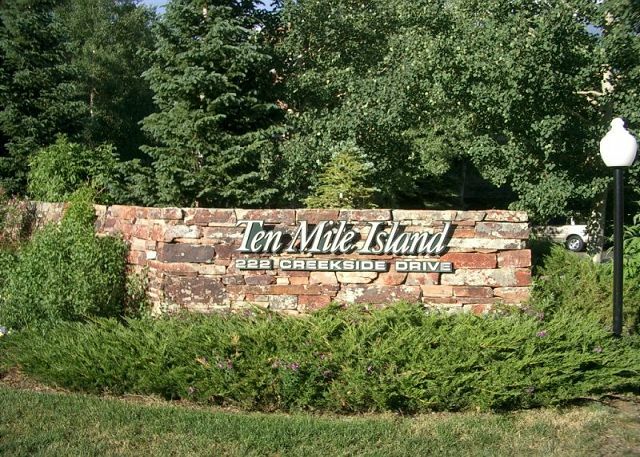 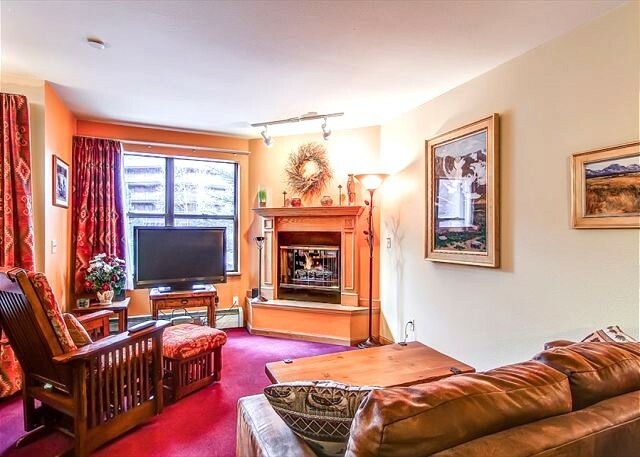 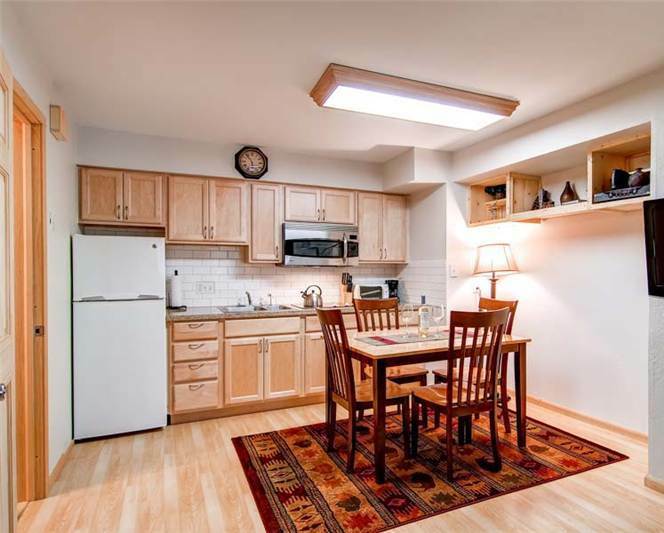 Other amenities include a washer/dryer, parking for three vehicles and complimentary Wi-Fi throughout the home. 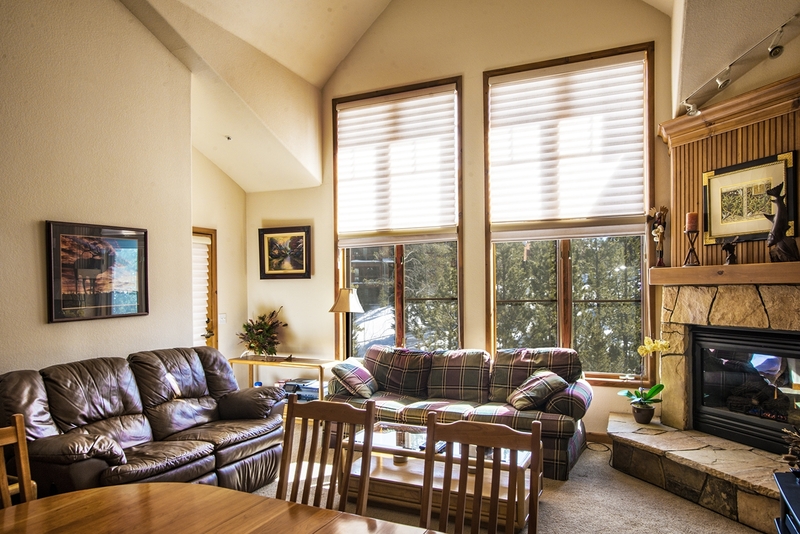 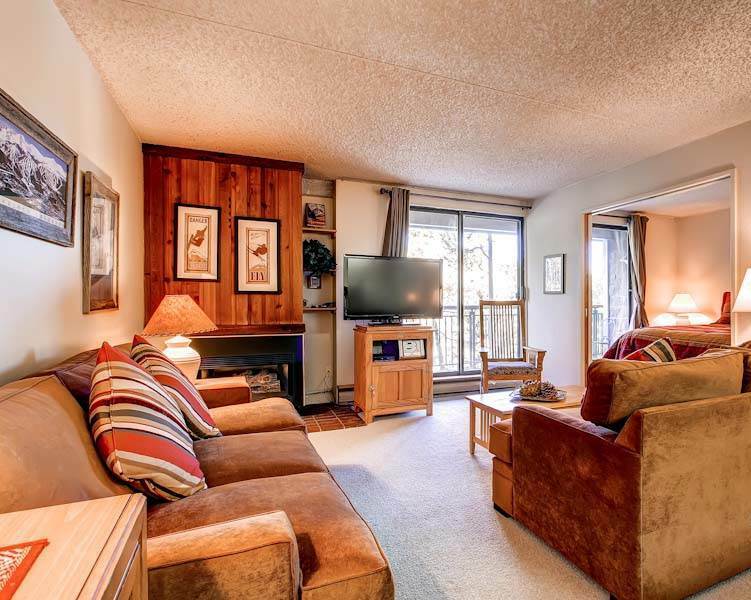 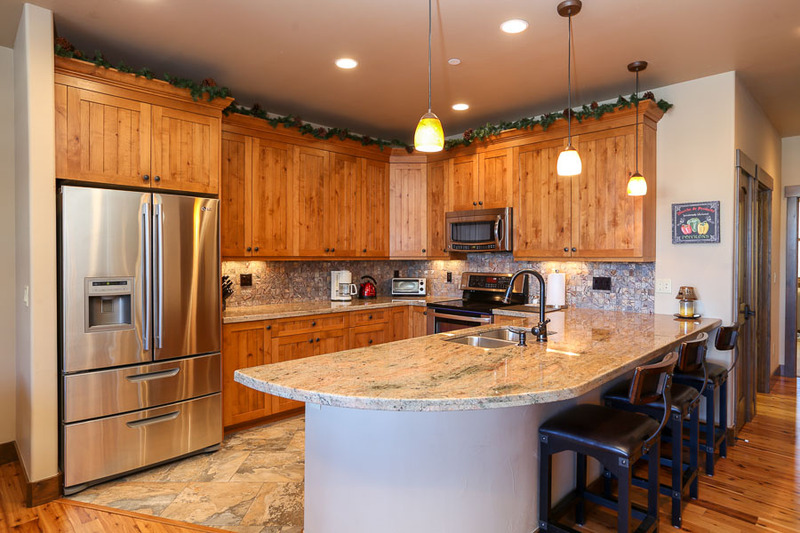 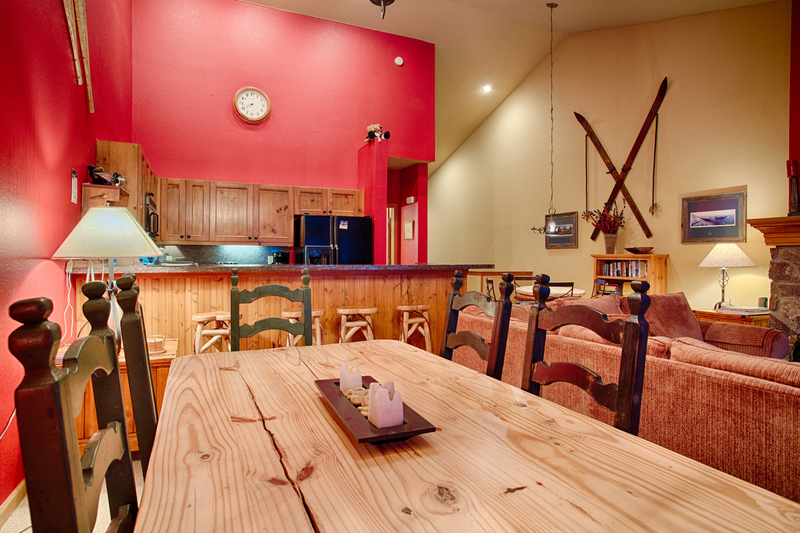 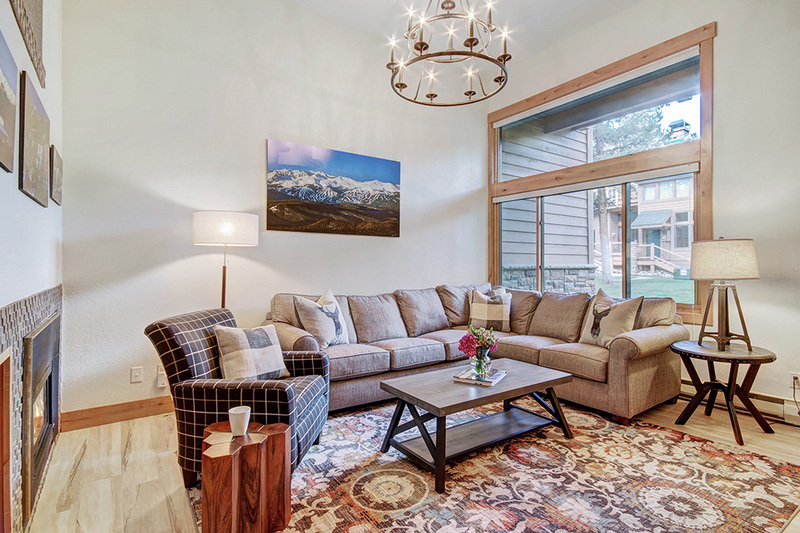 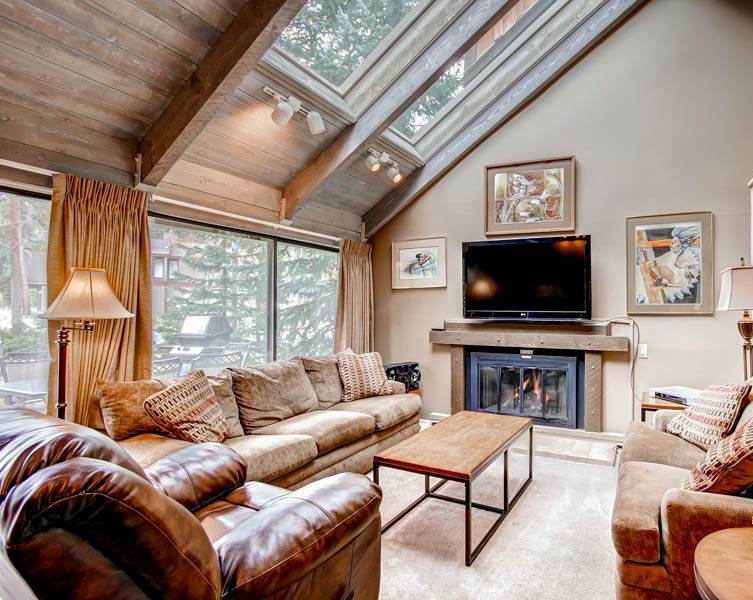 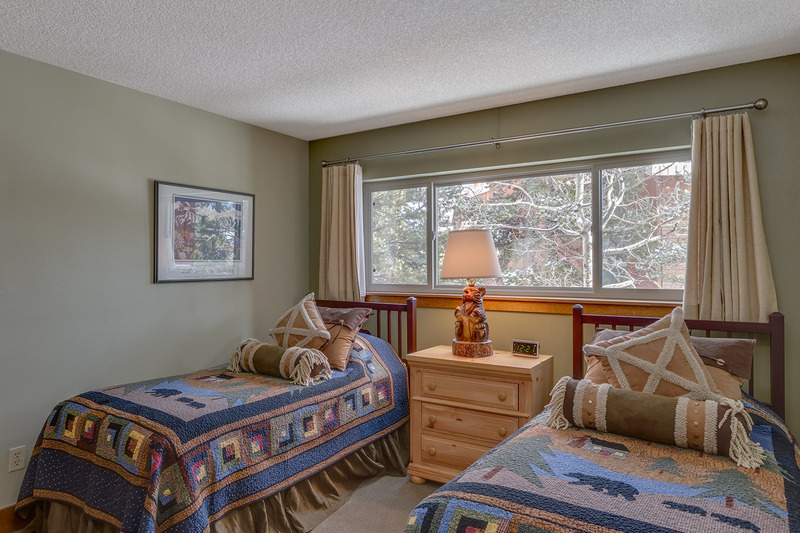 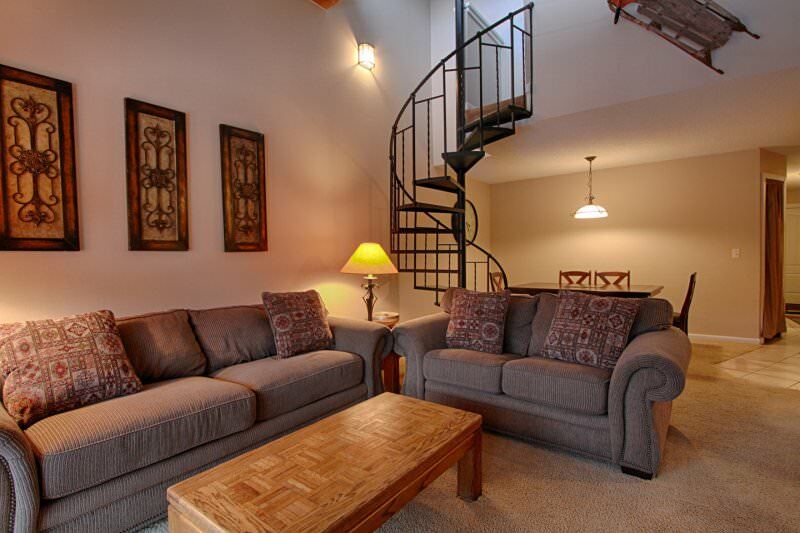 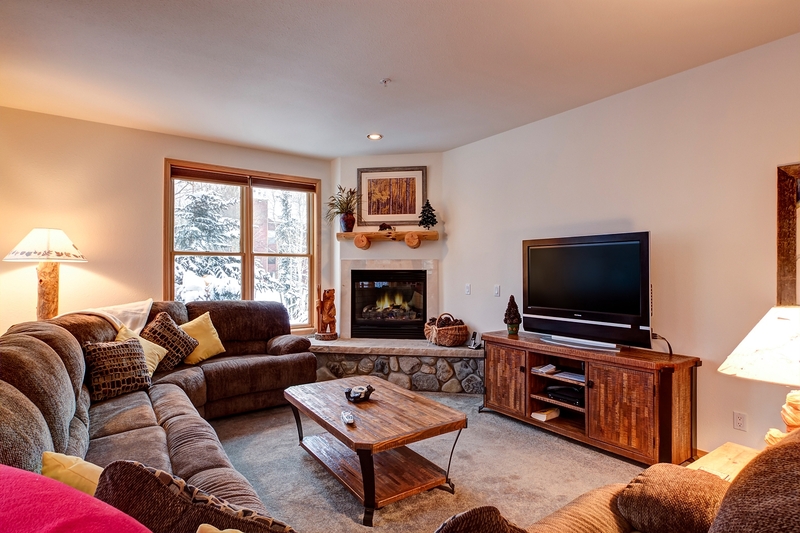 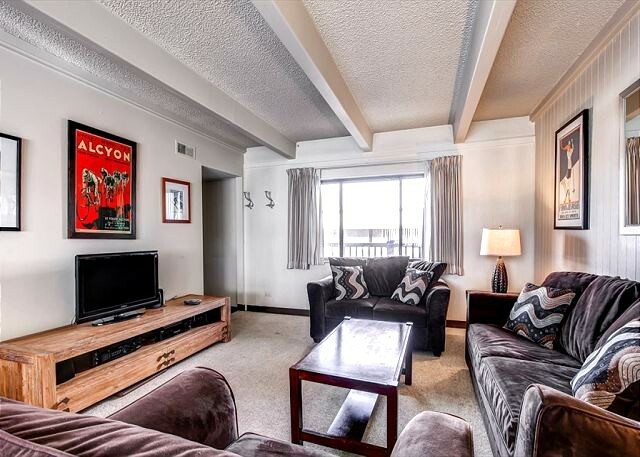 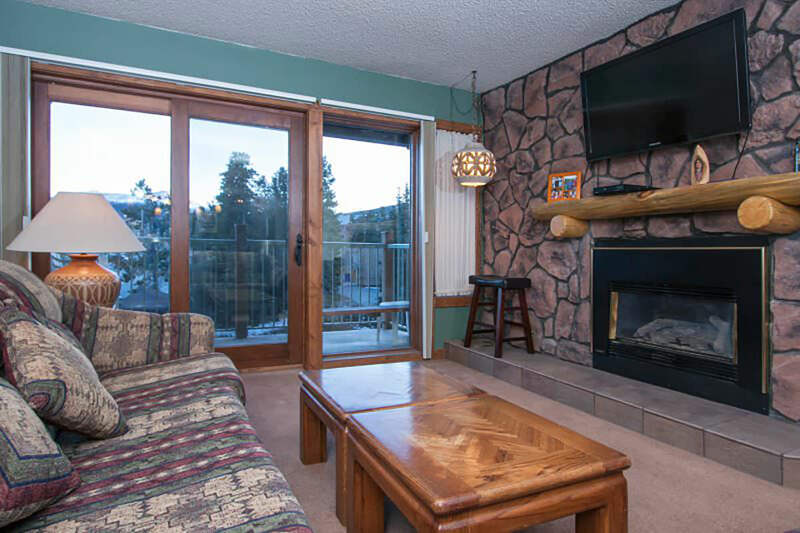 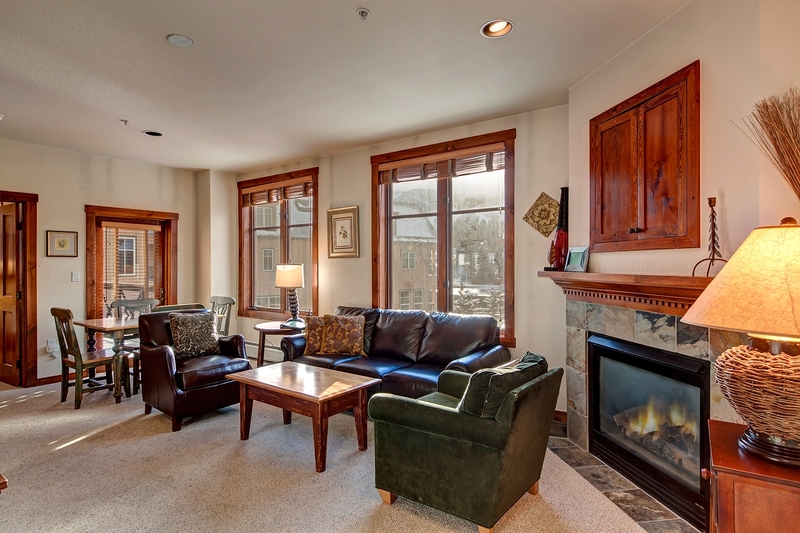 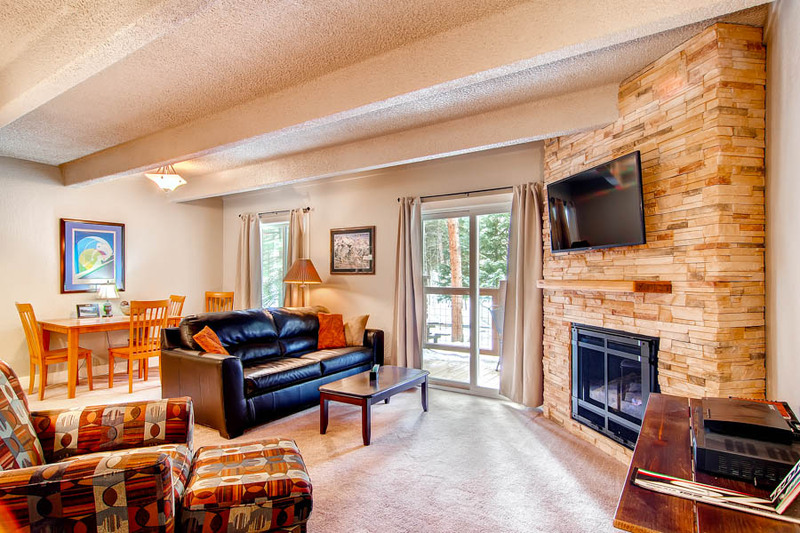 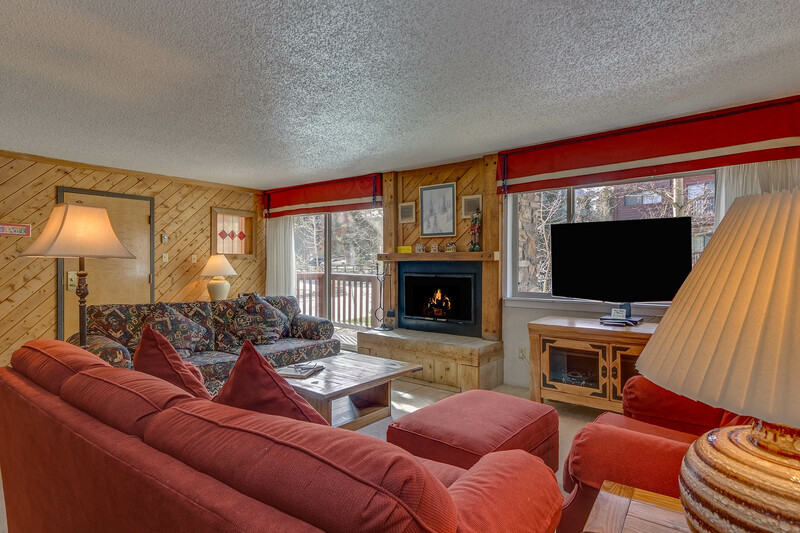 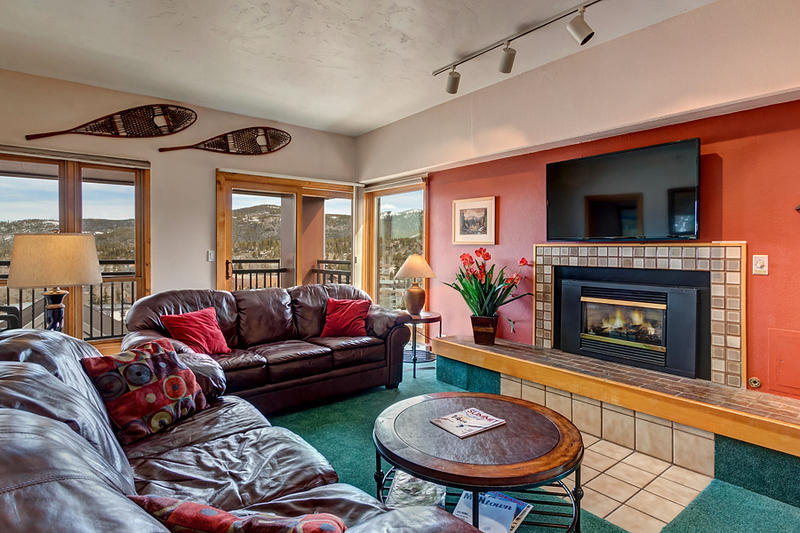 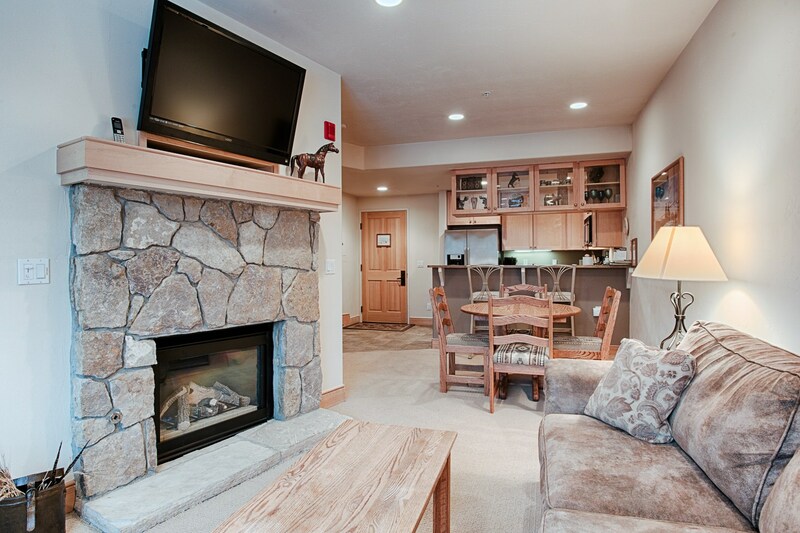 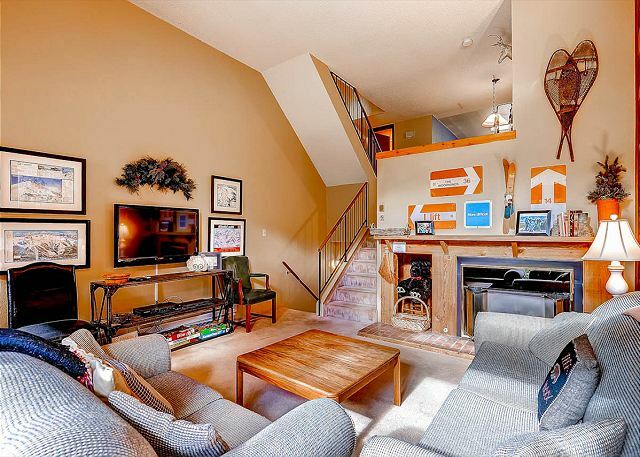 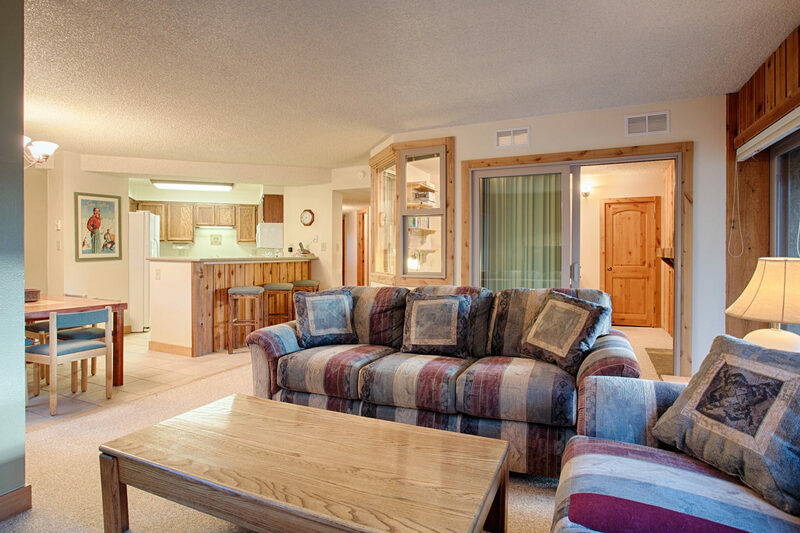 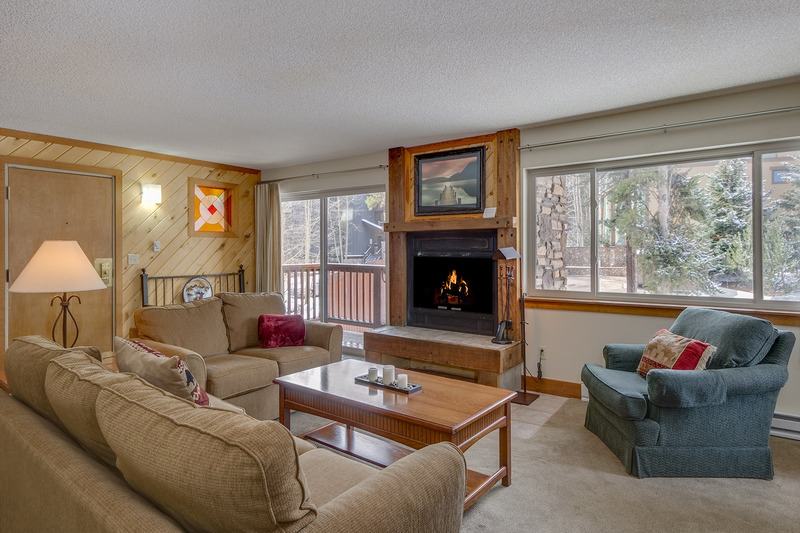 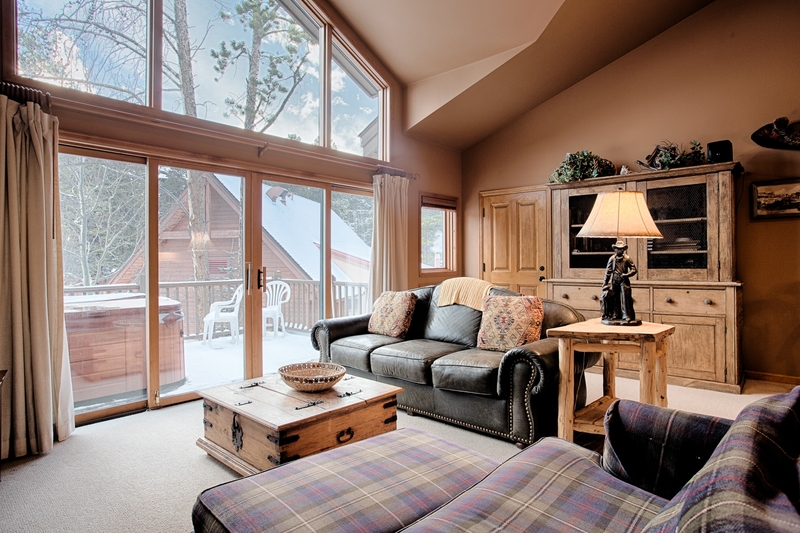 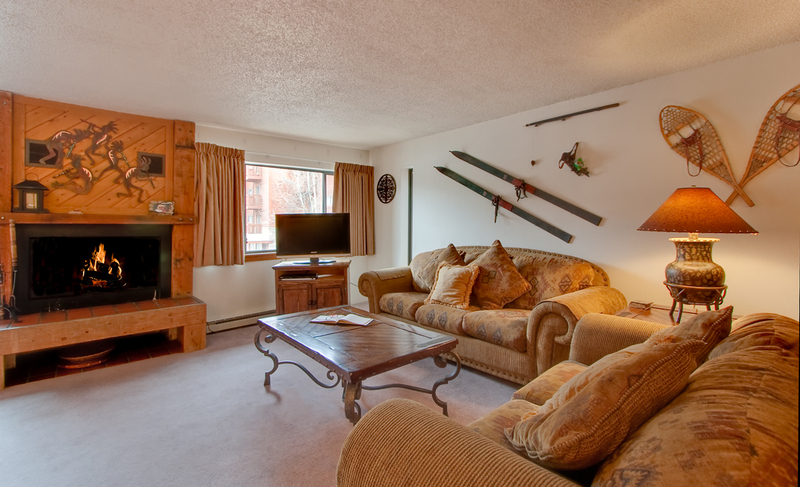 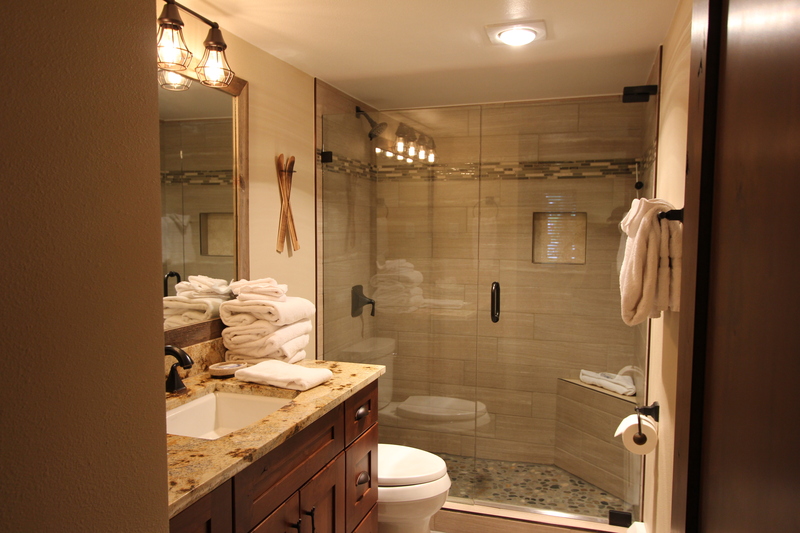 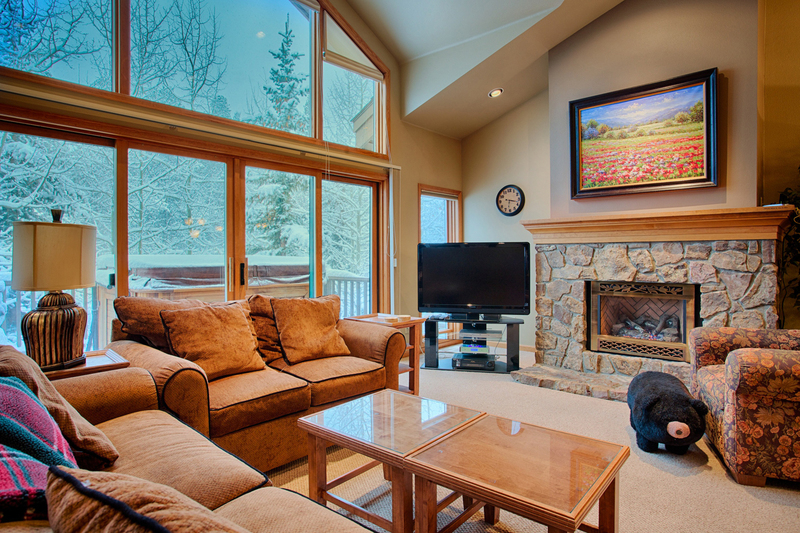 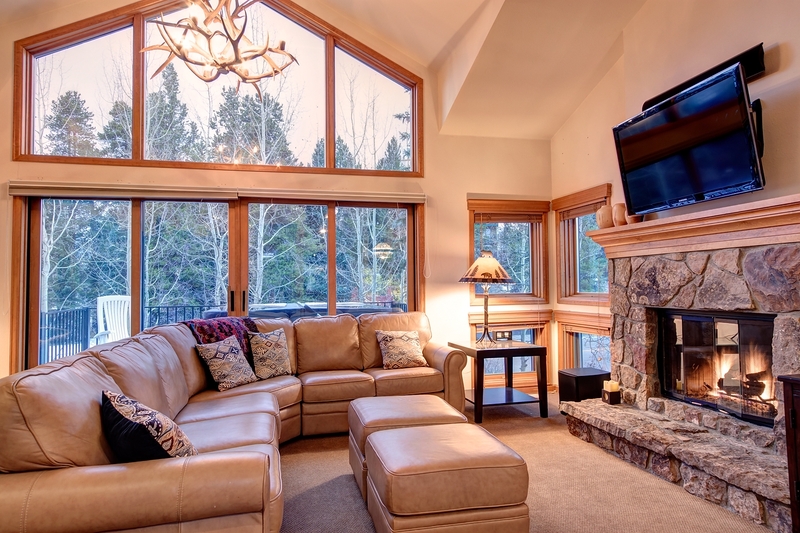 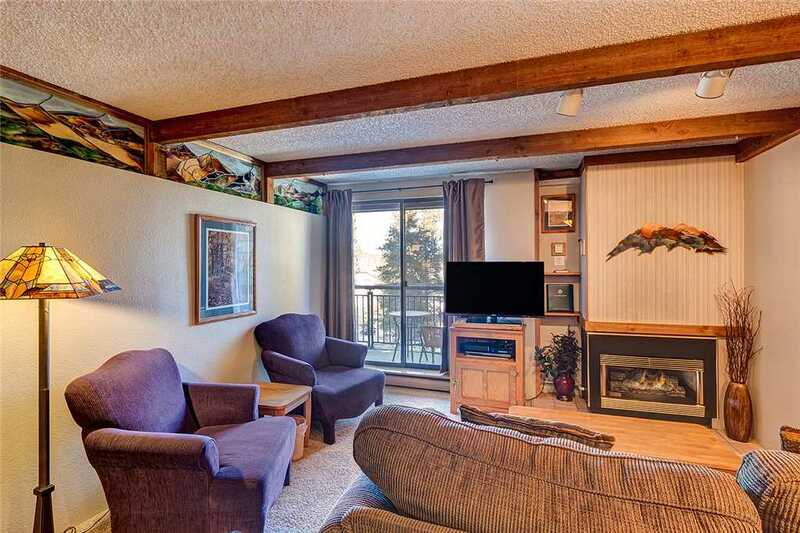 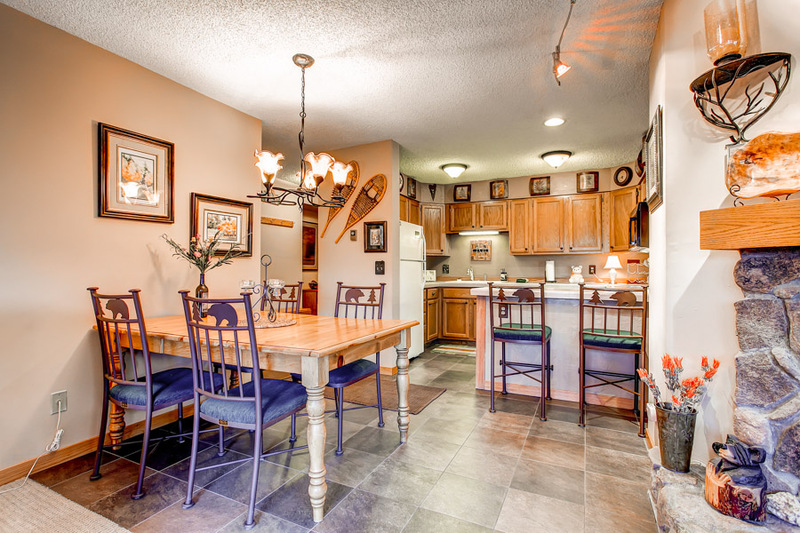 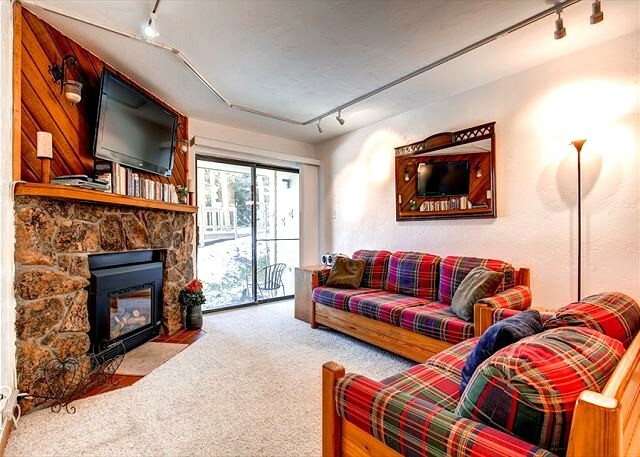 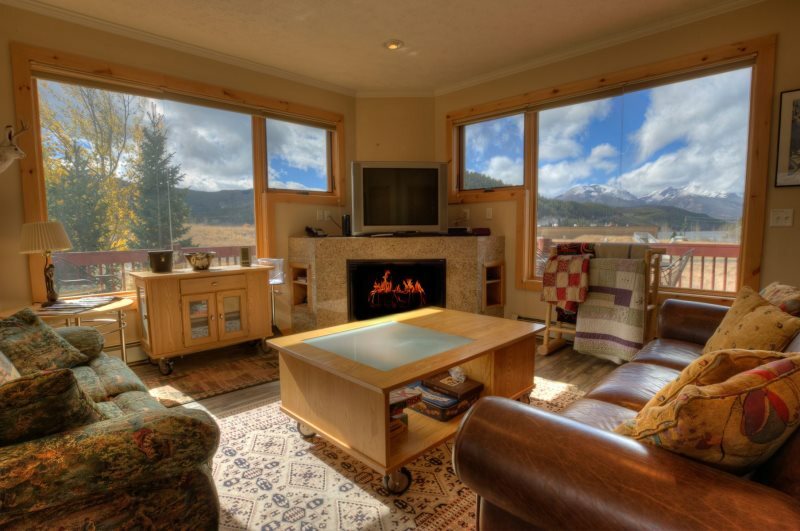 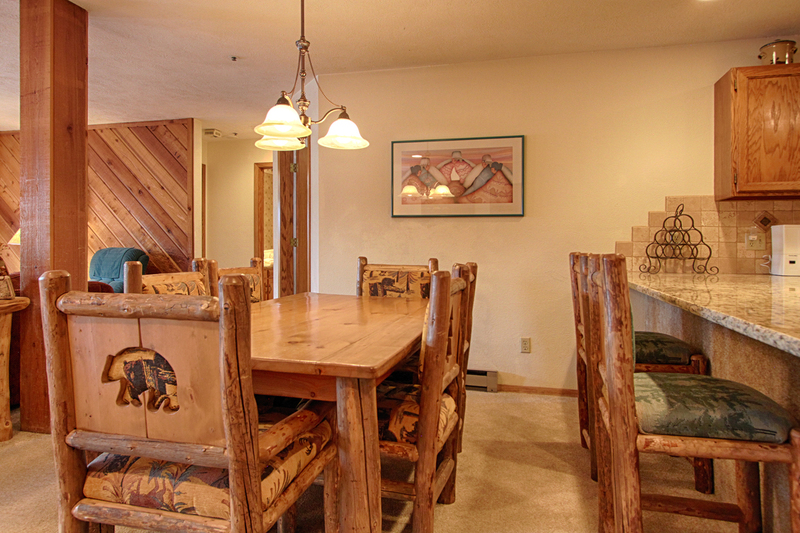 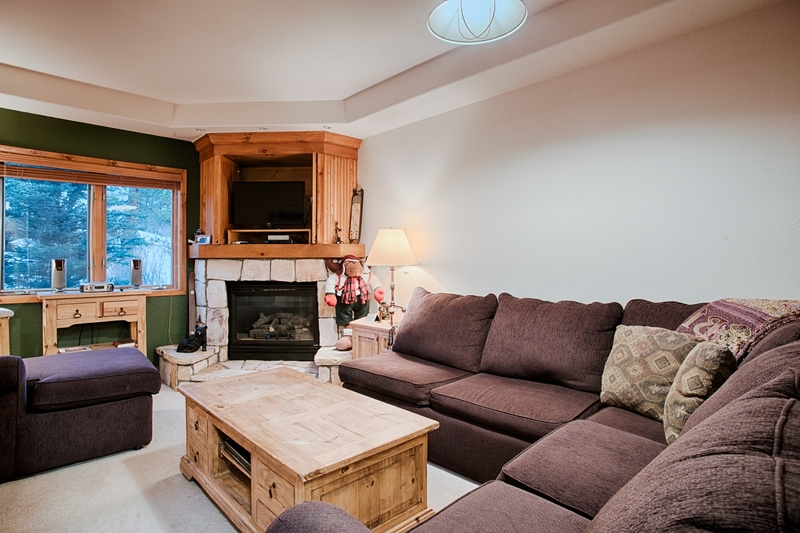 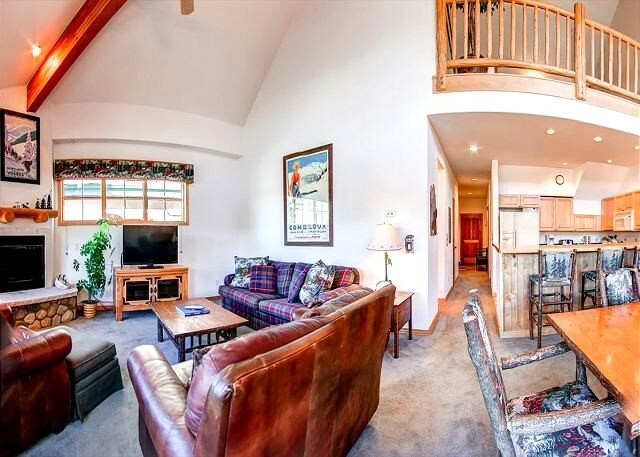 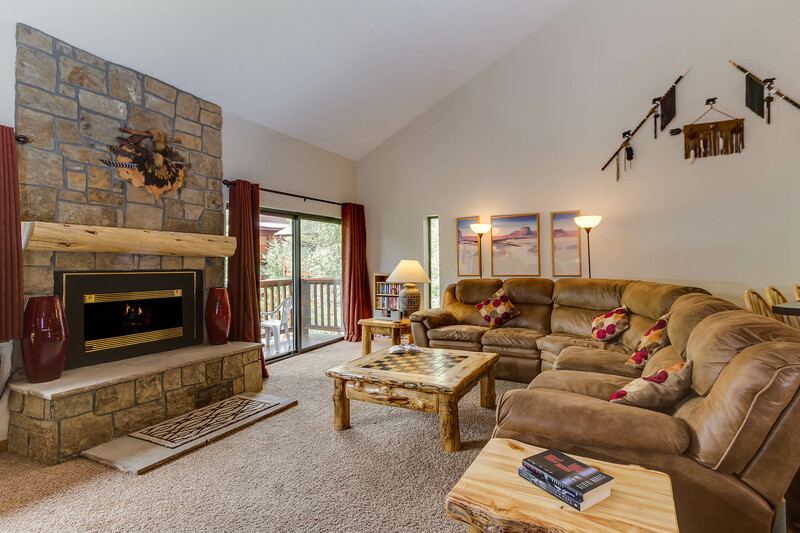 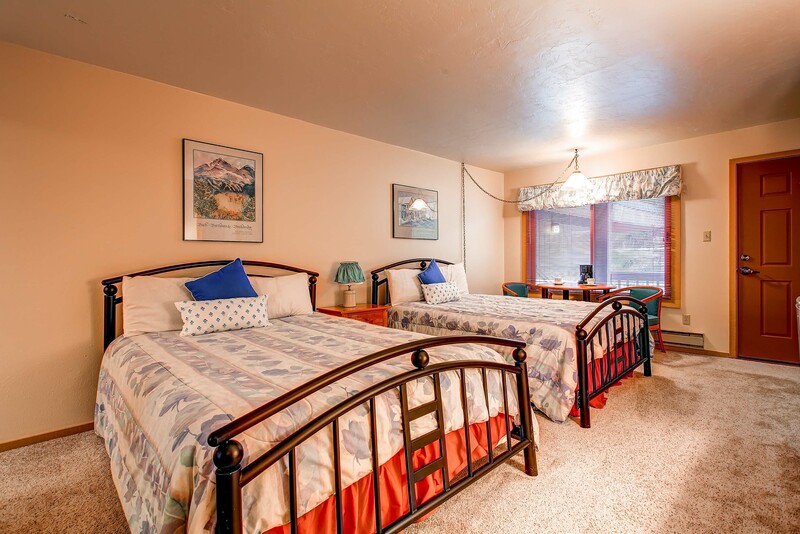 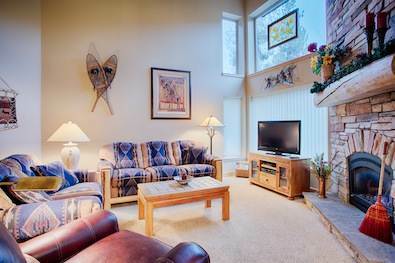 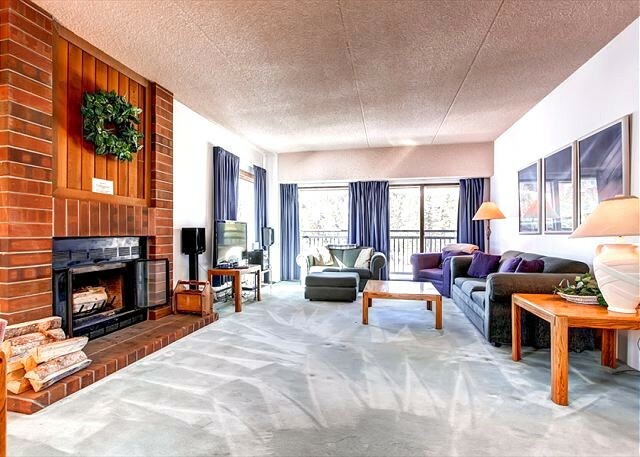 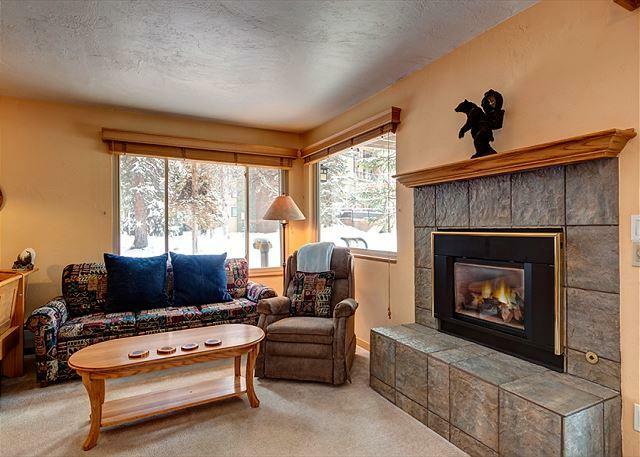 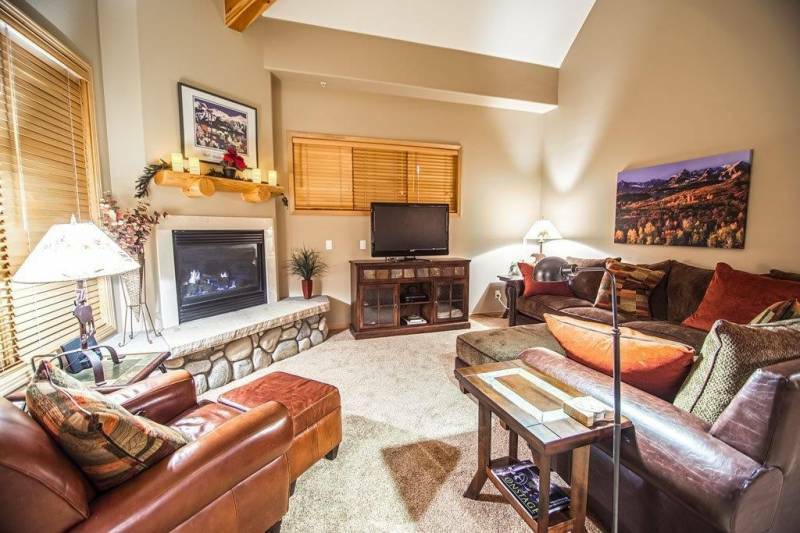 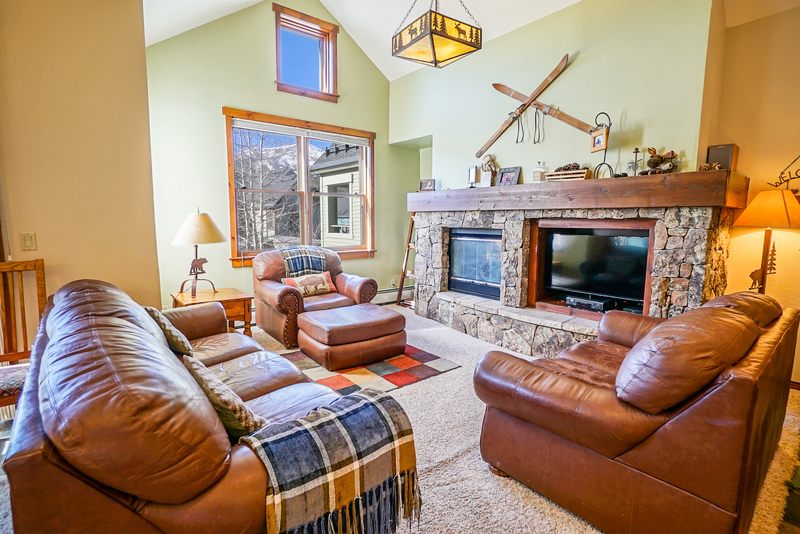 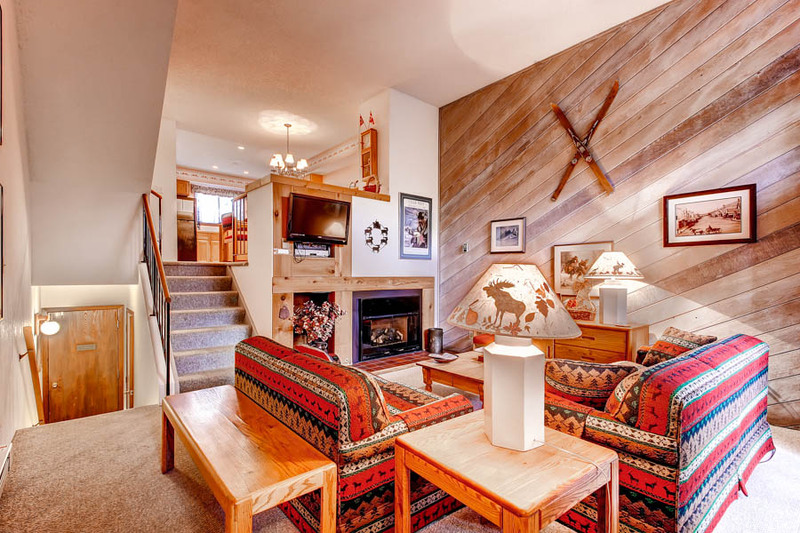 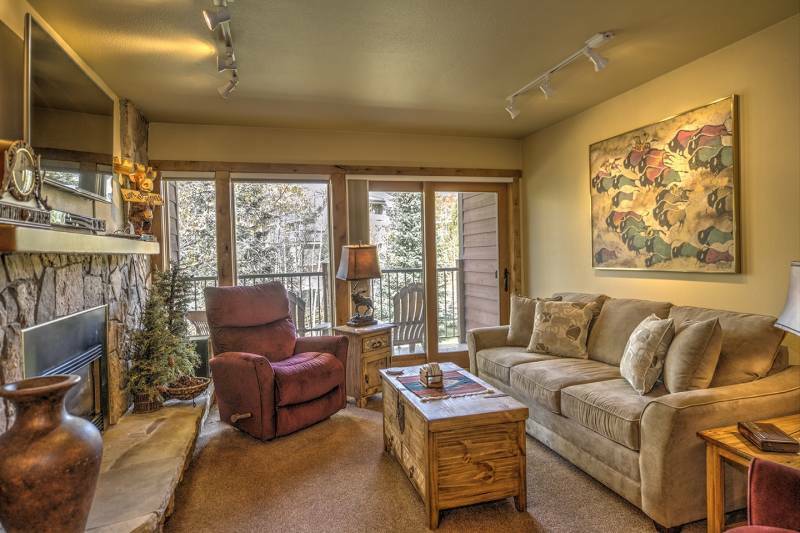 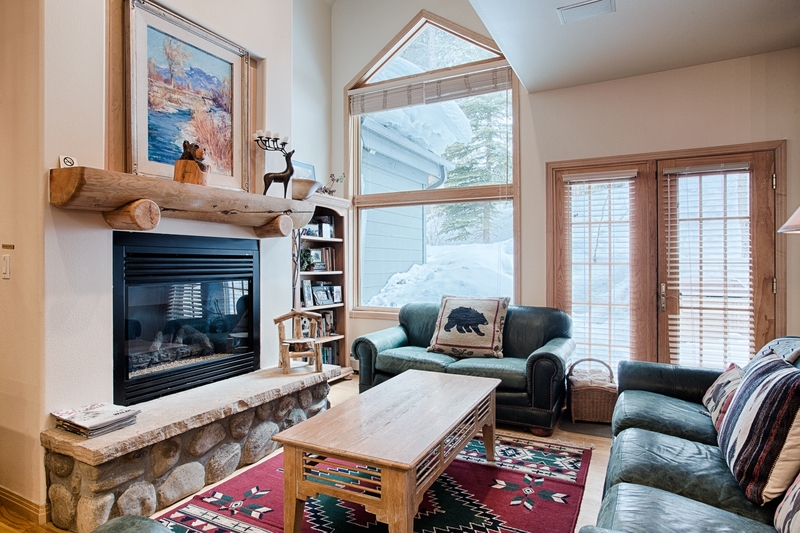 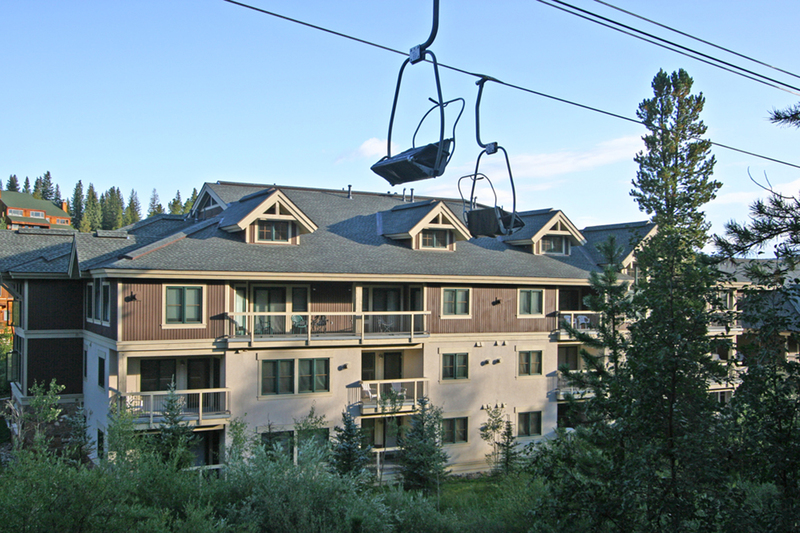 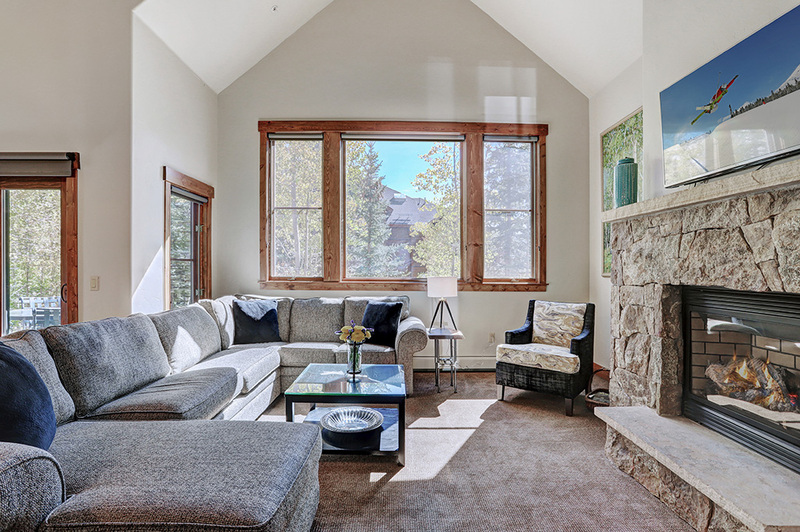 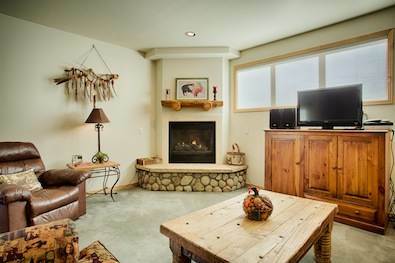 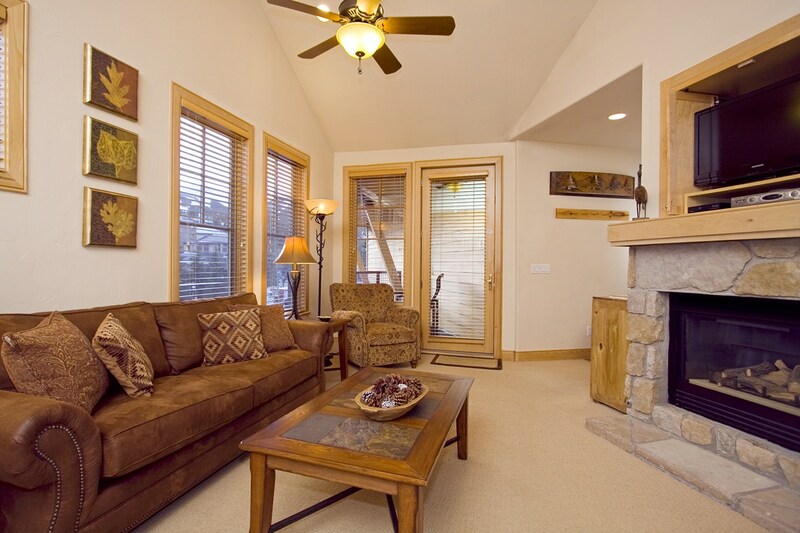 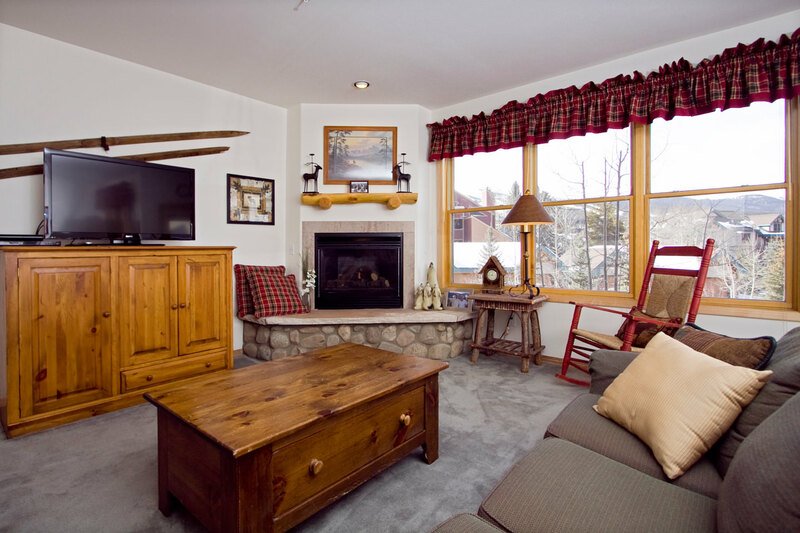 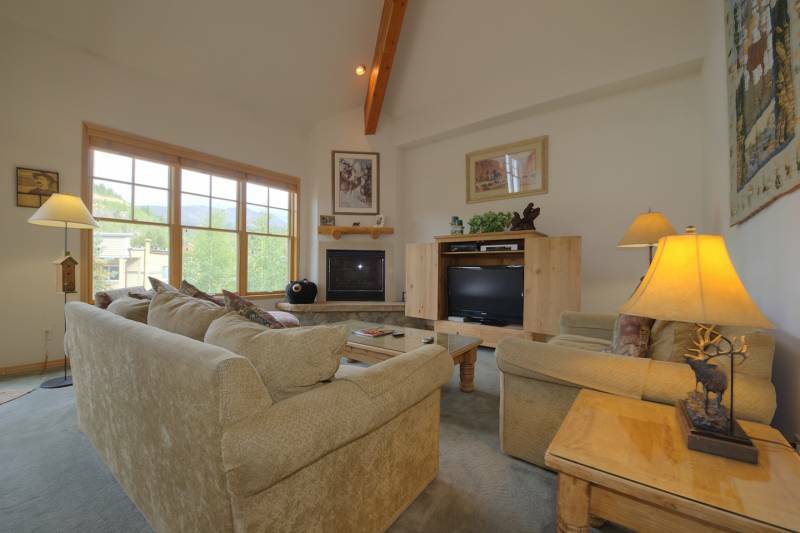 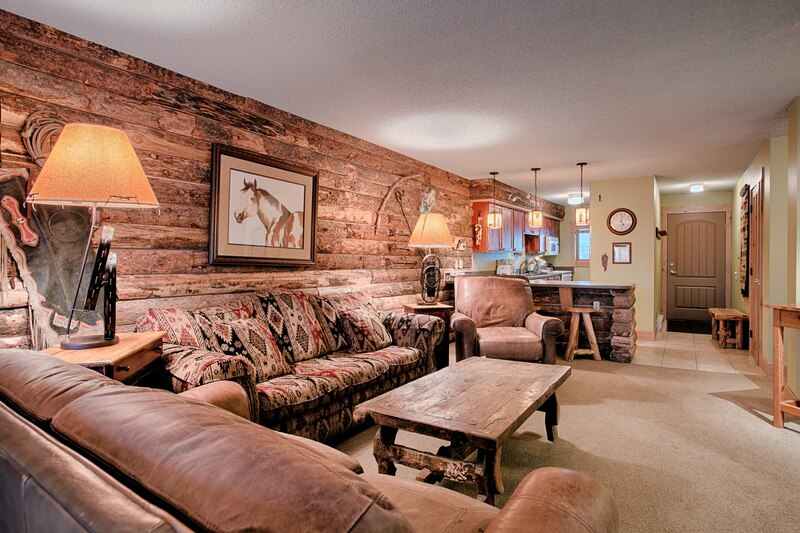 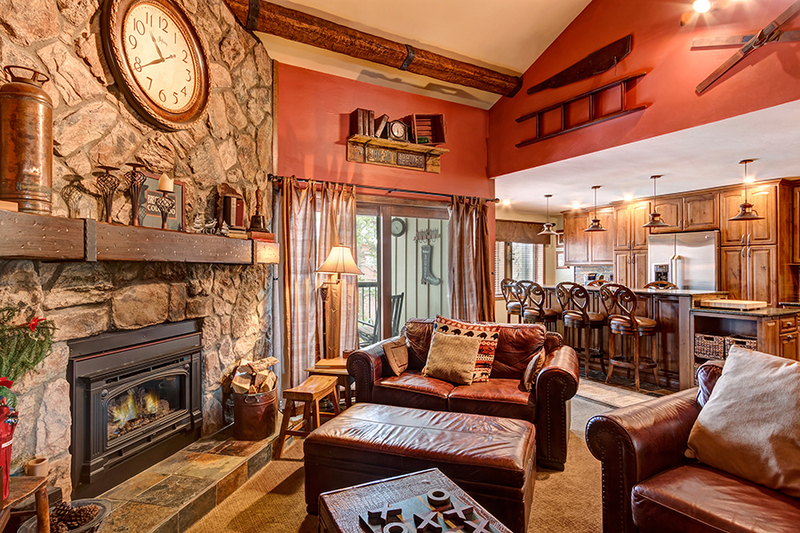 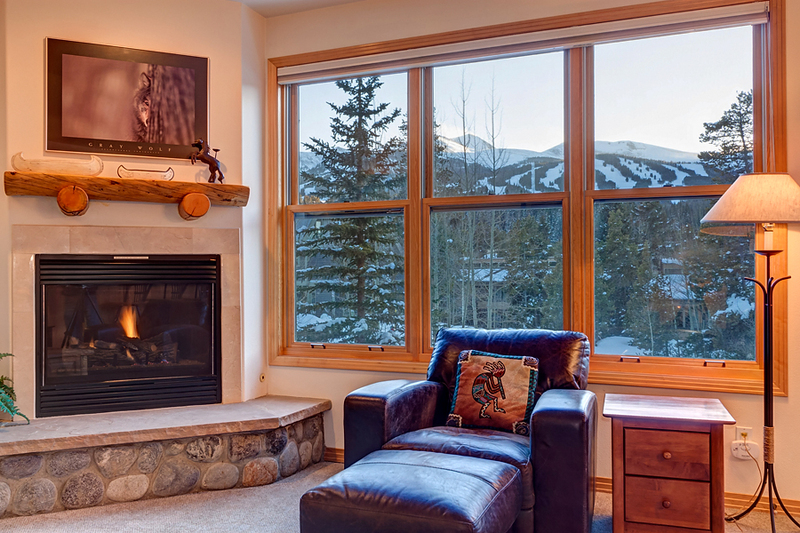 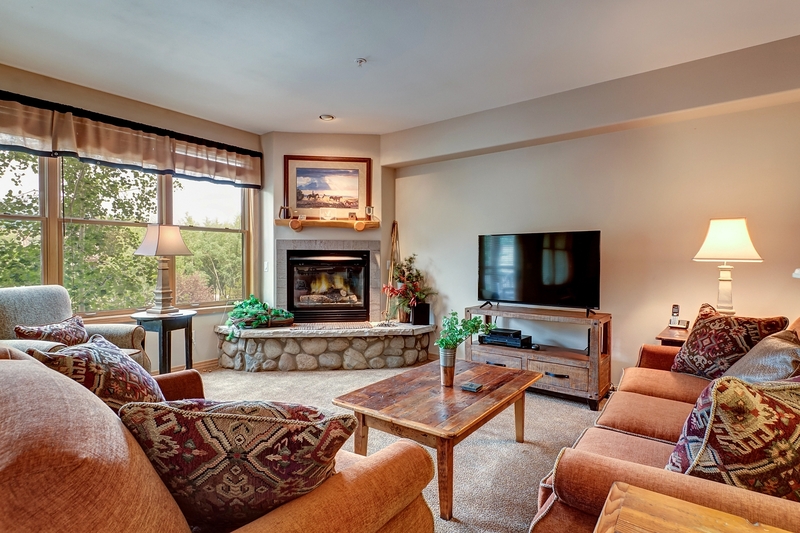 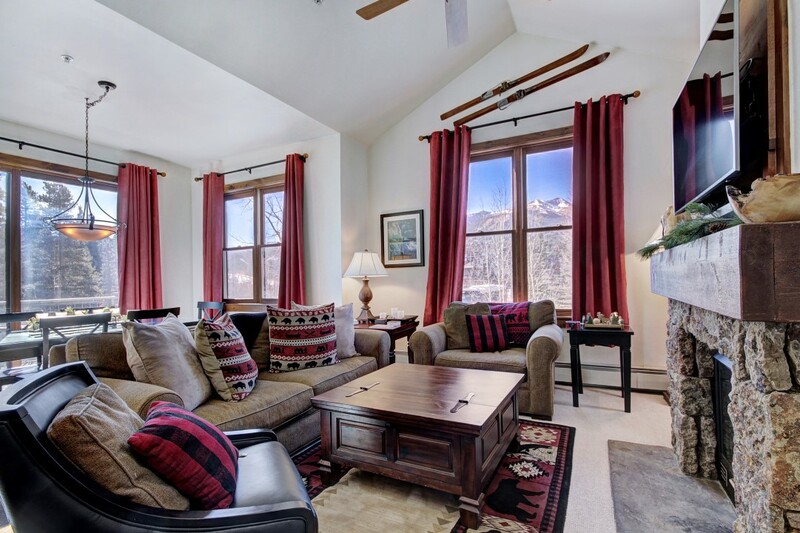 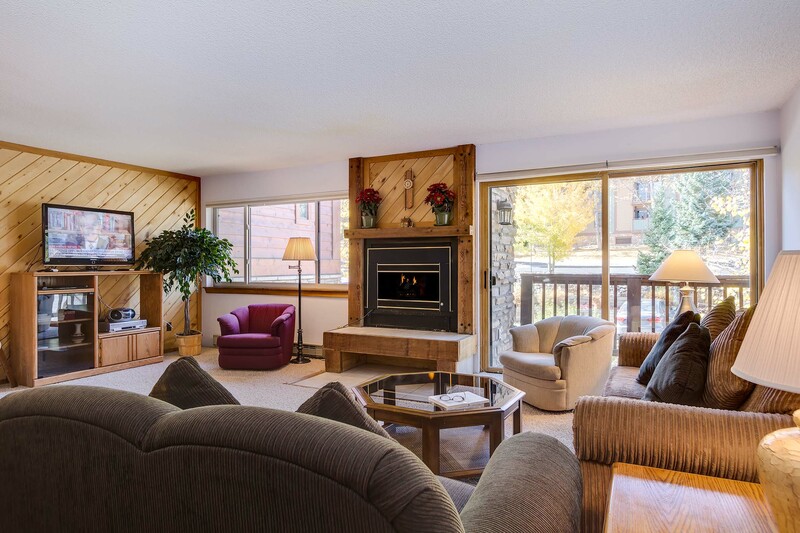 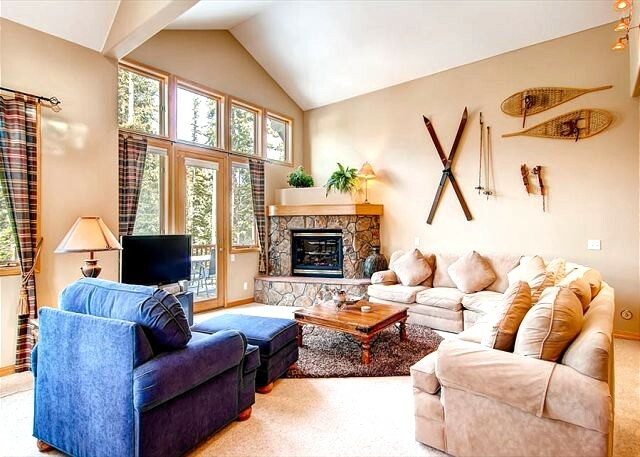 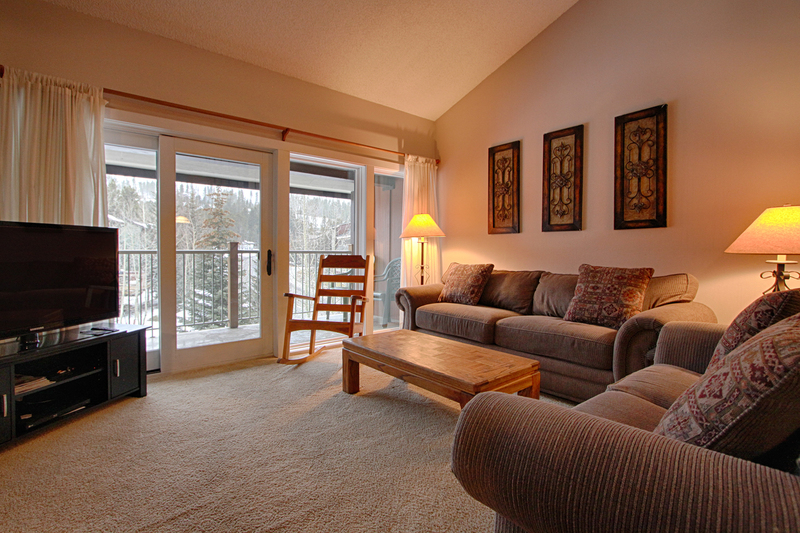 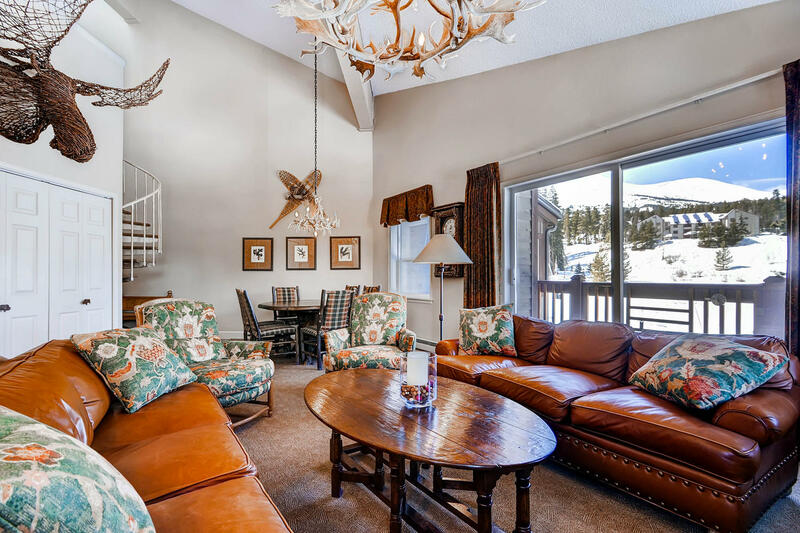 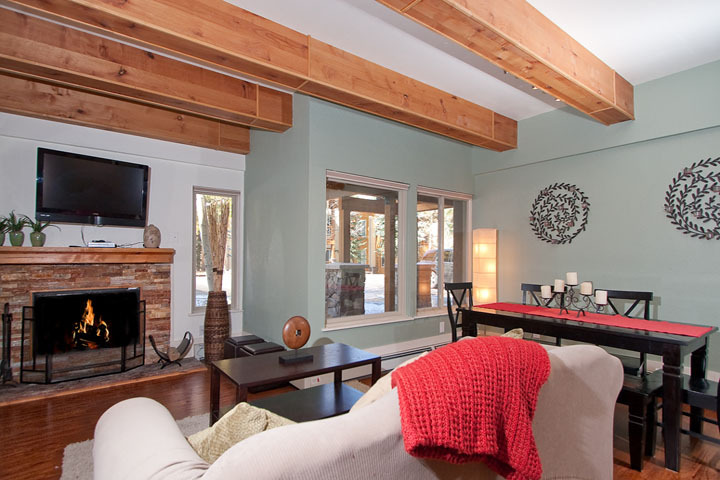 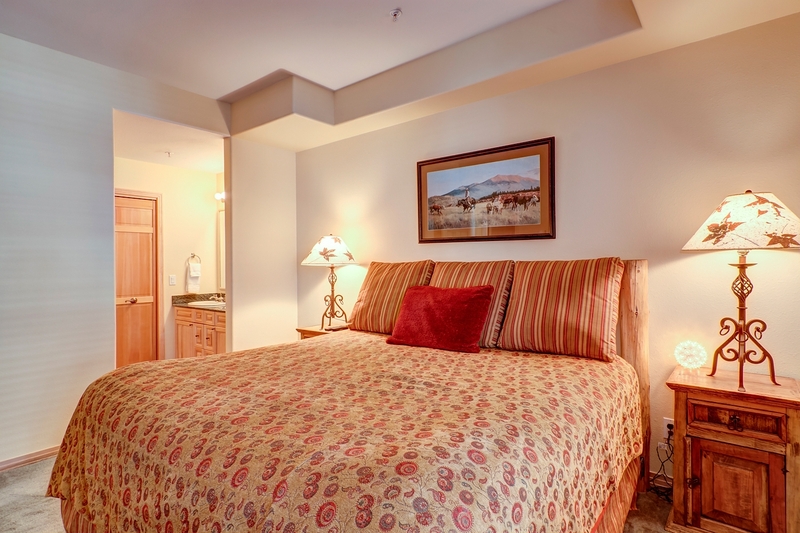 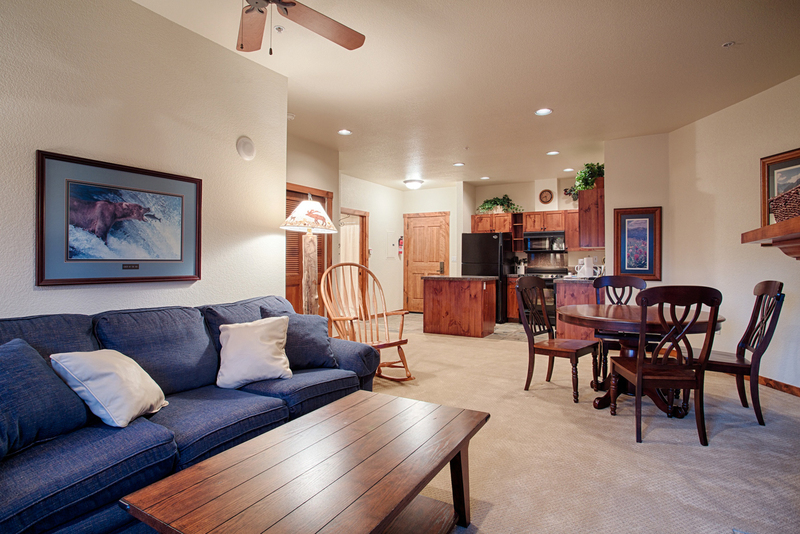 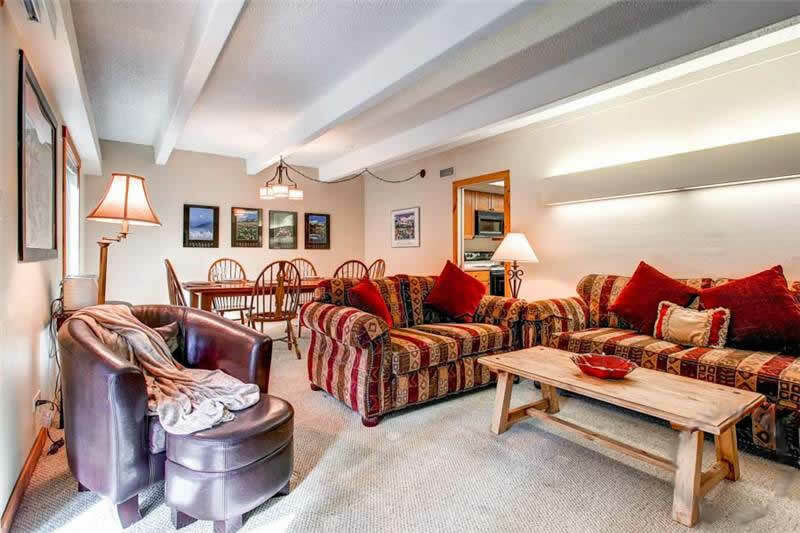 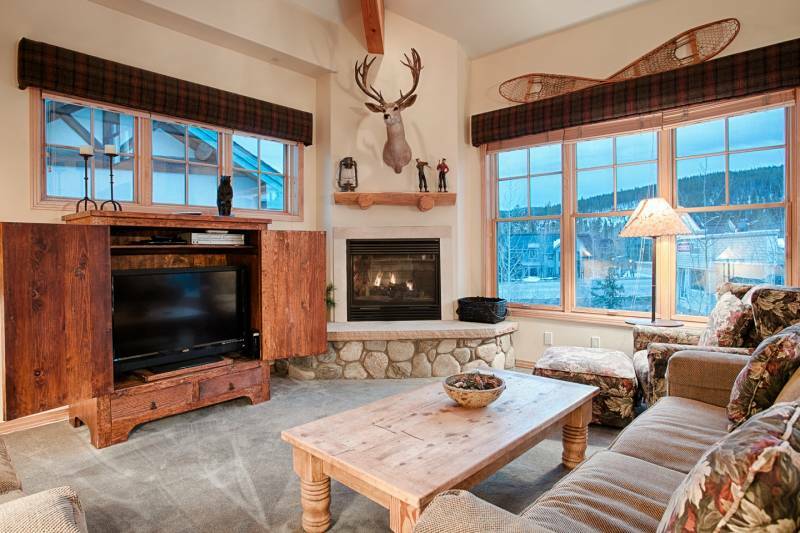 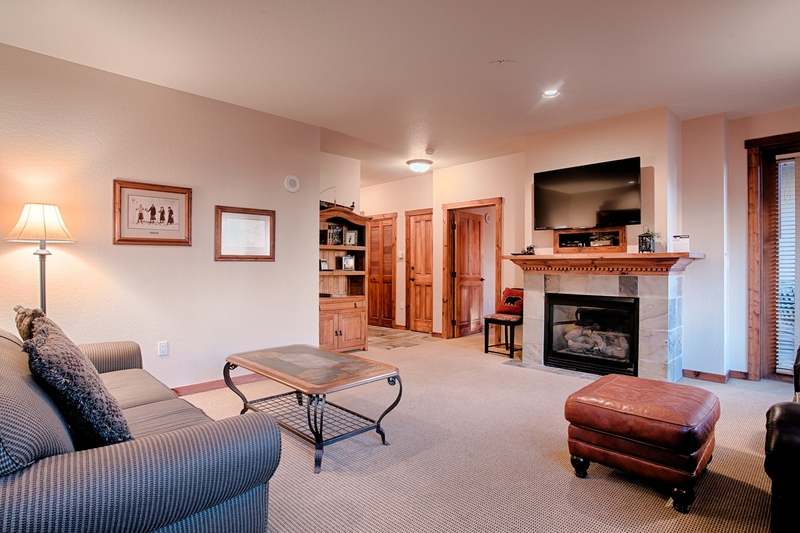 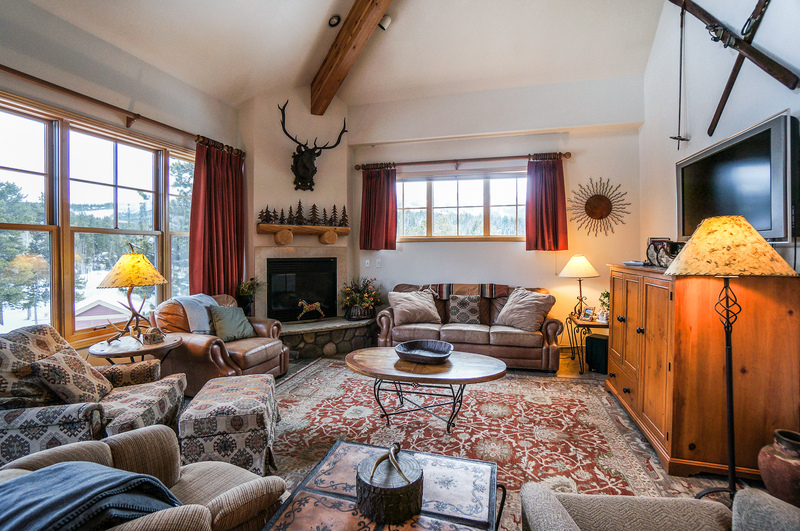 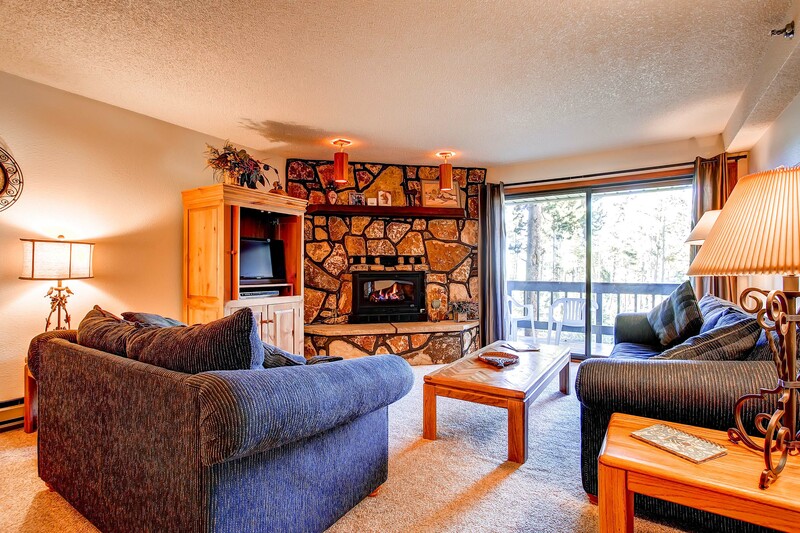 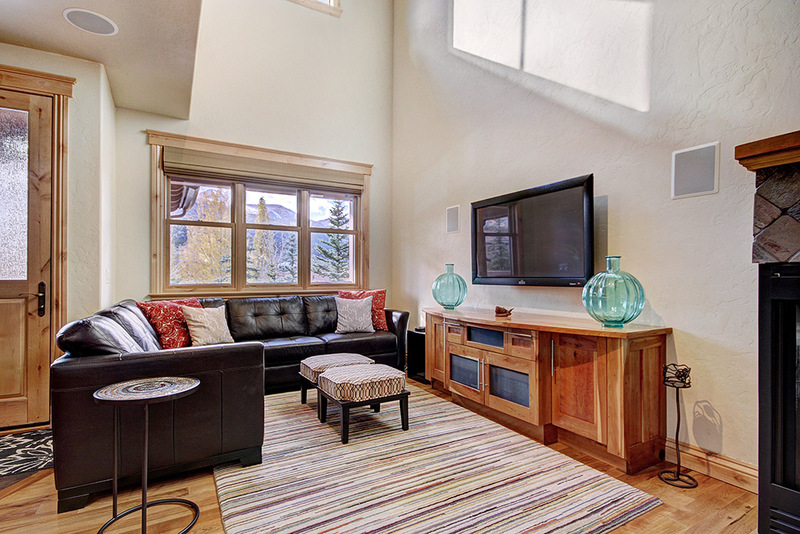 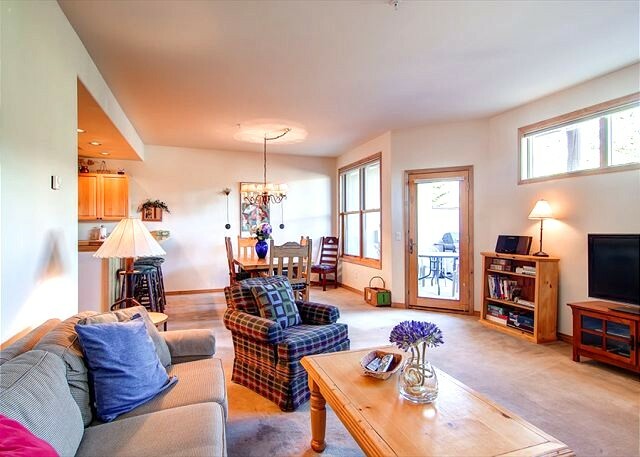 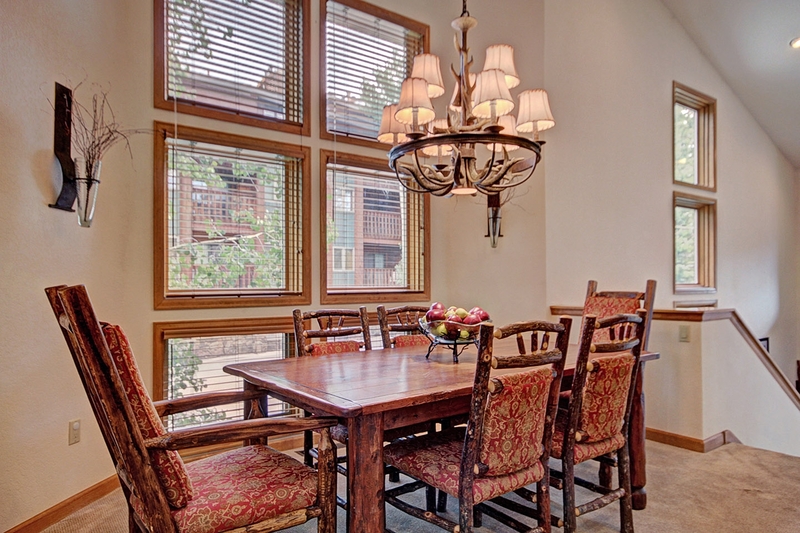 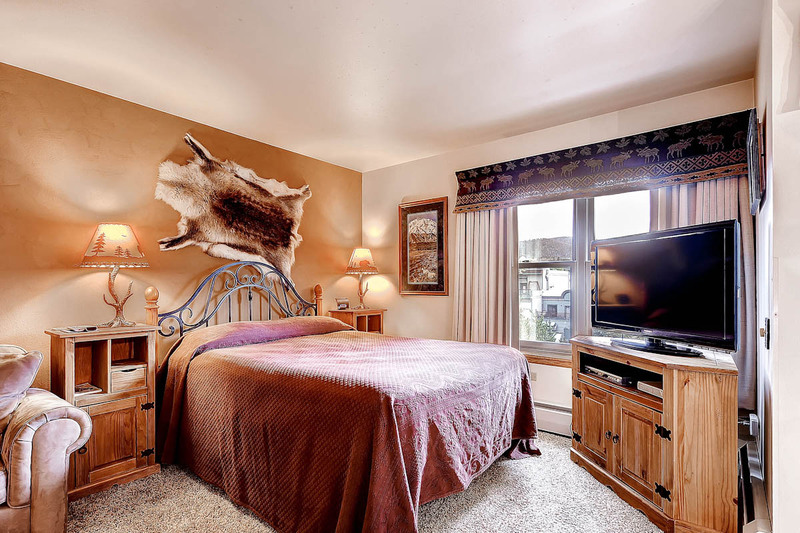 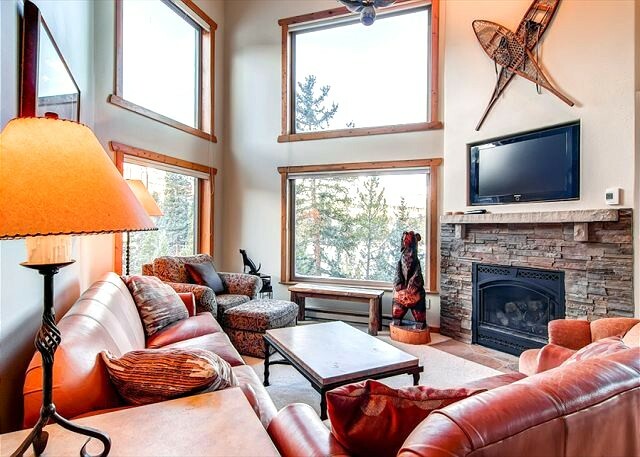 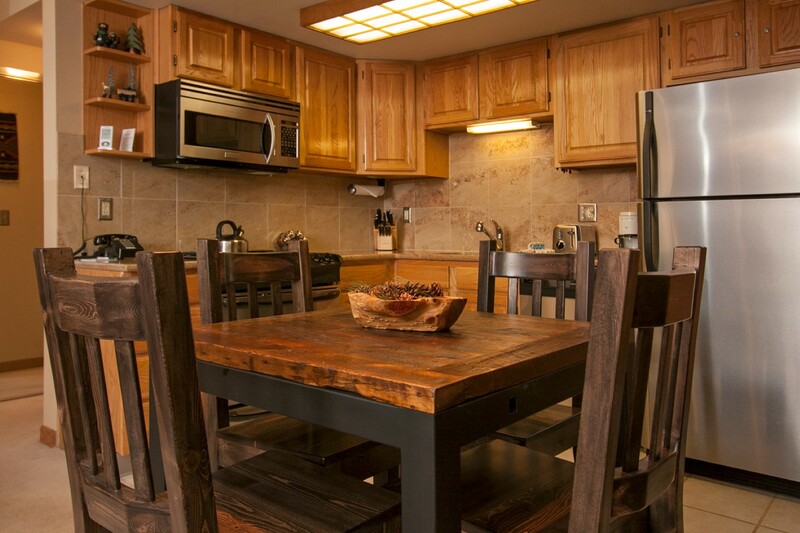 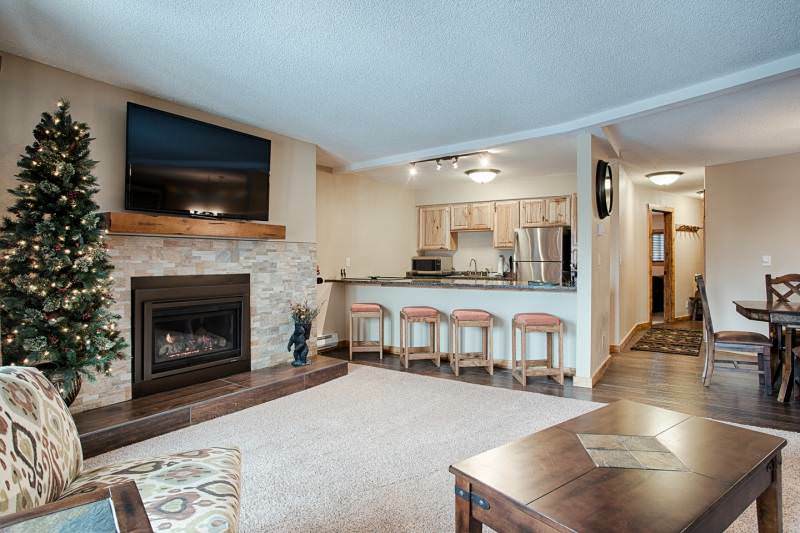 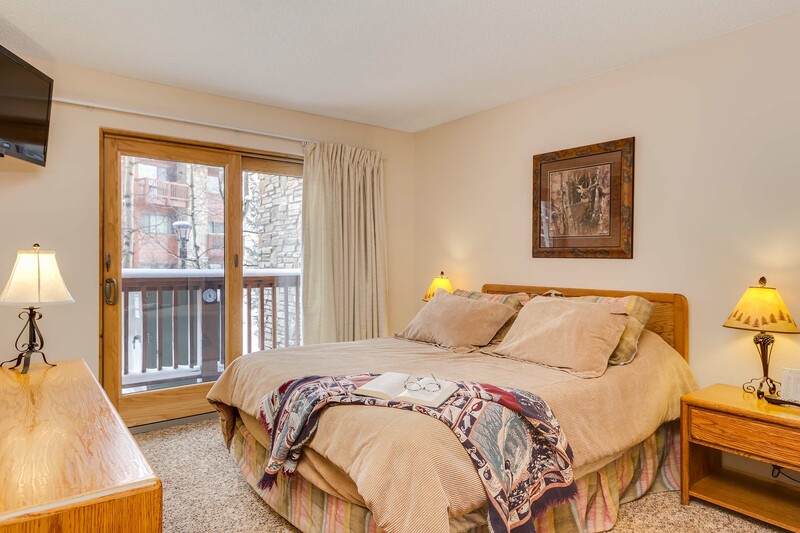 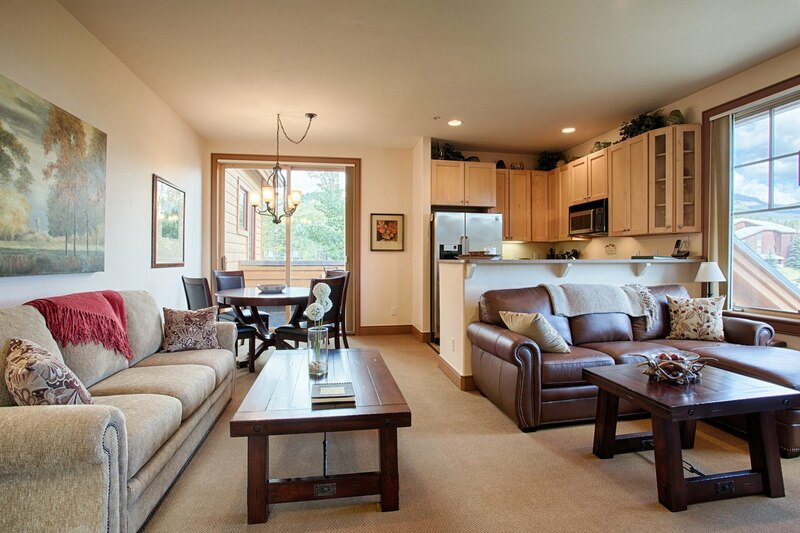 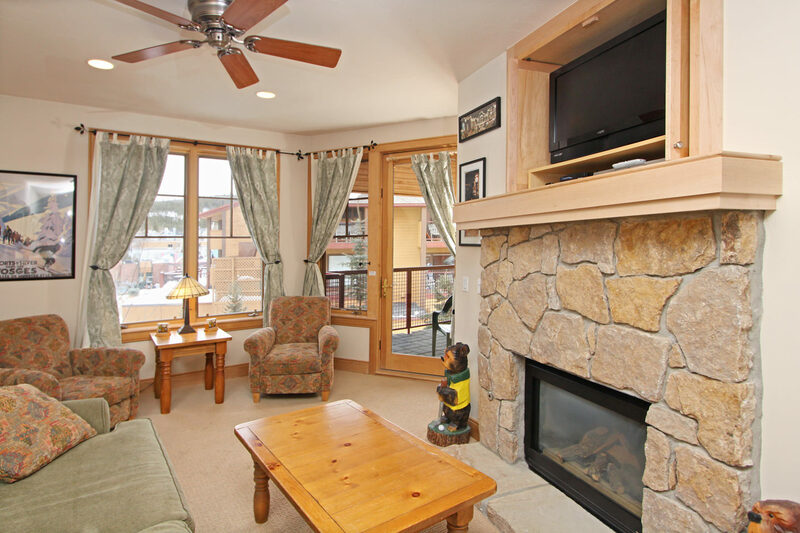 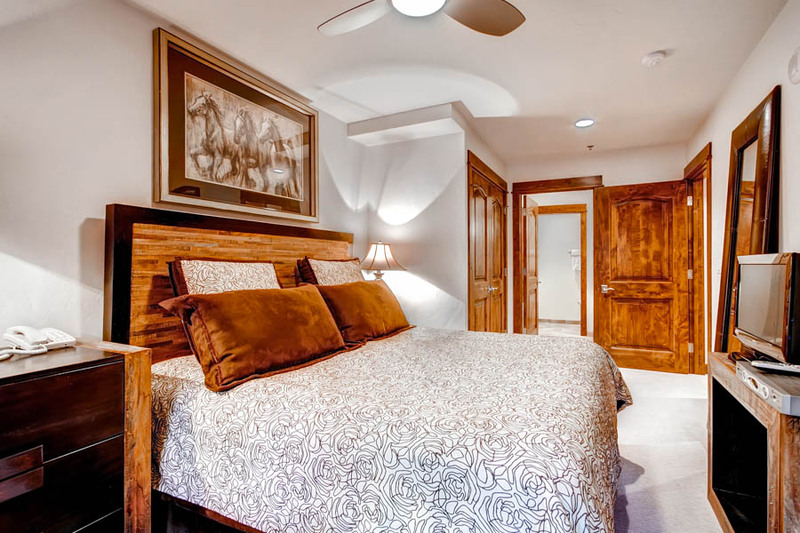 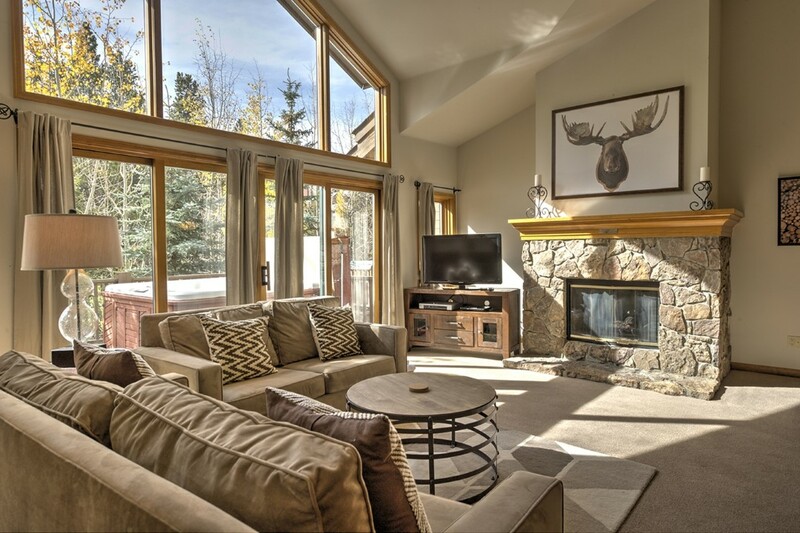 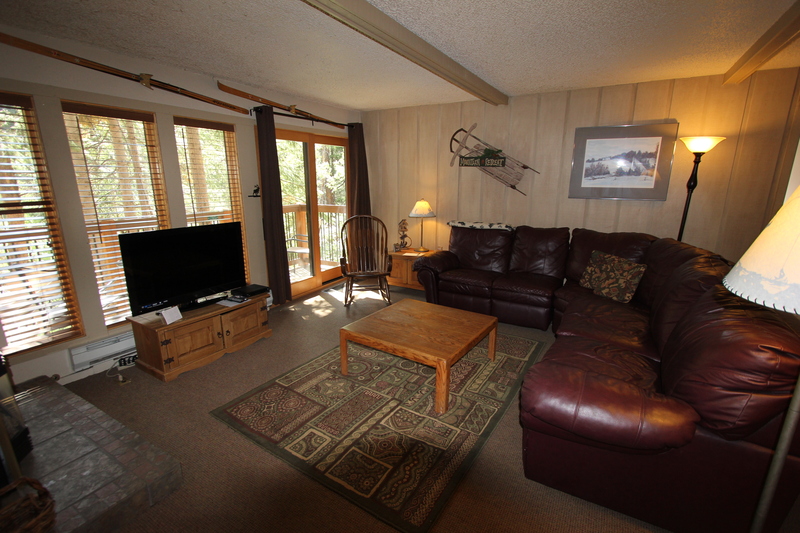 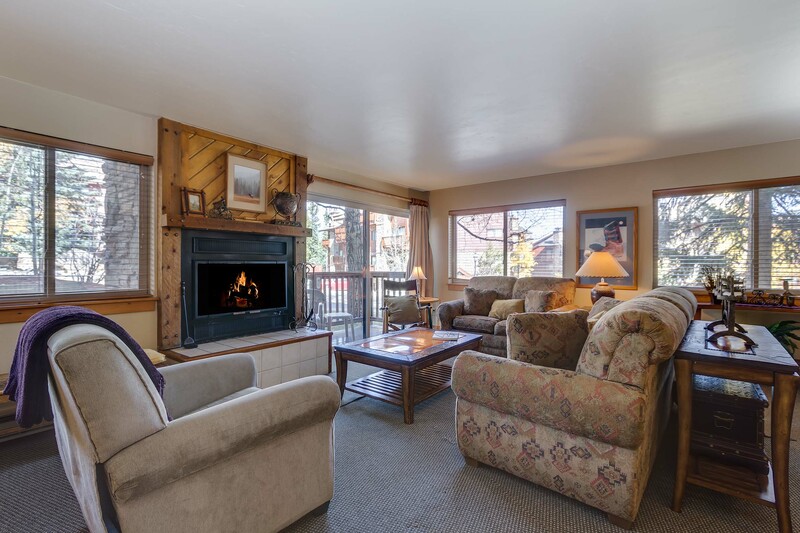 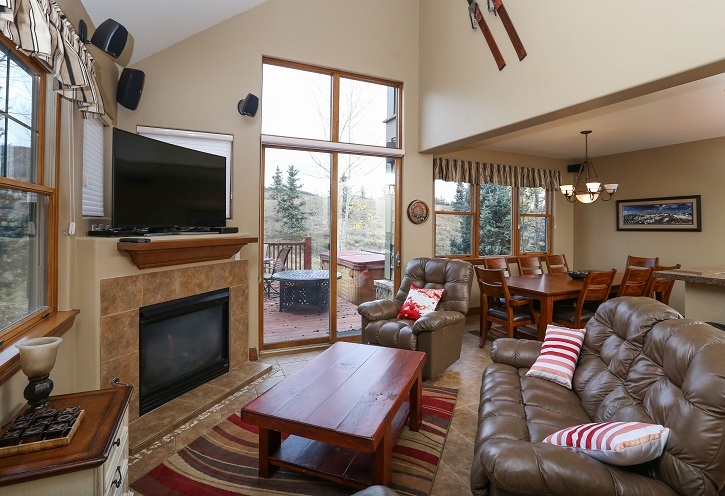 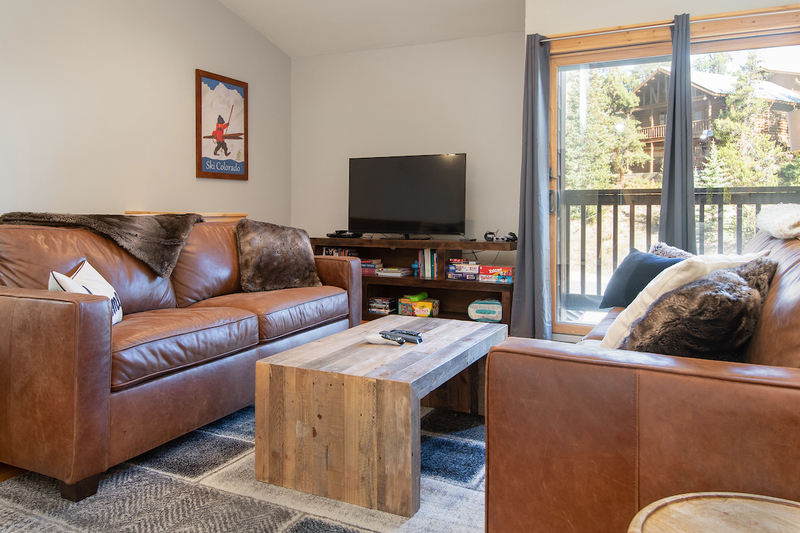 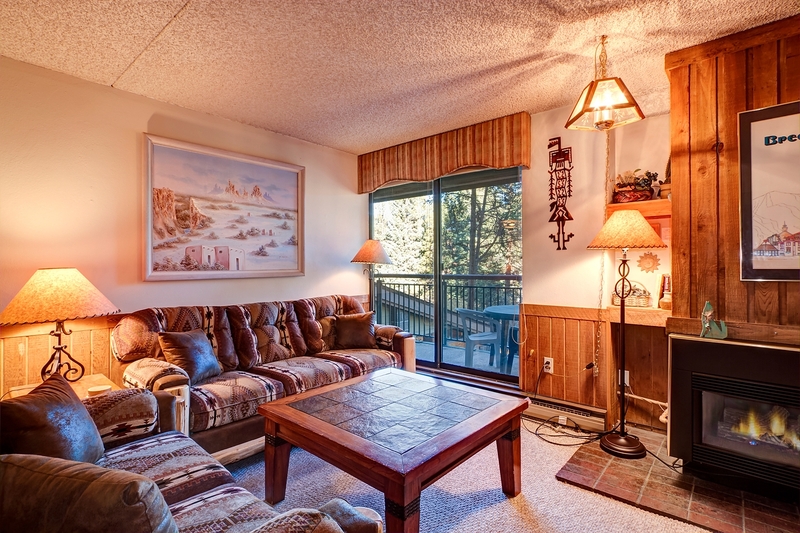 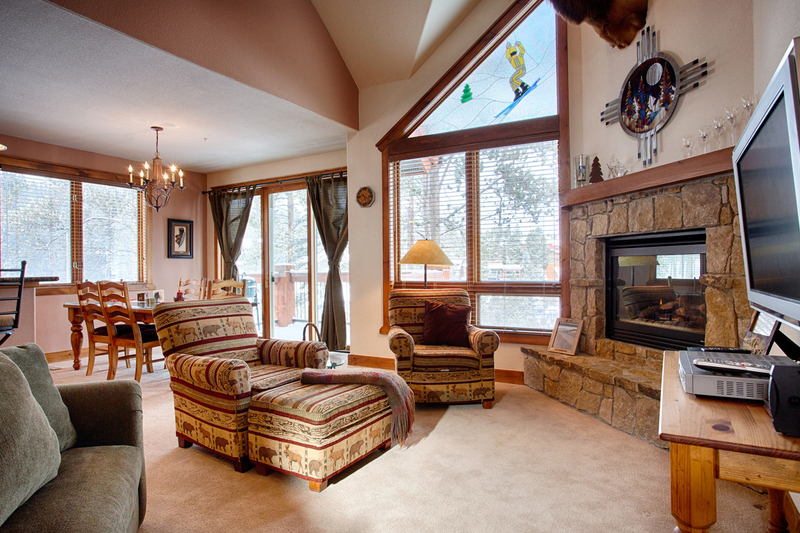 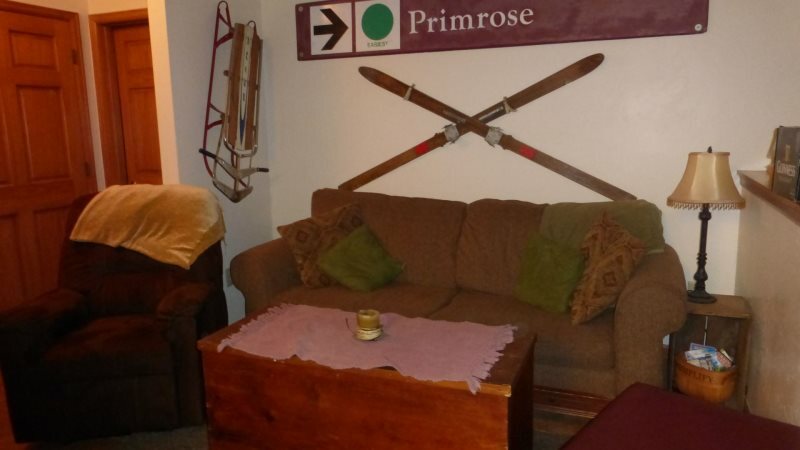 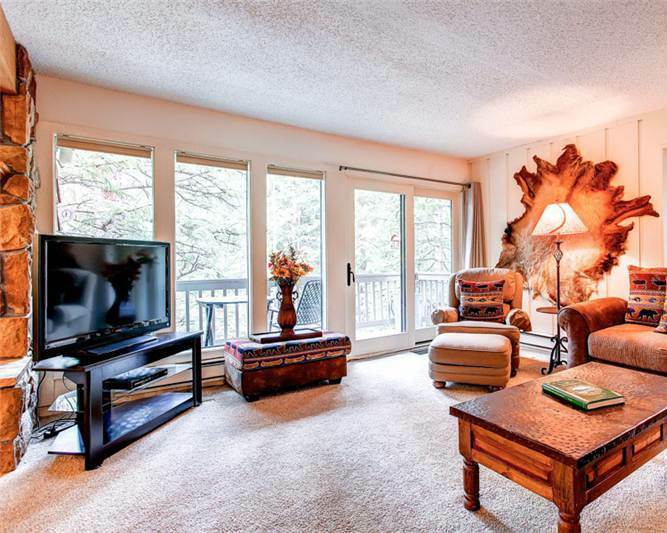 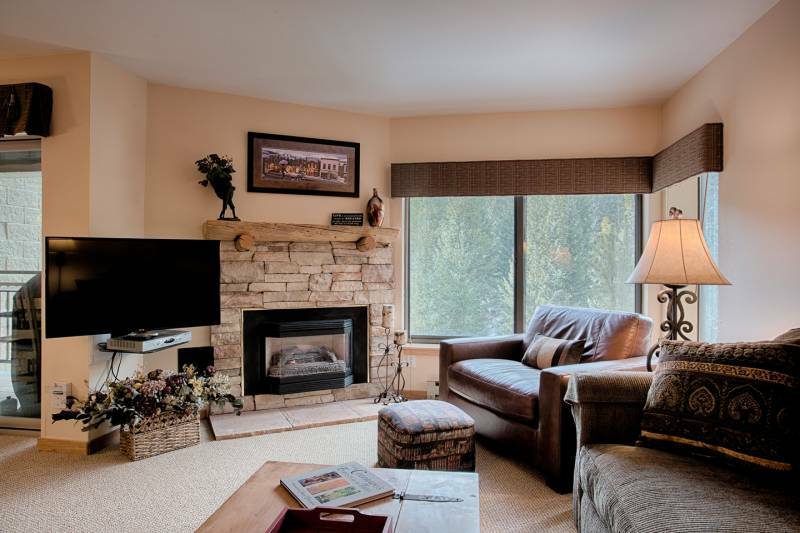 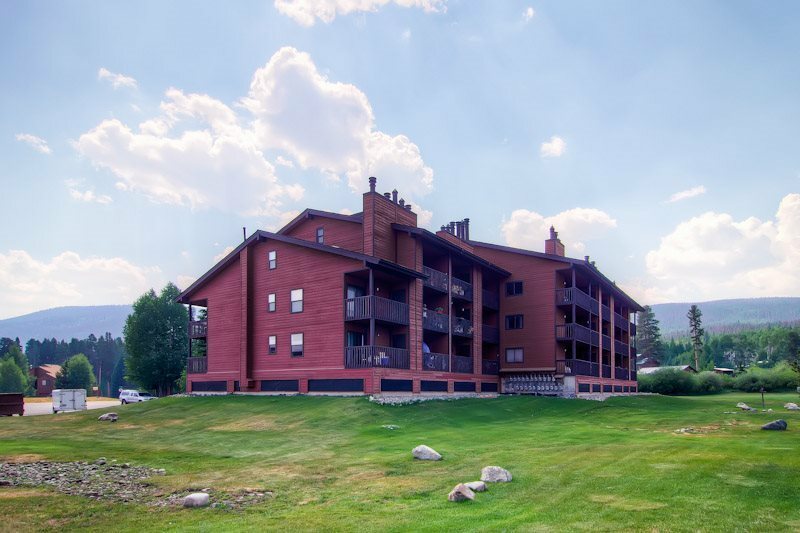 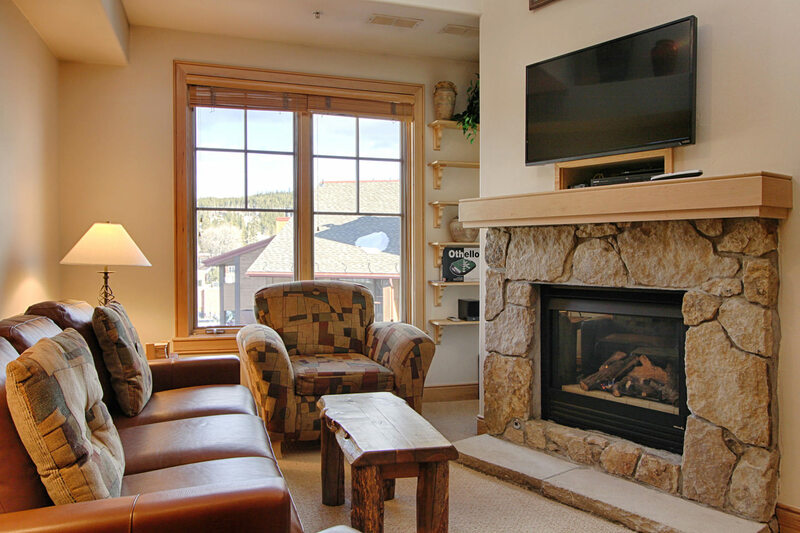 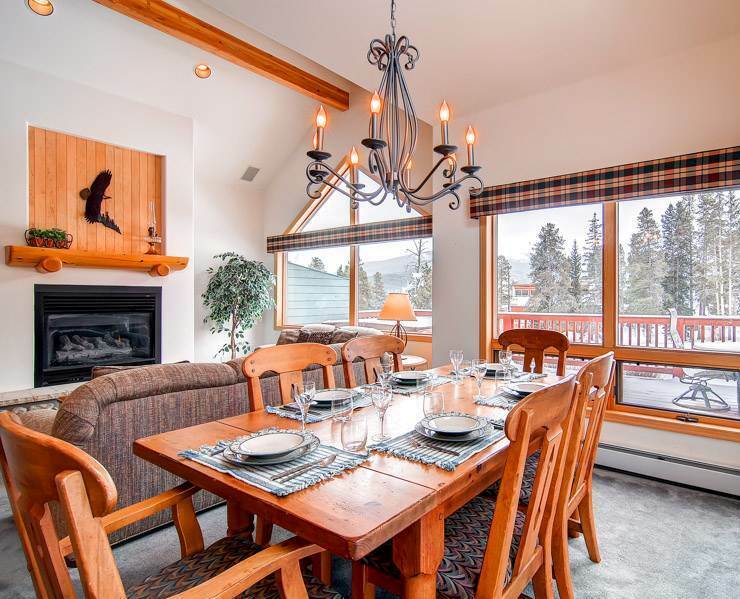 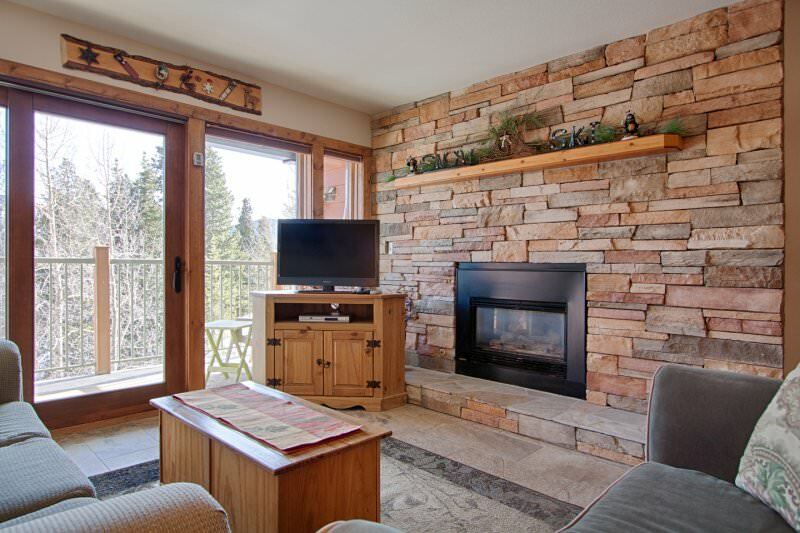 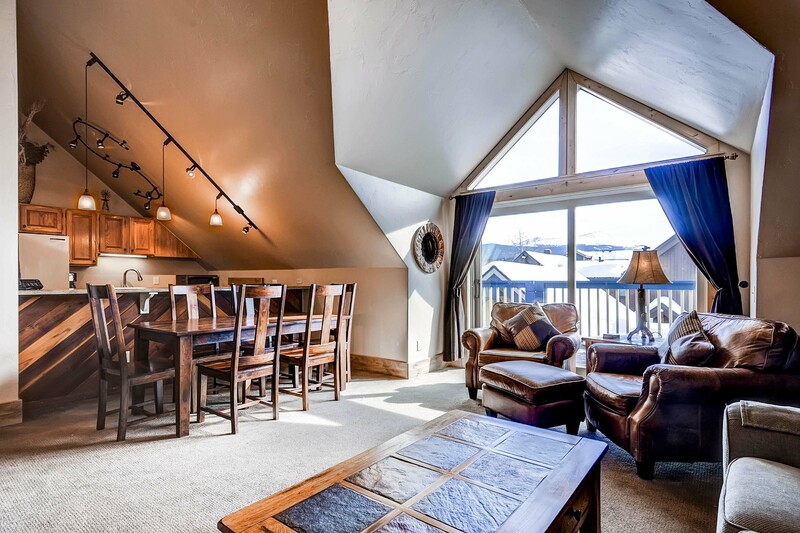 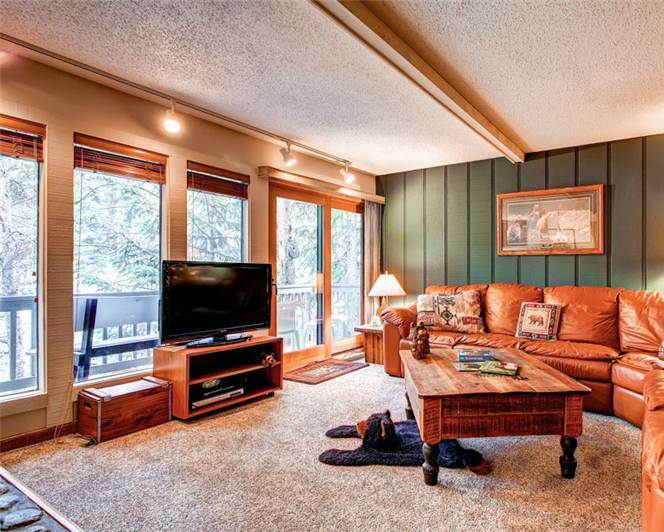 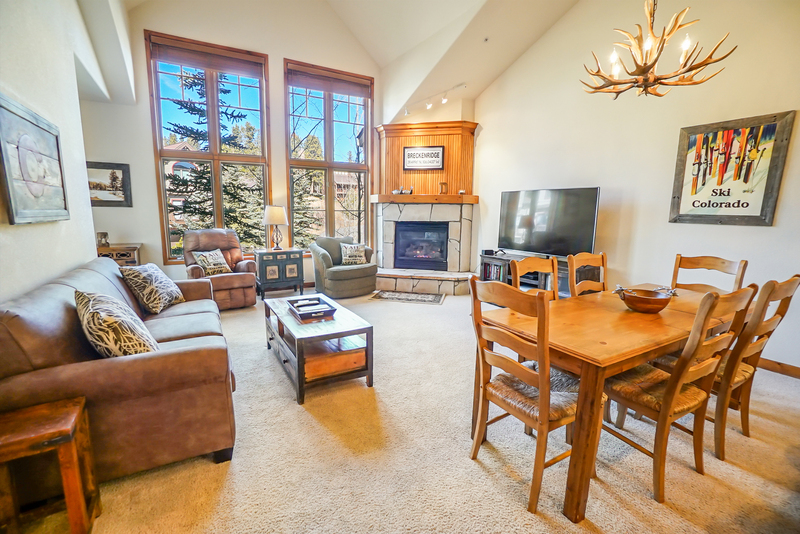 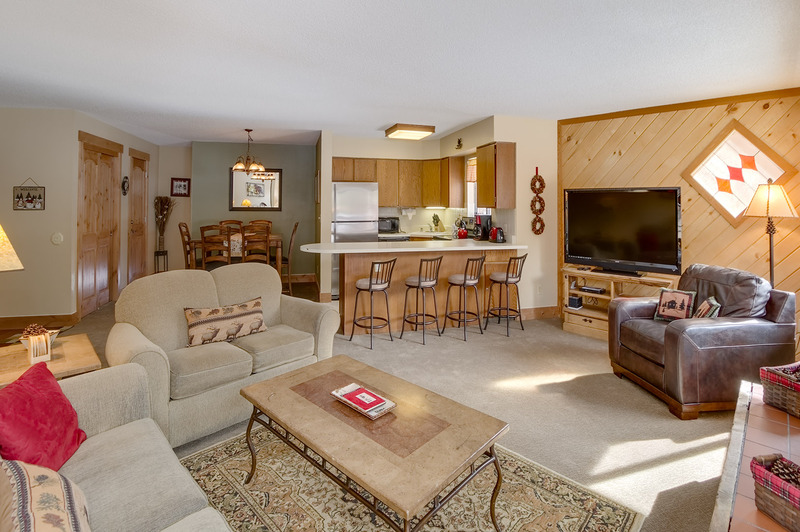 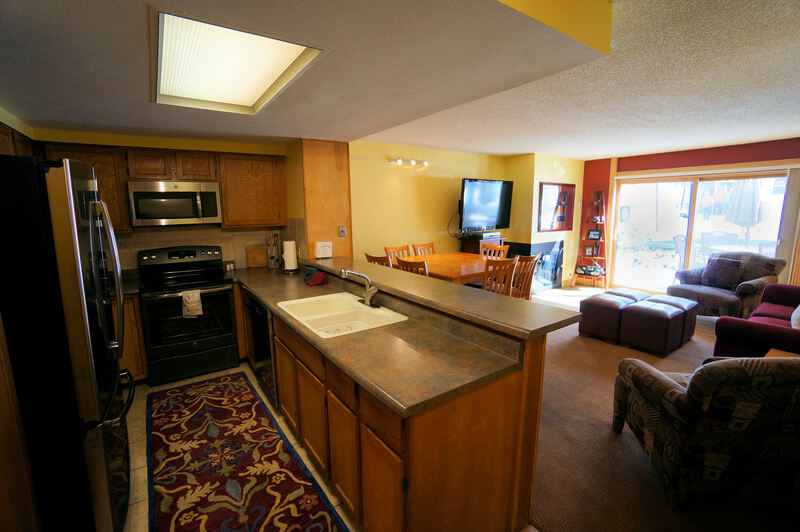 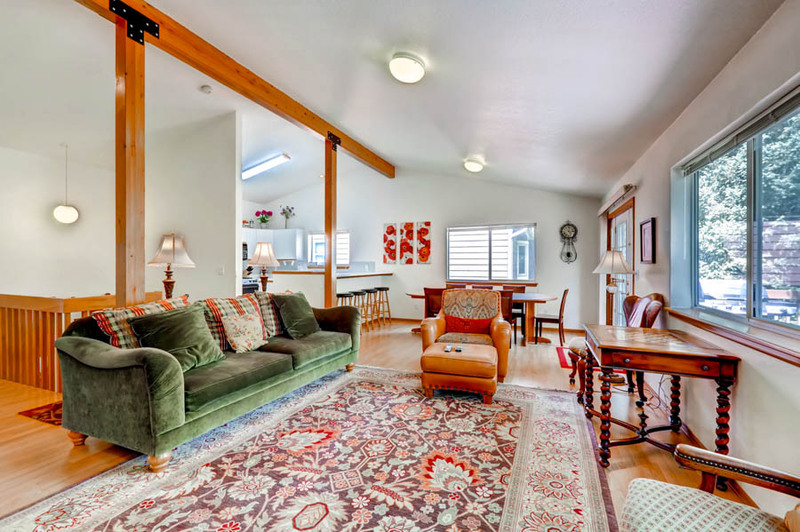 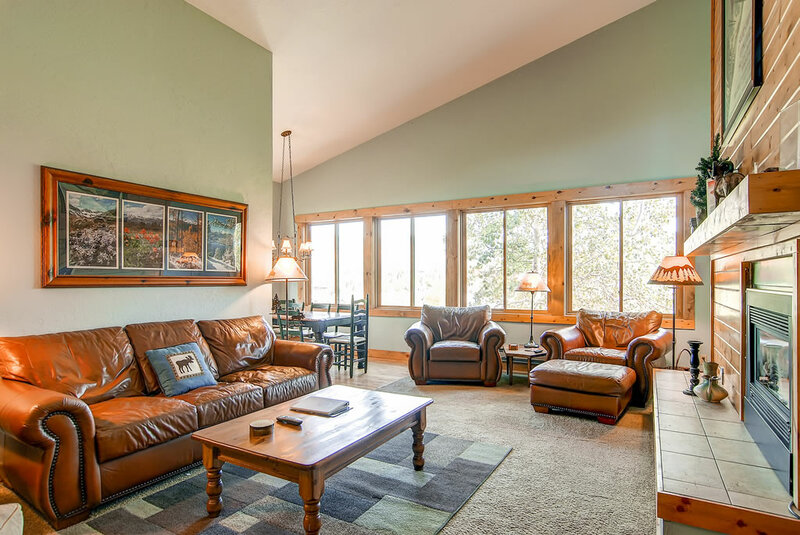 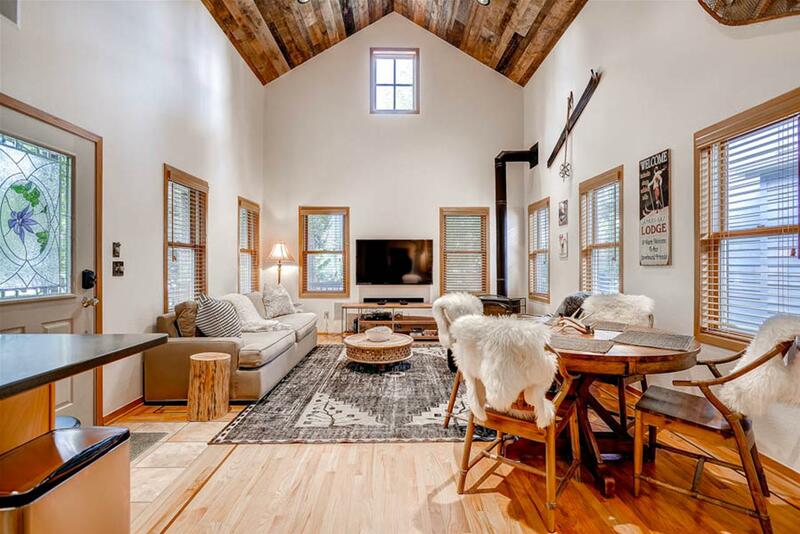 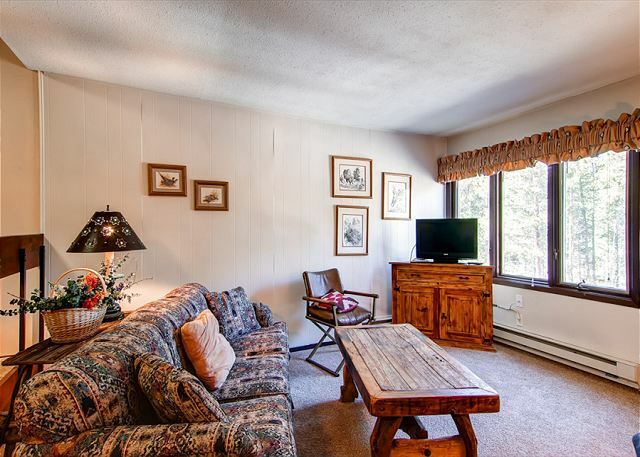 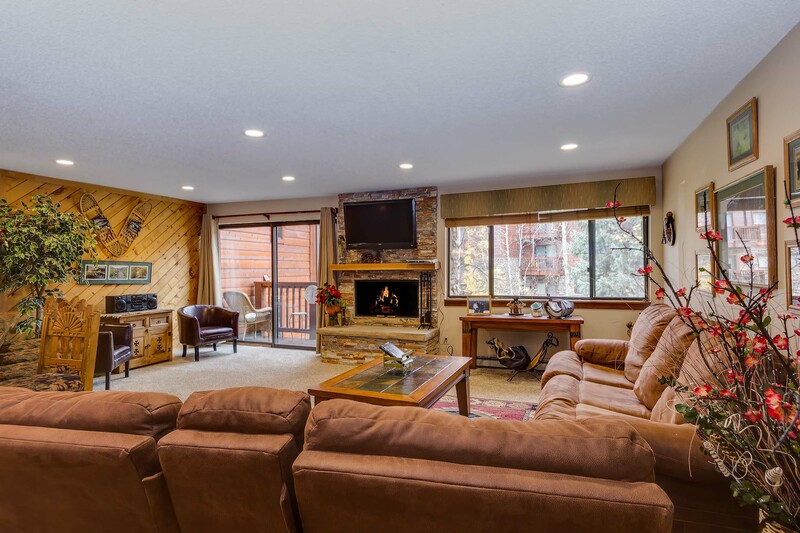 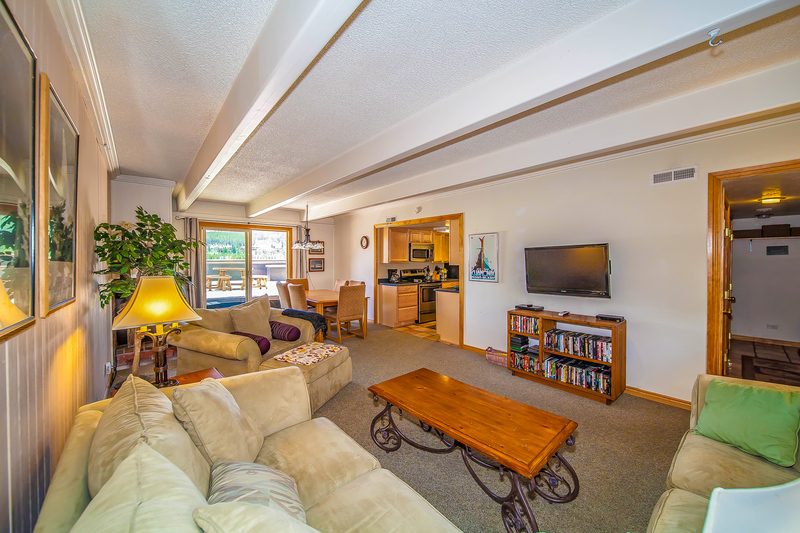 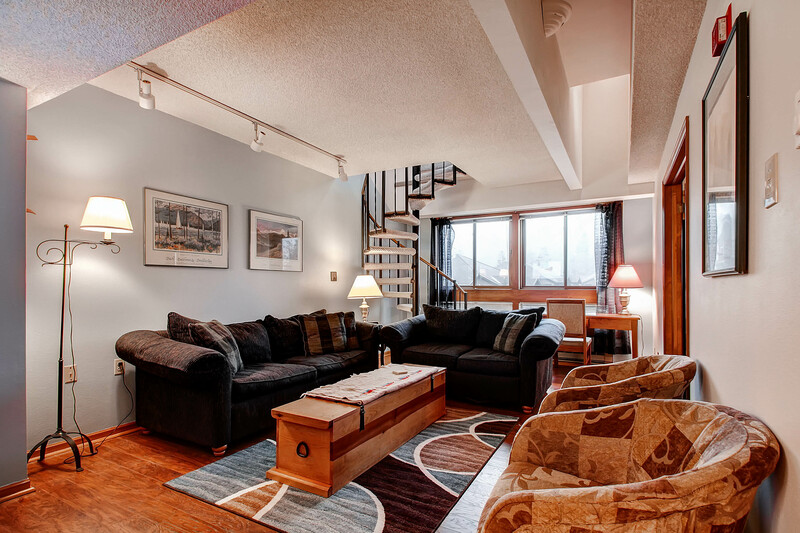 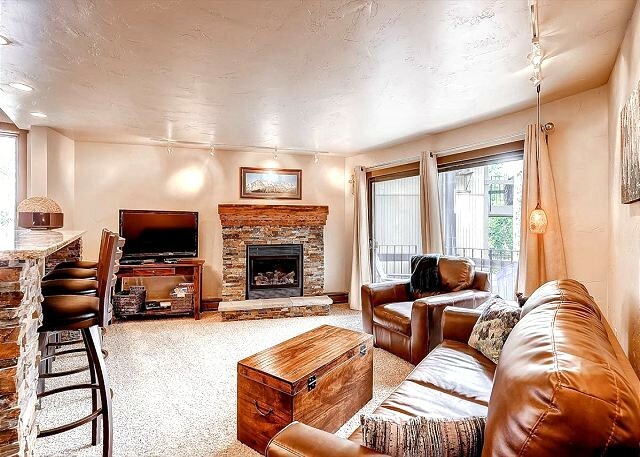 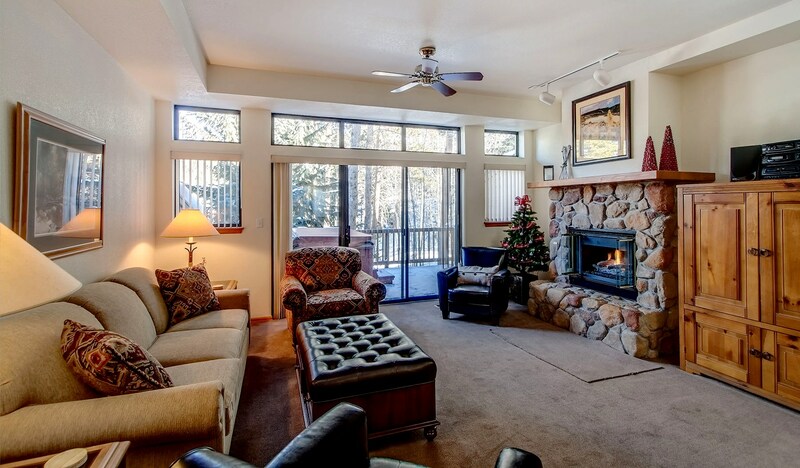 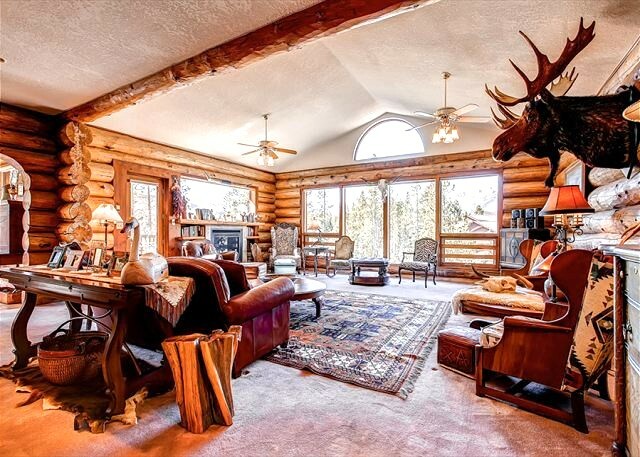 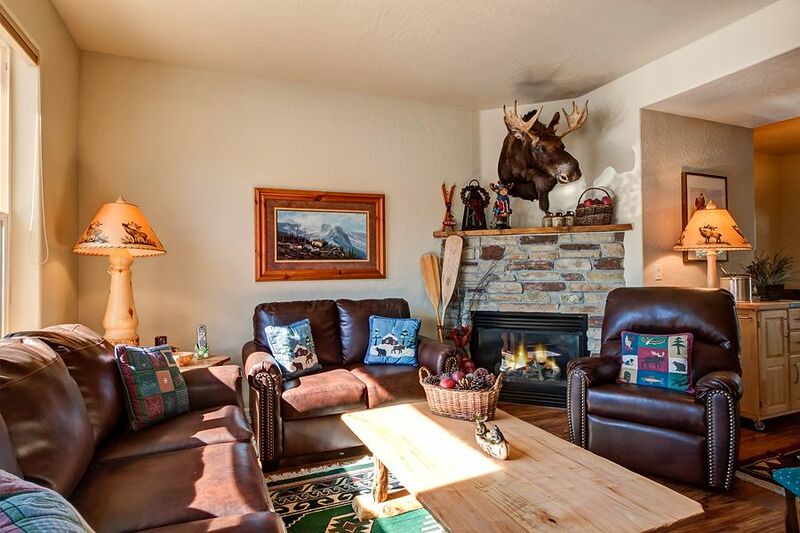 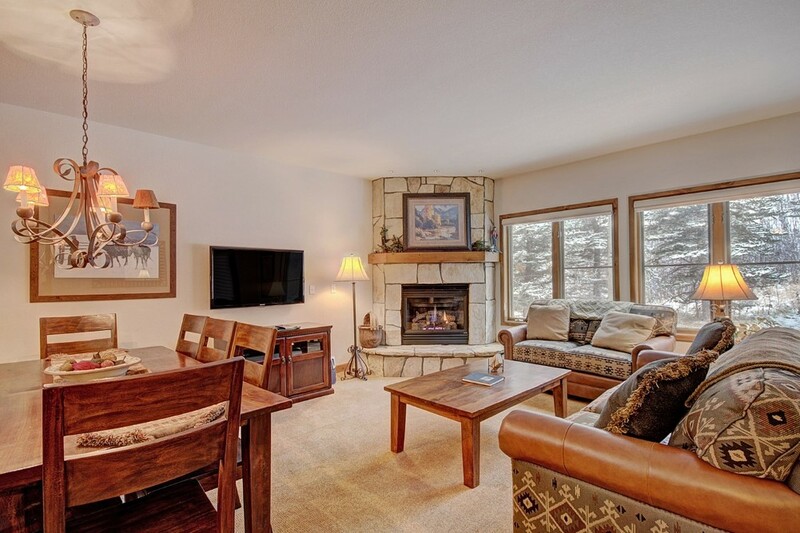 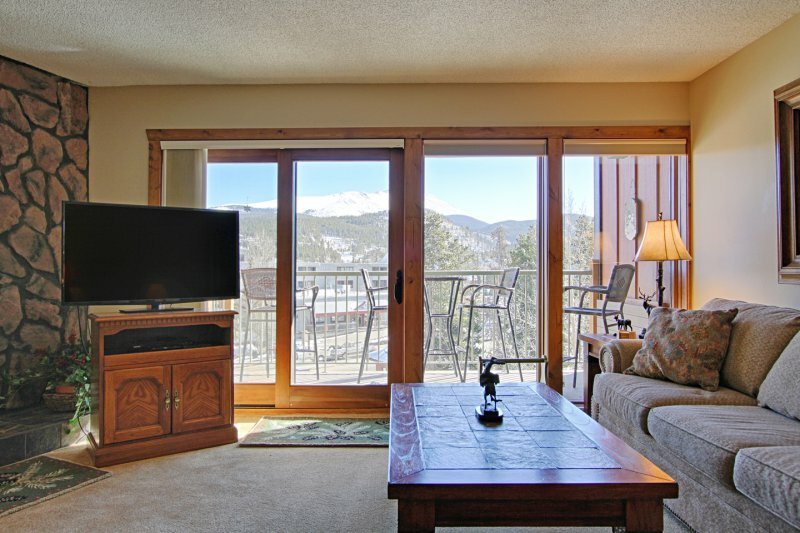 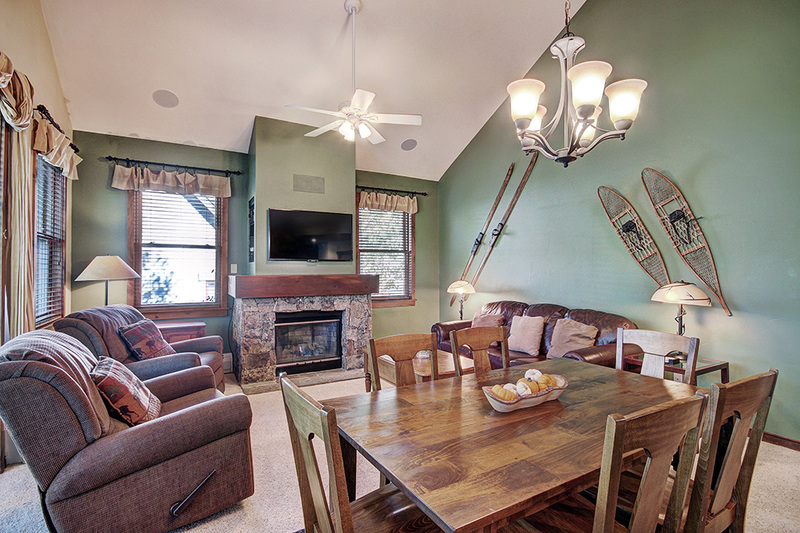 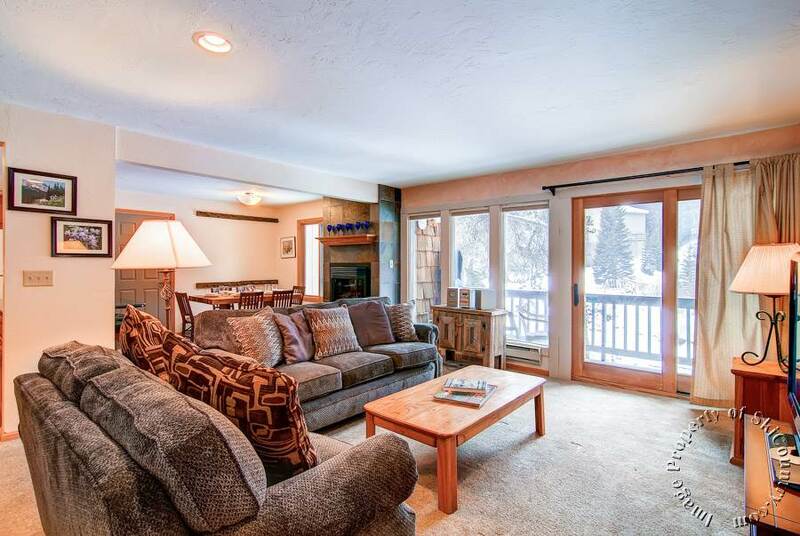 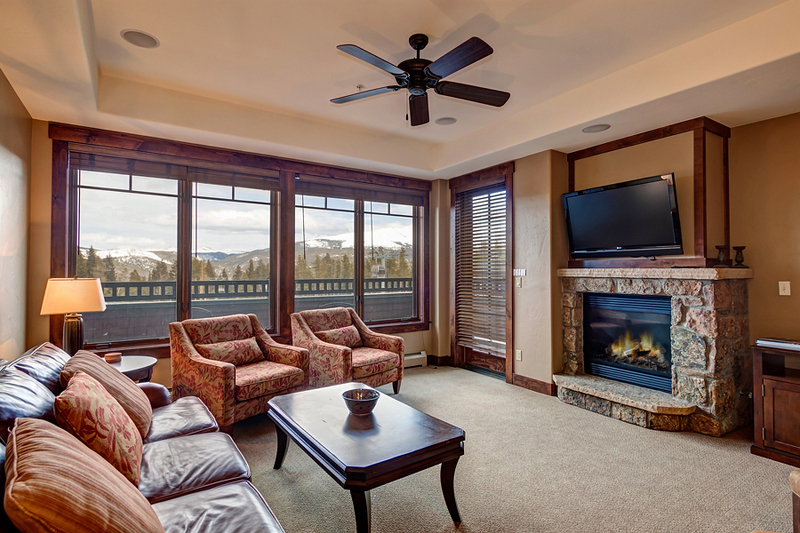 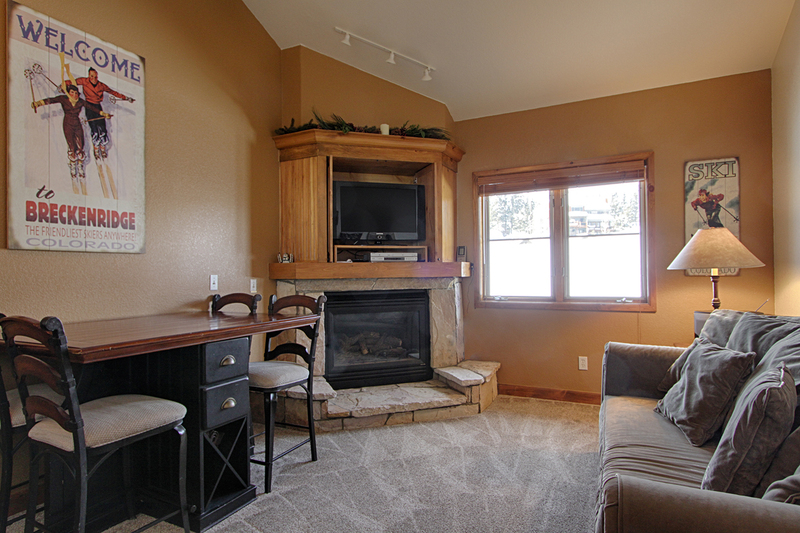 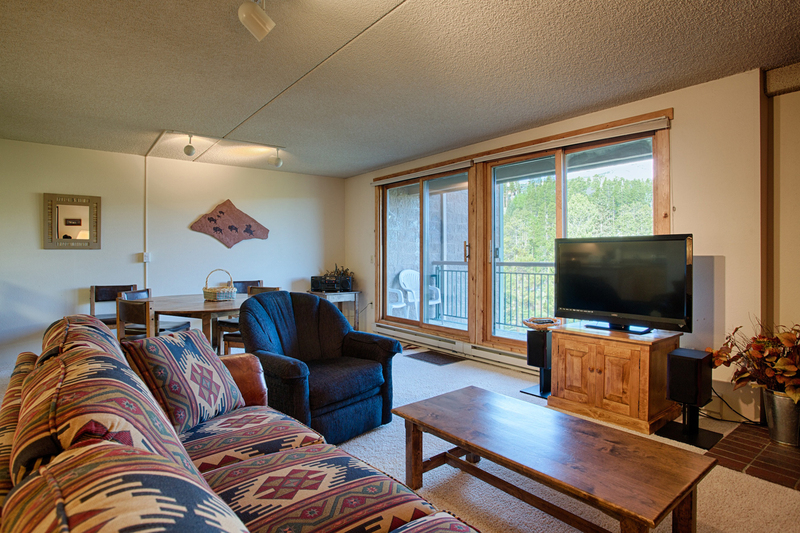 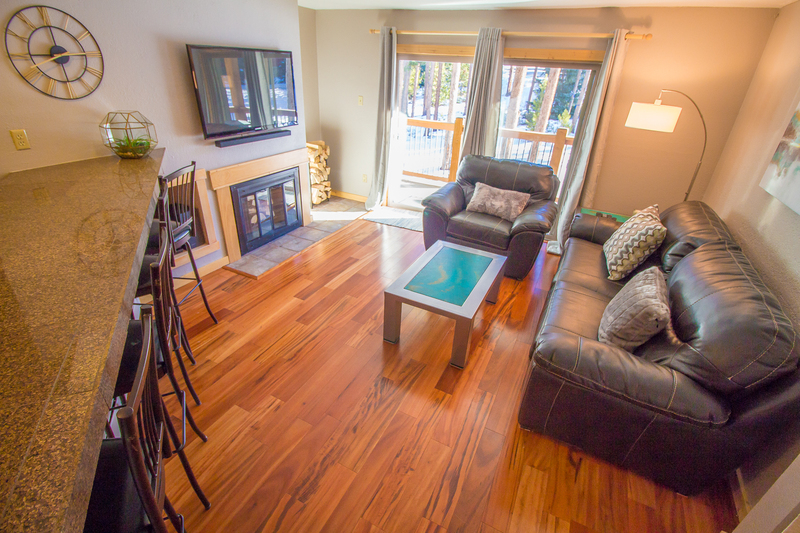 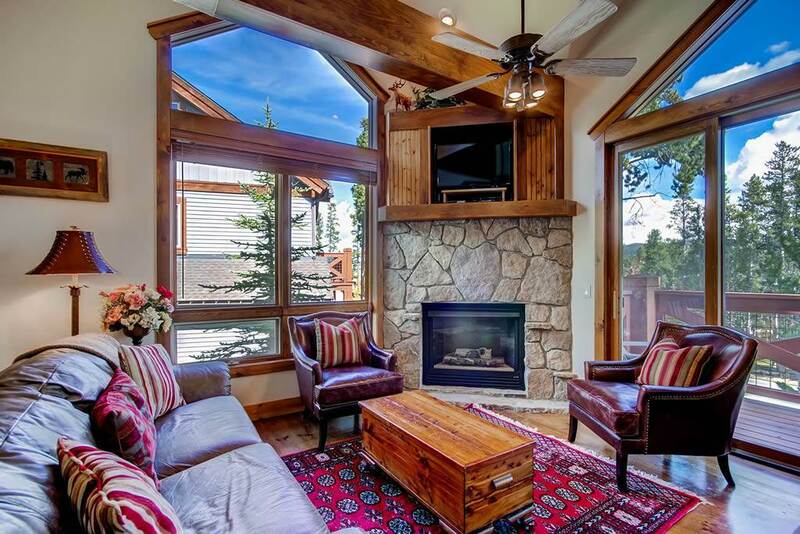 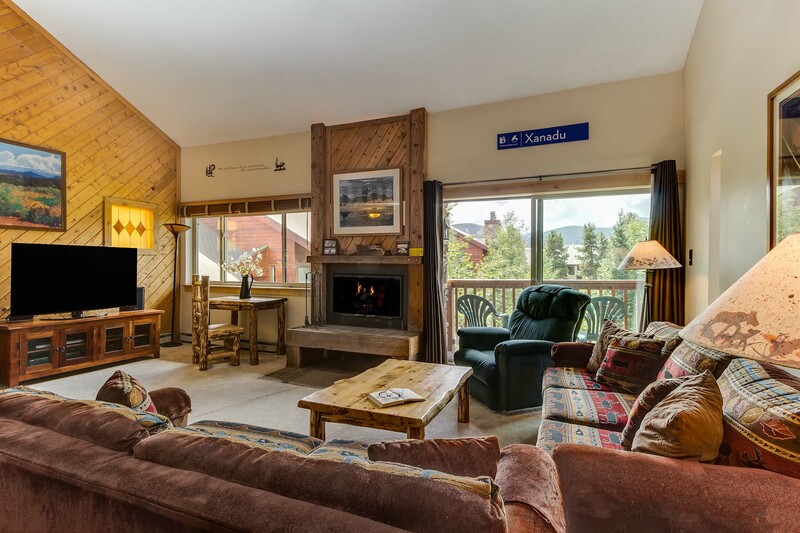 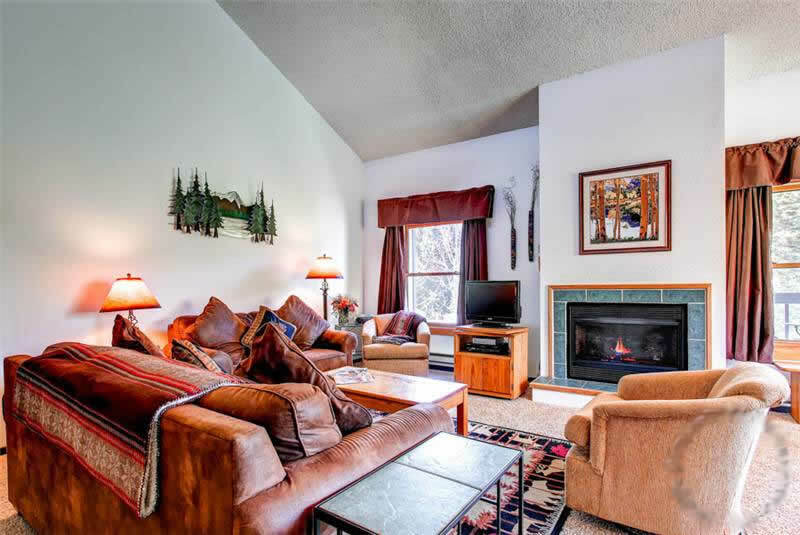 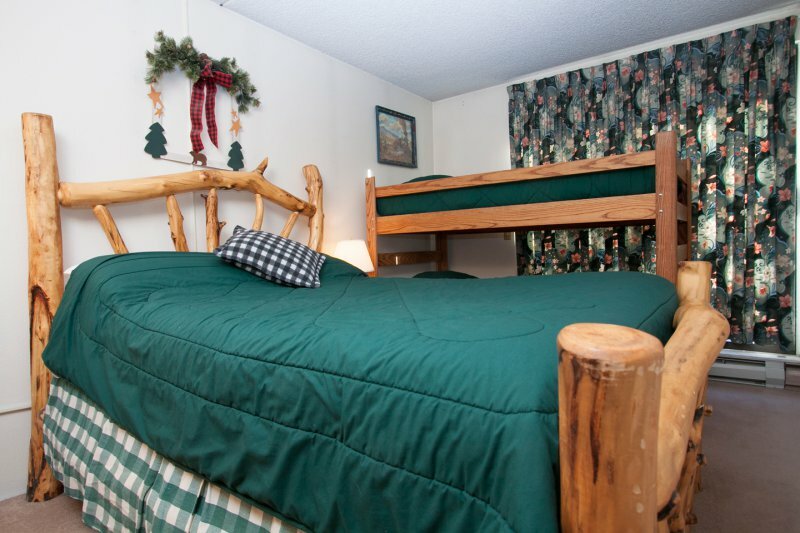 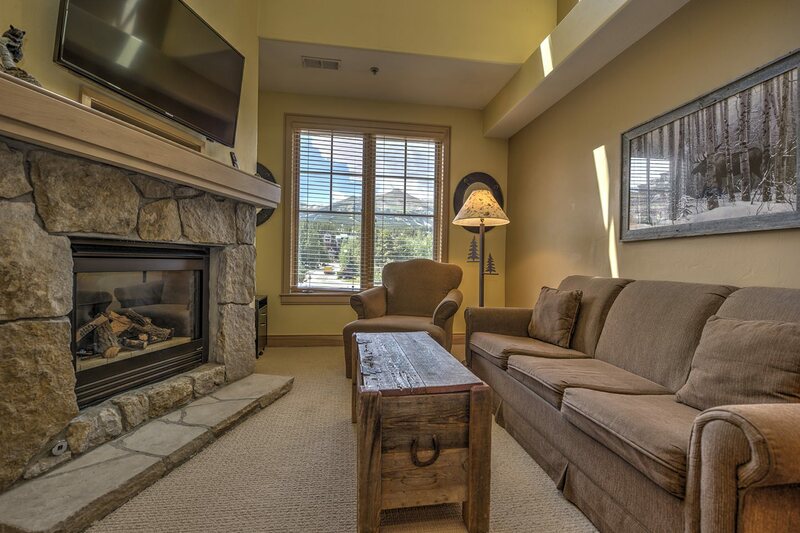 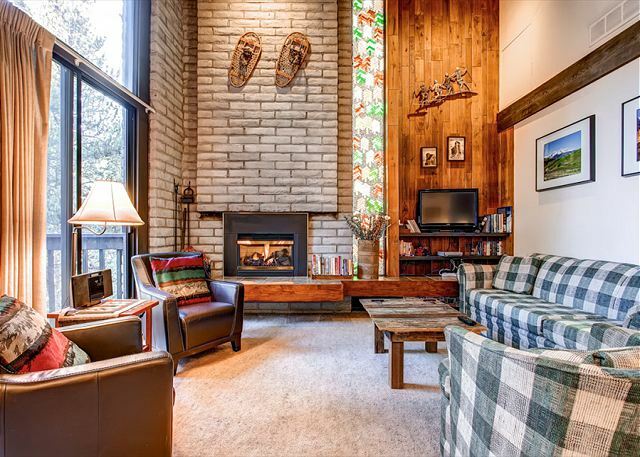 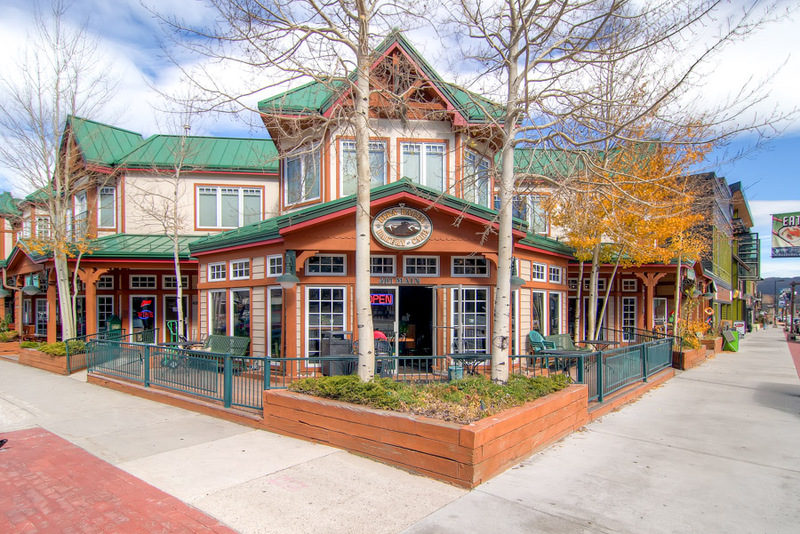 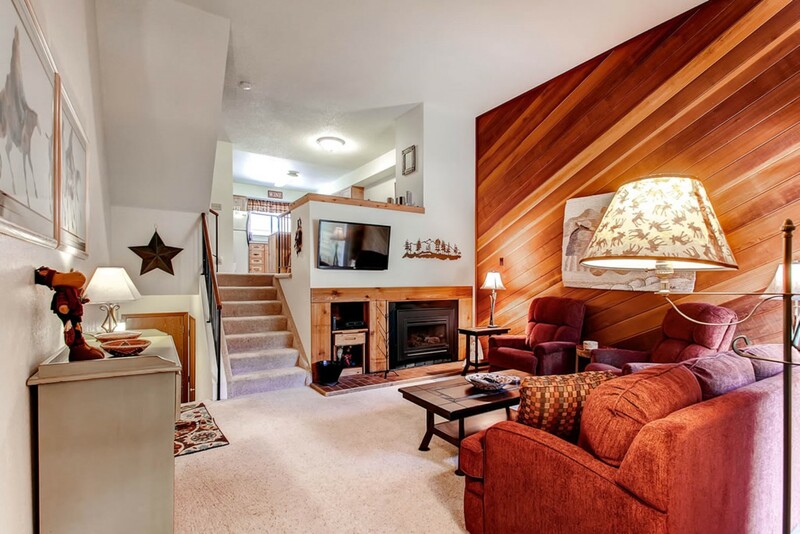 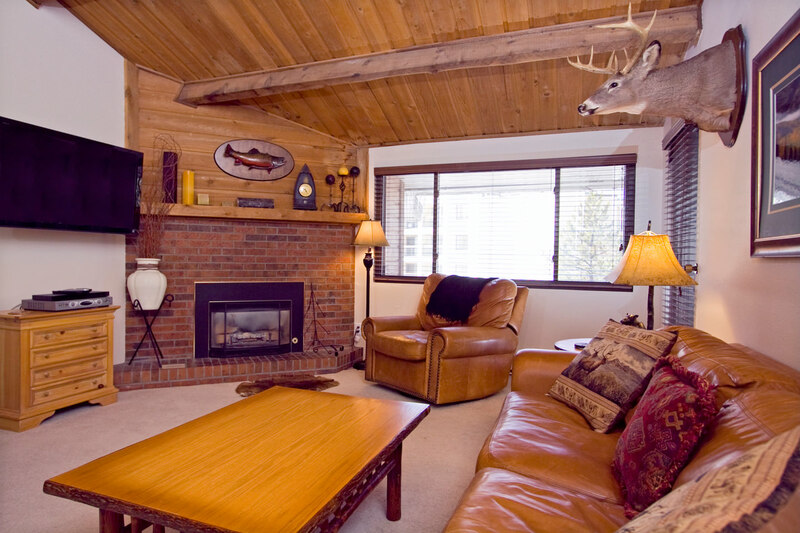 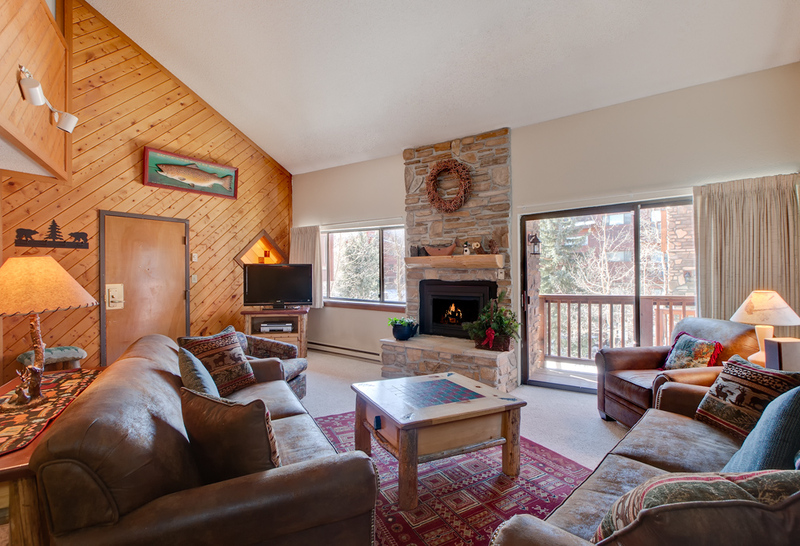 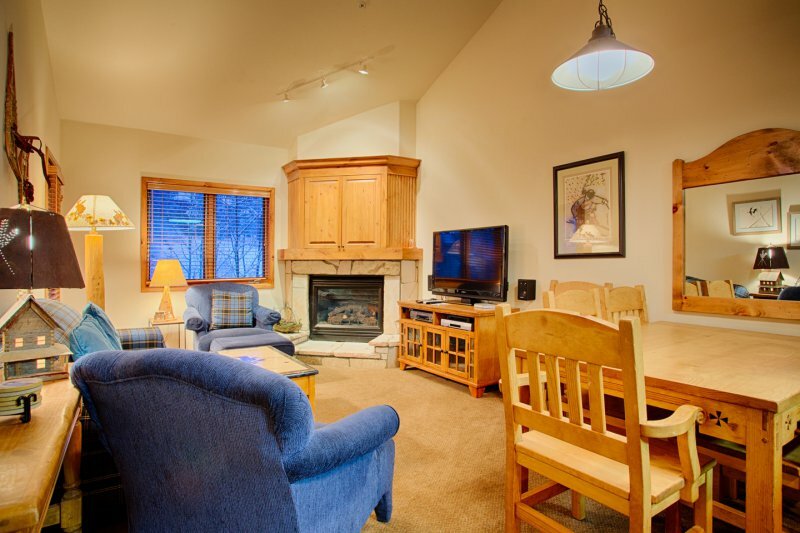 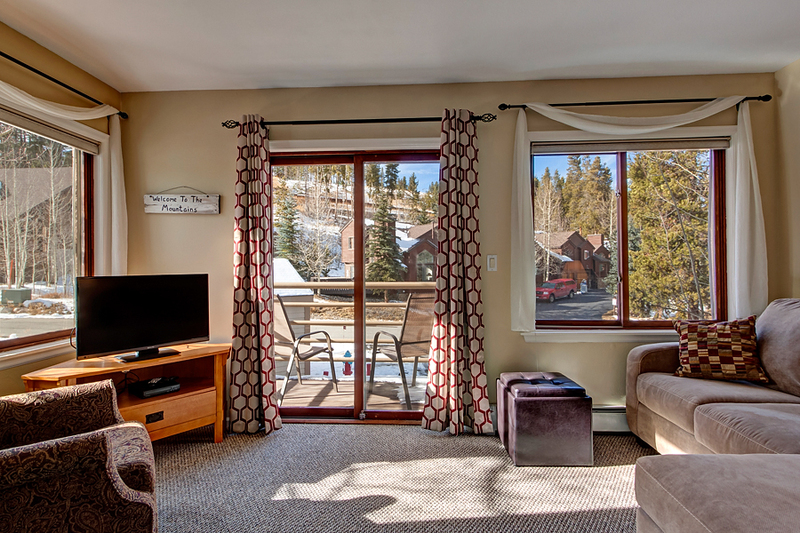 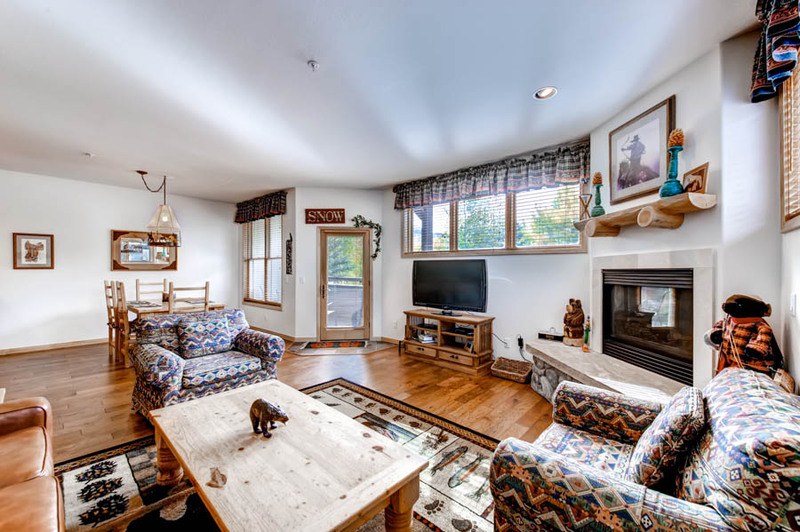 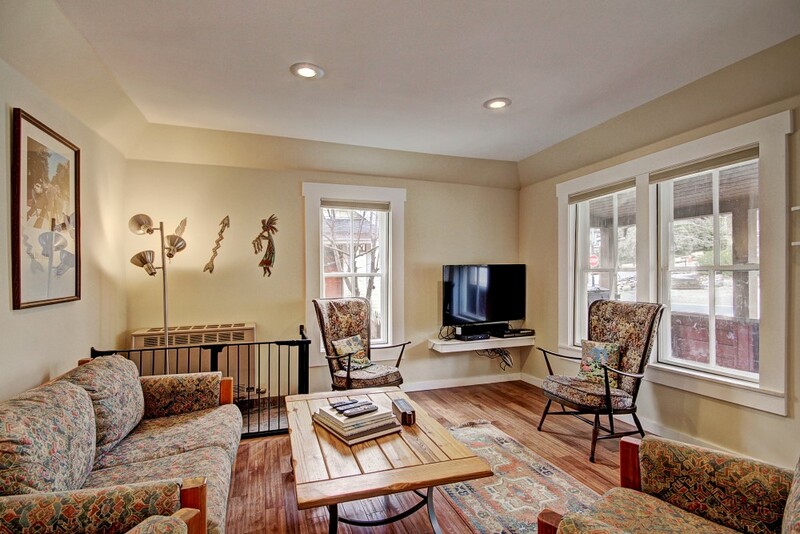 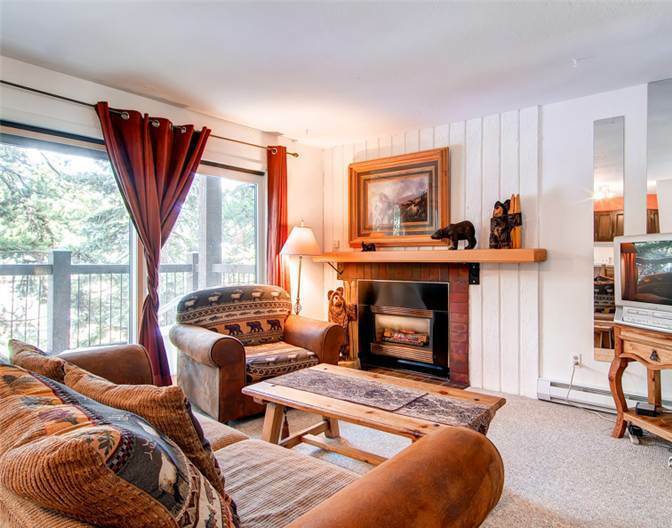 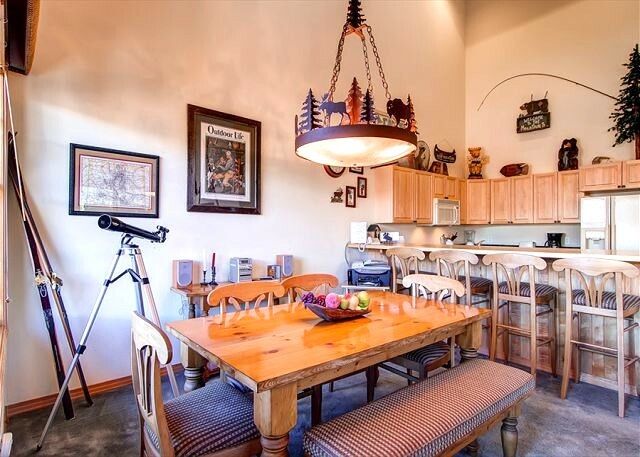 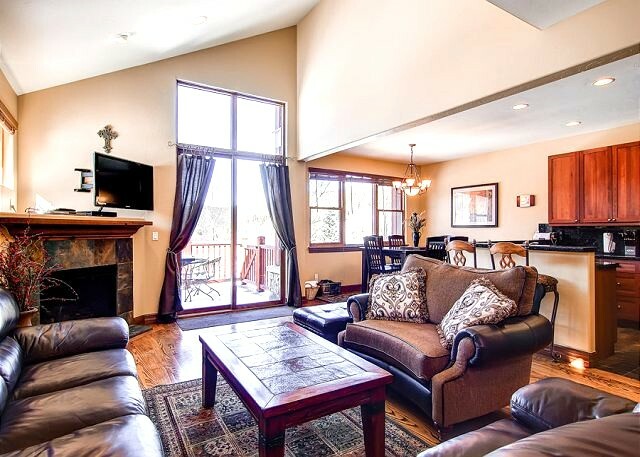 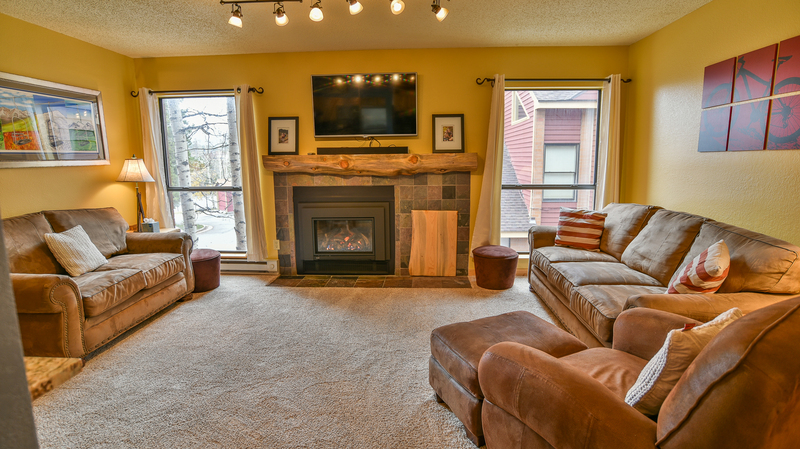 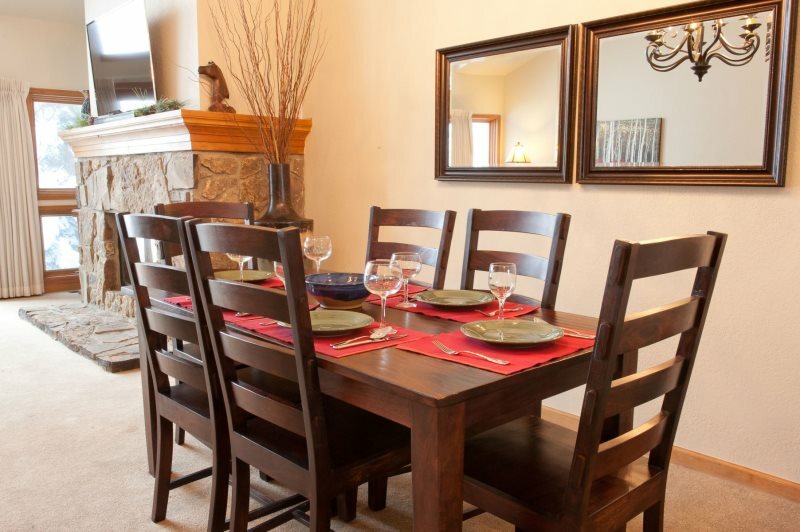 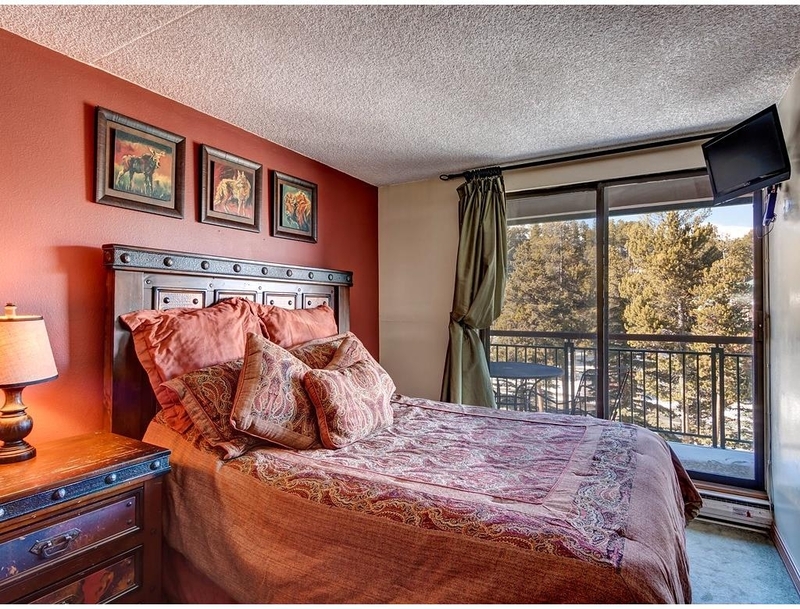 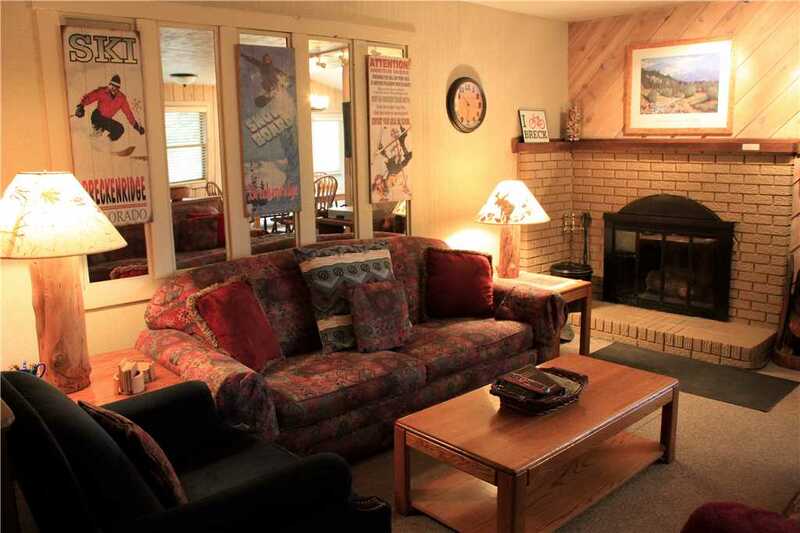 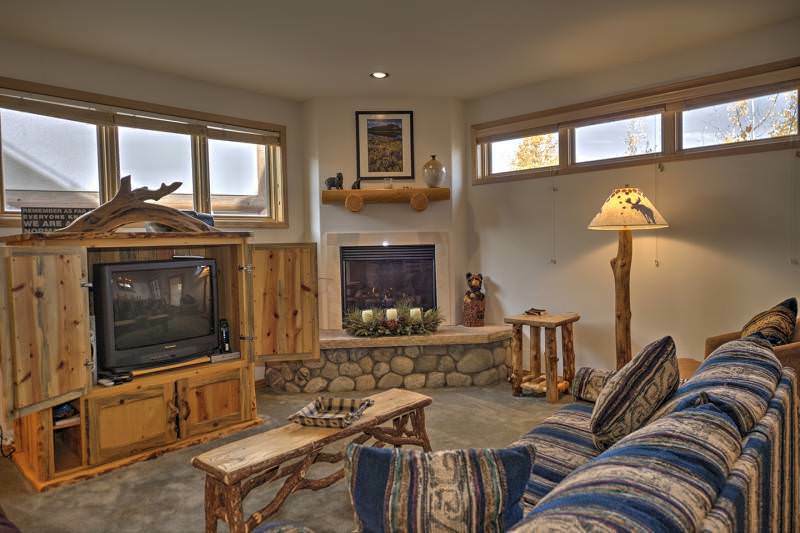 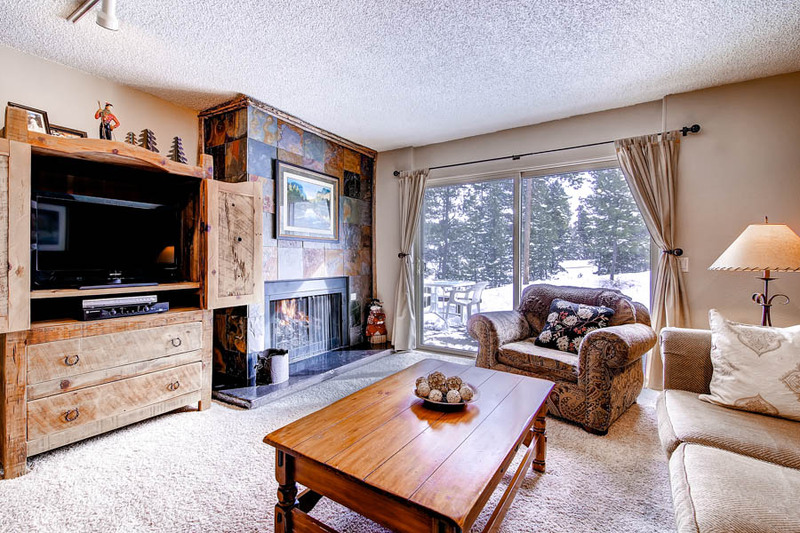 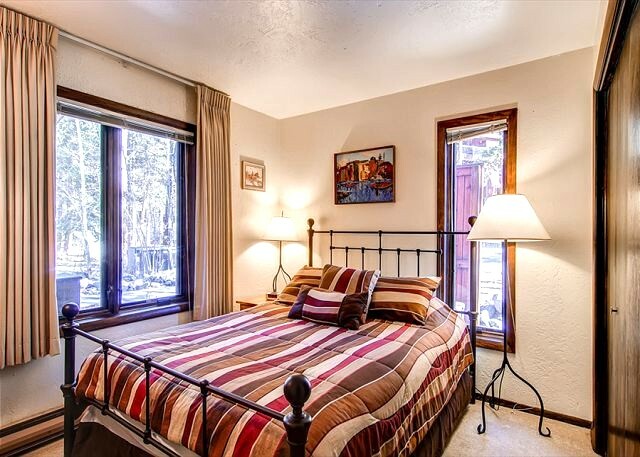 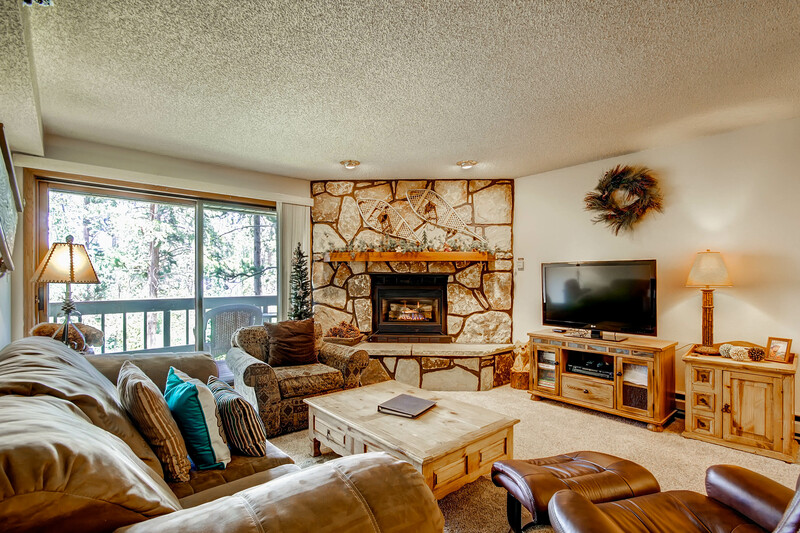 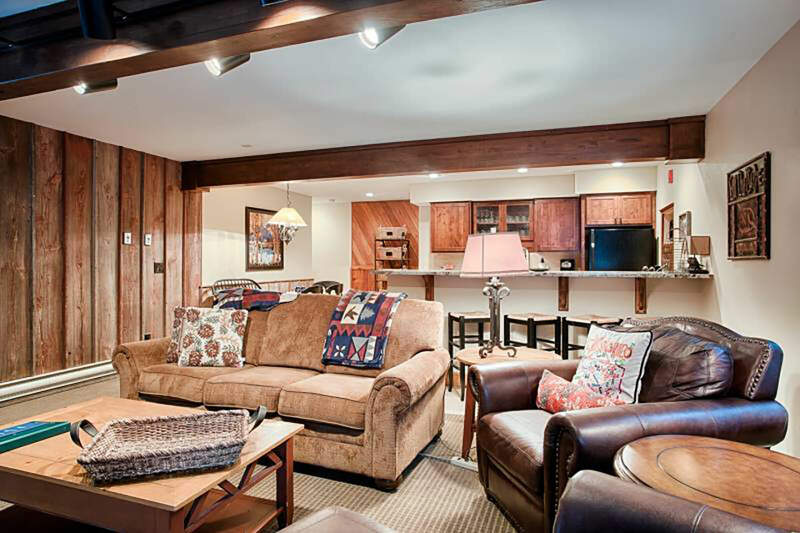 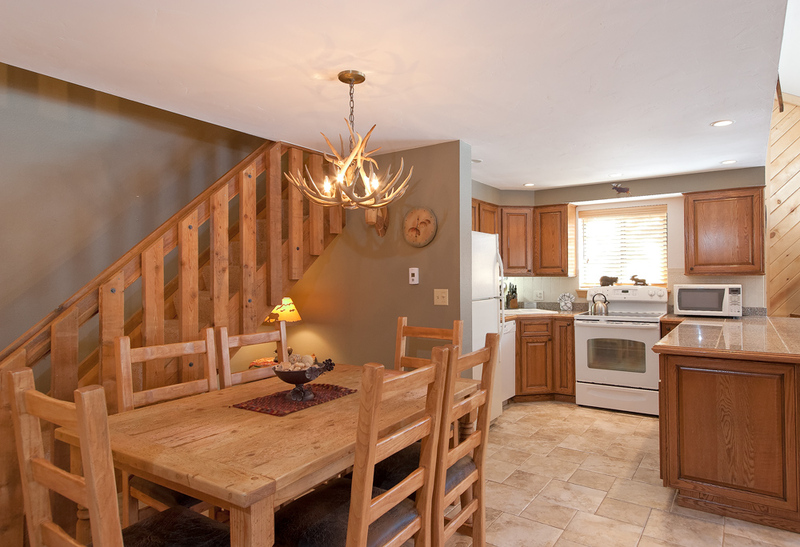 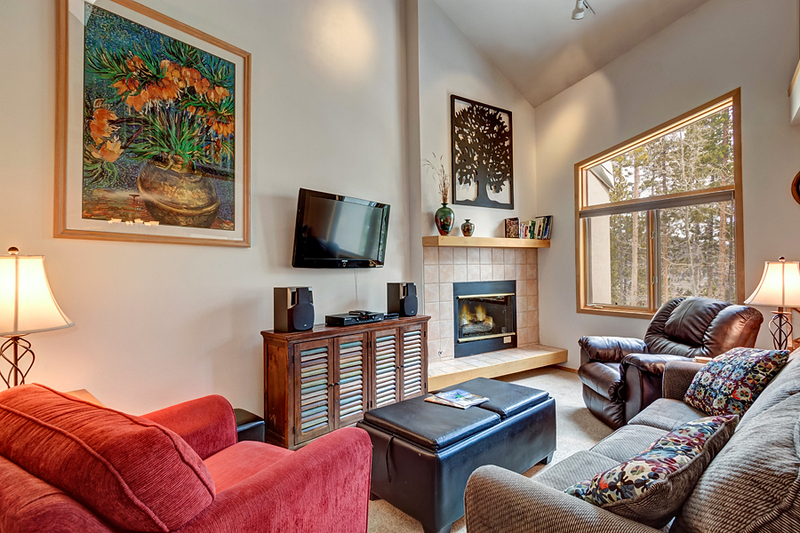 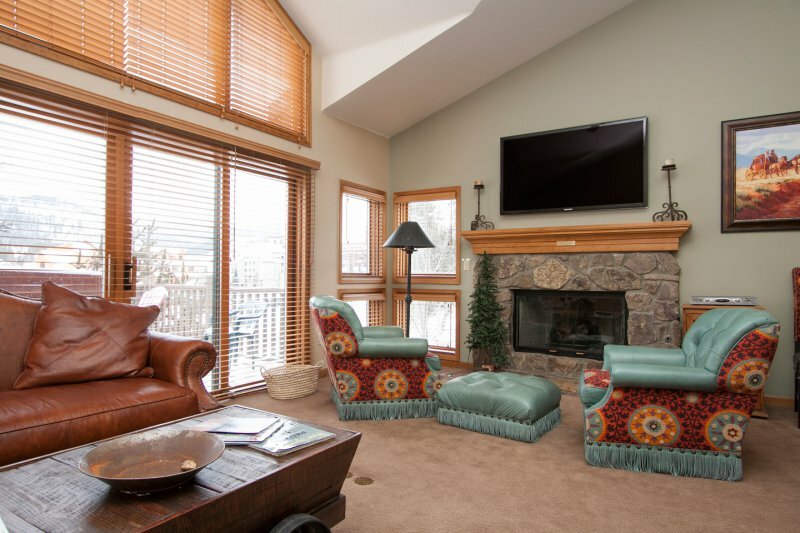 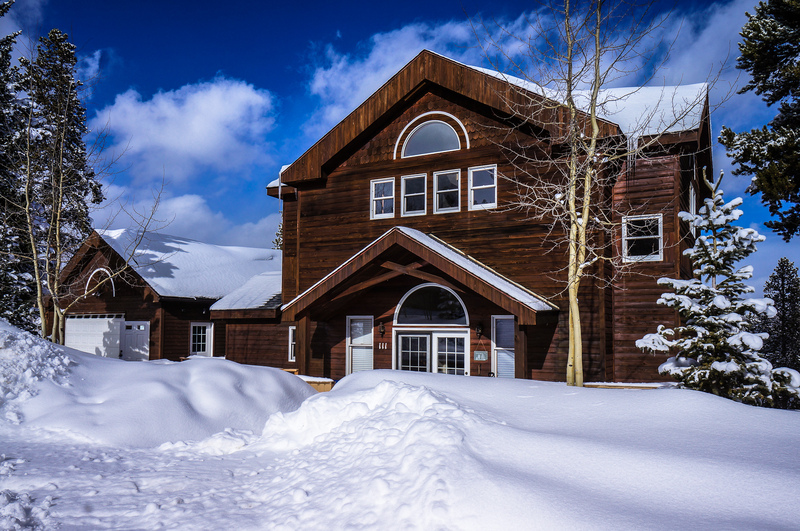 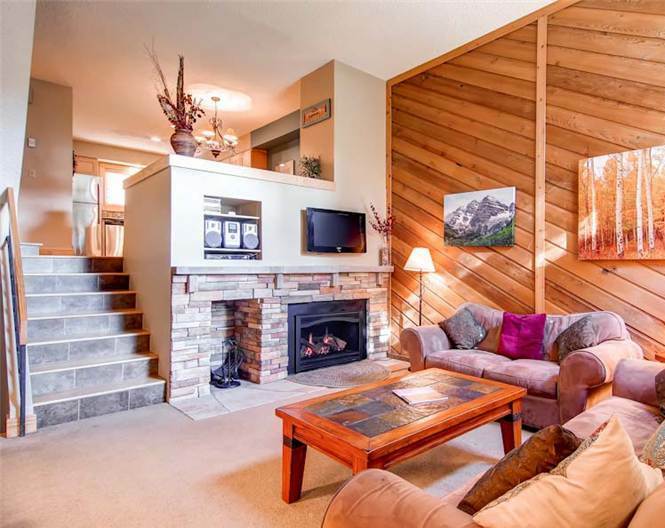 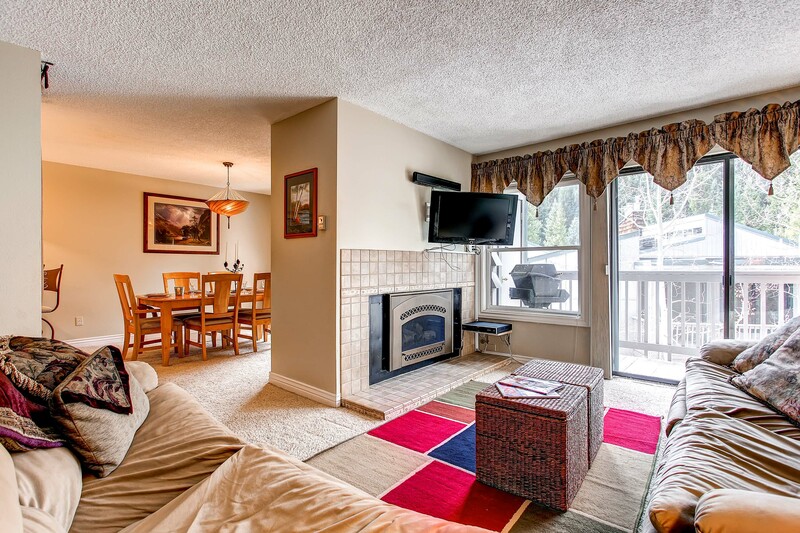 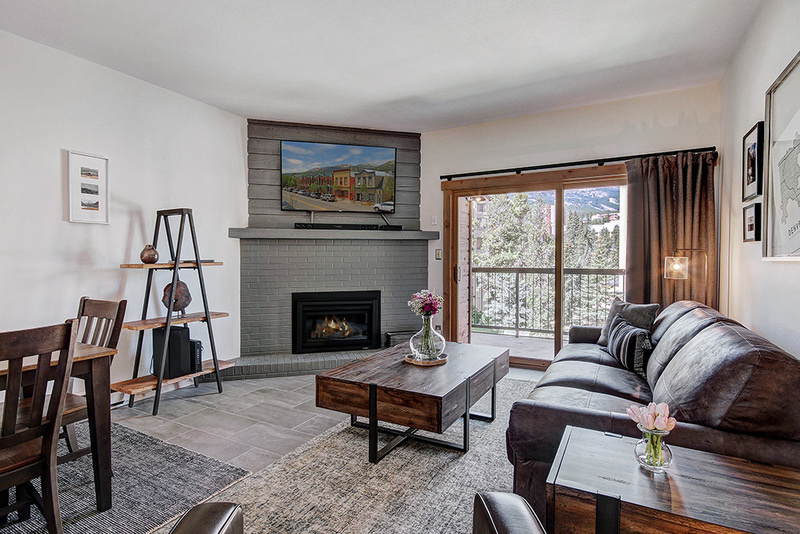 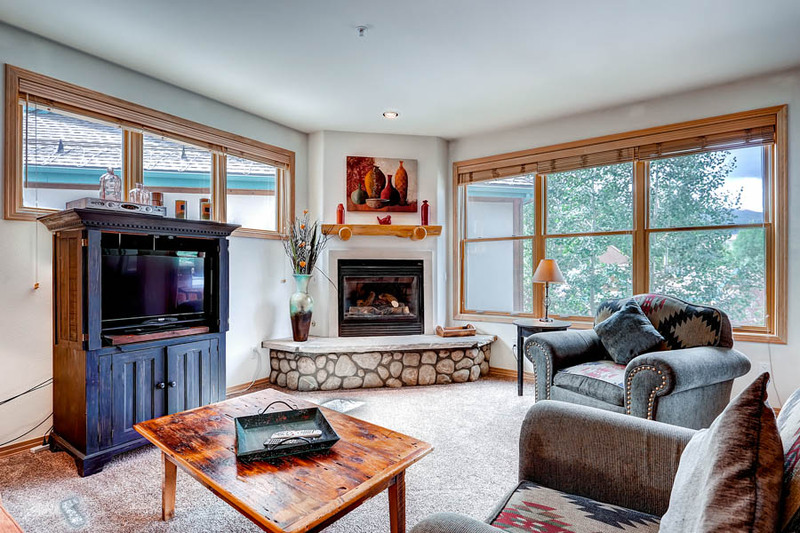 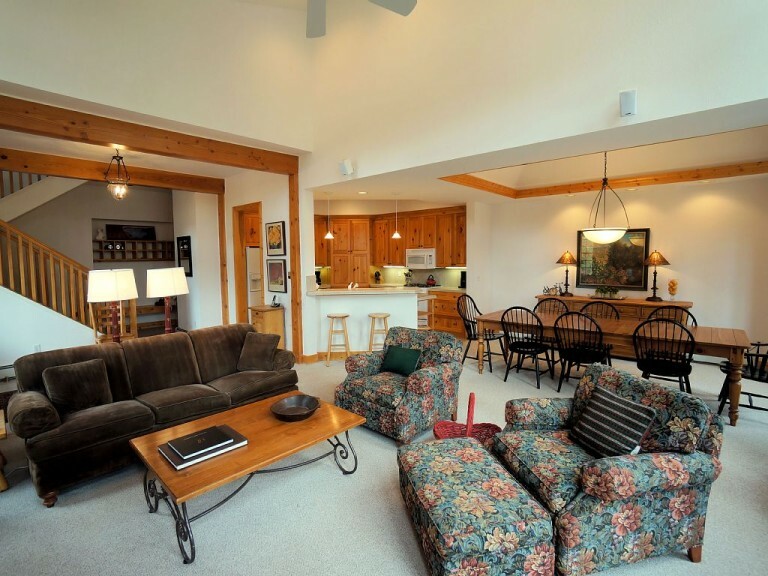 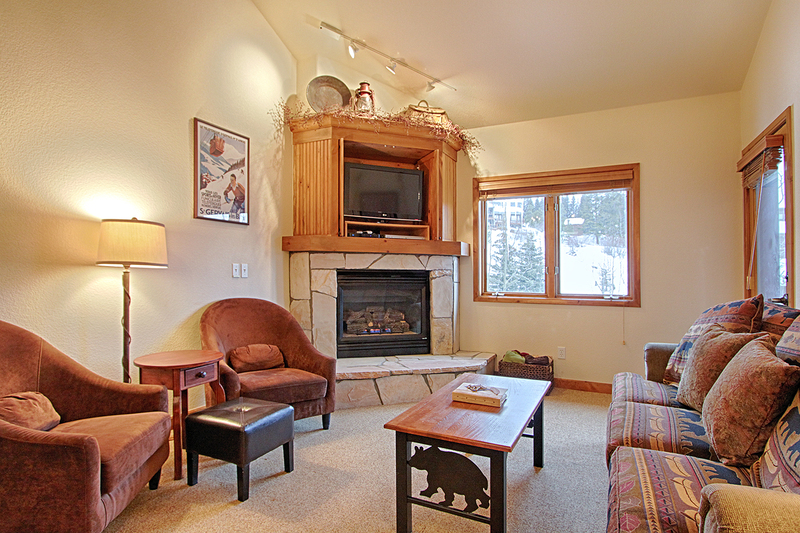 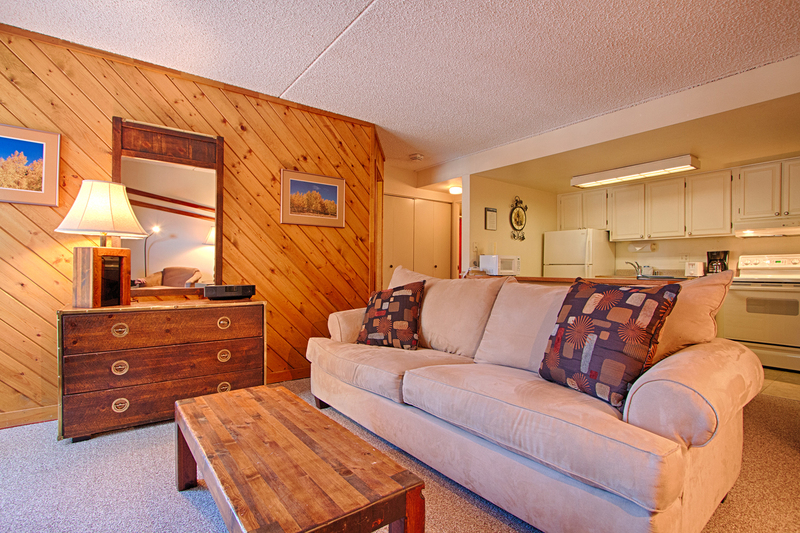 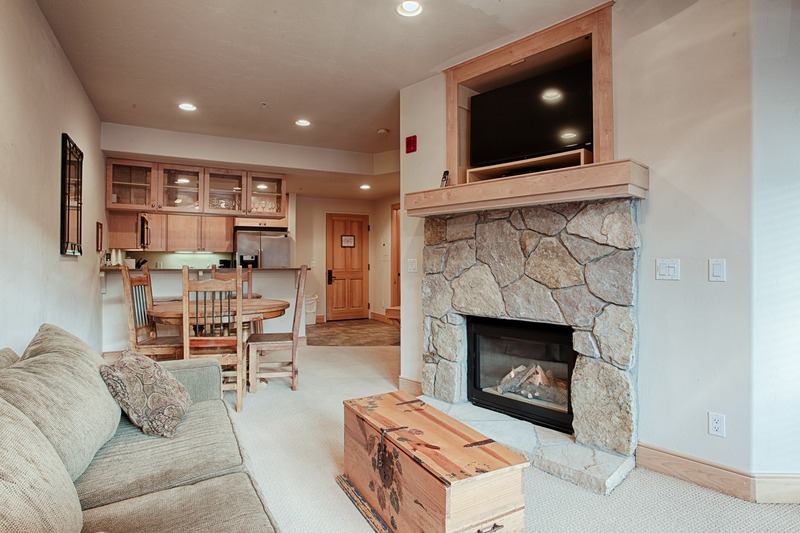 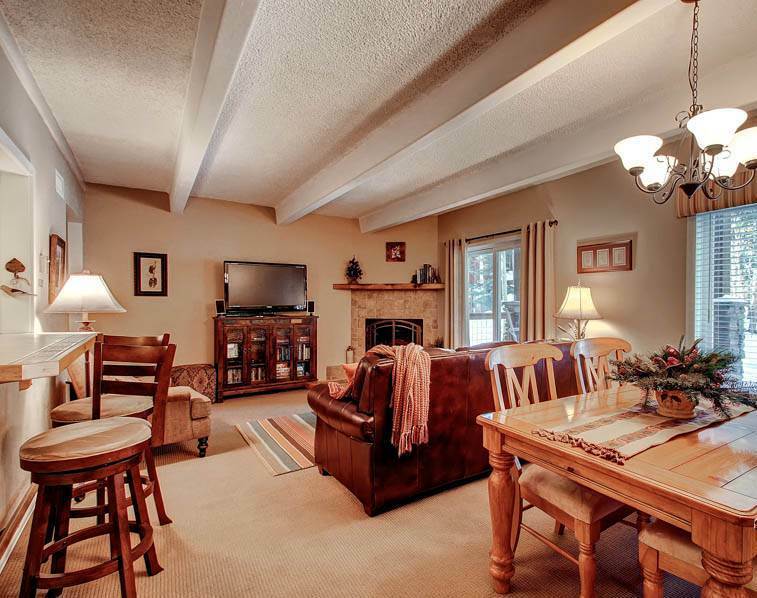 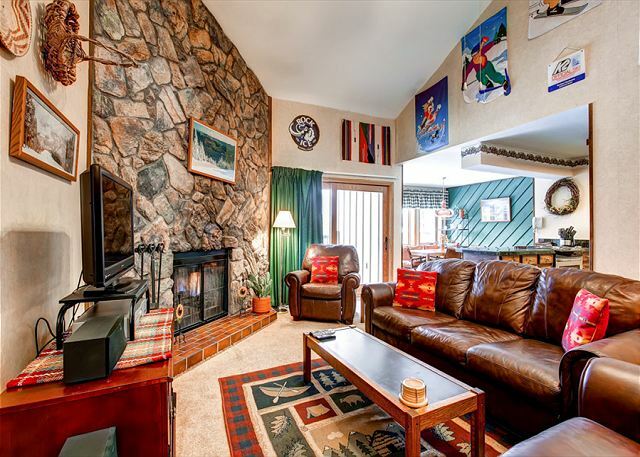 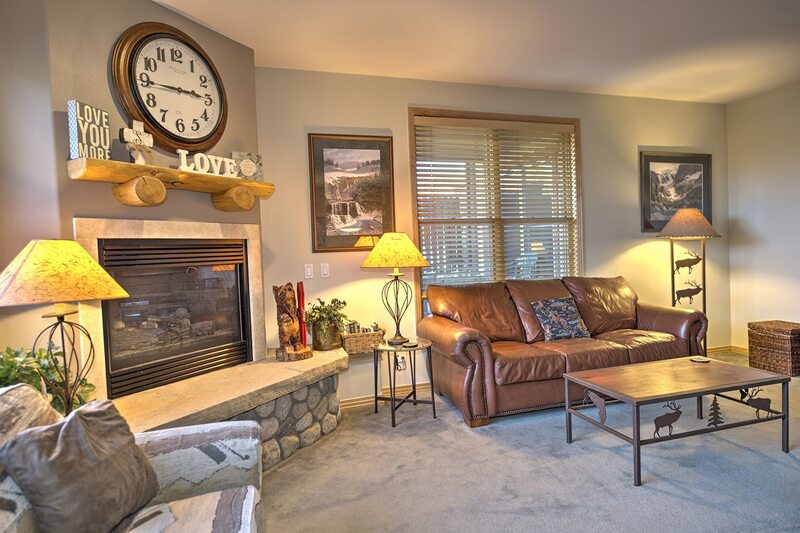 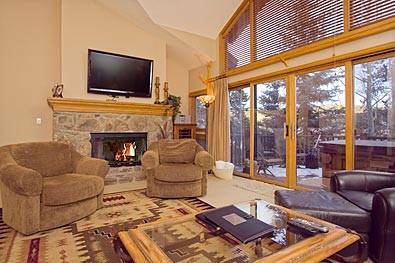 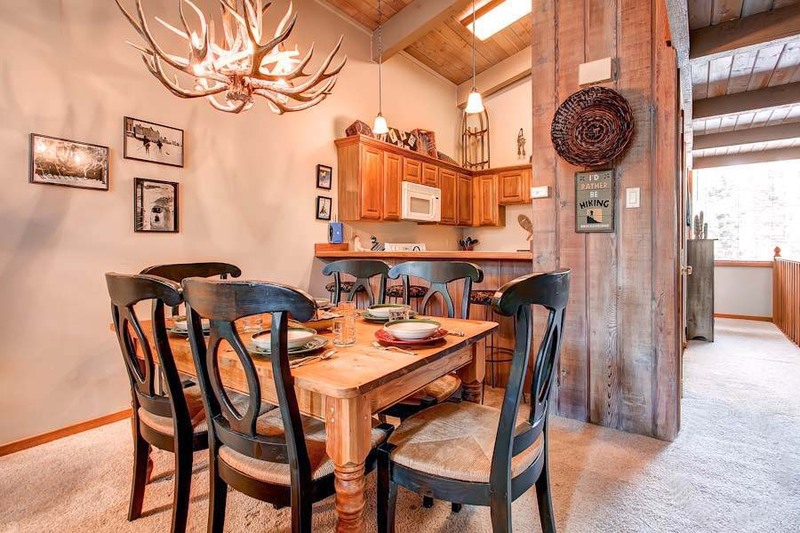 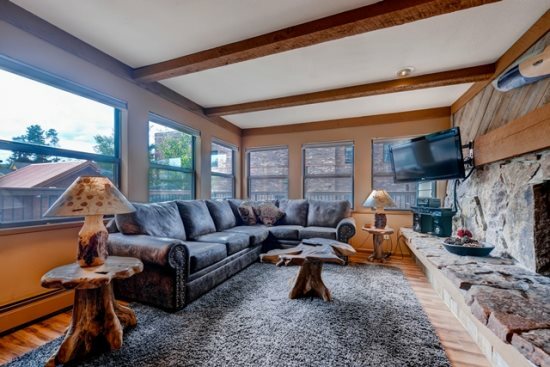 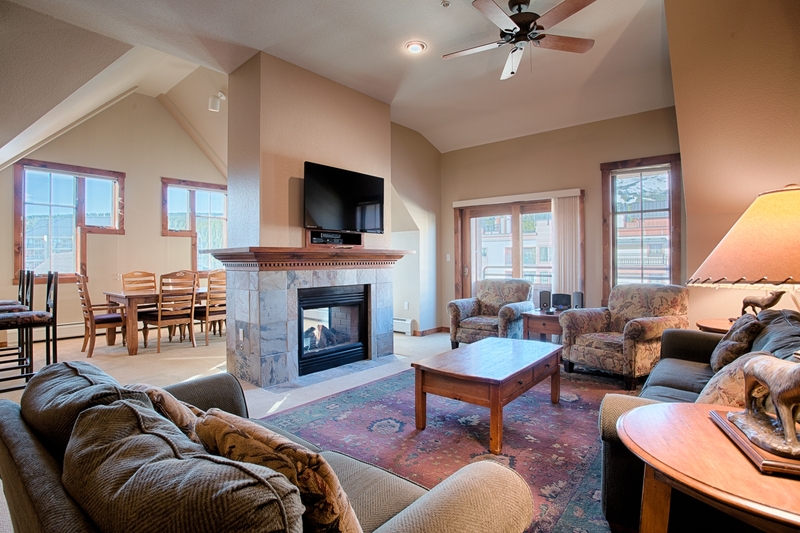 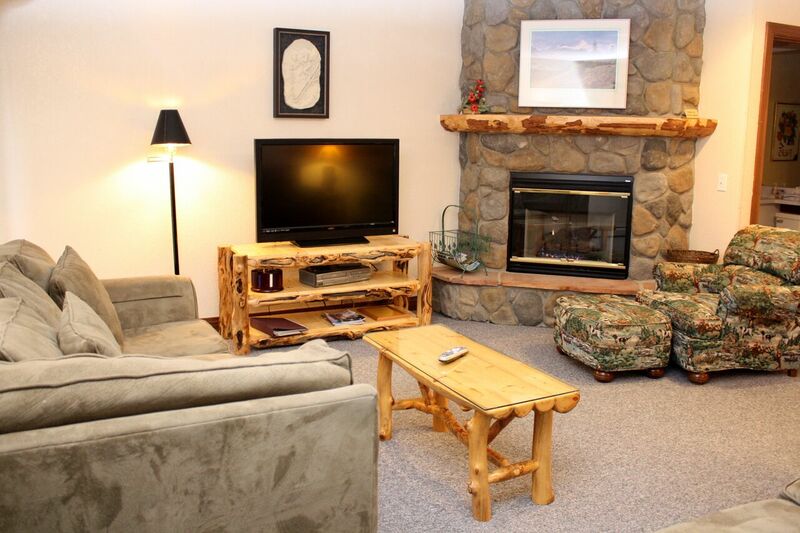 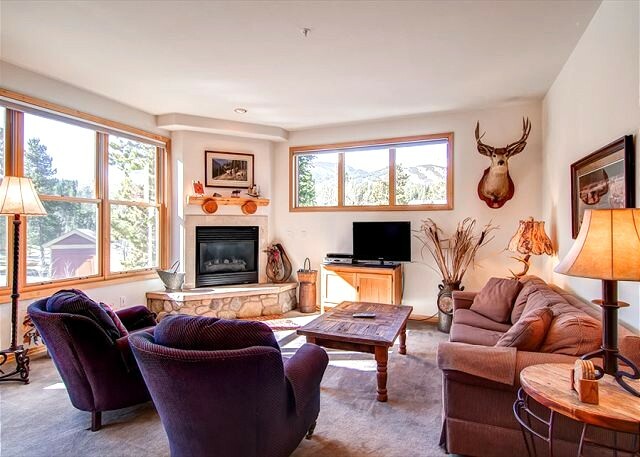 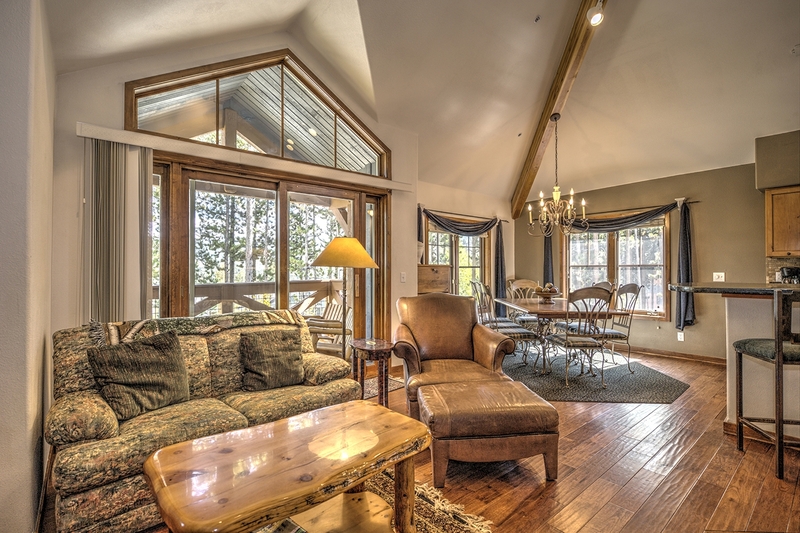 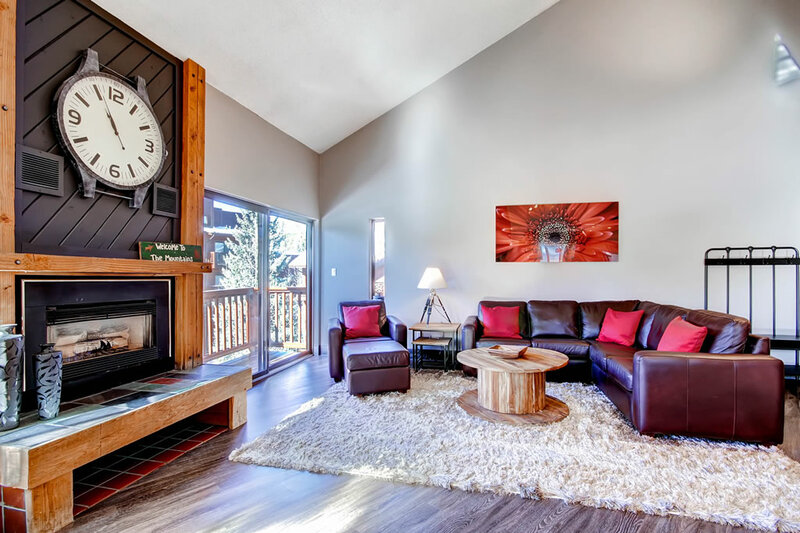 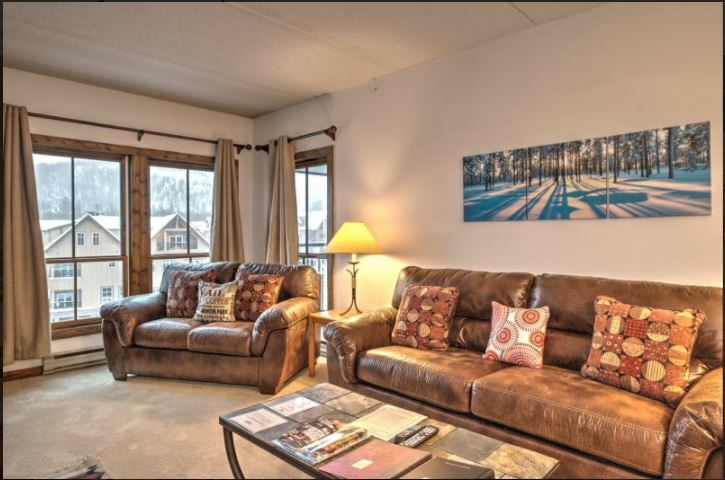 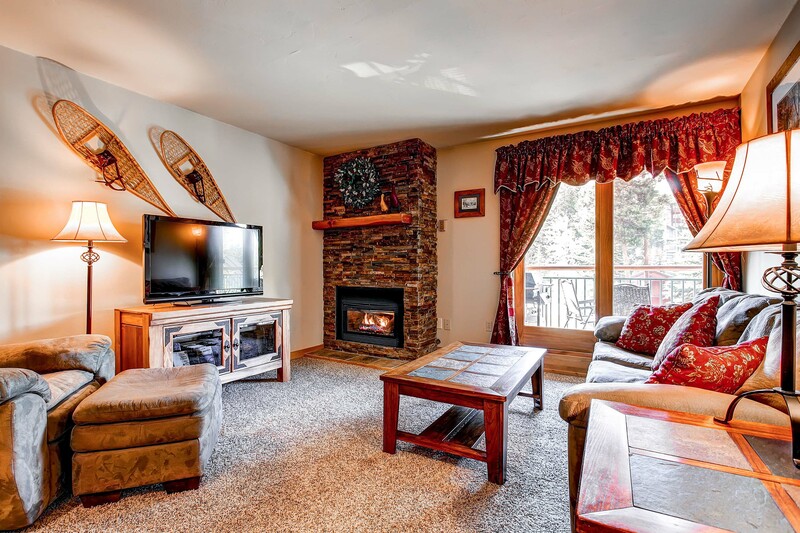 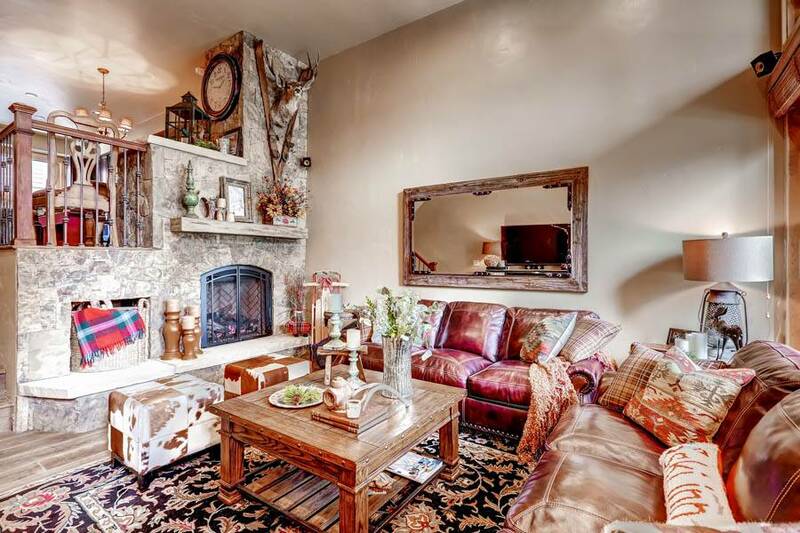 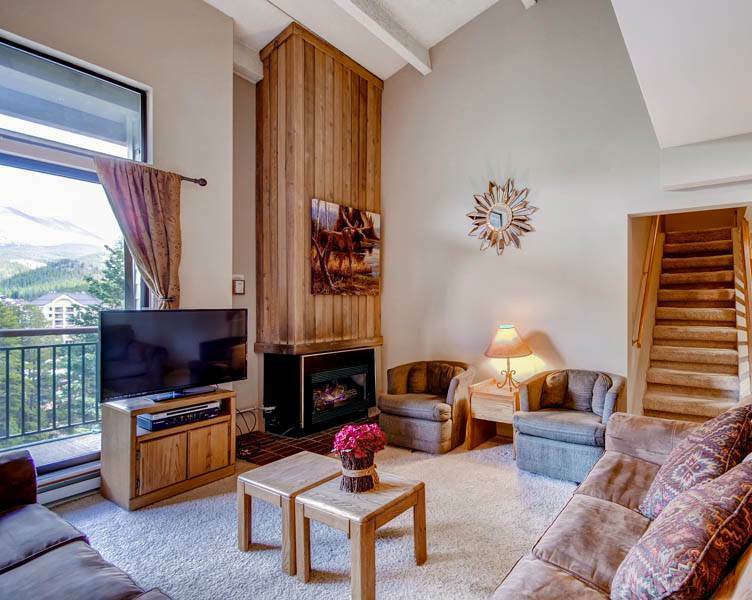 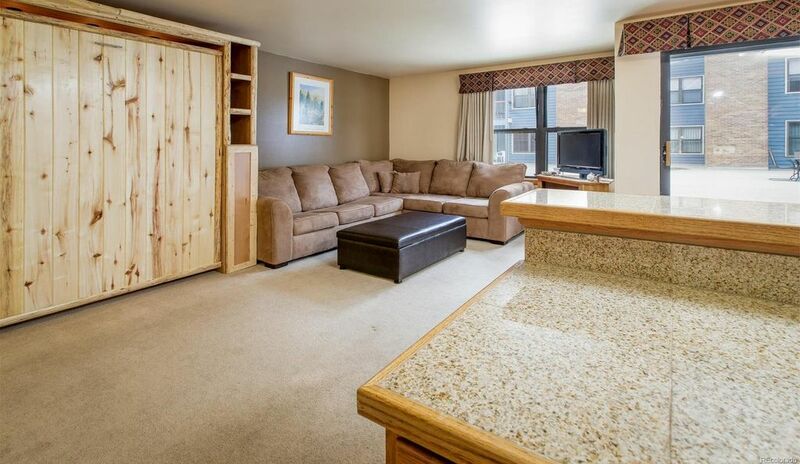 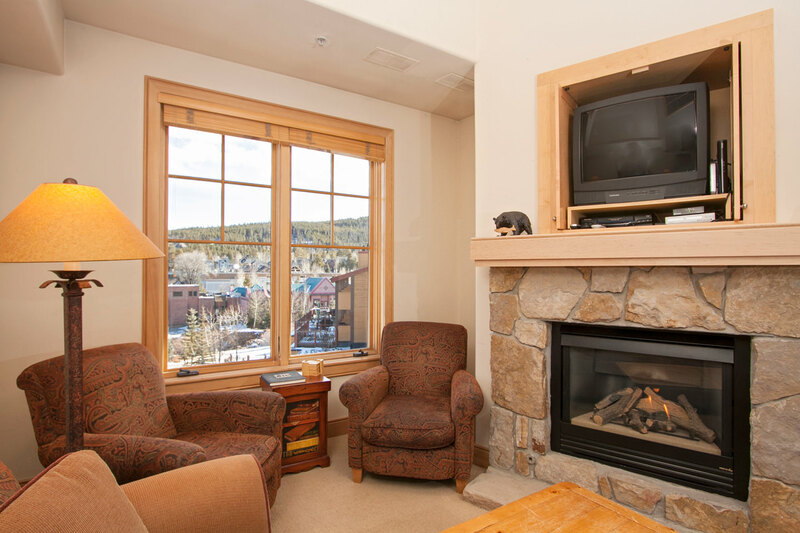 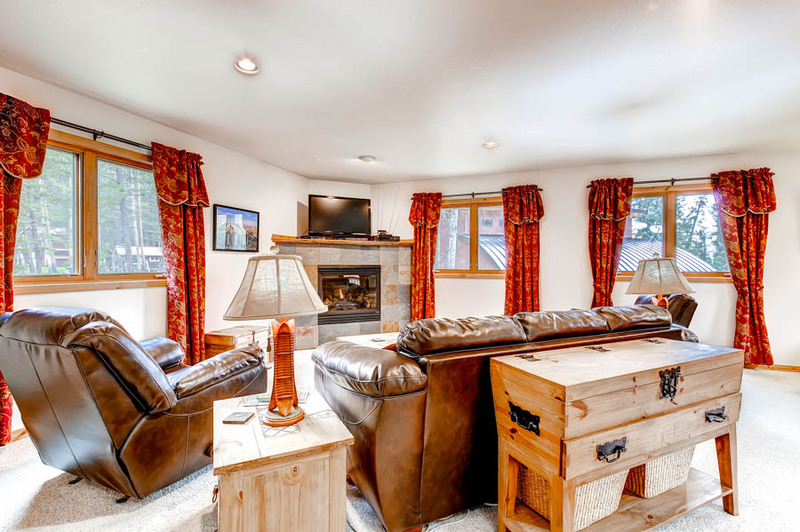 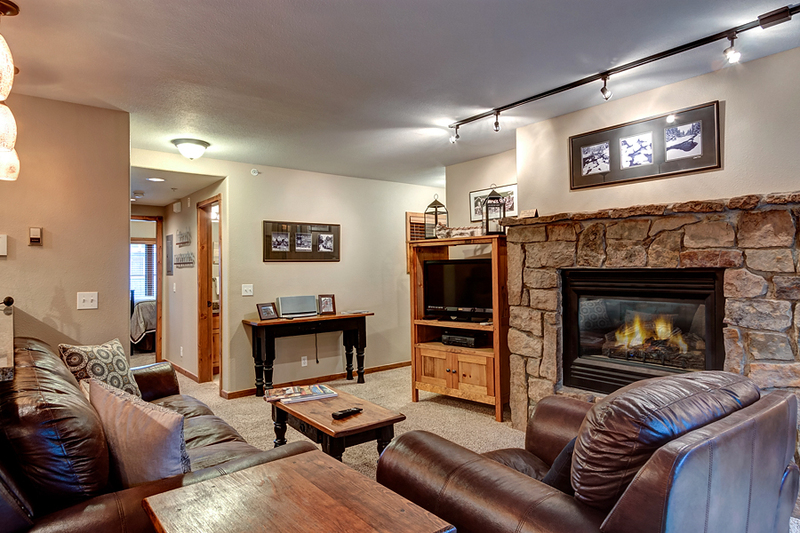 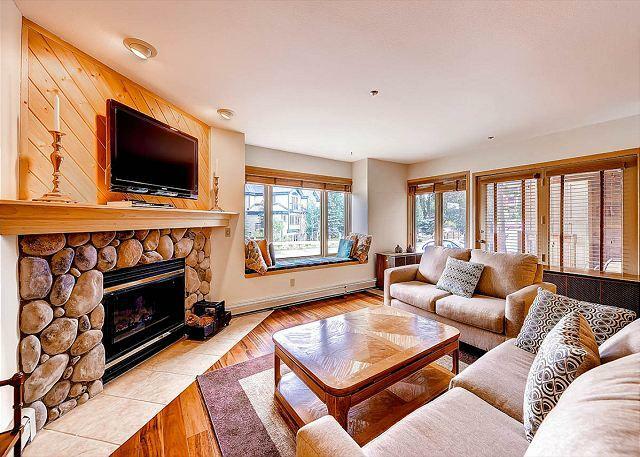 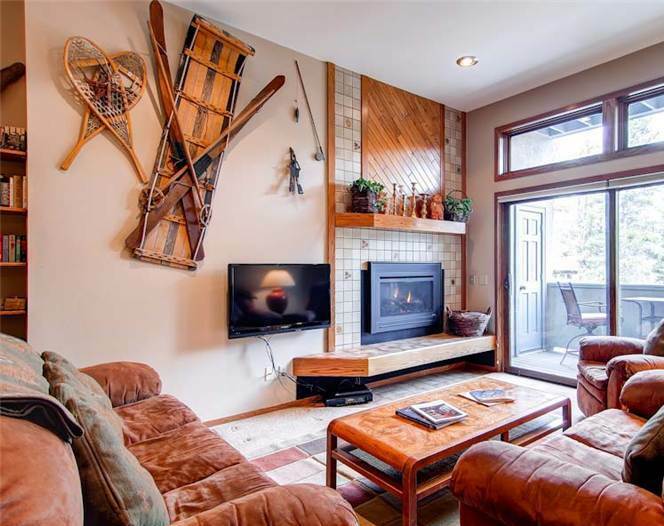 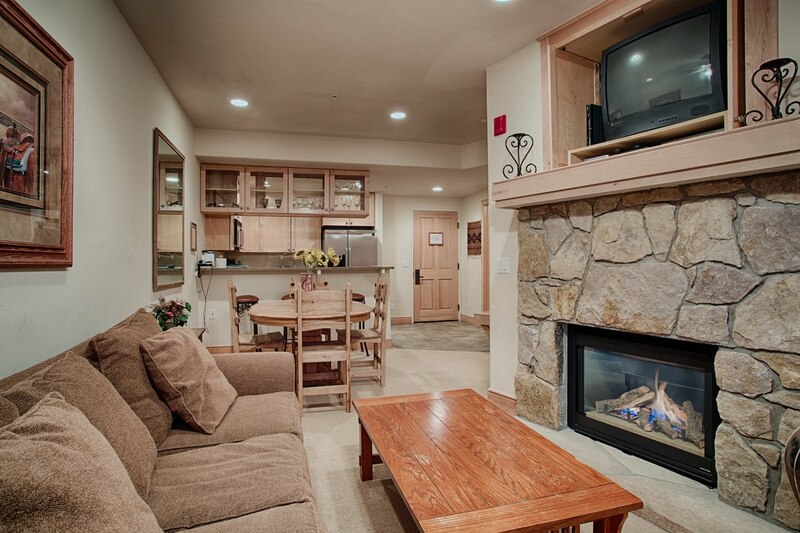 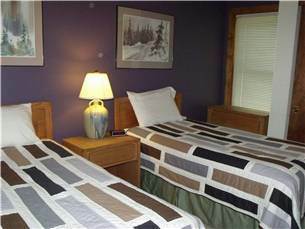 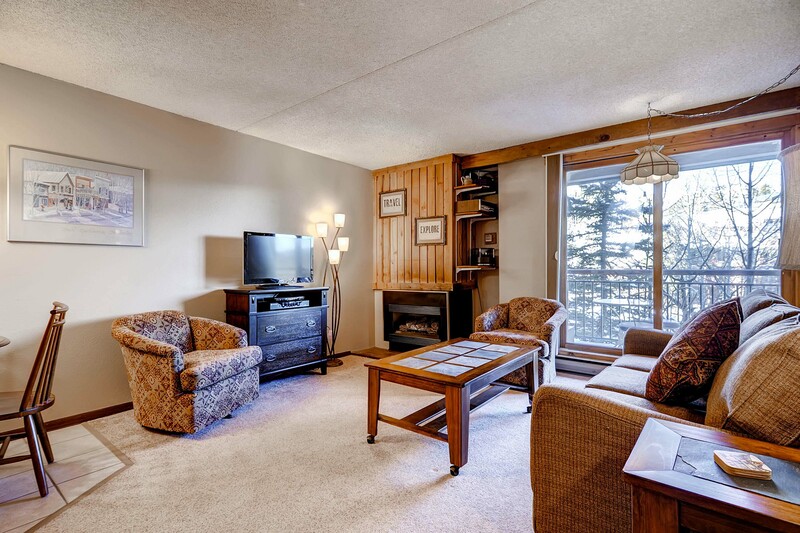 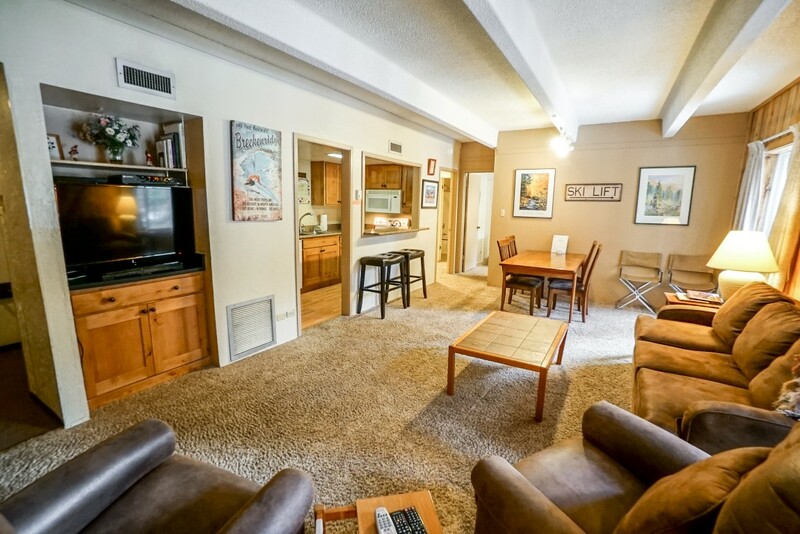 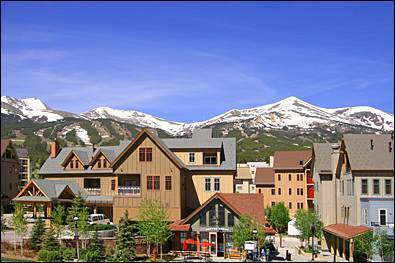 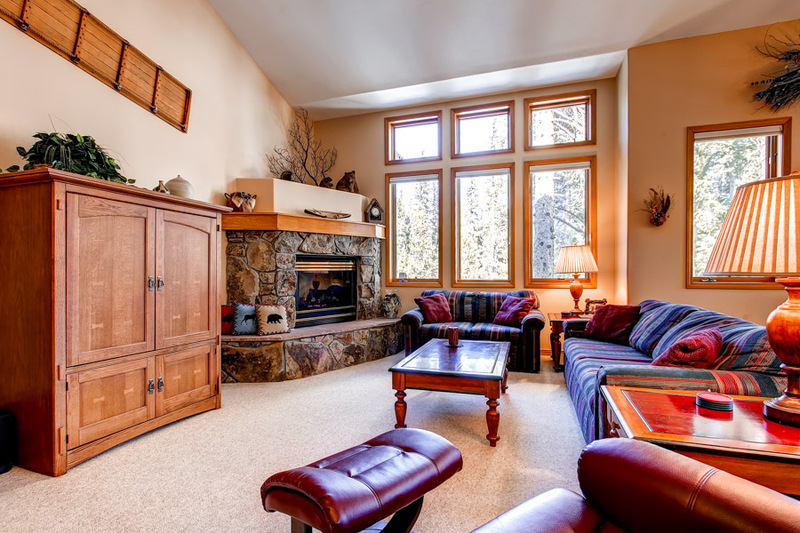 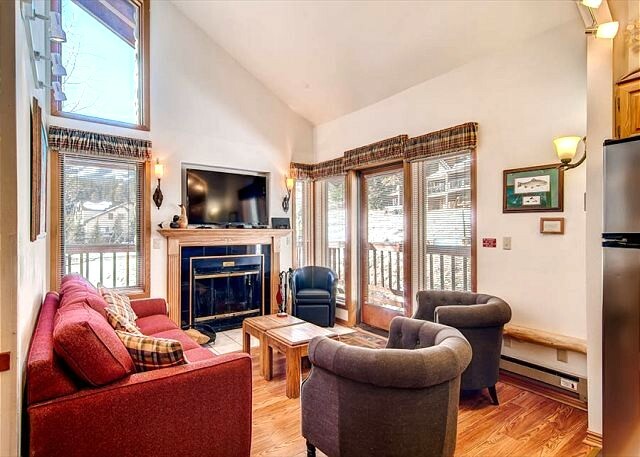 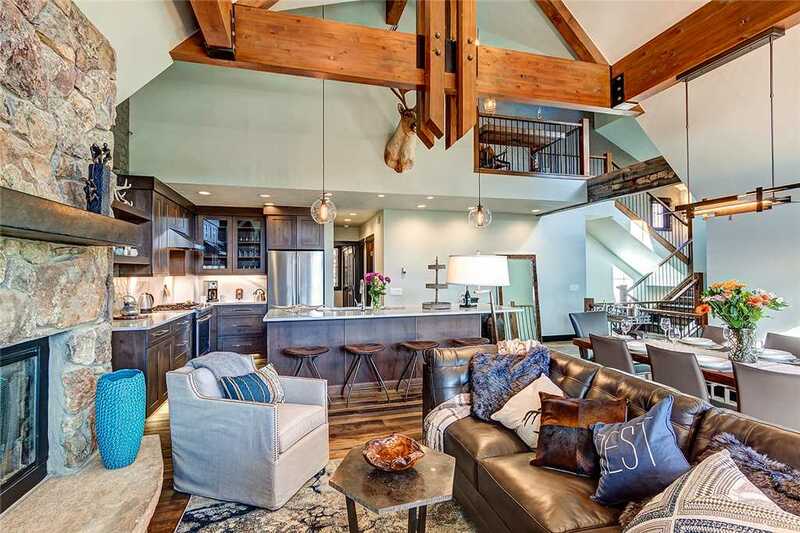 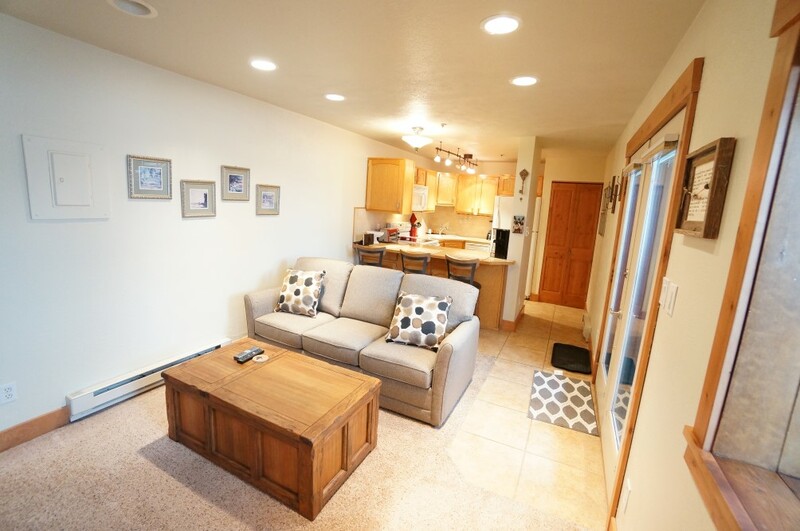 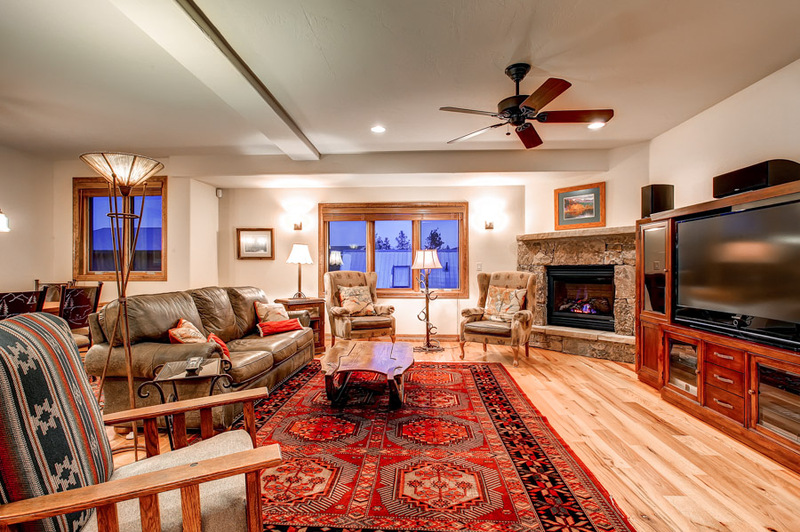 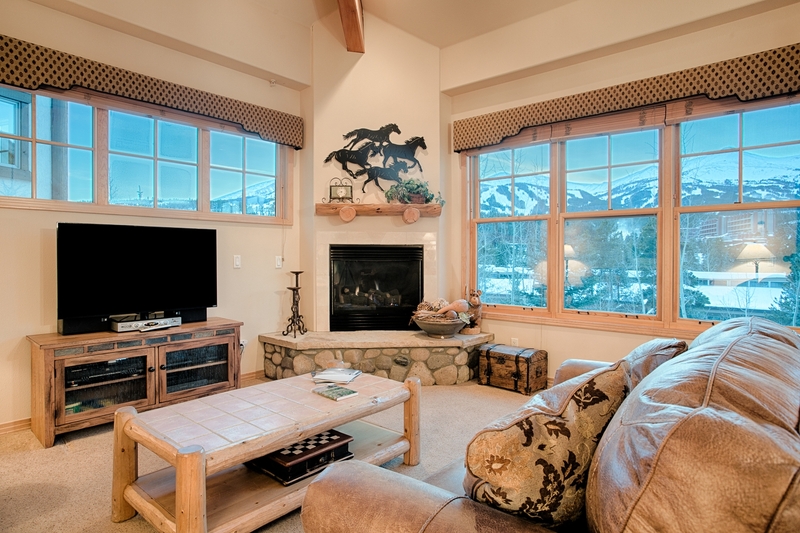 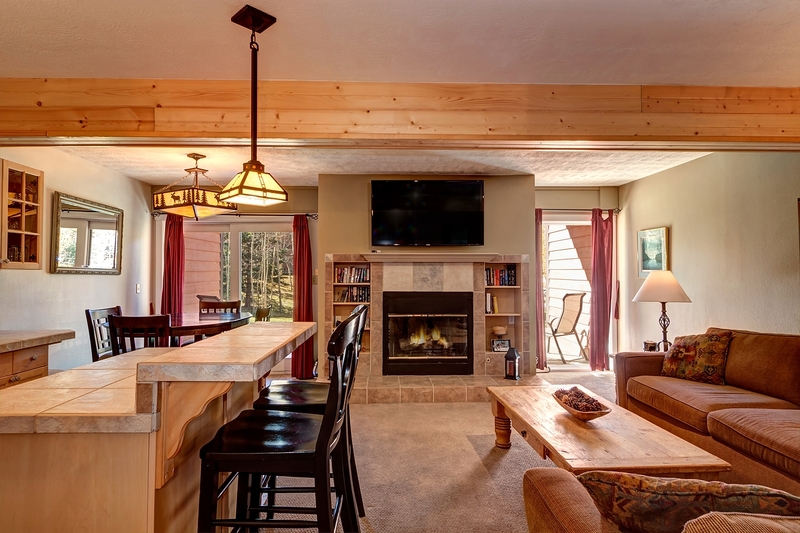 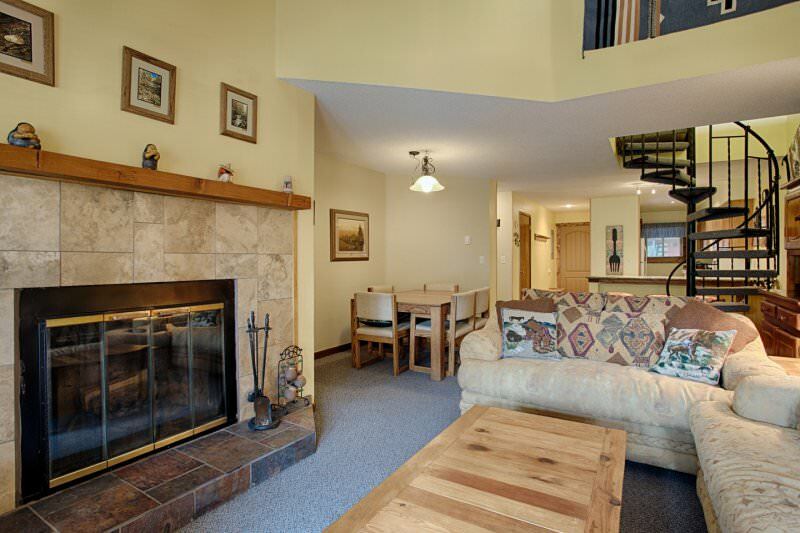 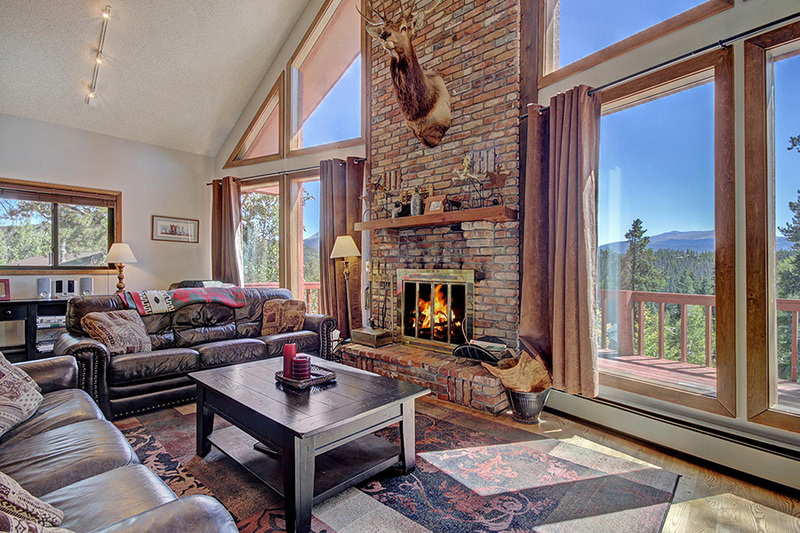 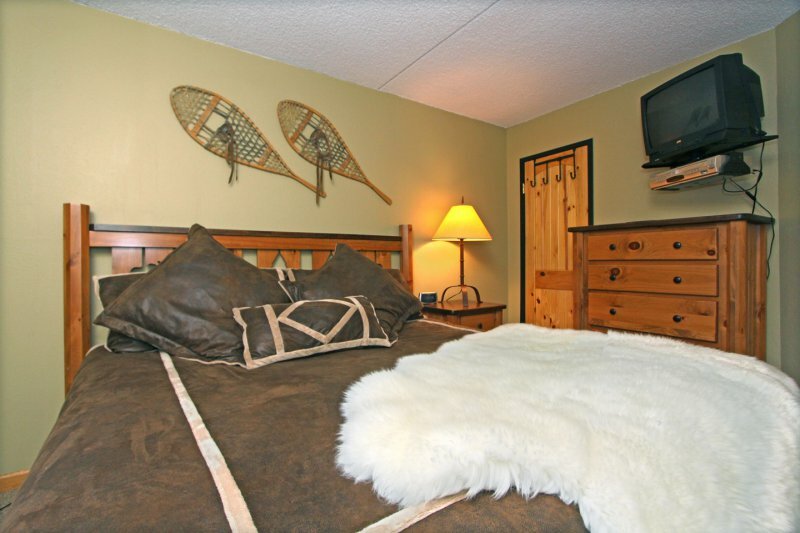 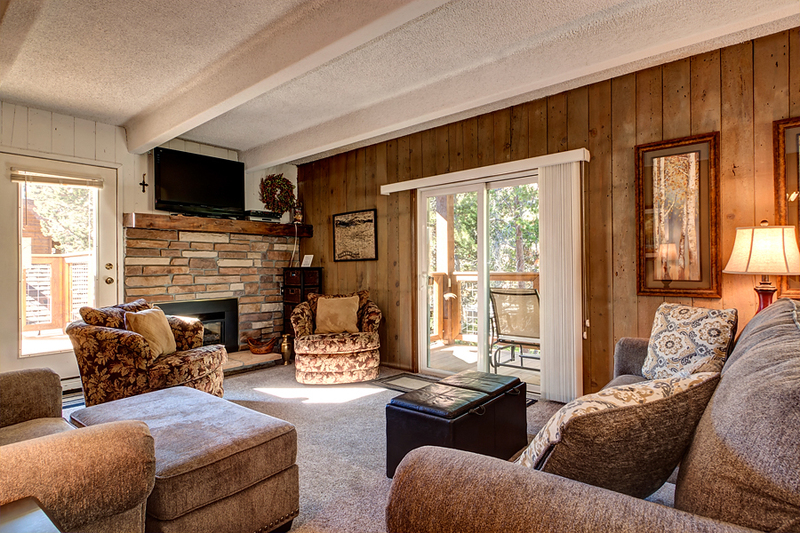 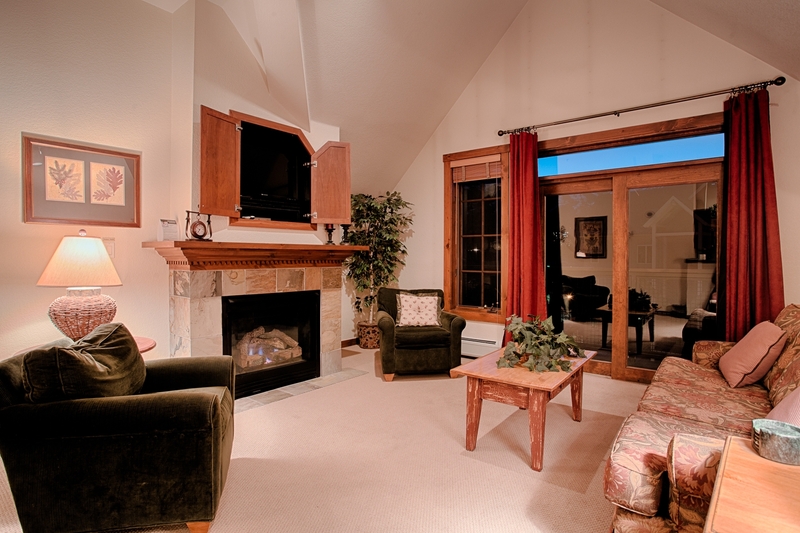 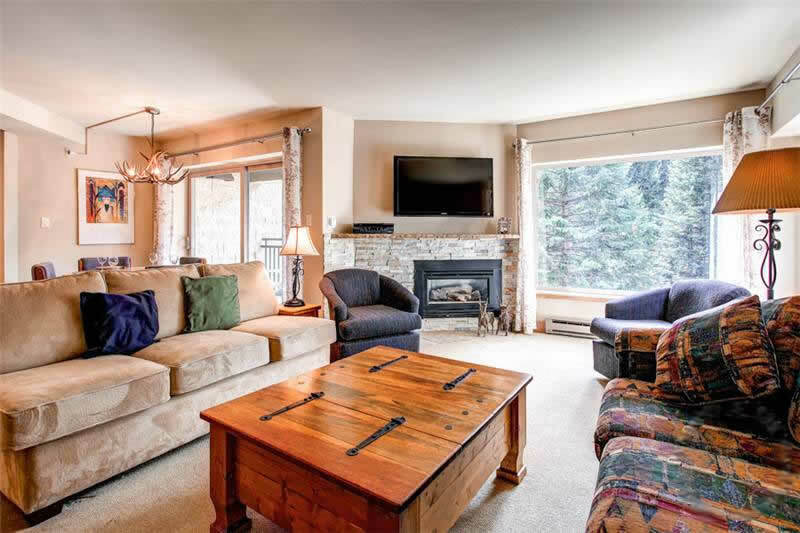 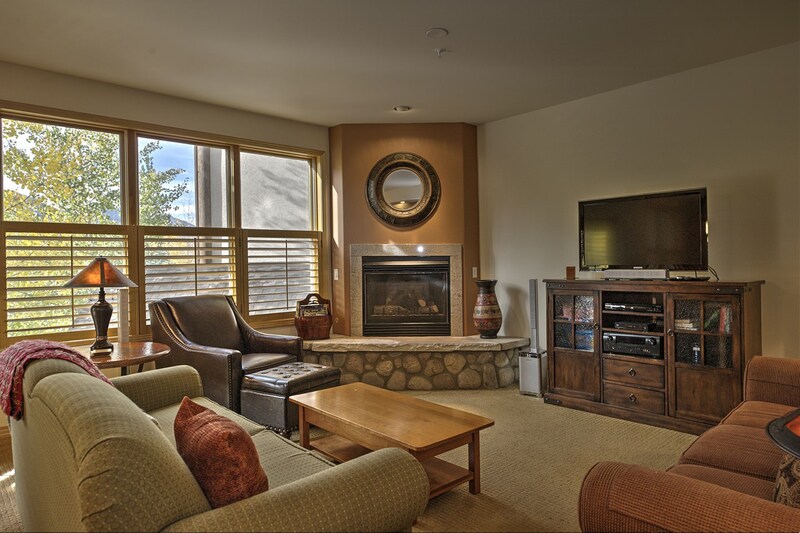 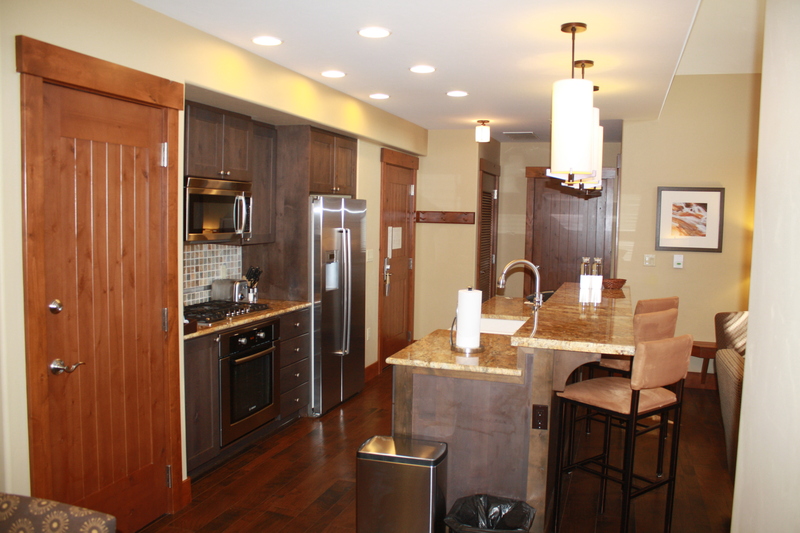 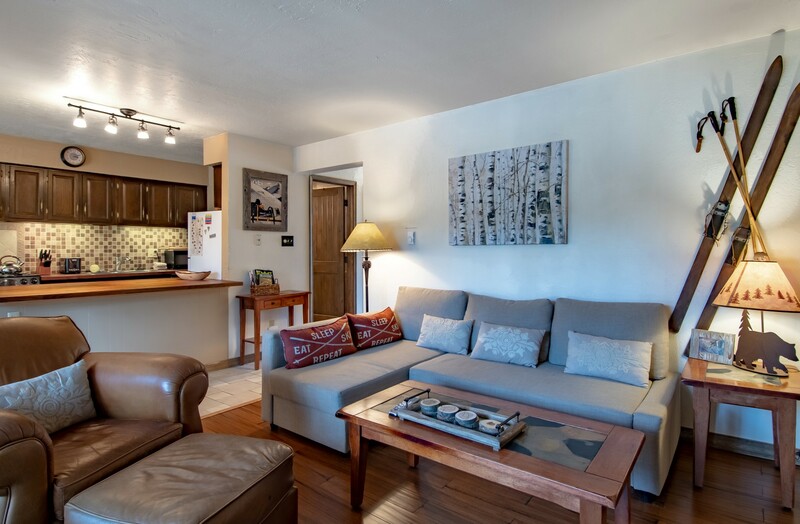 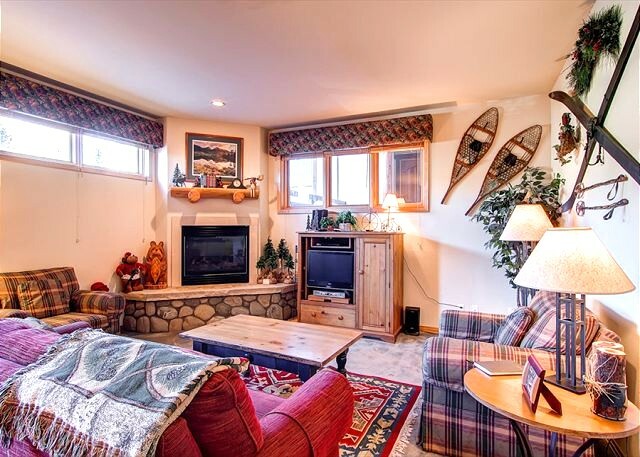 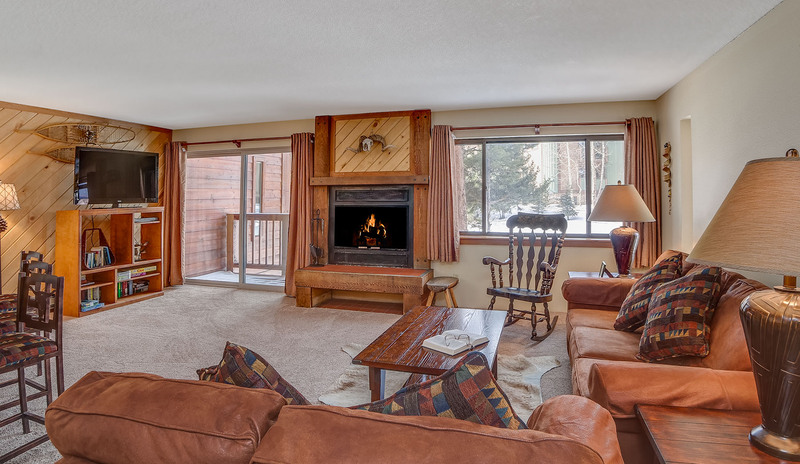 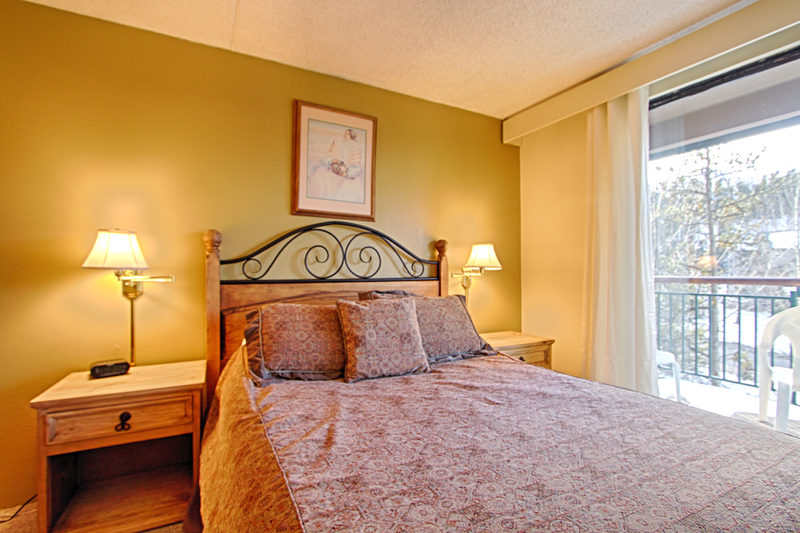 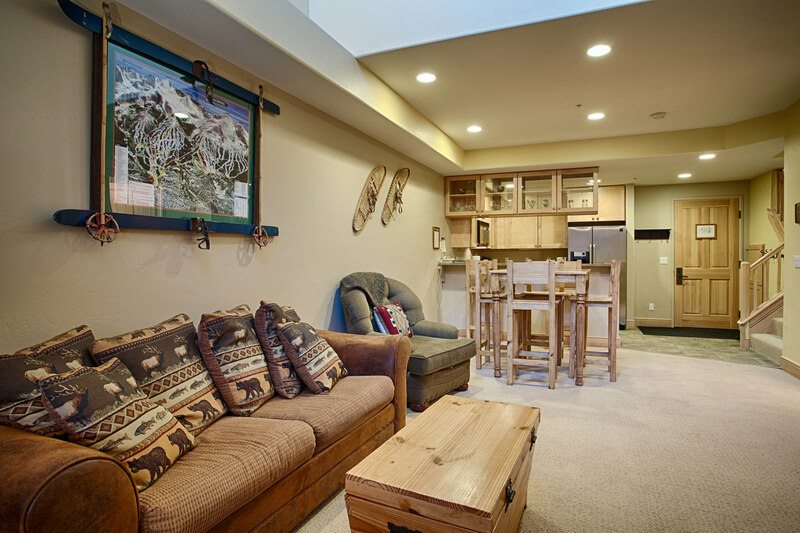 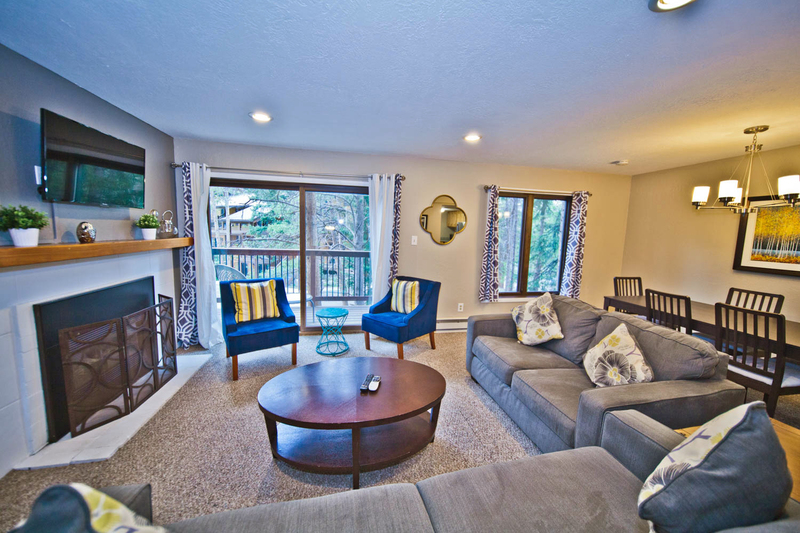 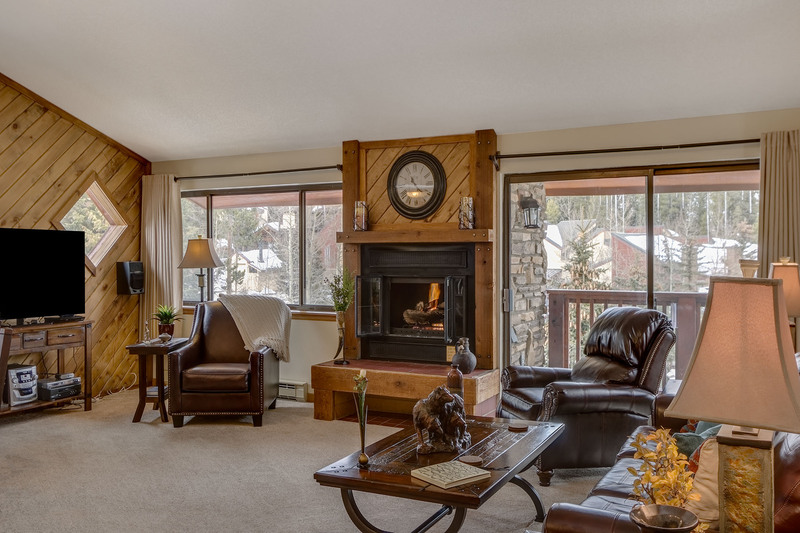 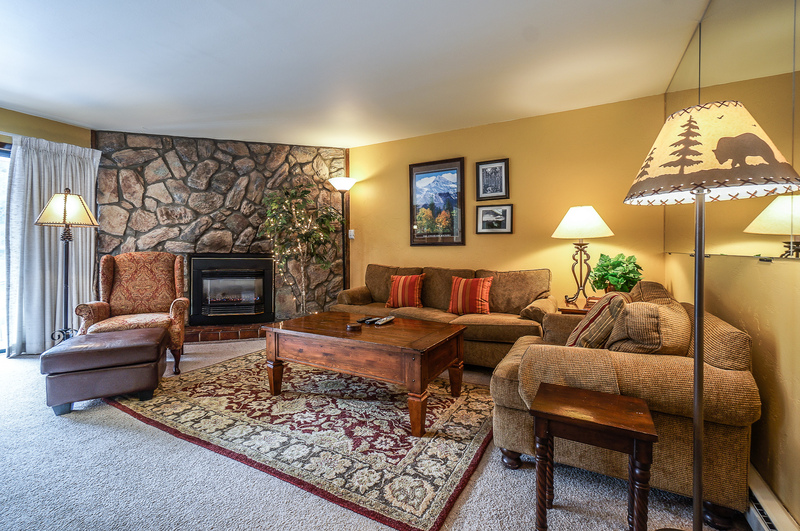 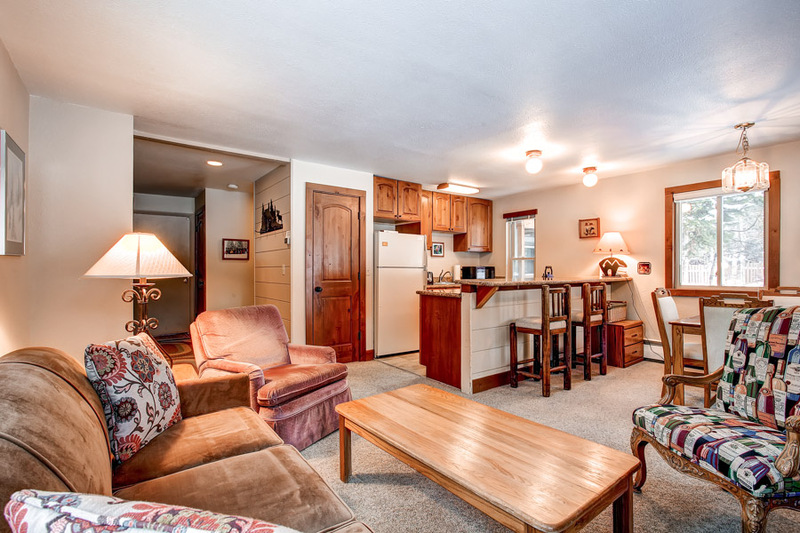 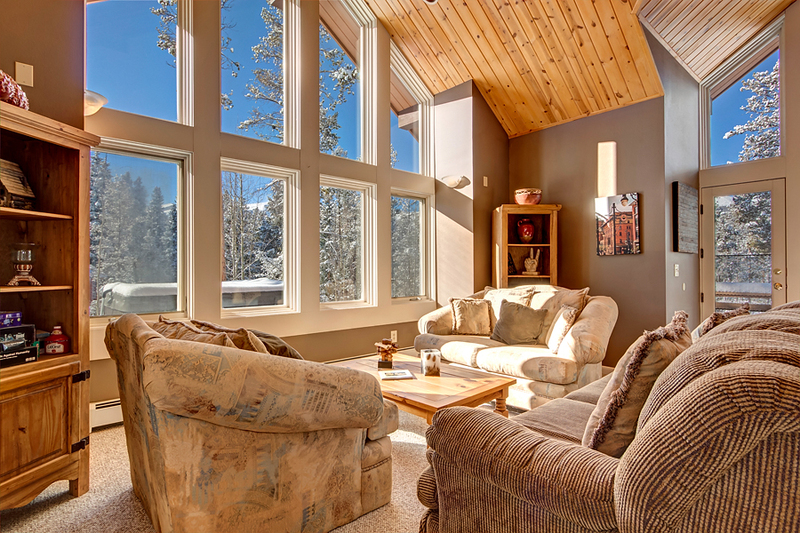 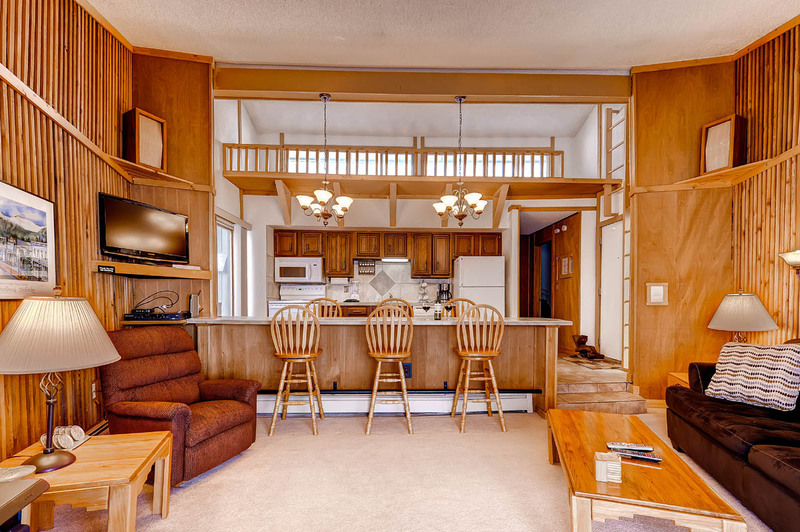 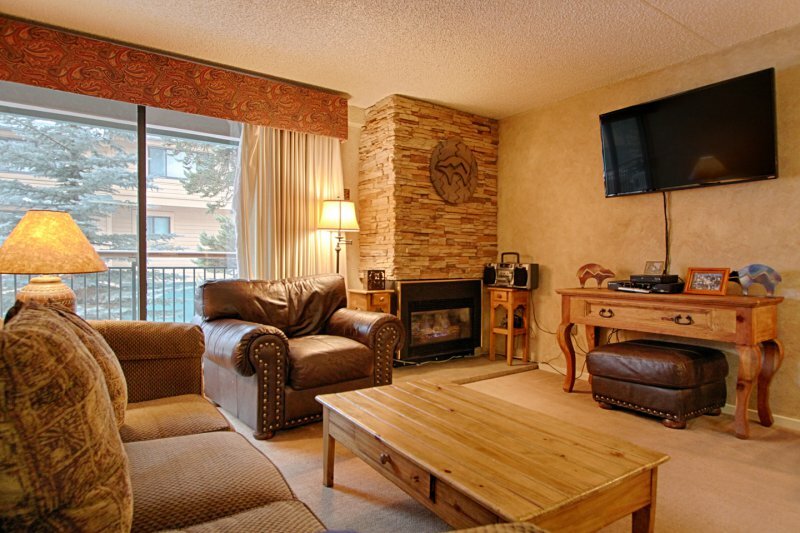 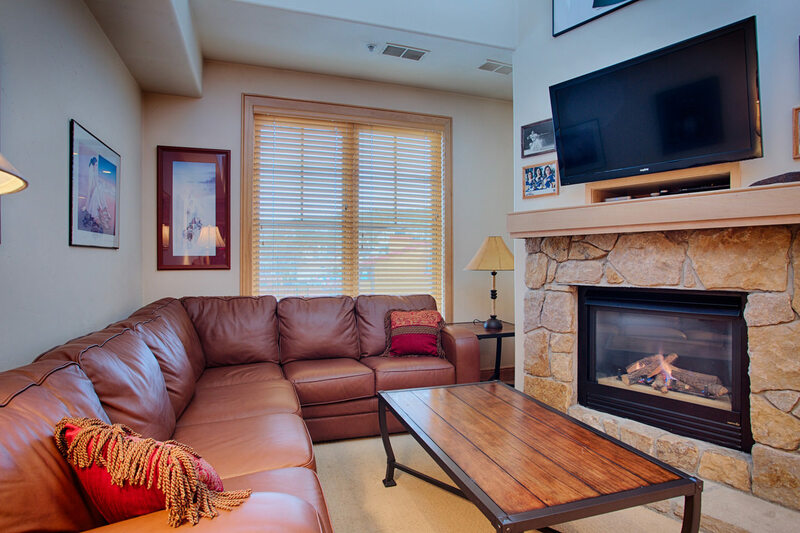 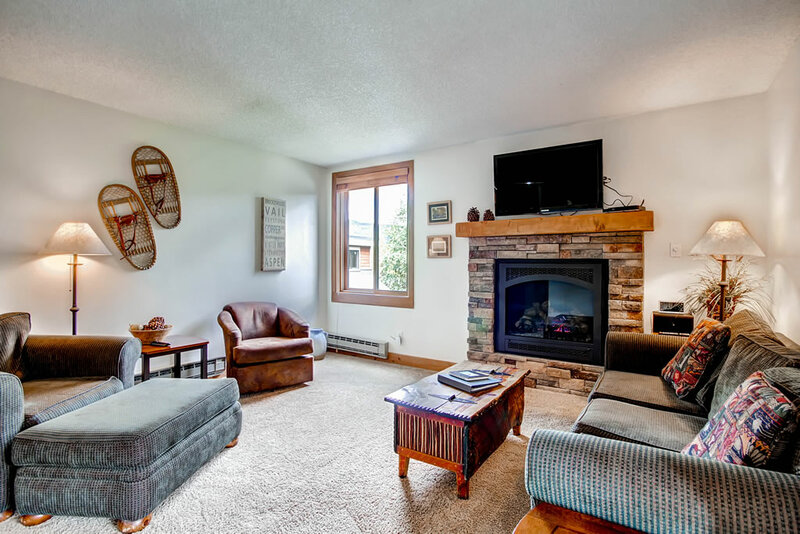 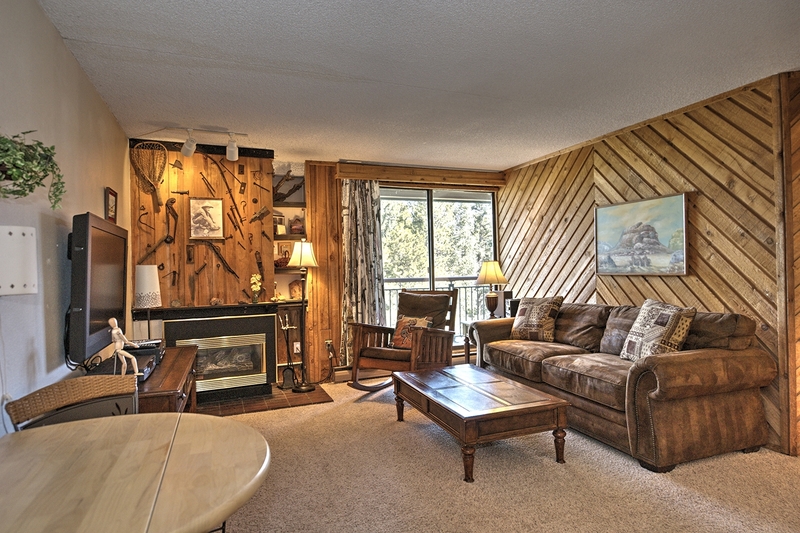 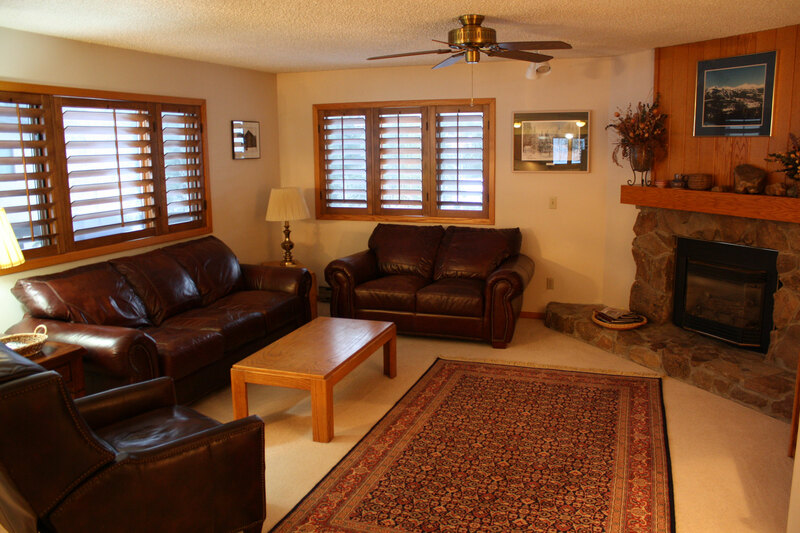 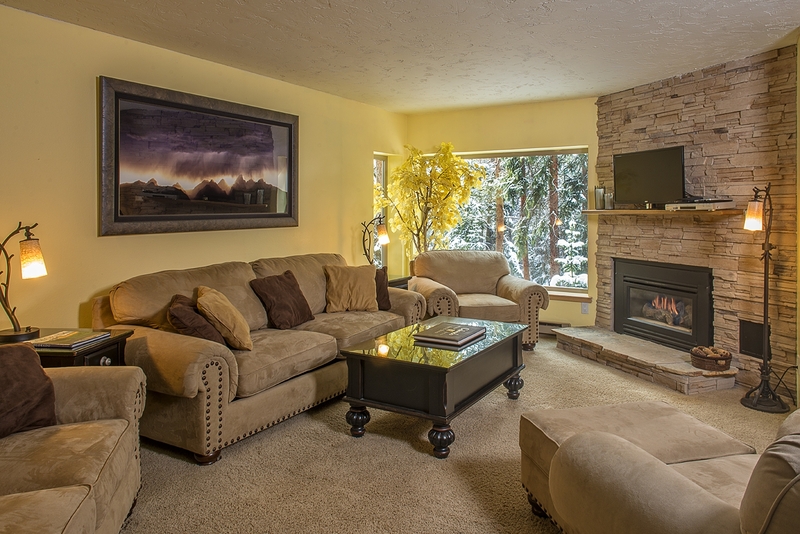 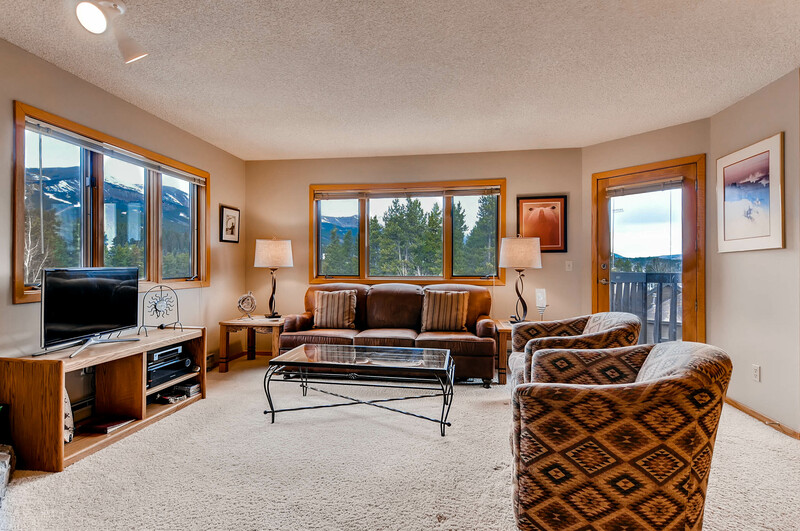 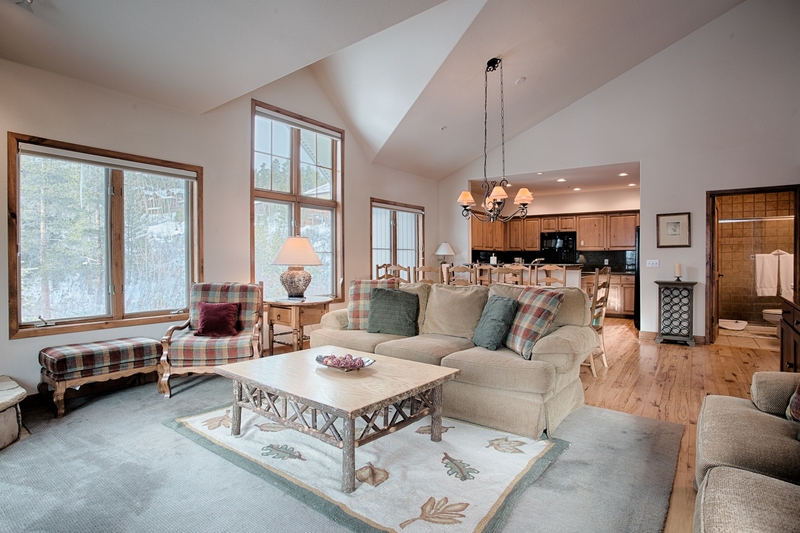 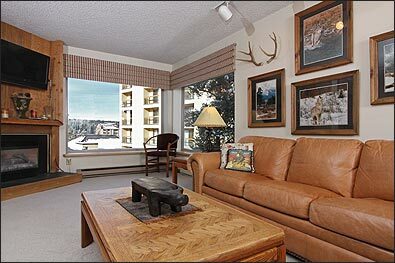 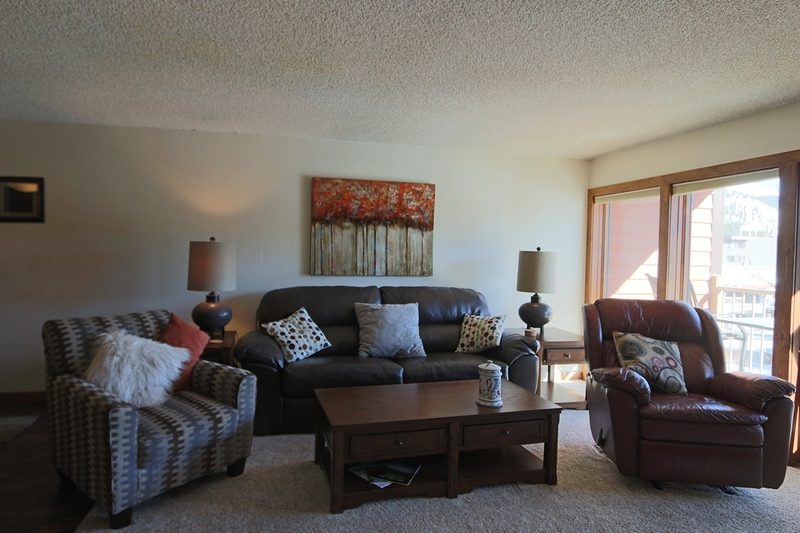 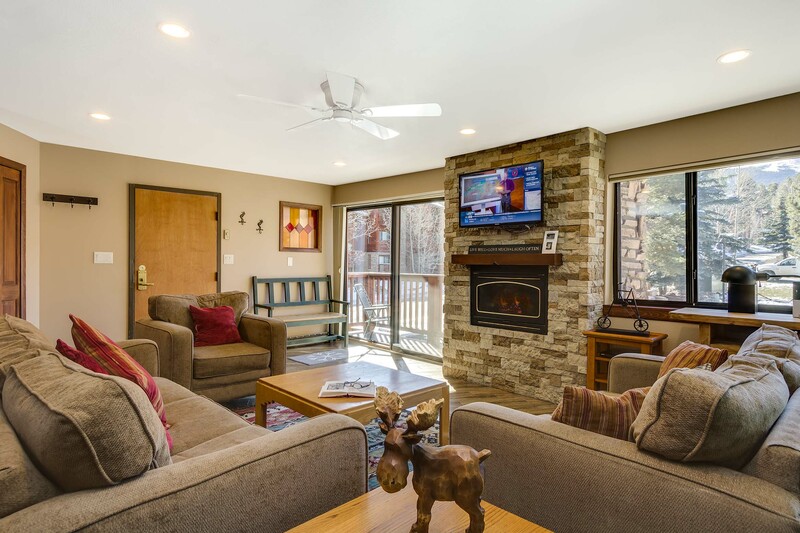 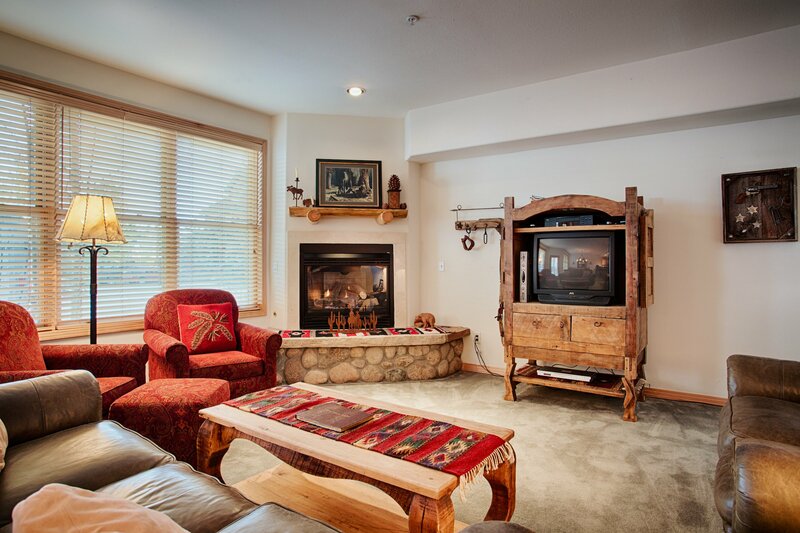 If you’re searching for sanctuary with convenient access to Downtown Breckenridge, the Sled Haus will not disappoint! 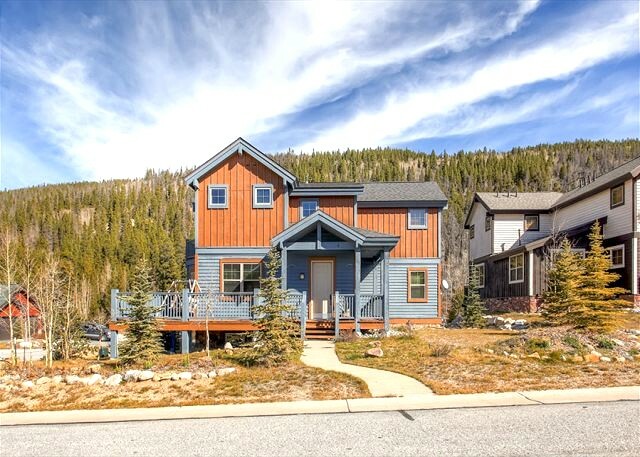 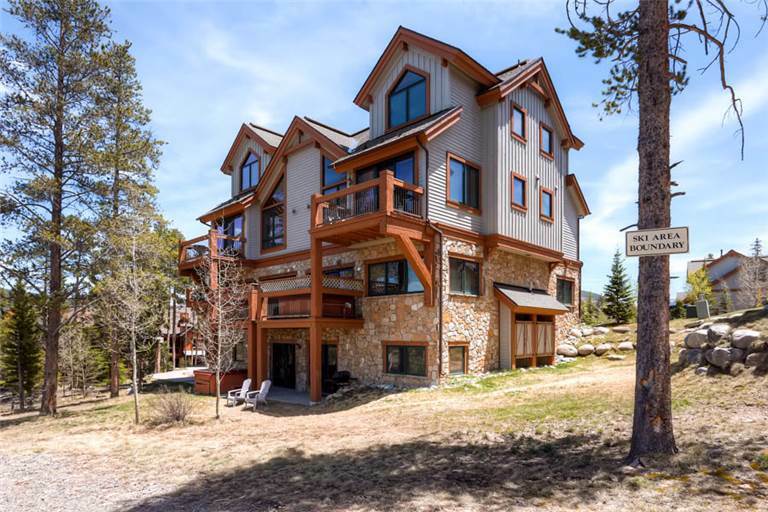 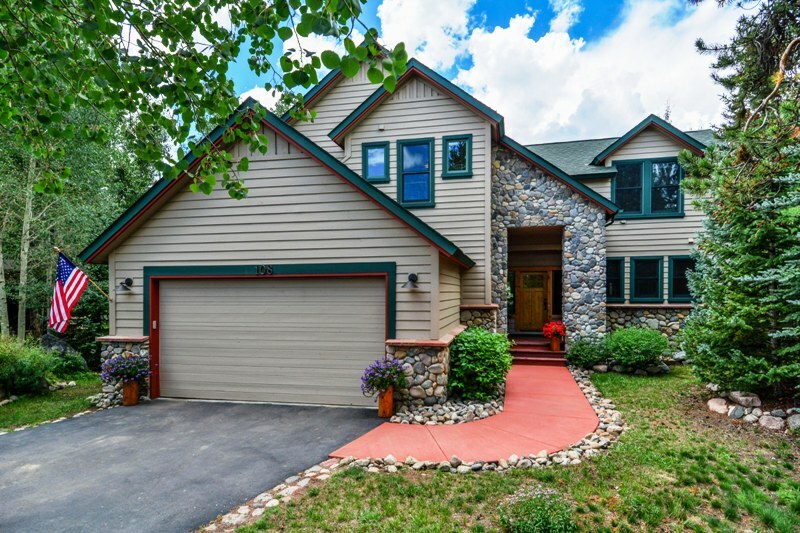 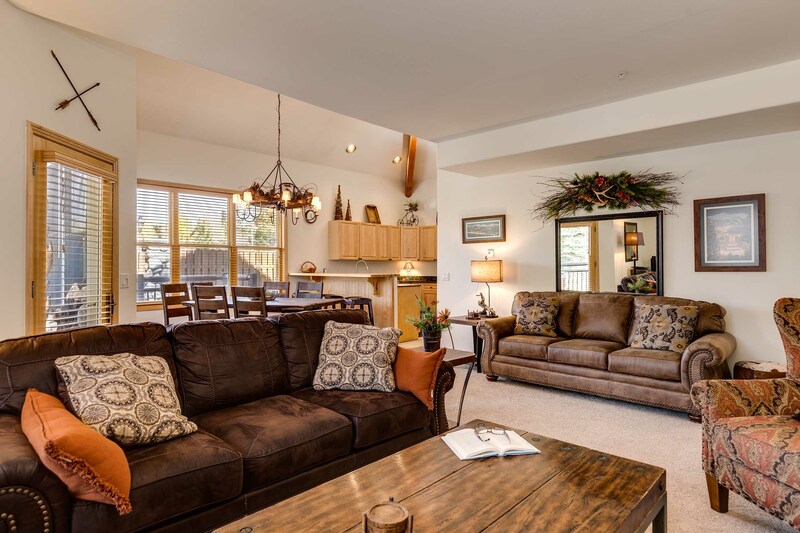 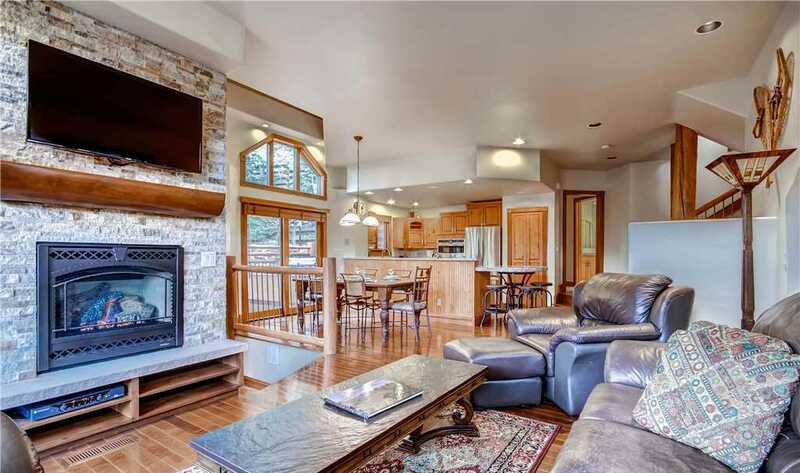 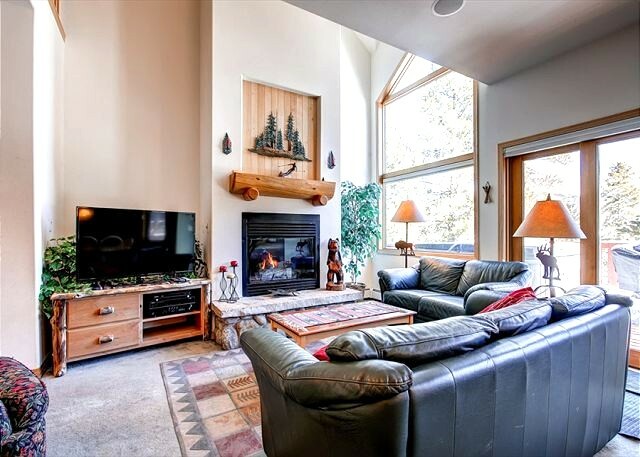 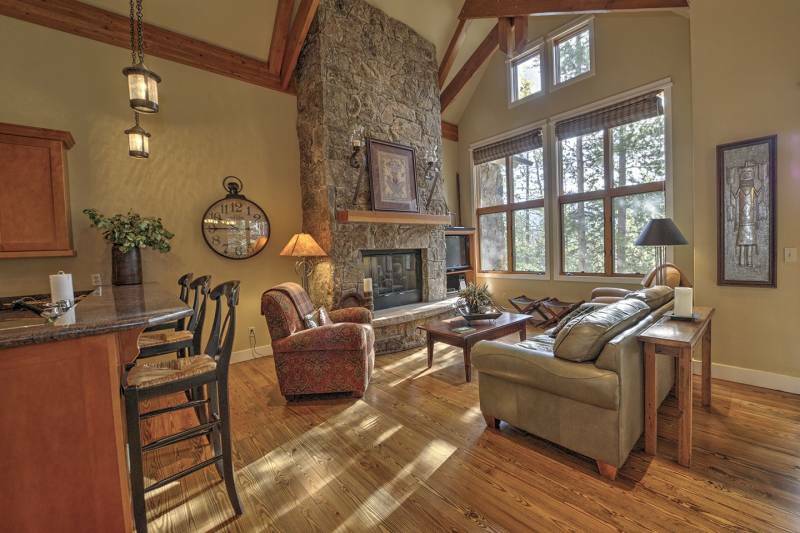 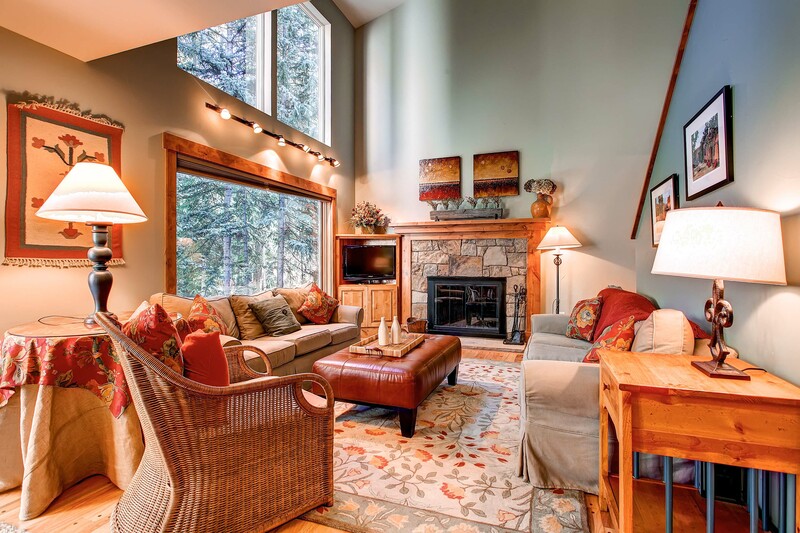 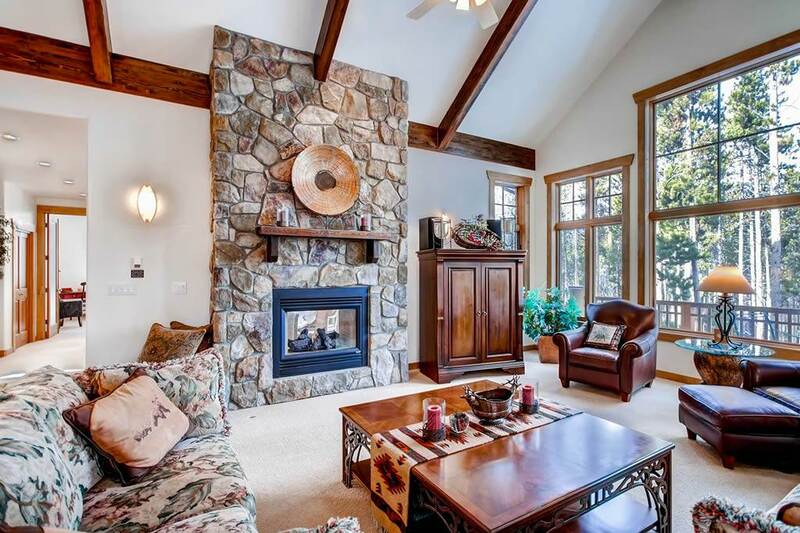 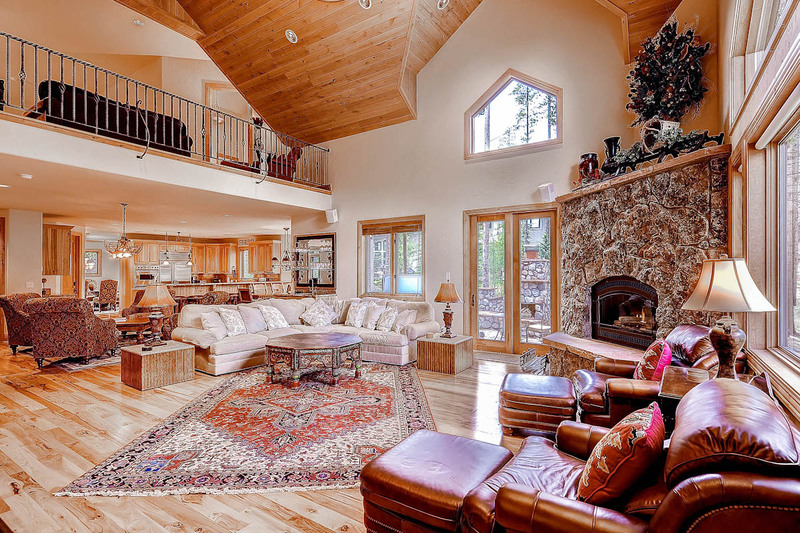 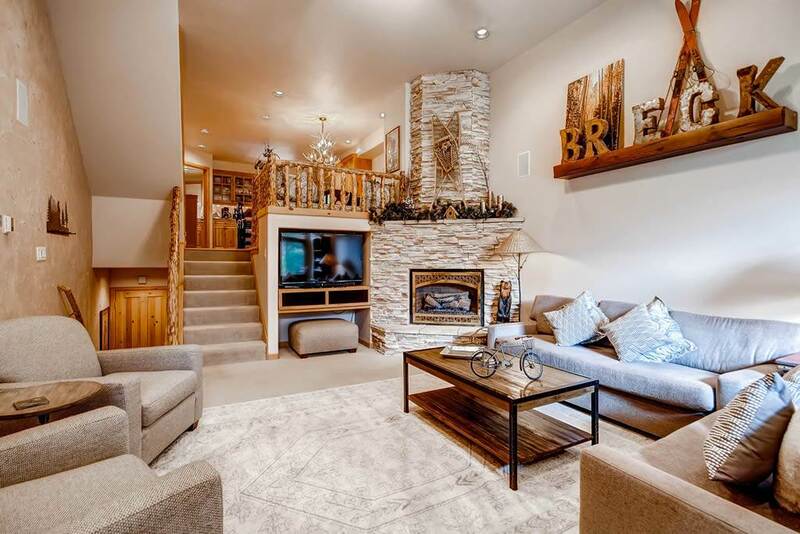 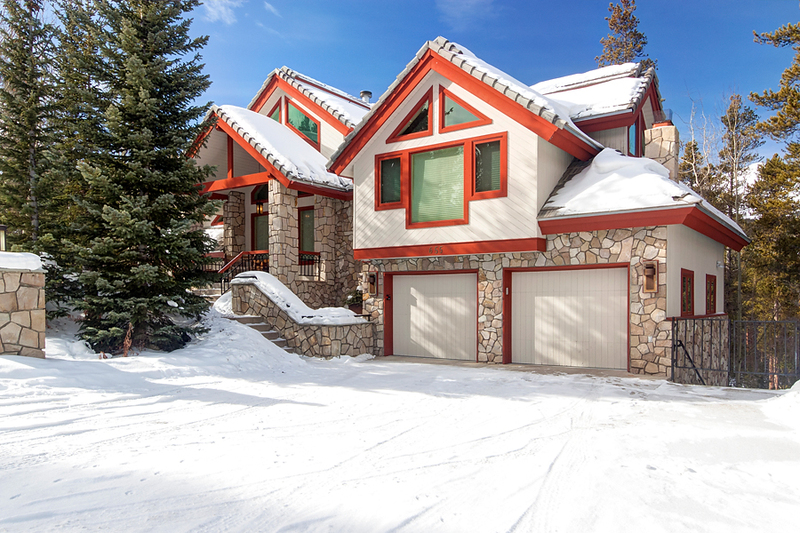 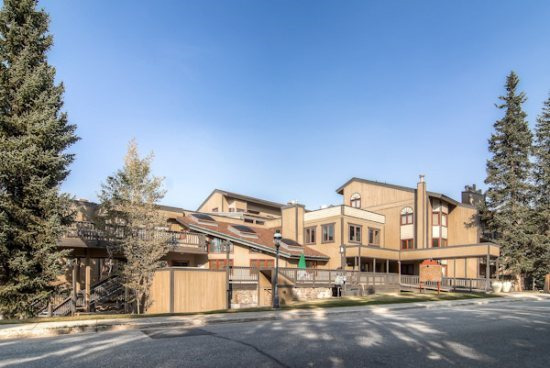 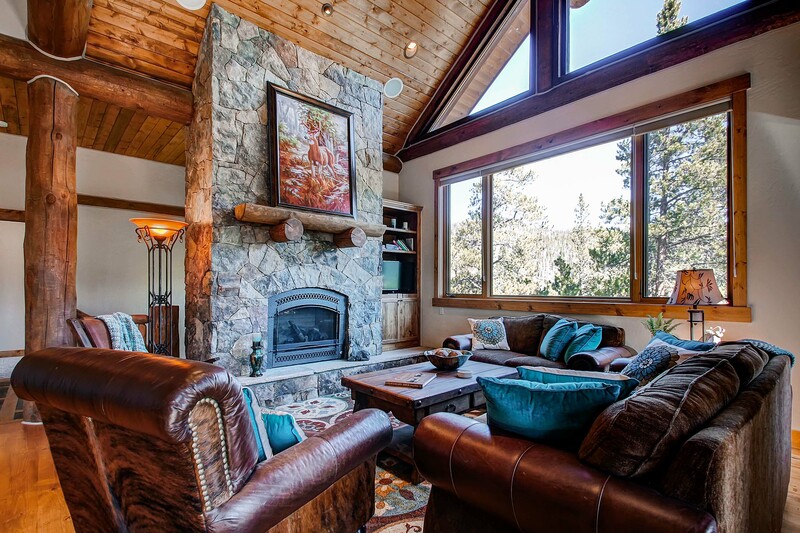 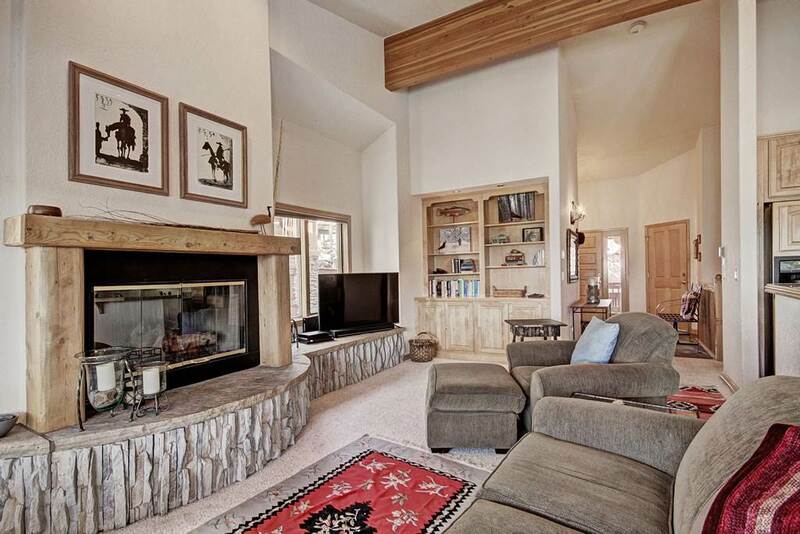 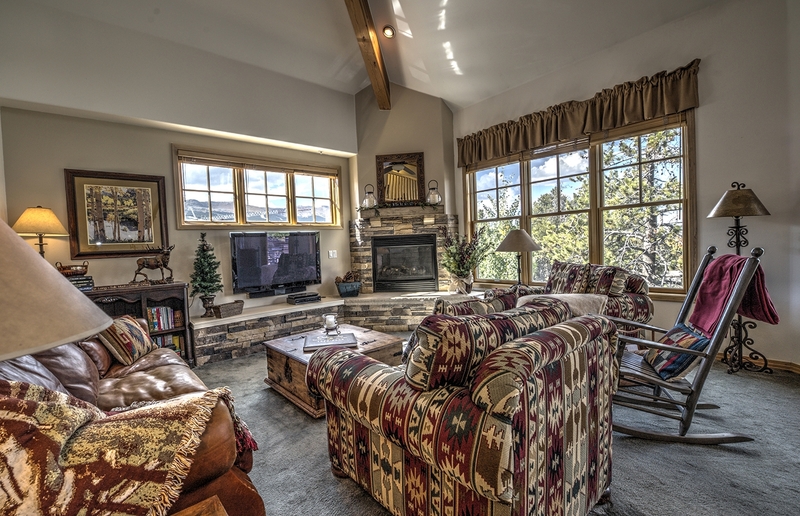 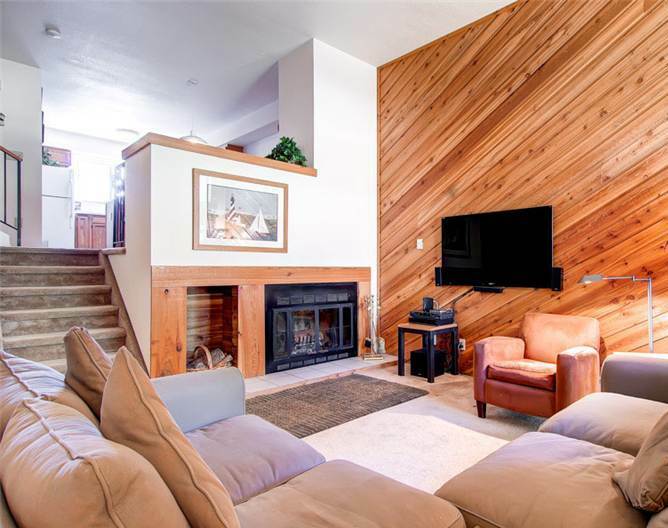 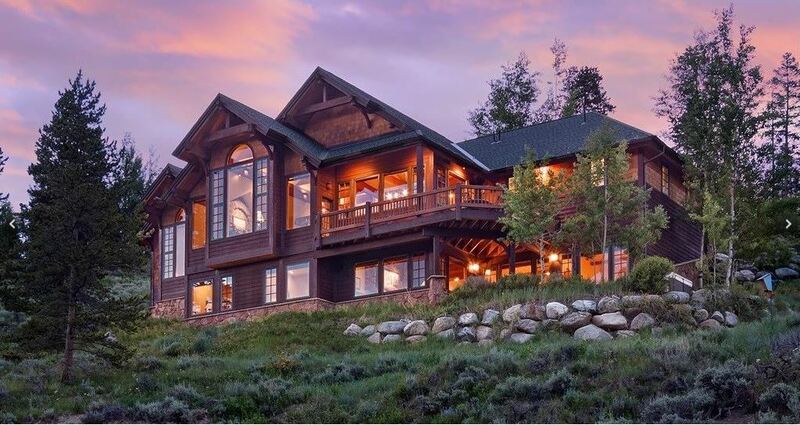 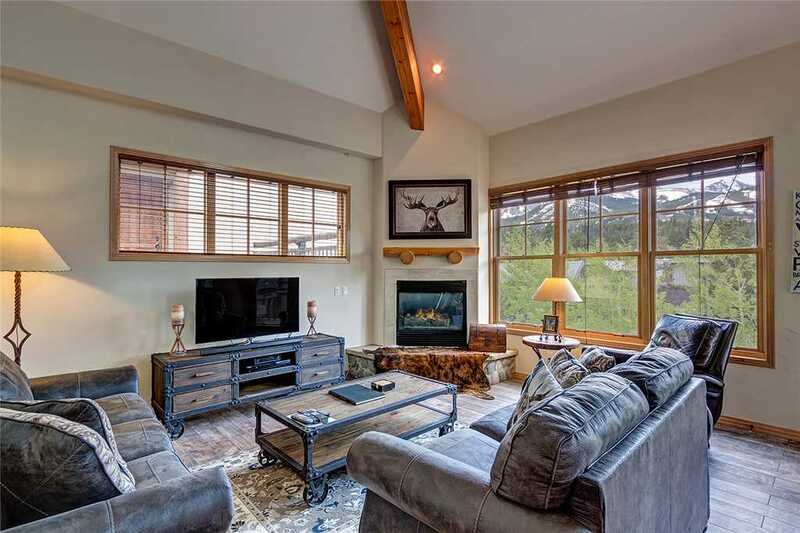 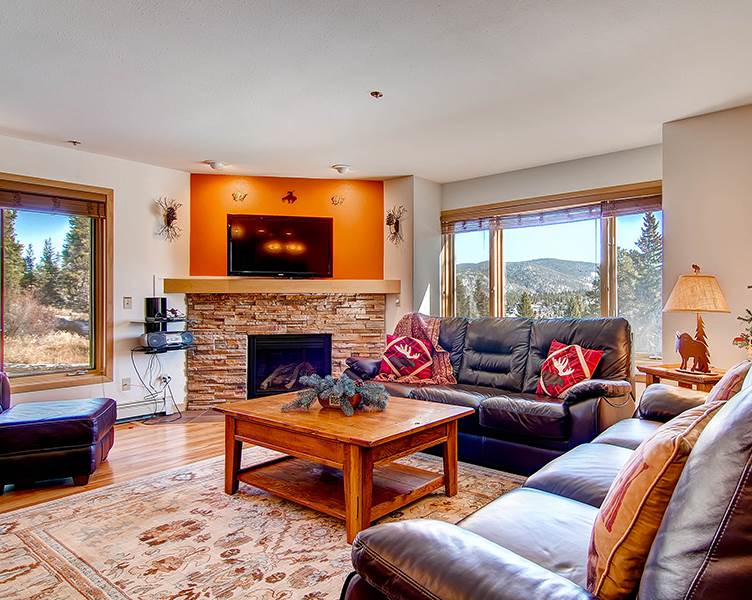 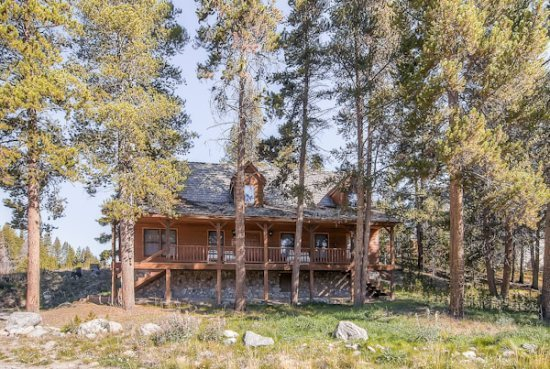 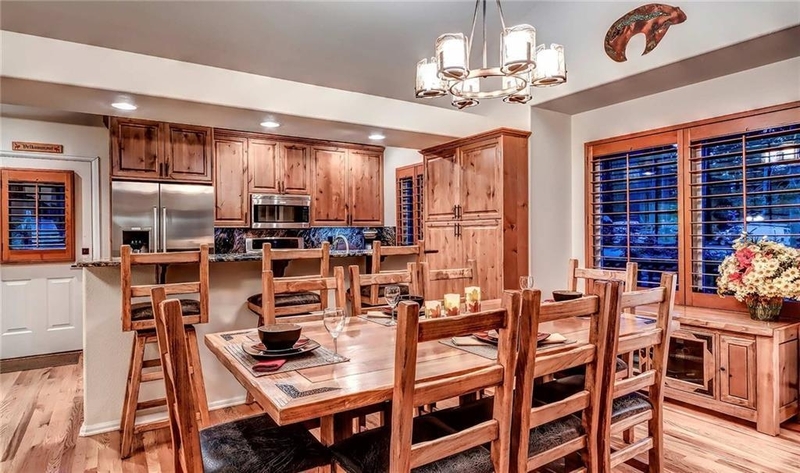 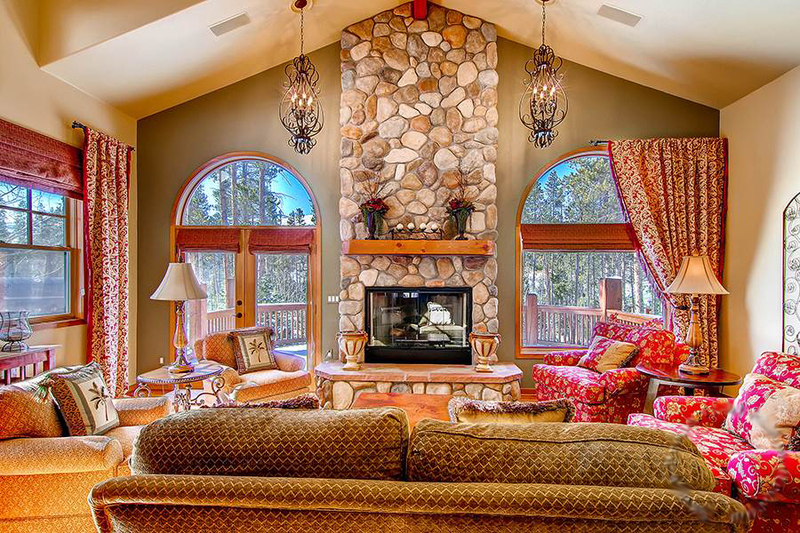 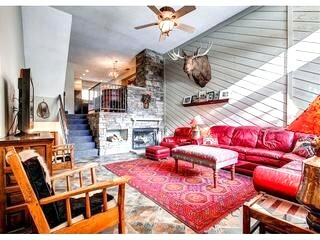 Call us today to learn more about this unique and fabulous mountain home. 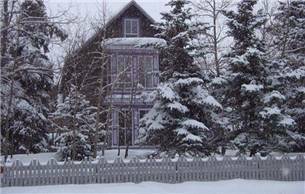 PLEASE NOTE: a four-wheel drive vehicle is required during winter. 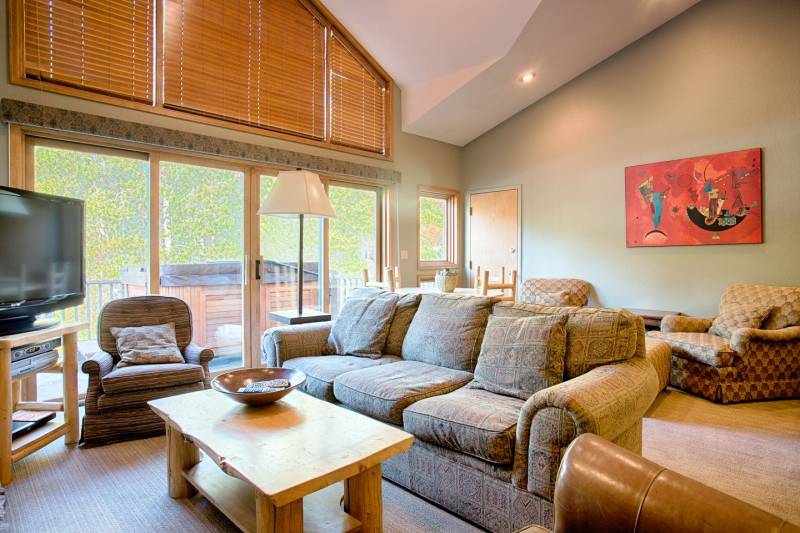 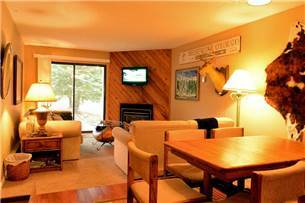 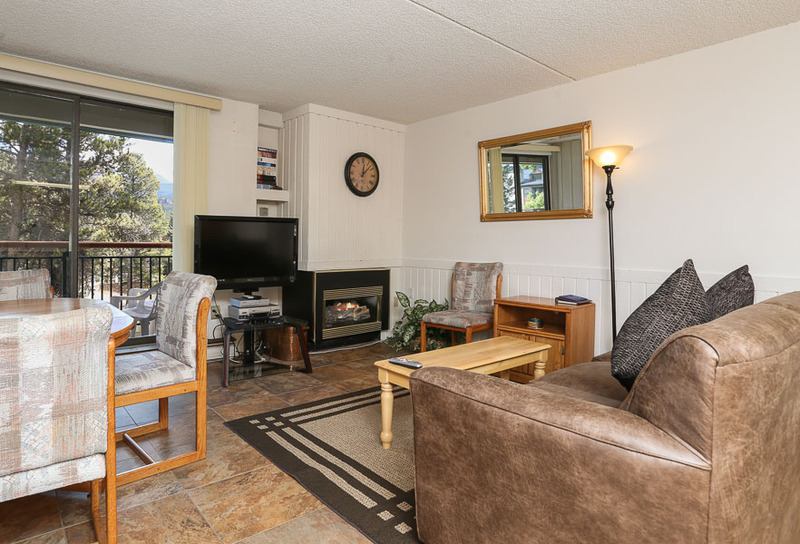 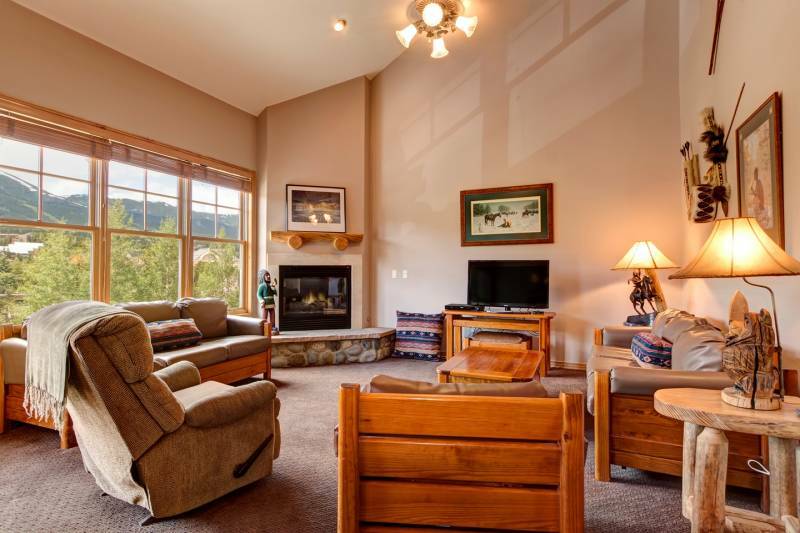 – King master suite: vaulted ceilings with a king bed, LCD TV, private bathroom with walk in shower, private balcony, mountain and river views. 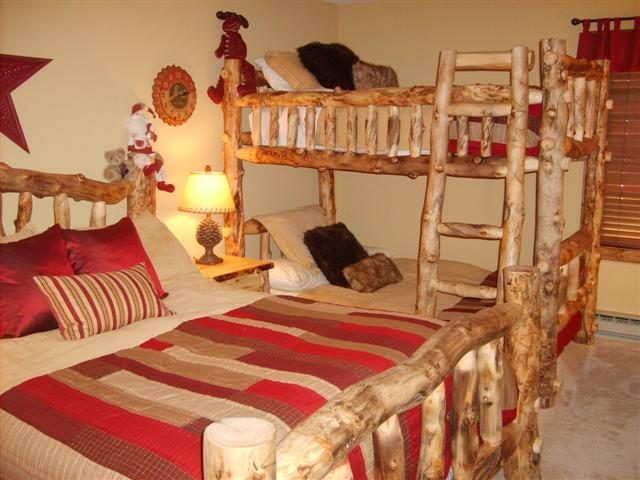 – Bedroom 3: twin-over-twin bunk bed. 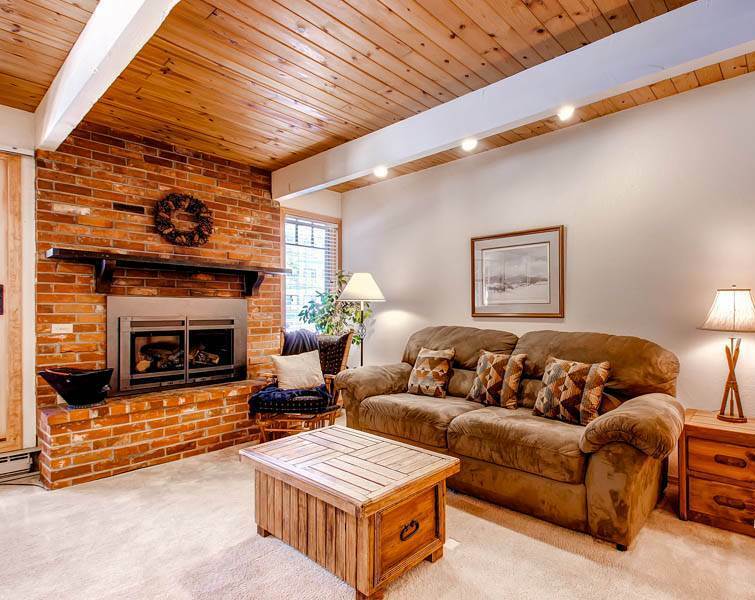 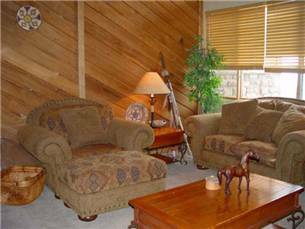 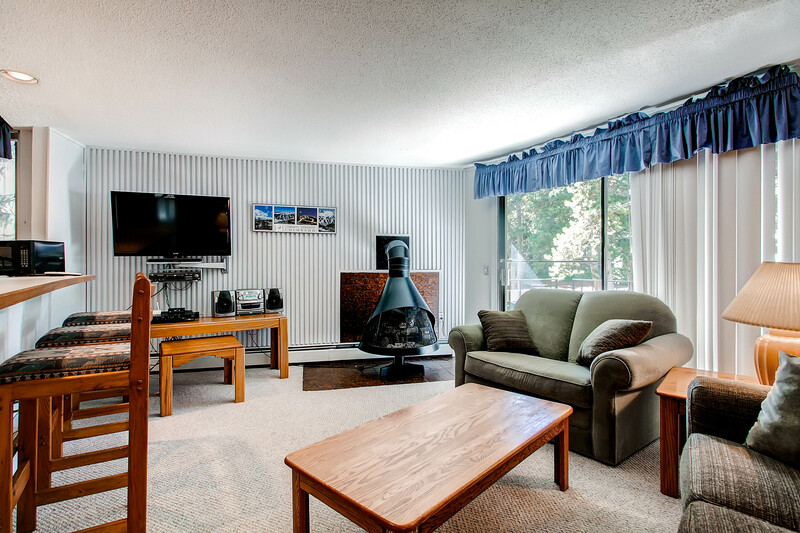 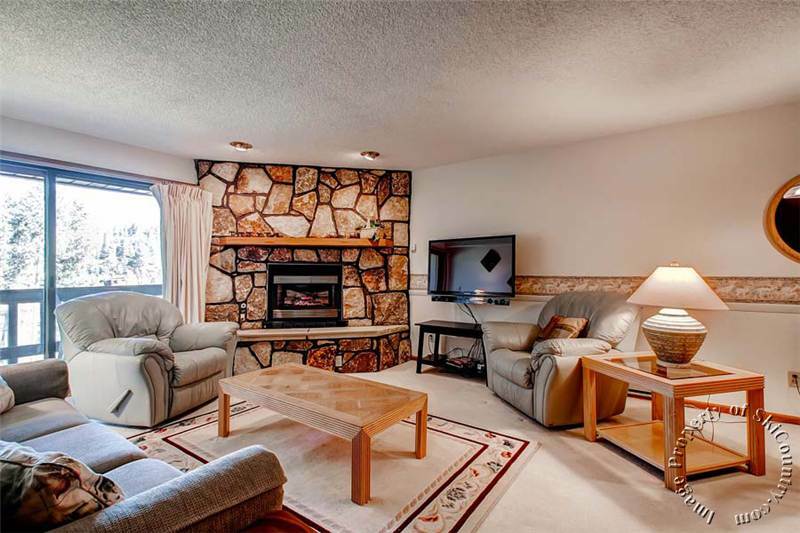 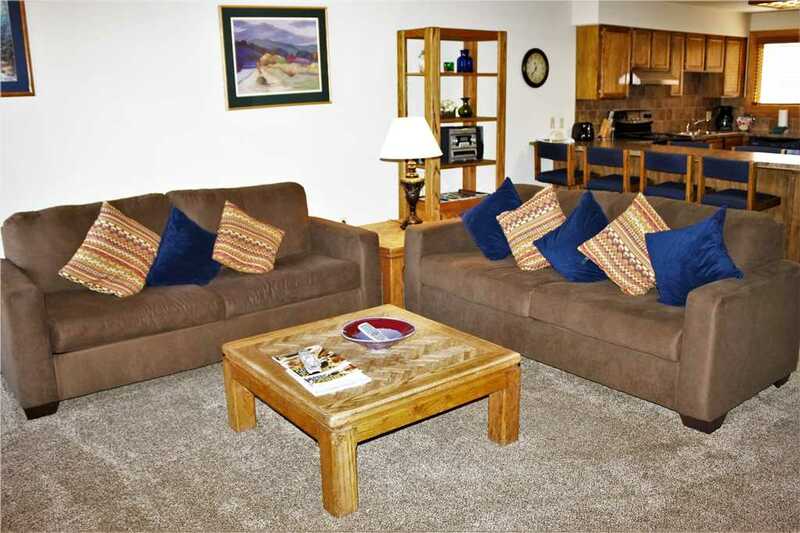 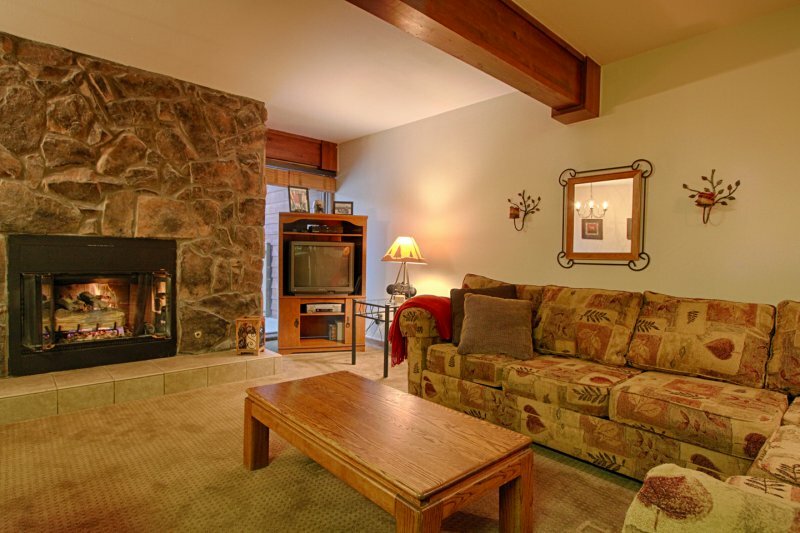 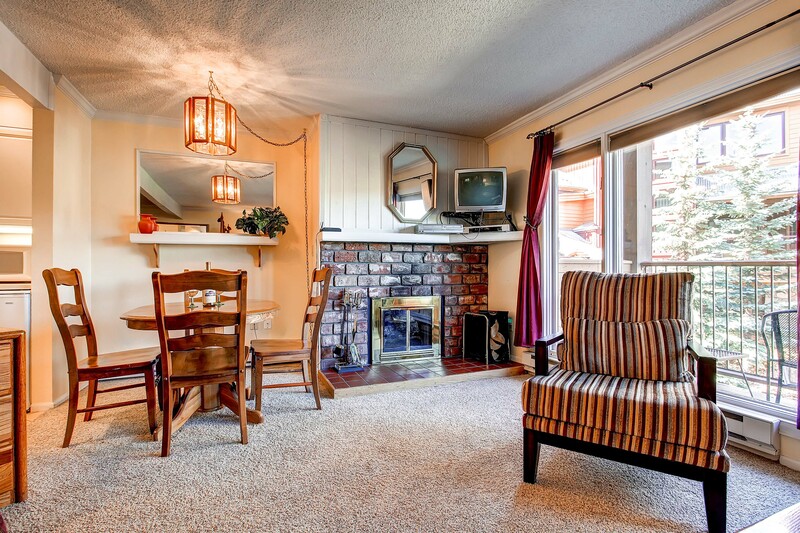 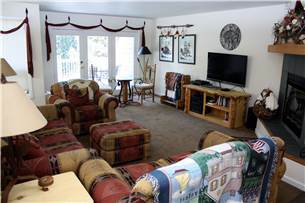 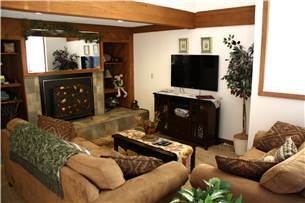 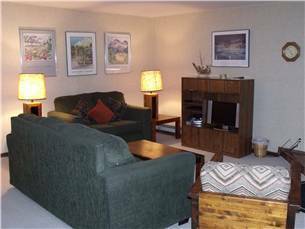 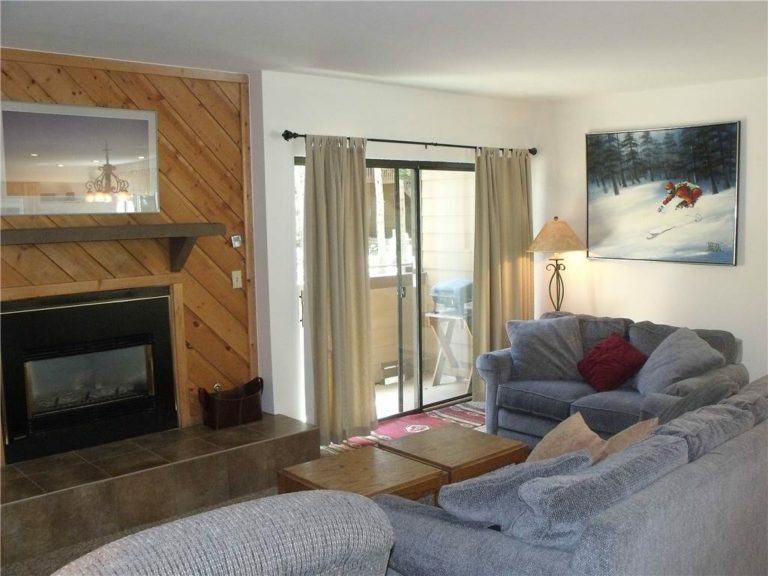 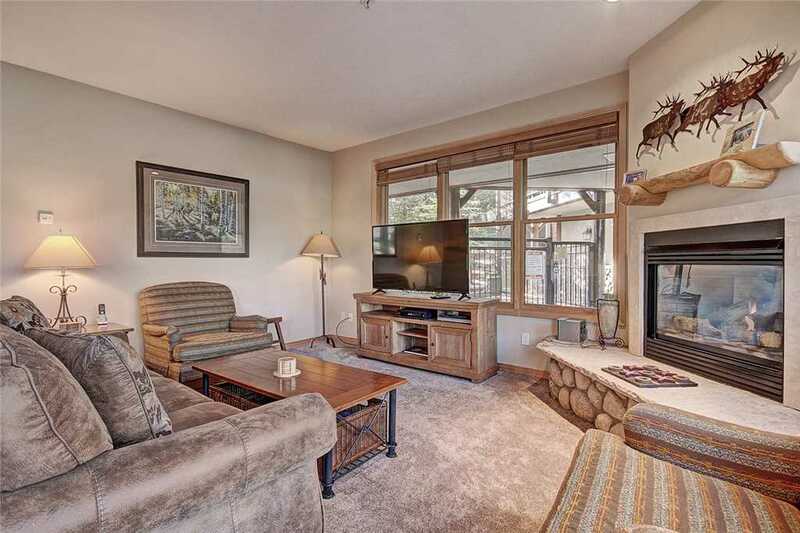 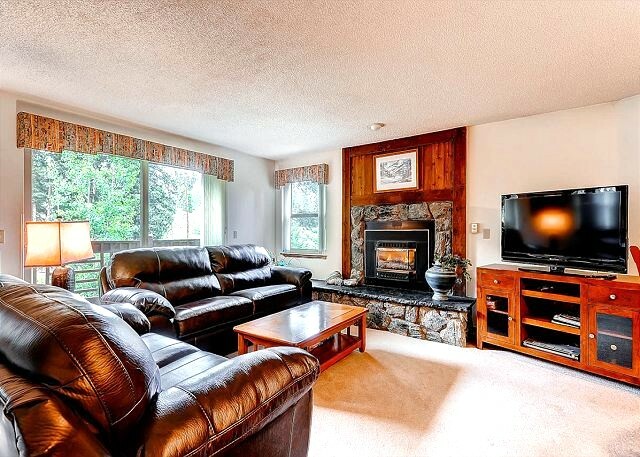 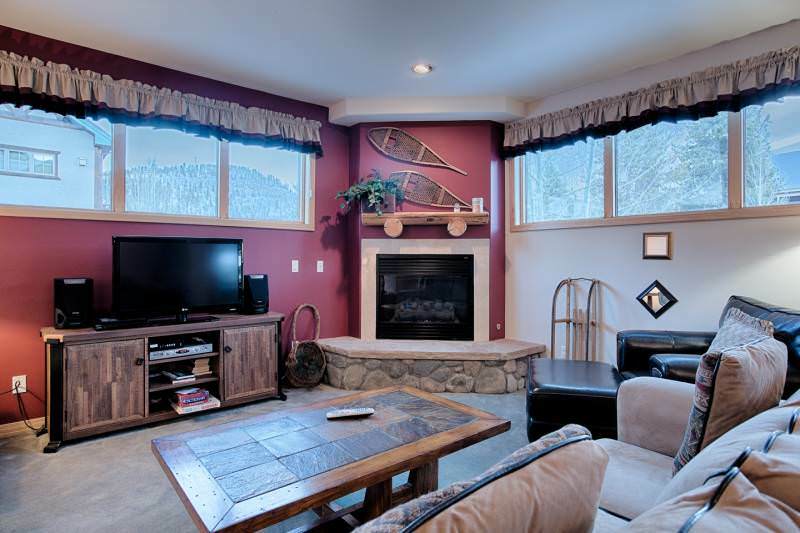 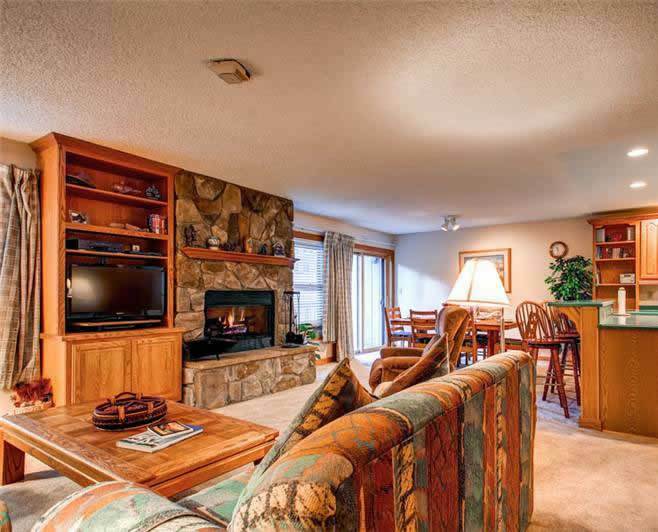 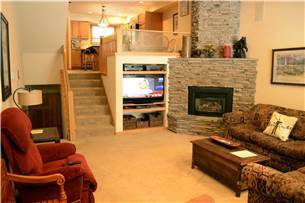 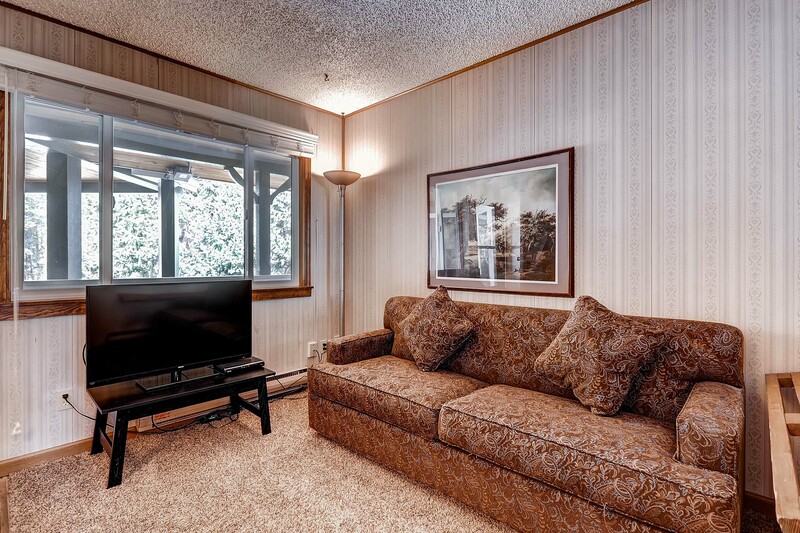 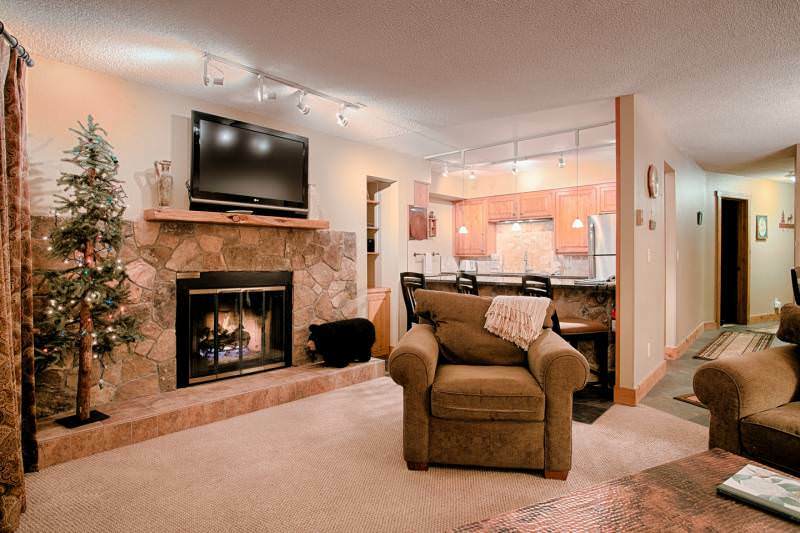 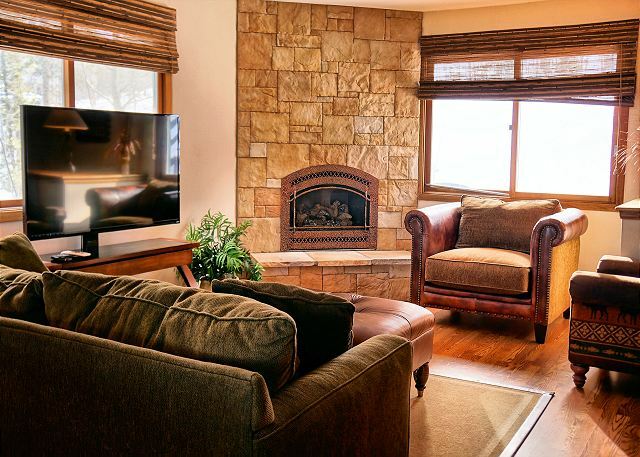 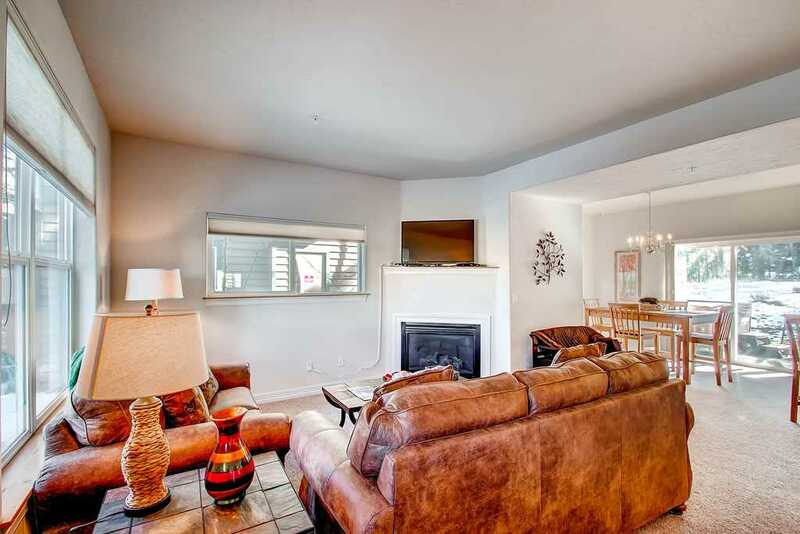 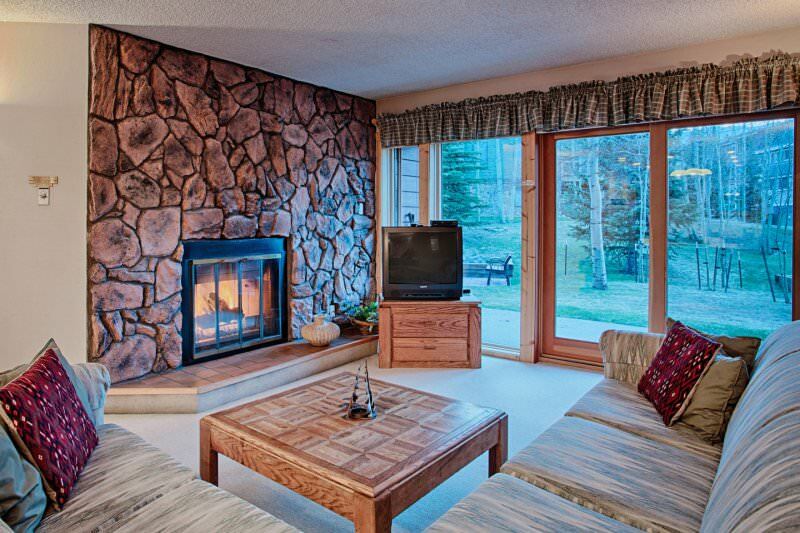 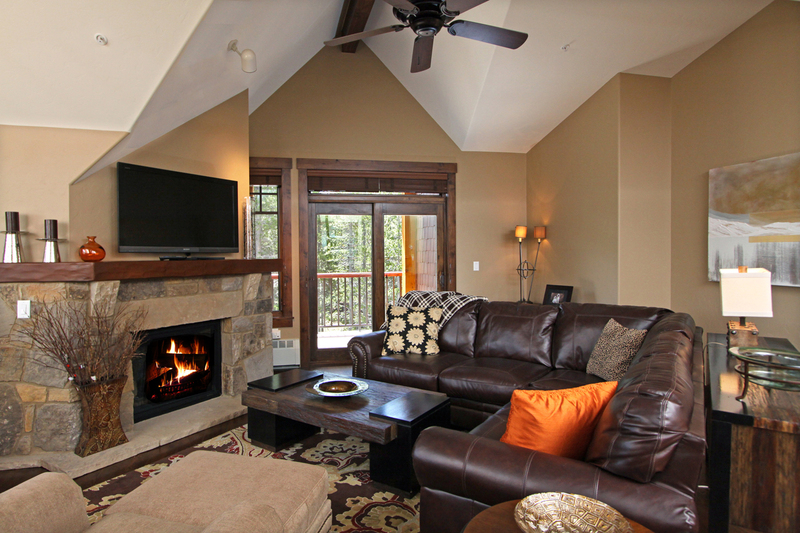 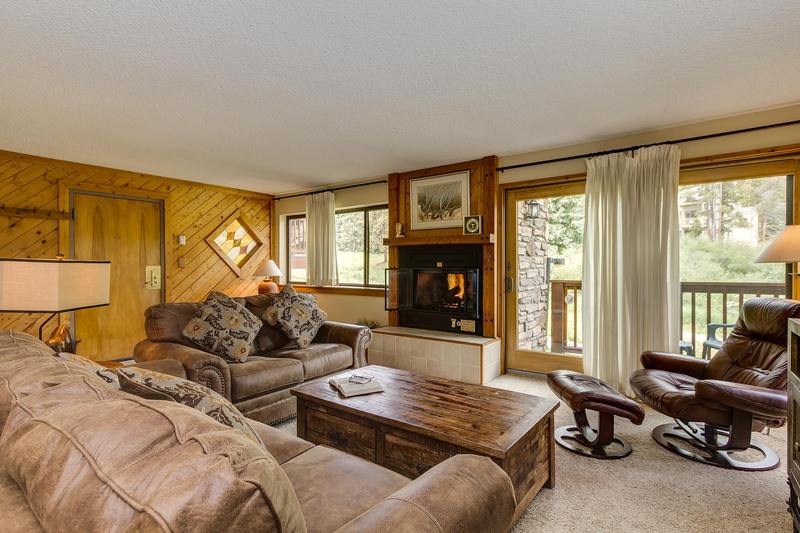 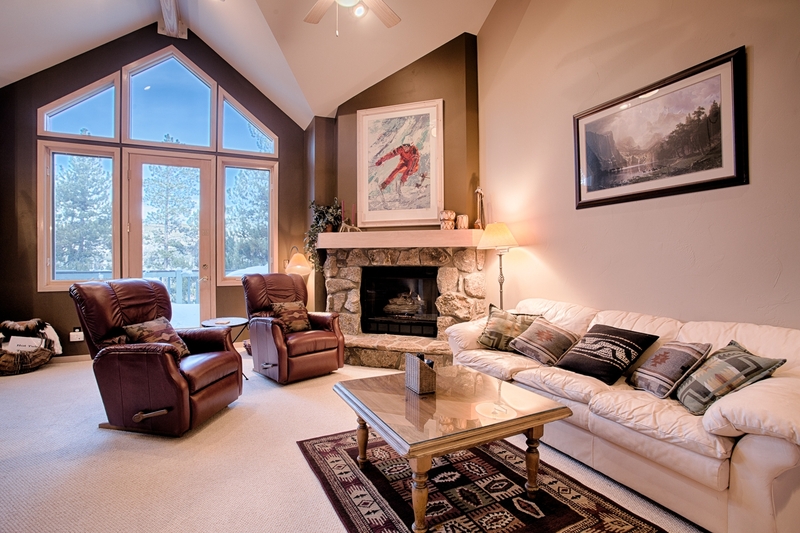 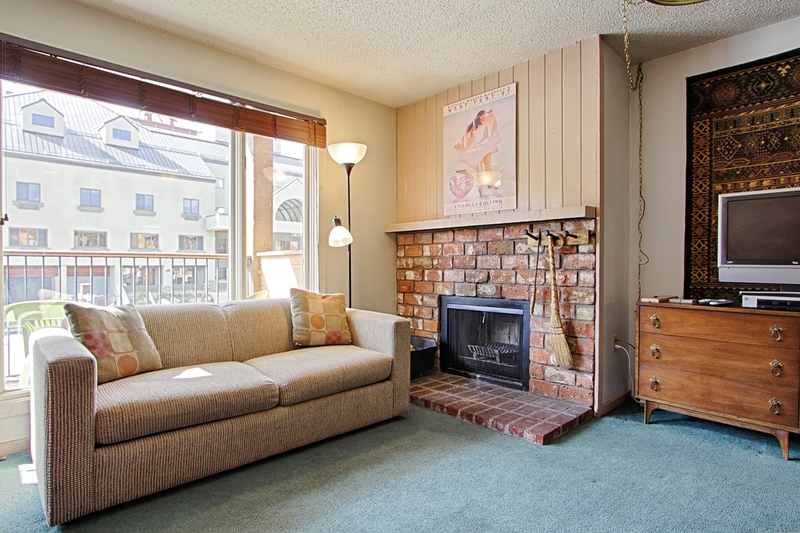 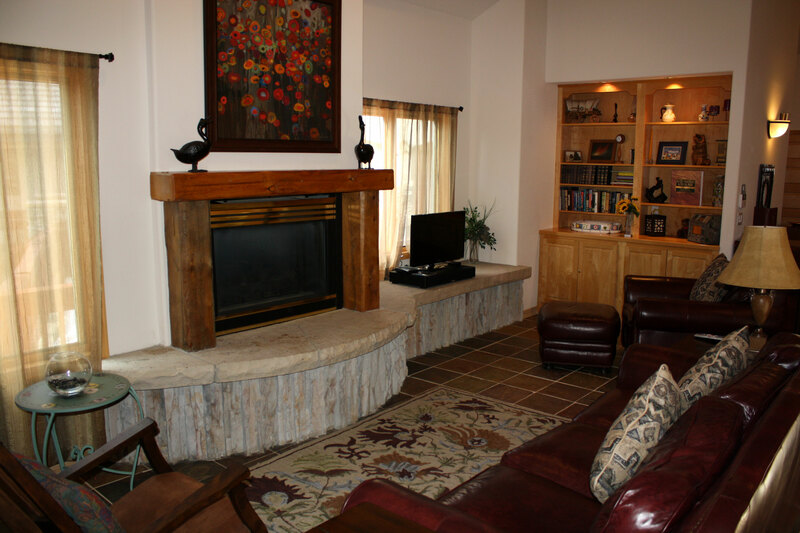 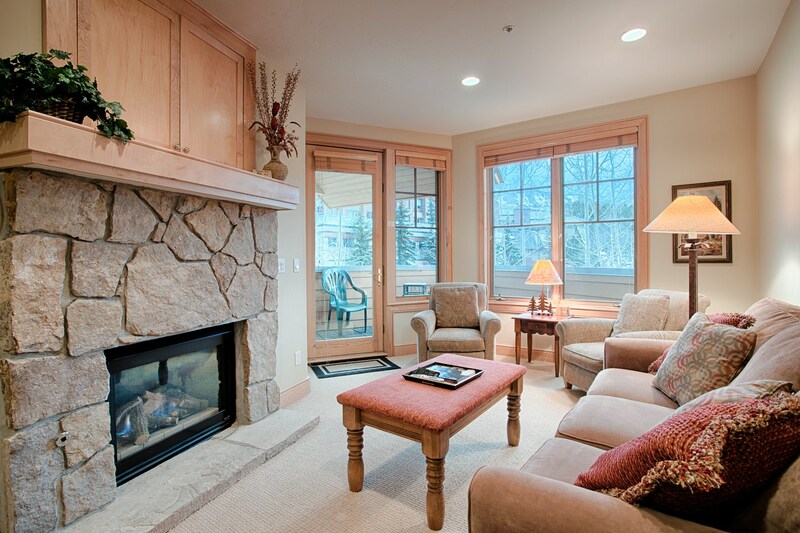 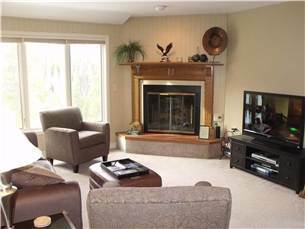 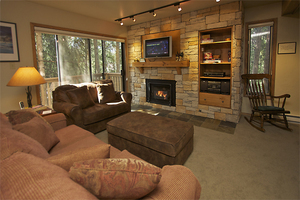 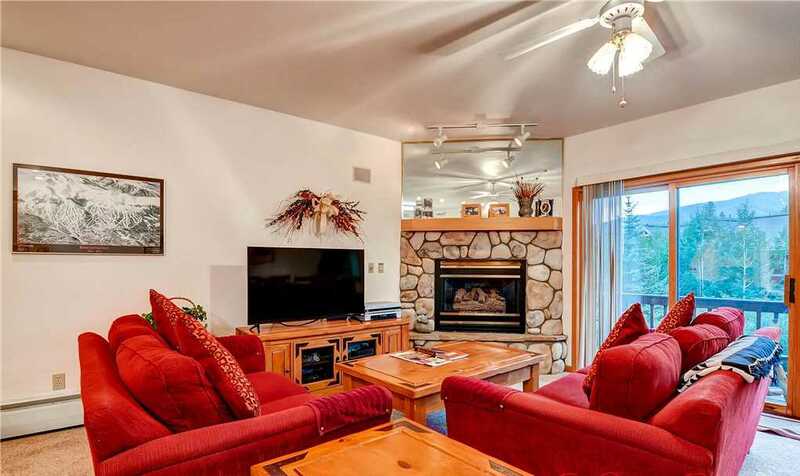 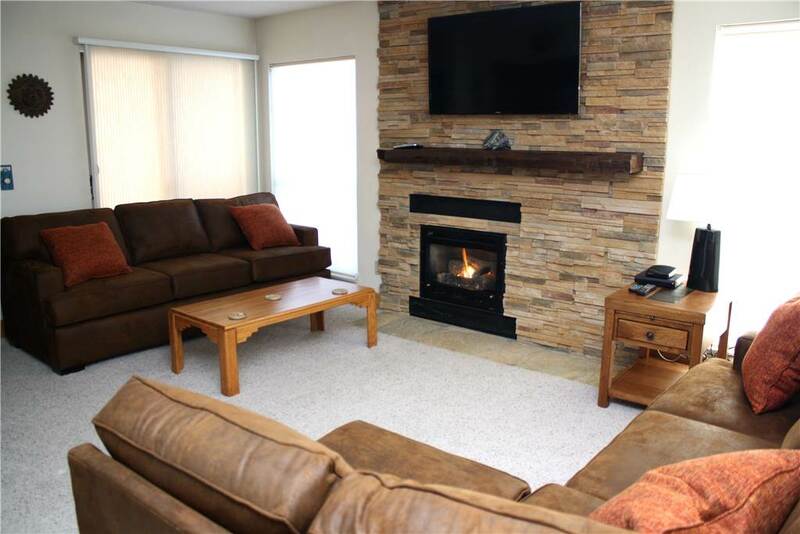 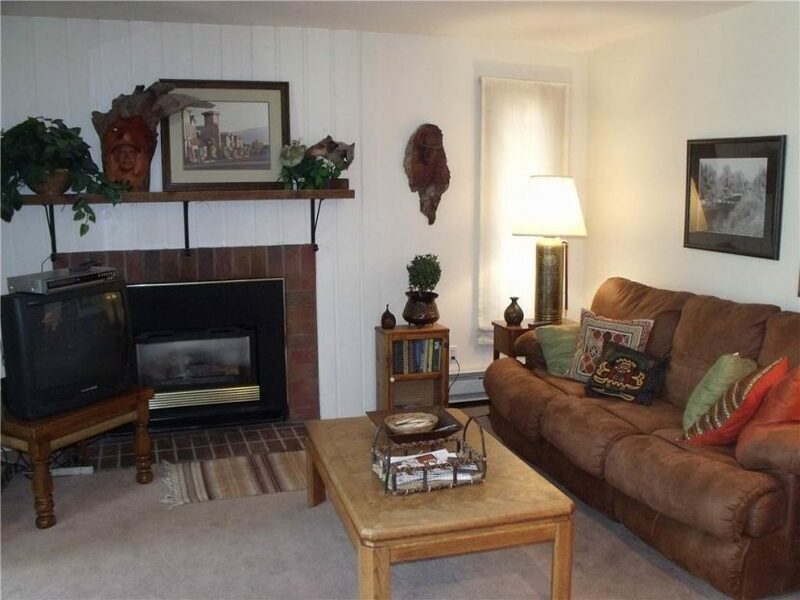 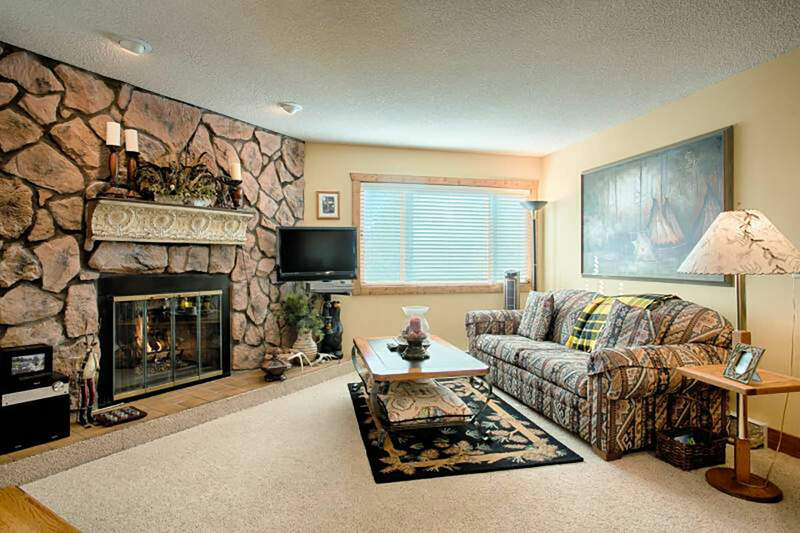 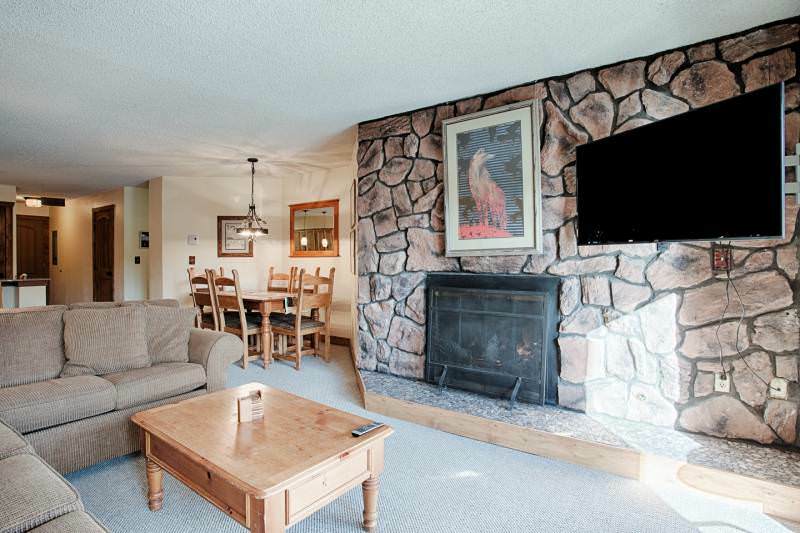 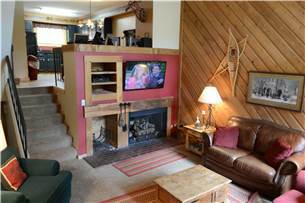 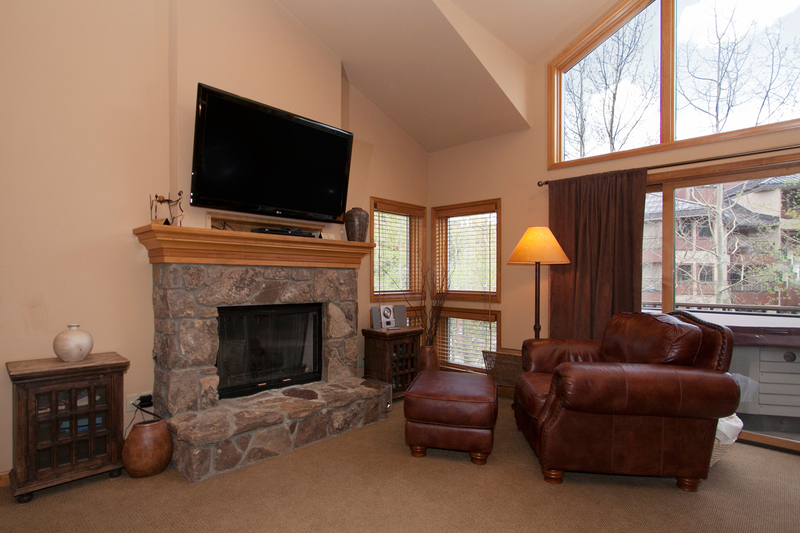 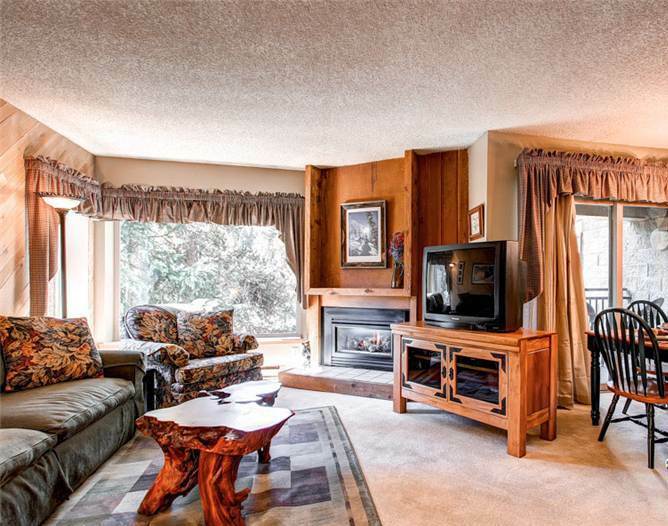 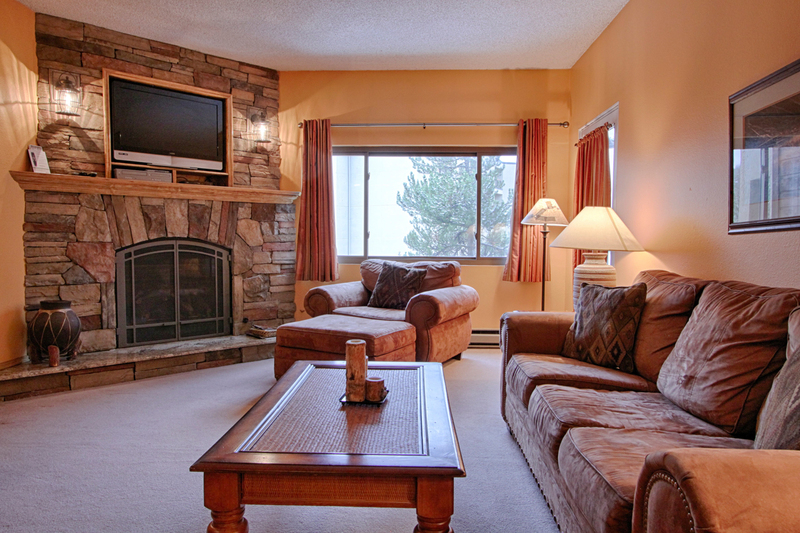 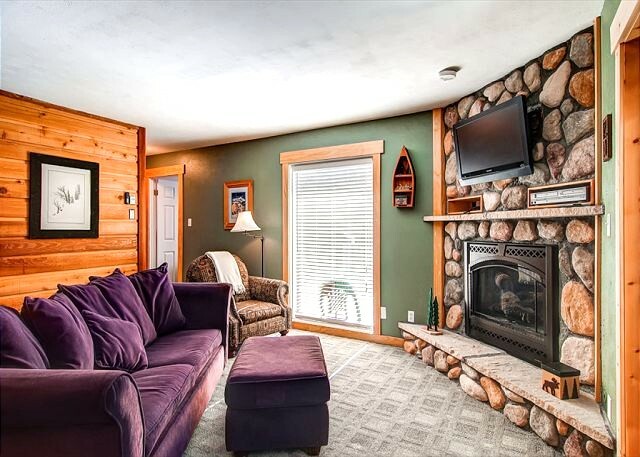 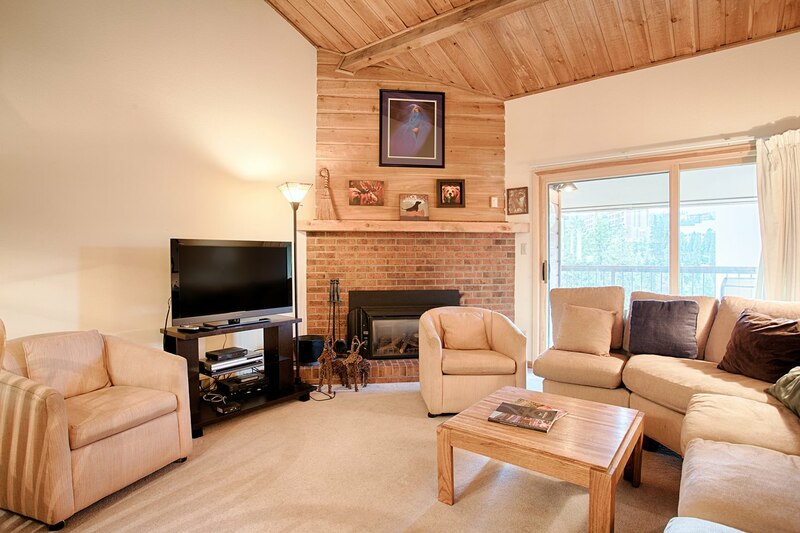 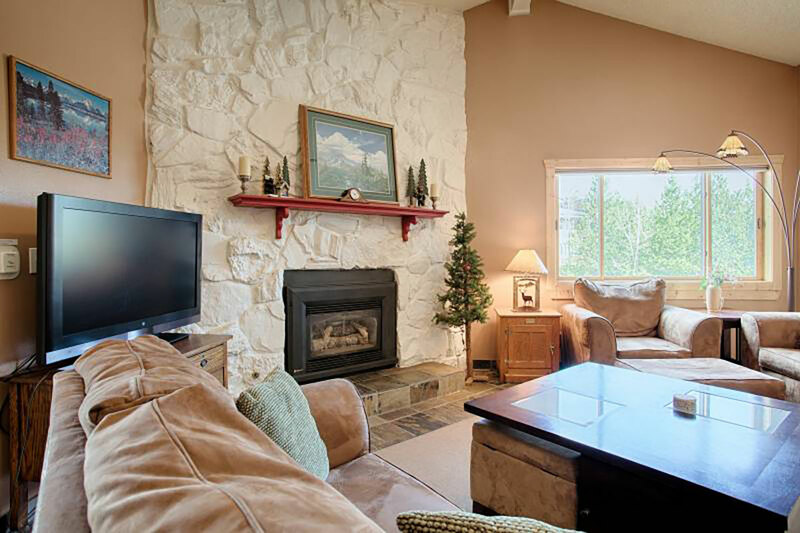 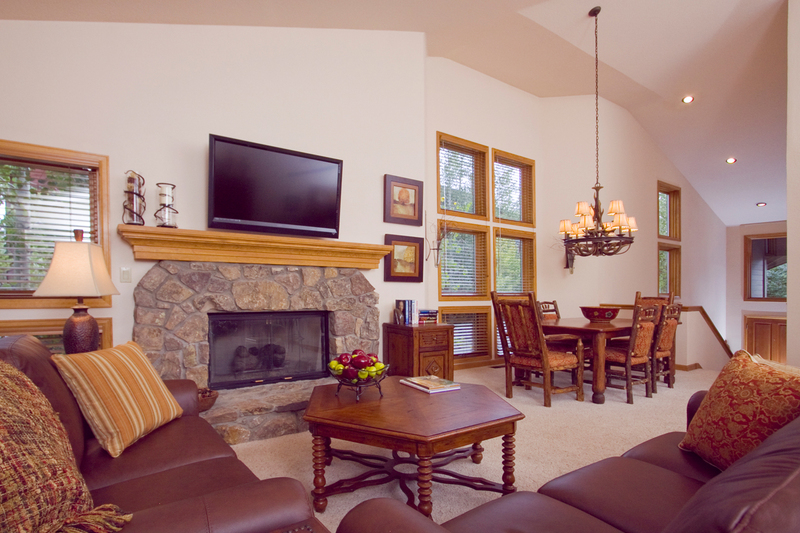 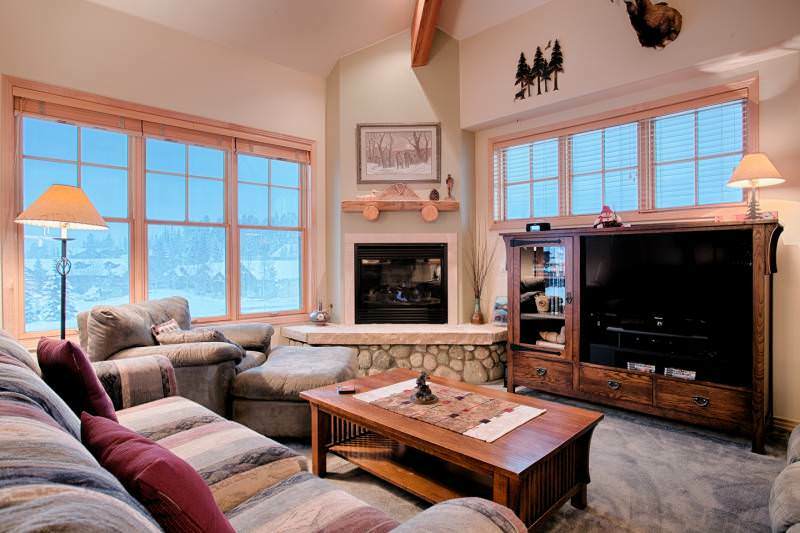 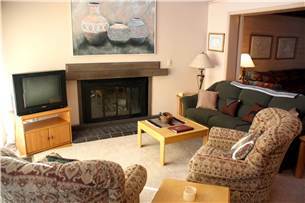 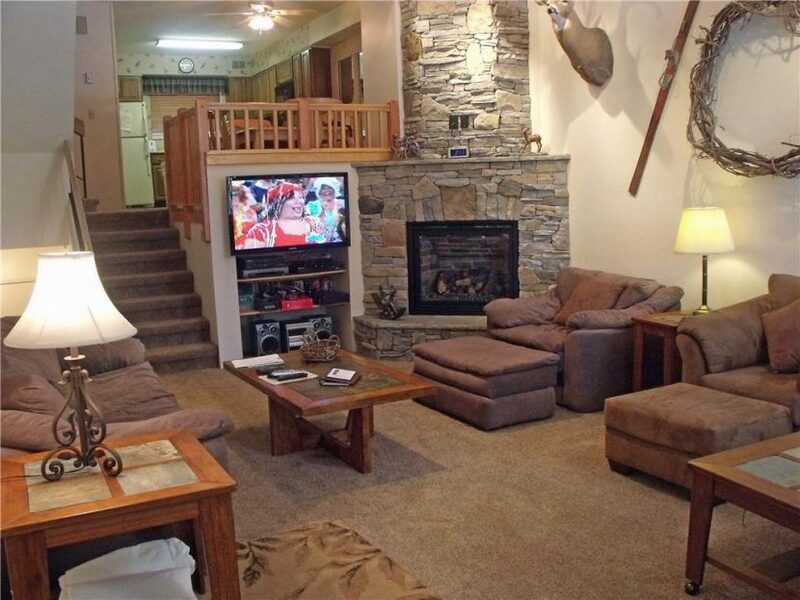 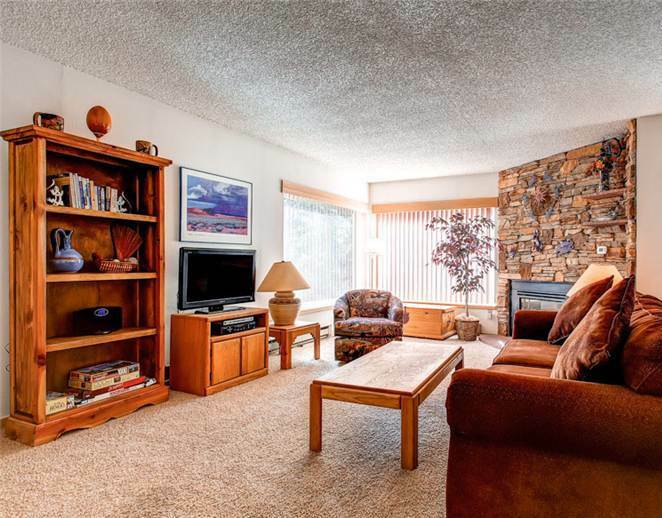 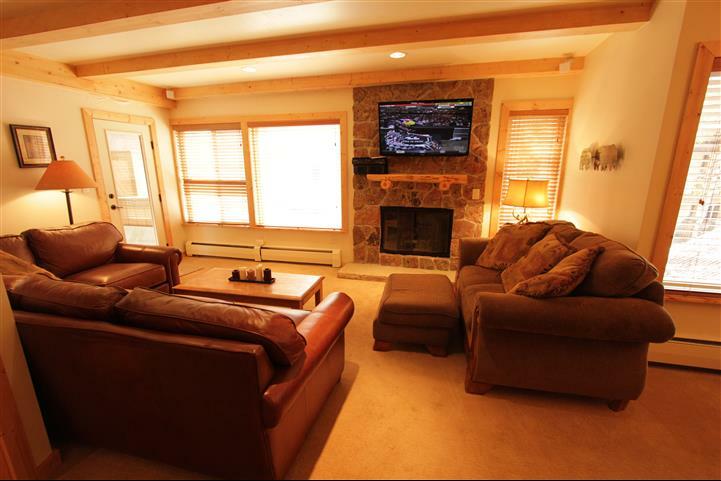 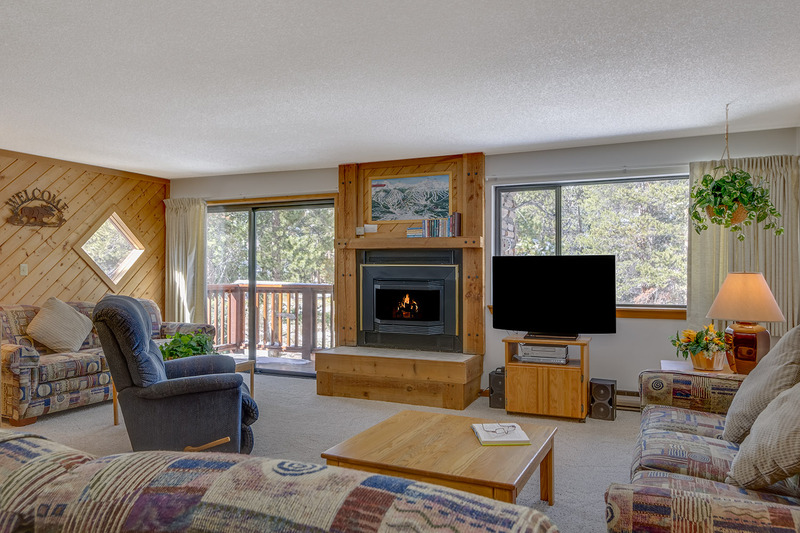 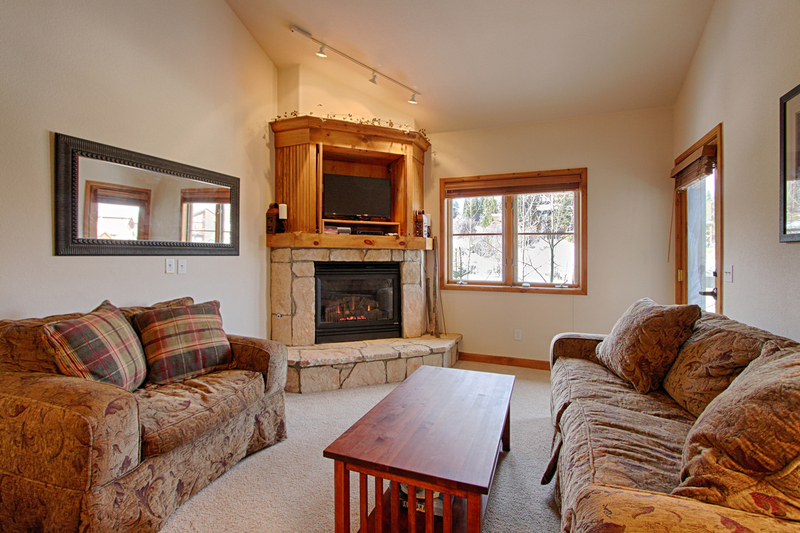 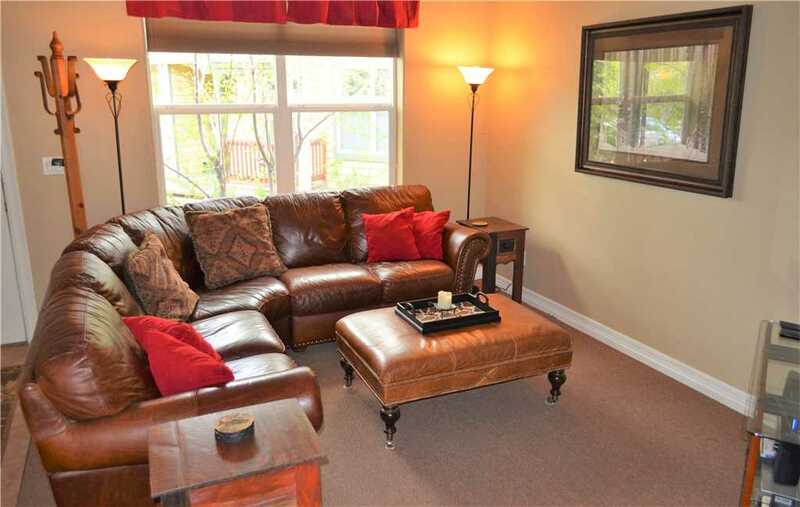 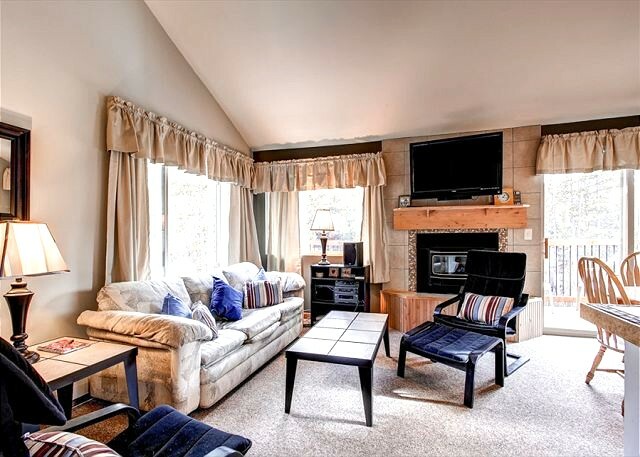 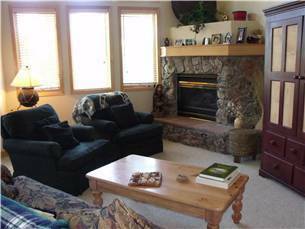 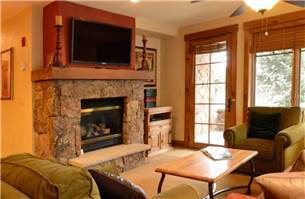 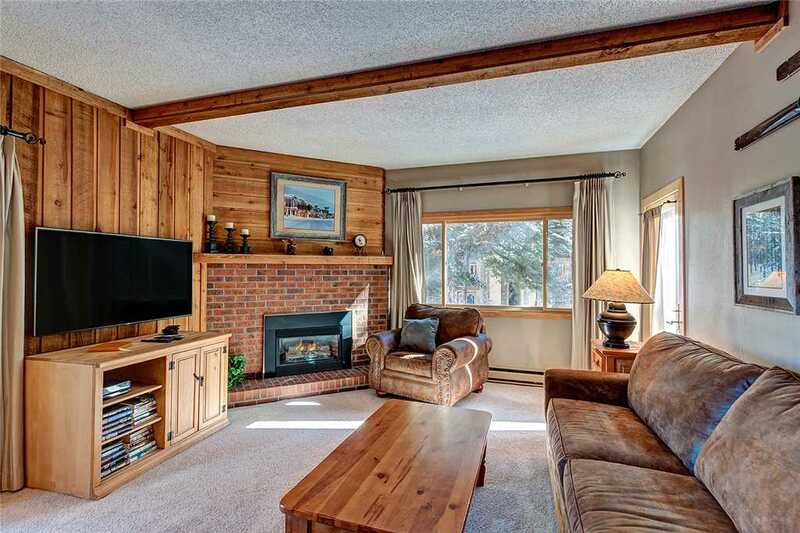 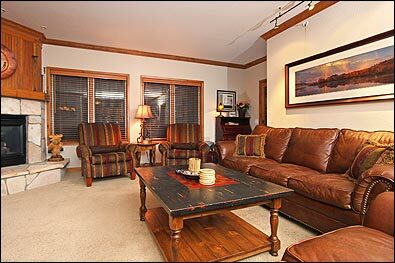 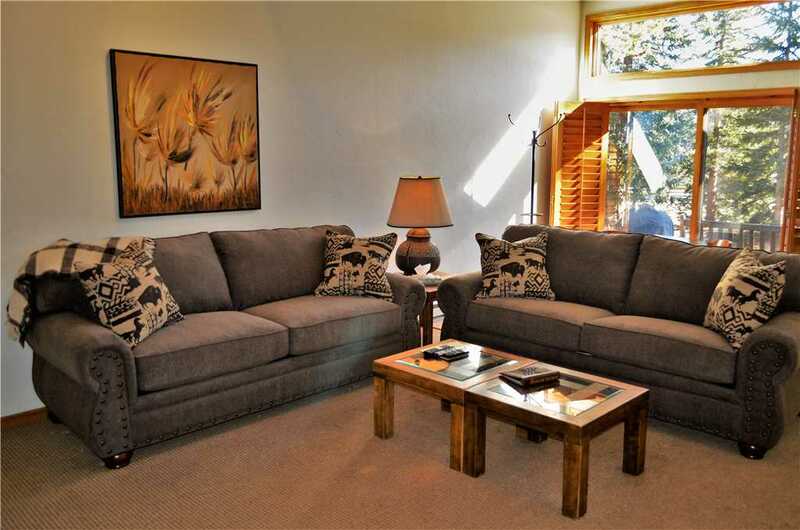 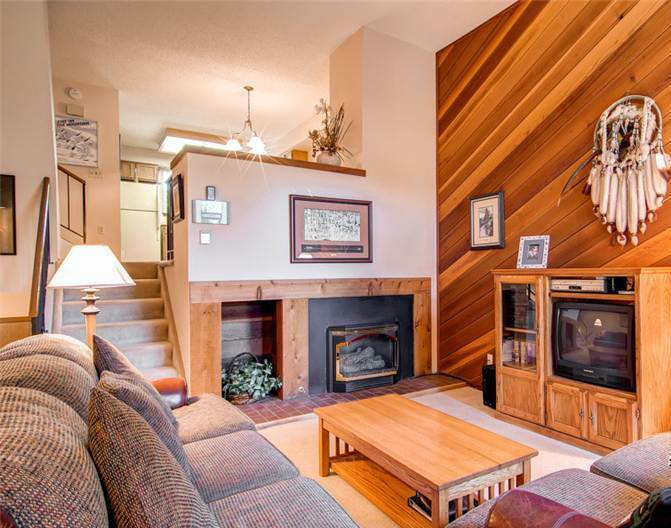 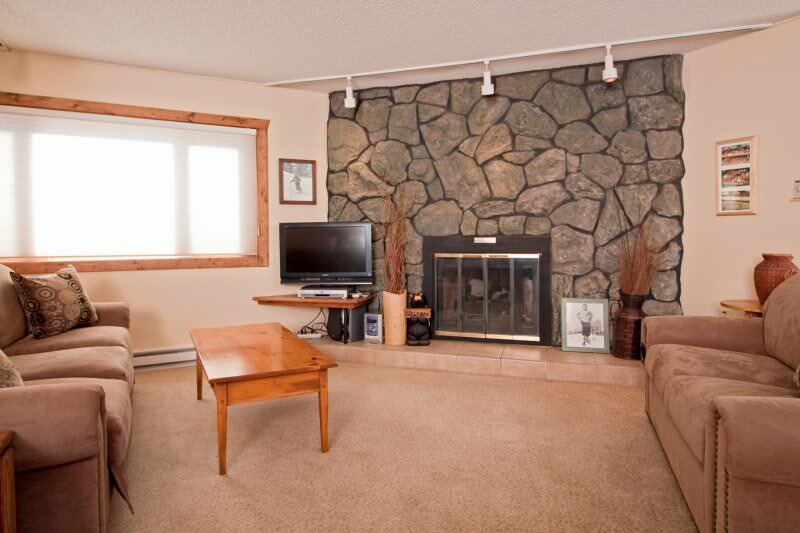 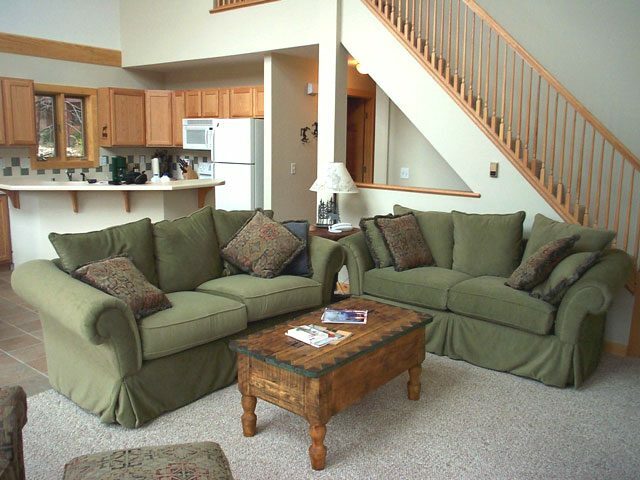 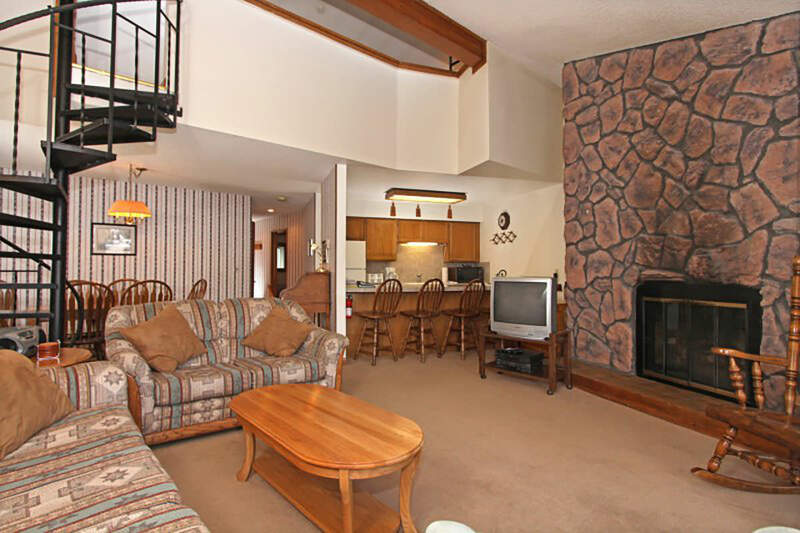 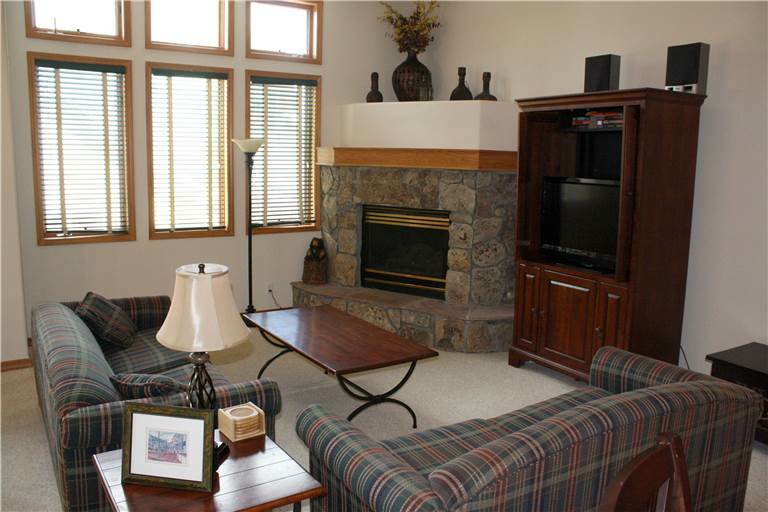 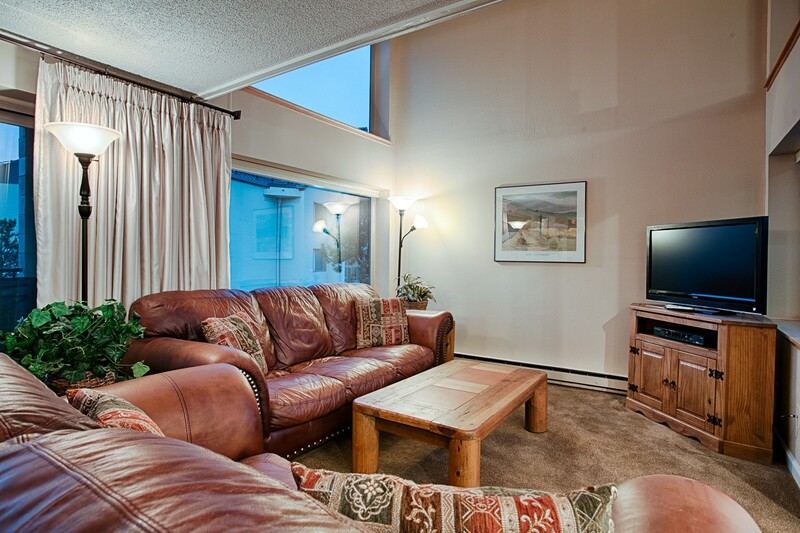 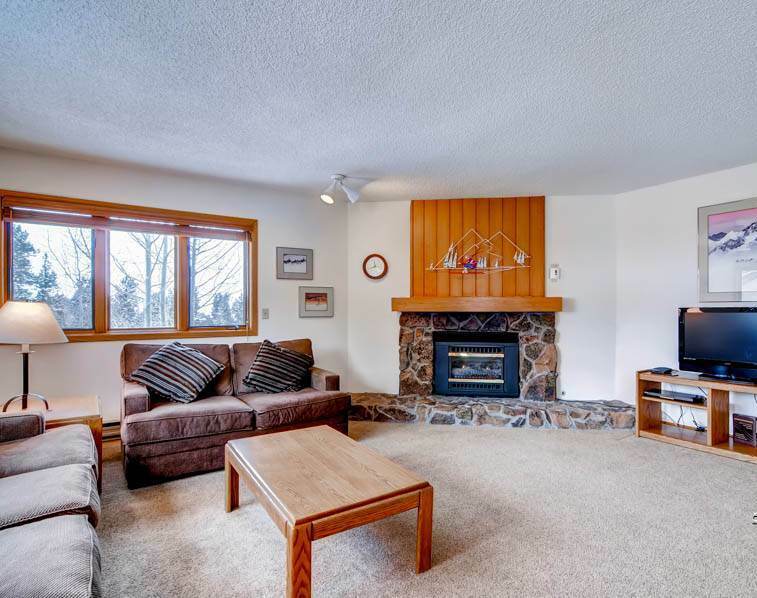 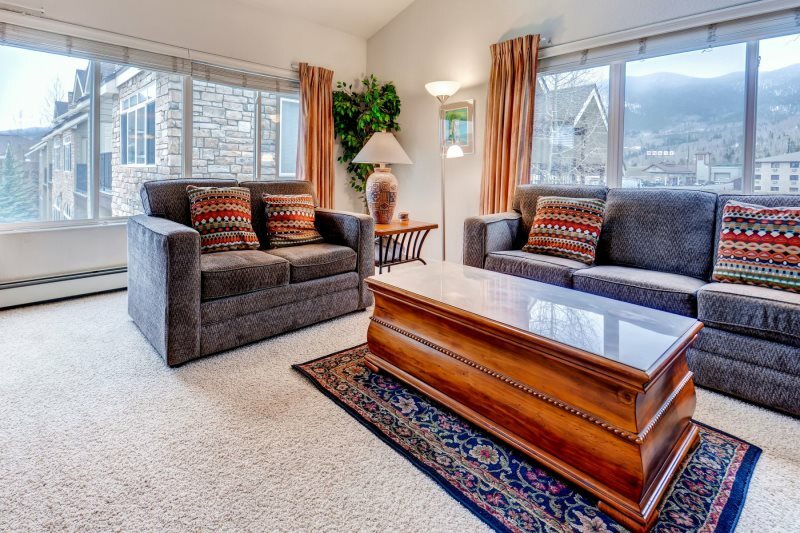 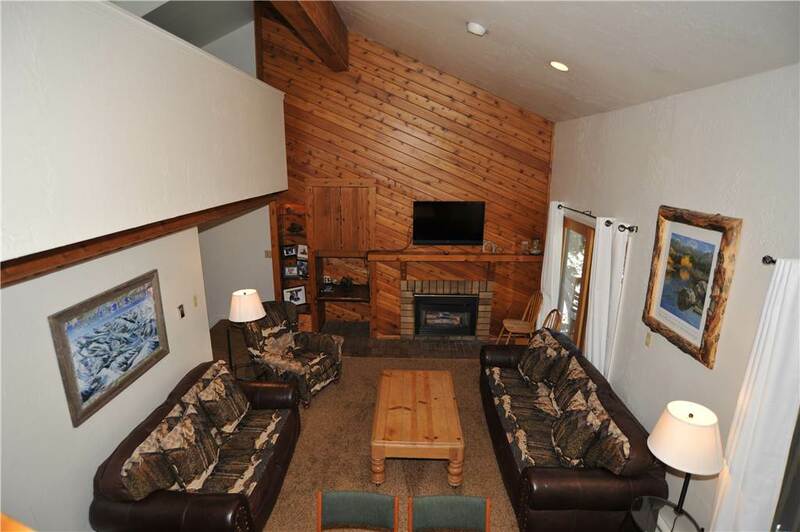 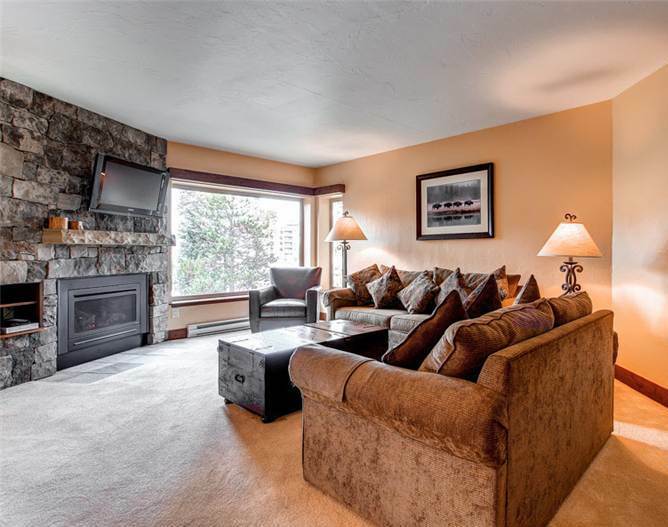 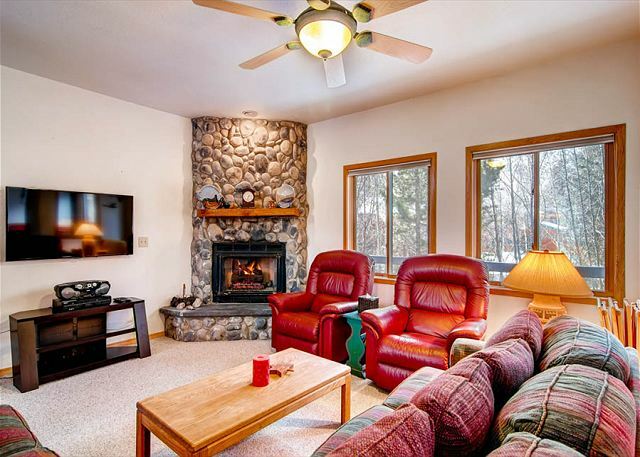 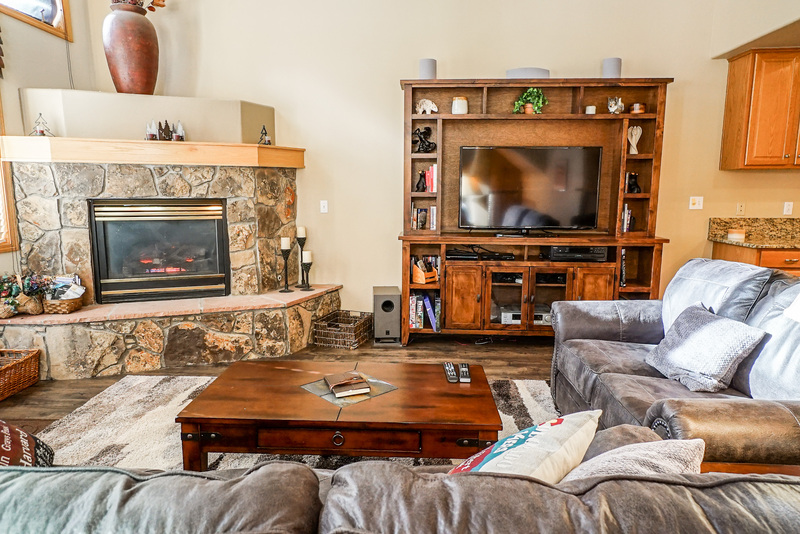 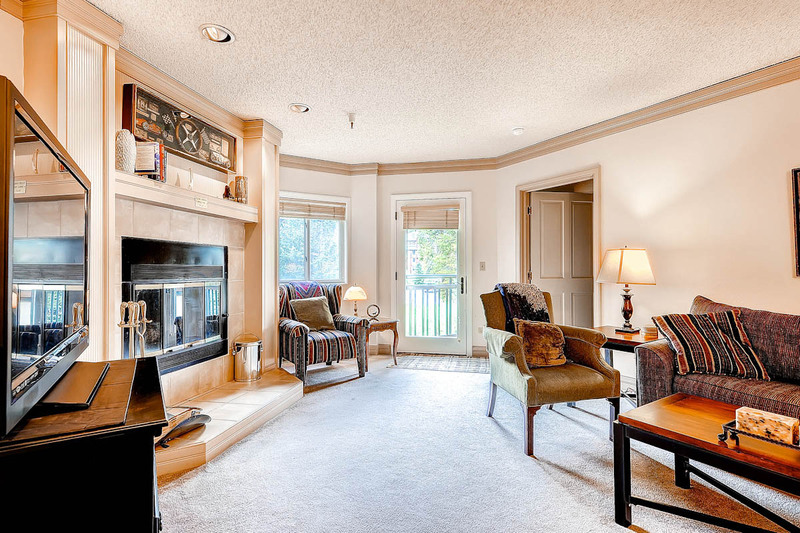 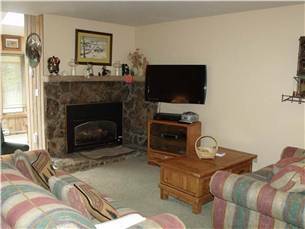 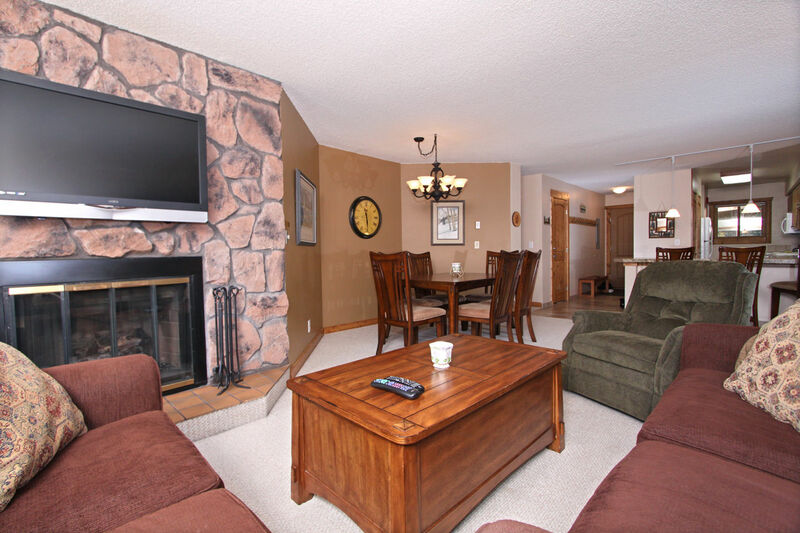 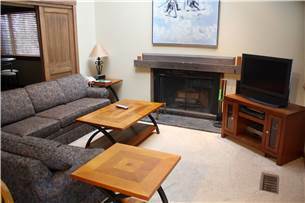 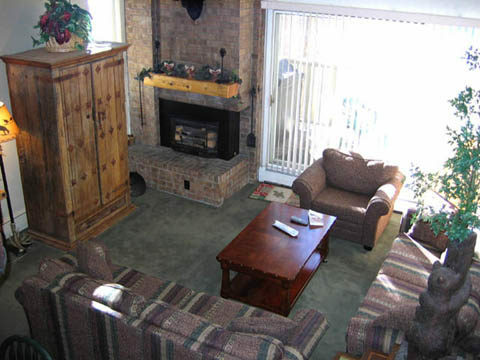 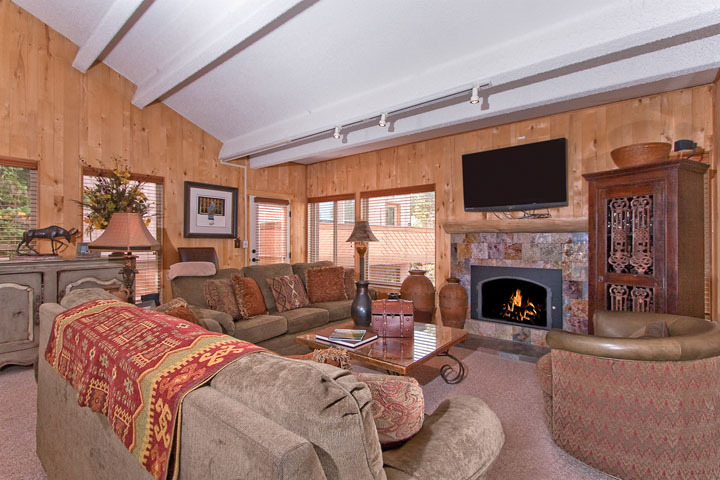 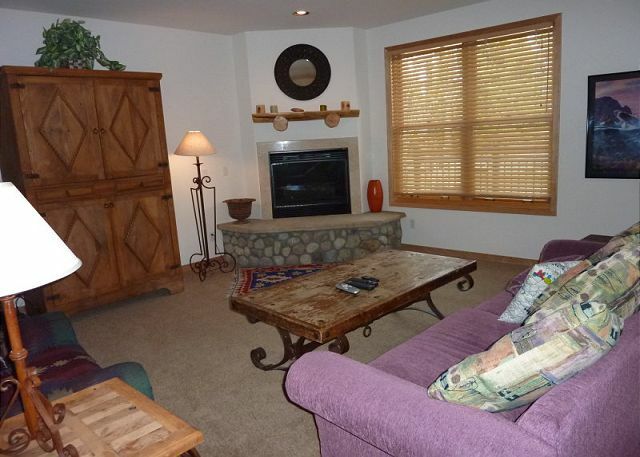 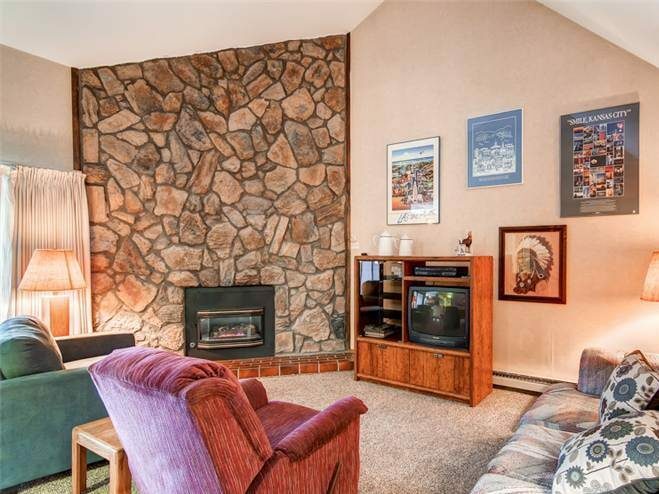 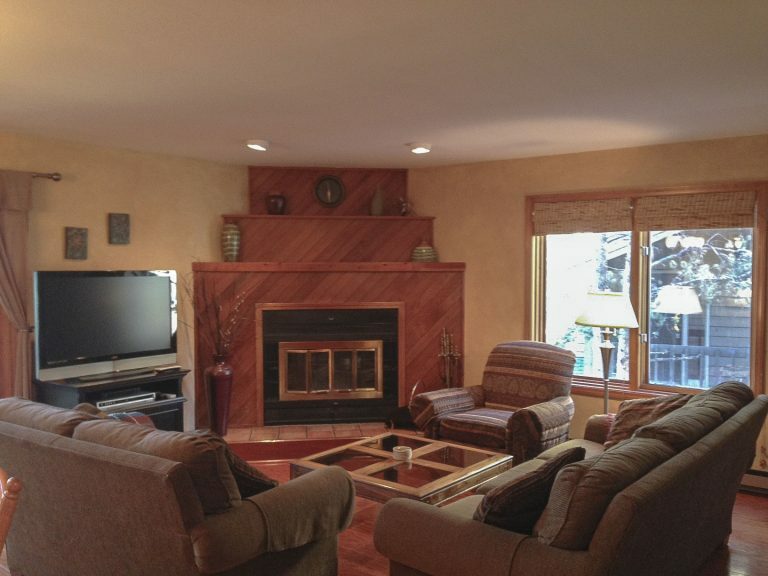 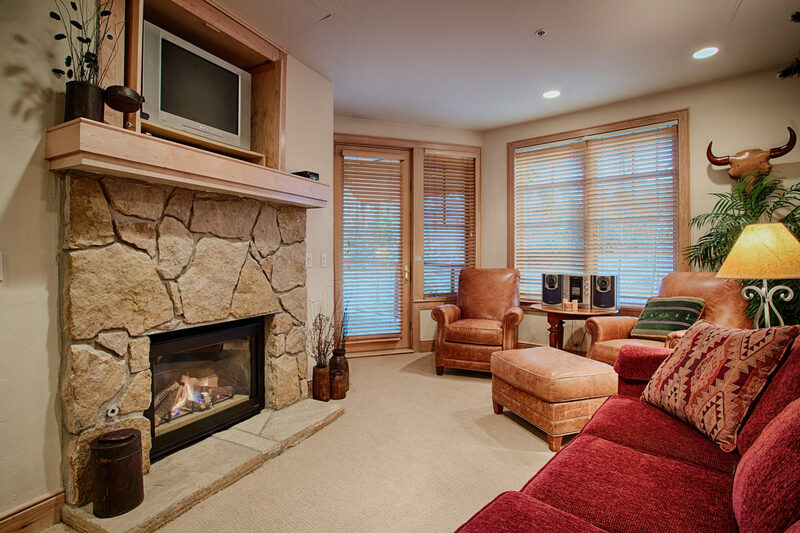 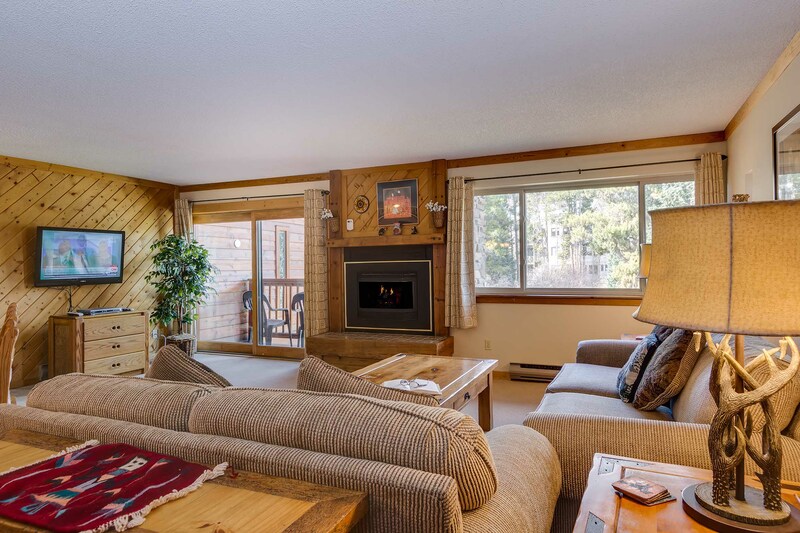 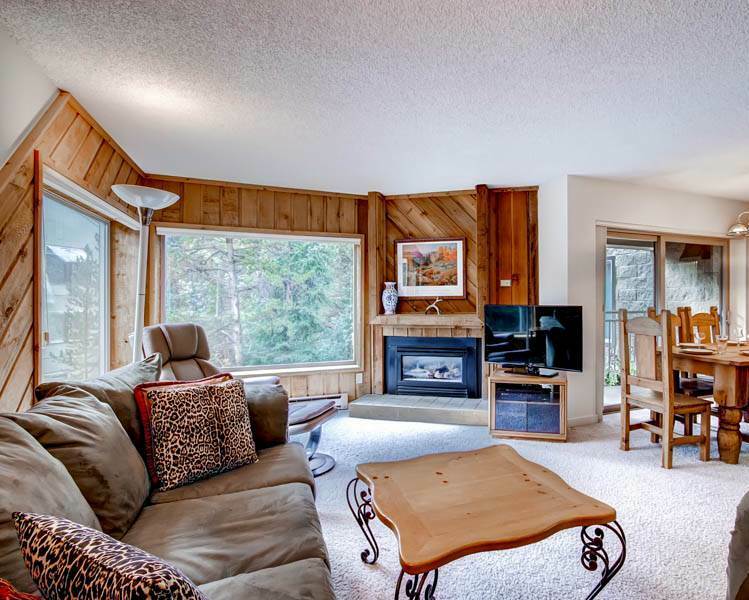 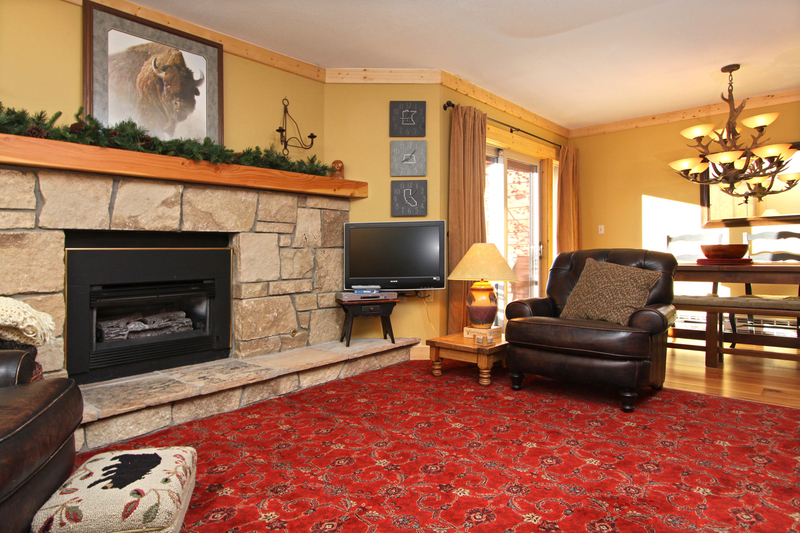 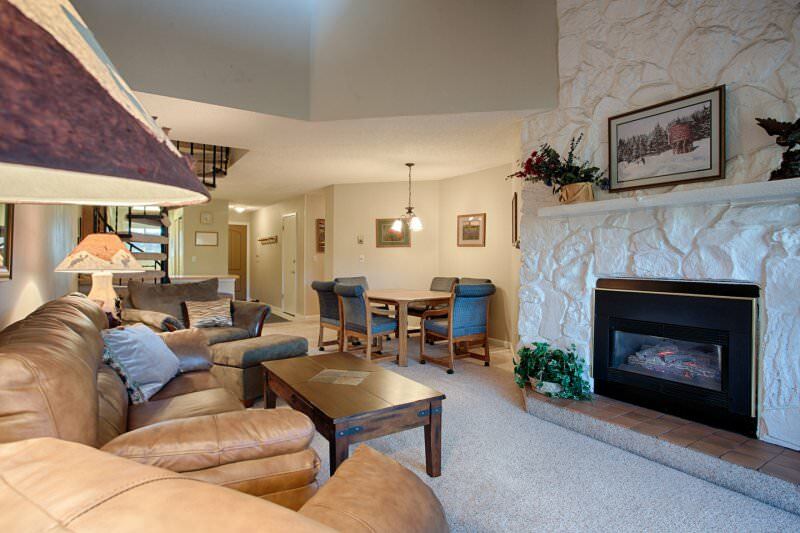 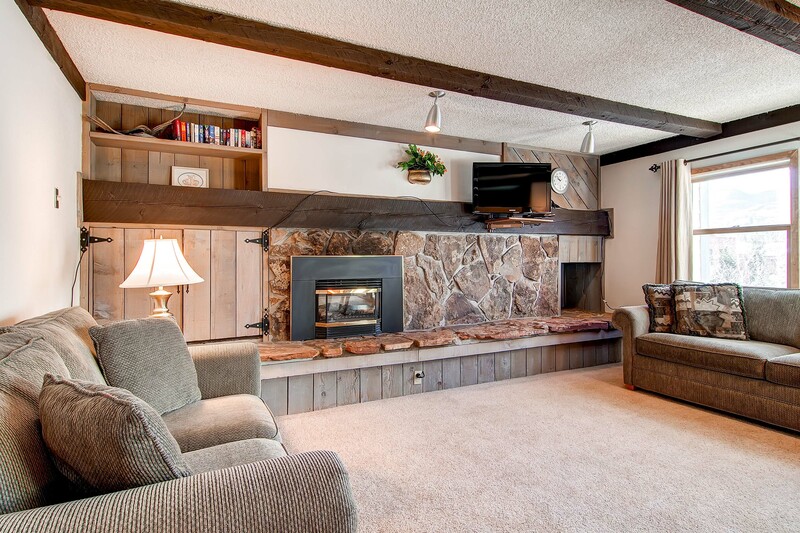 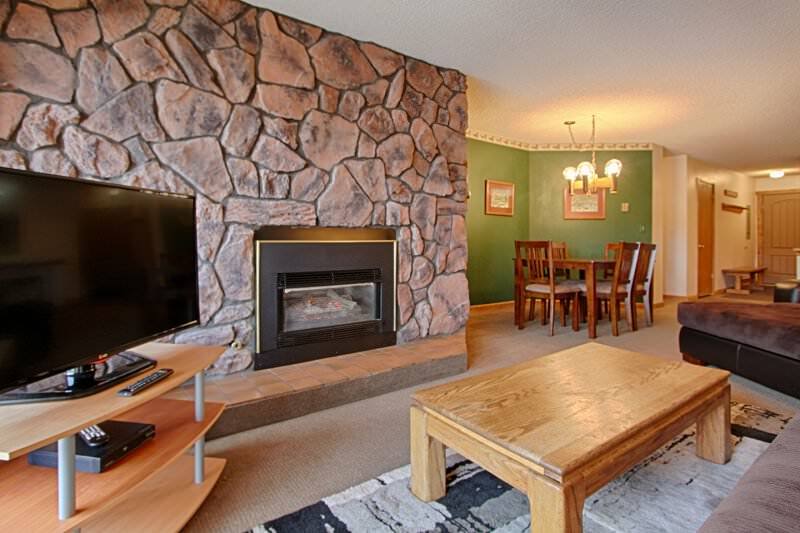 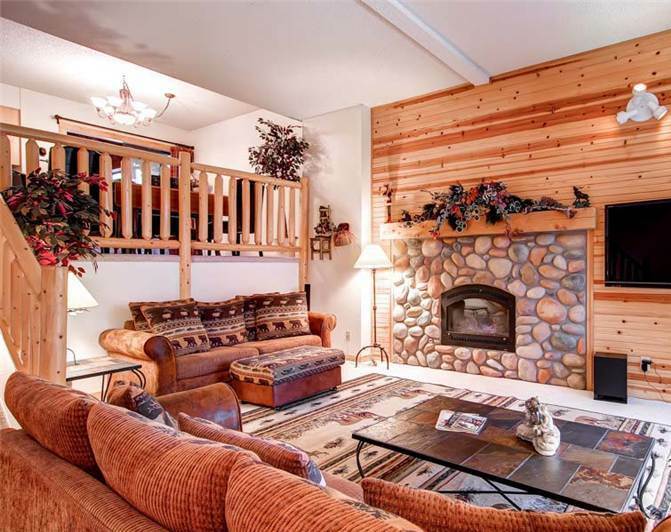 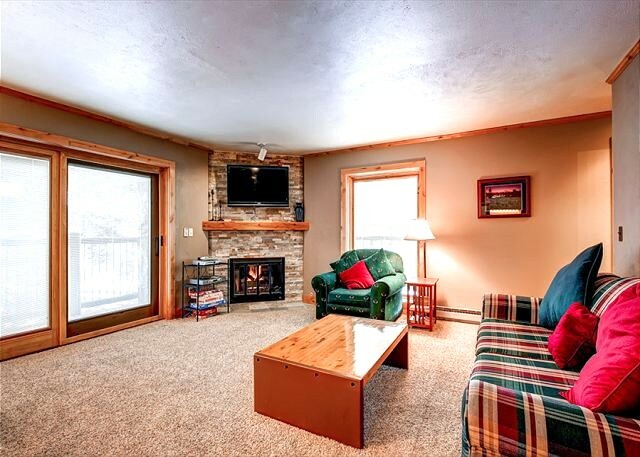 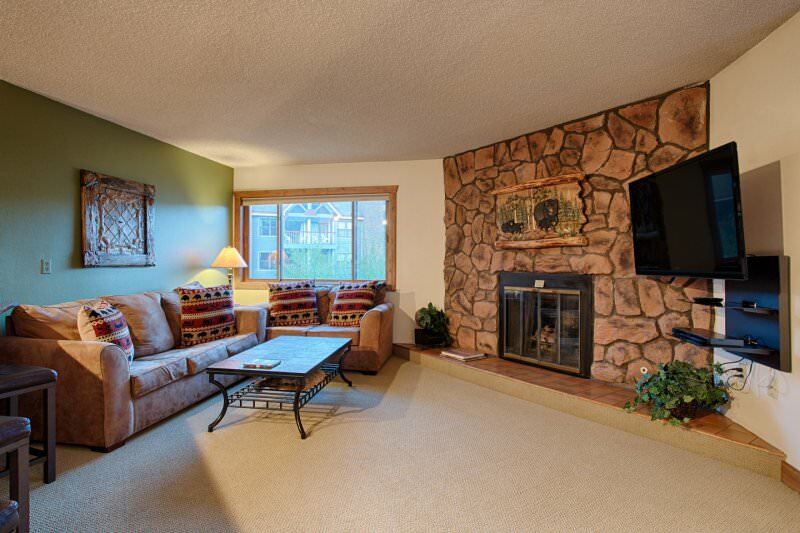 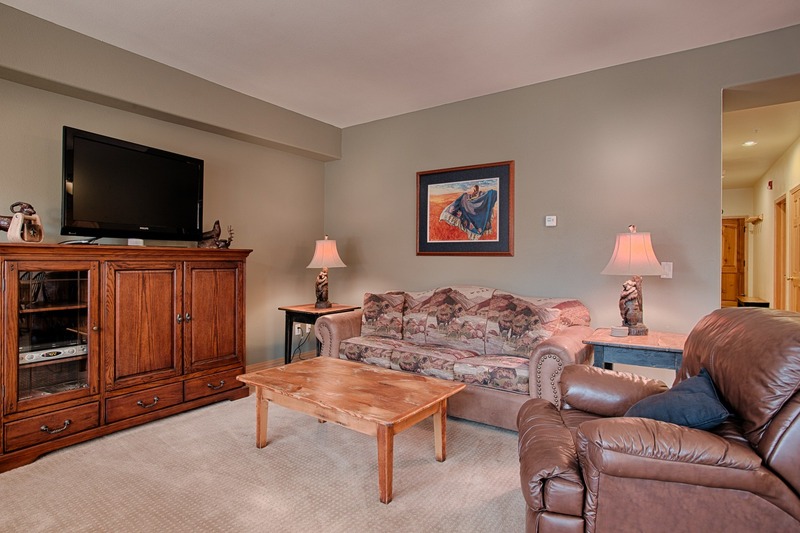 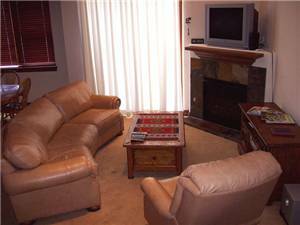 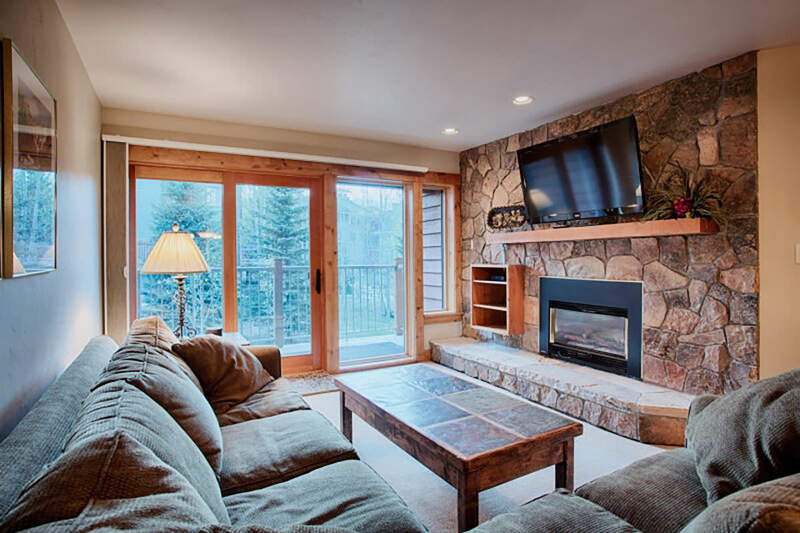 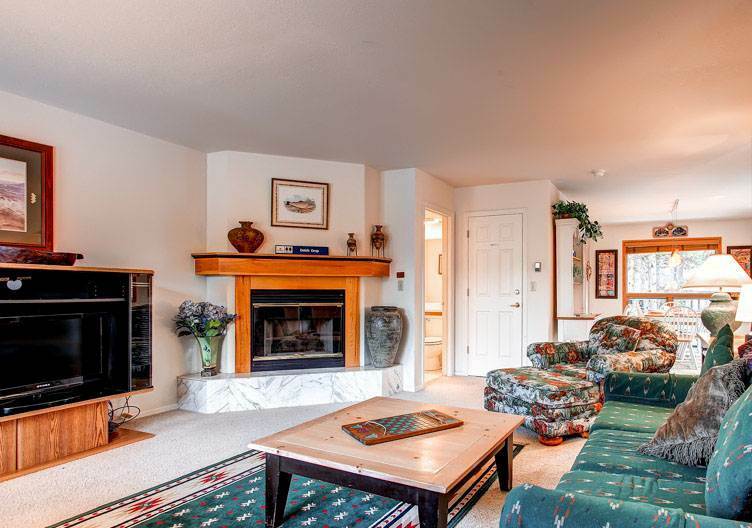 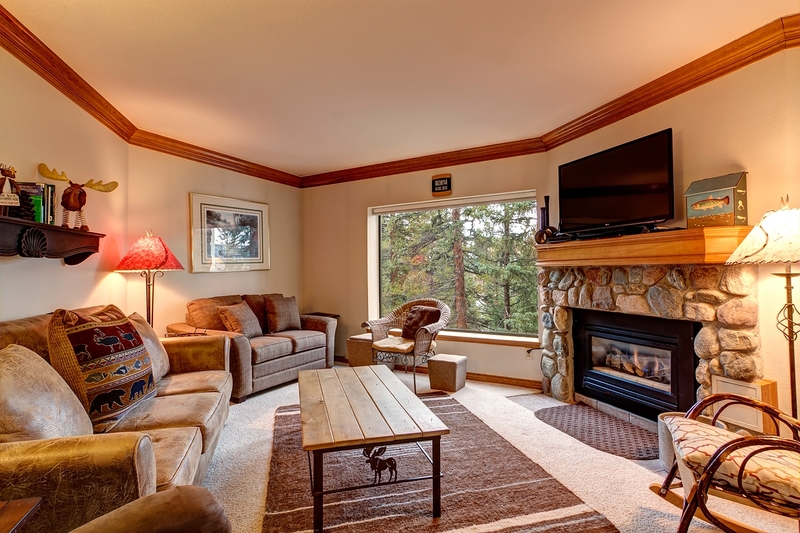 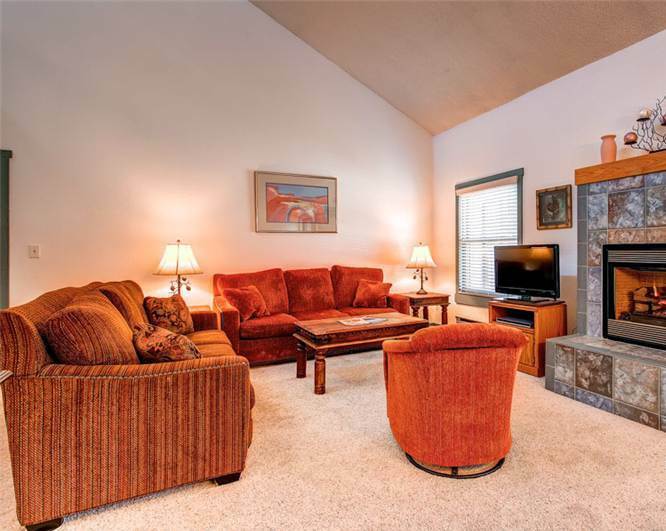 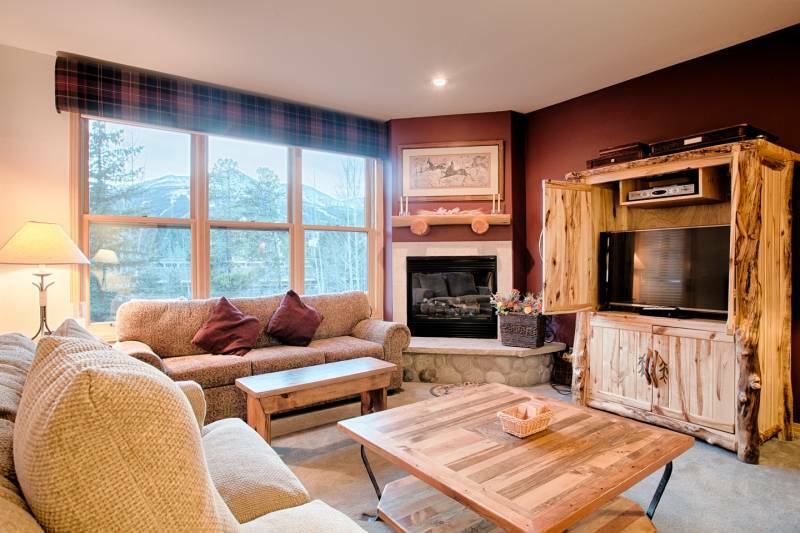 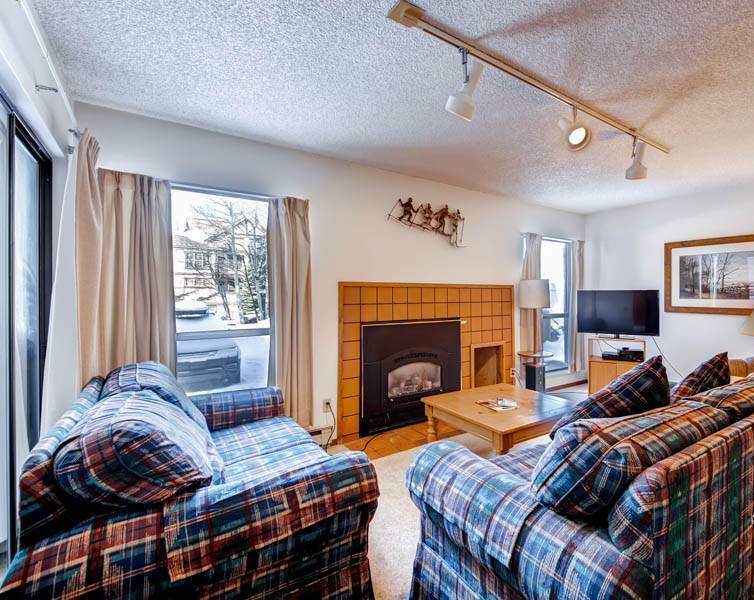 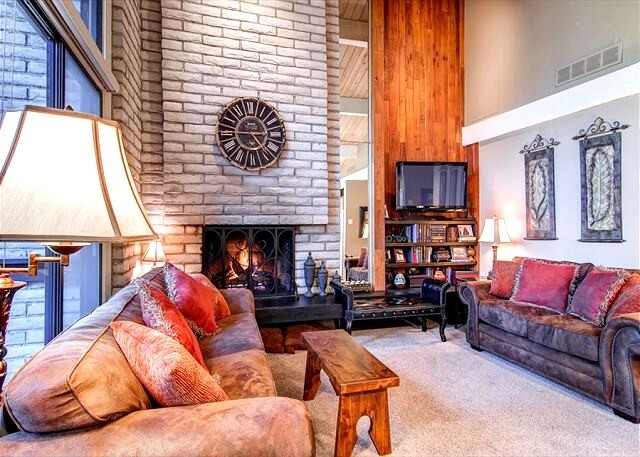 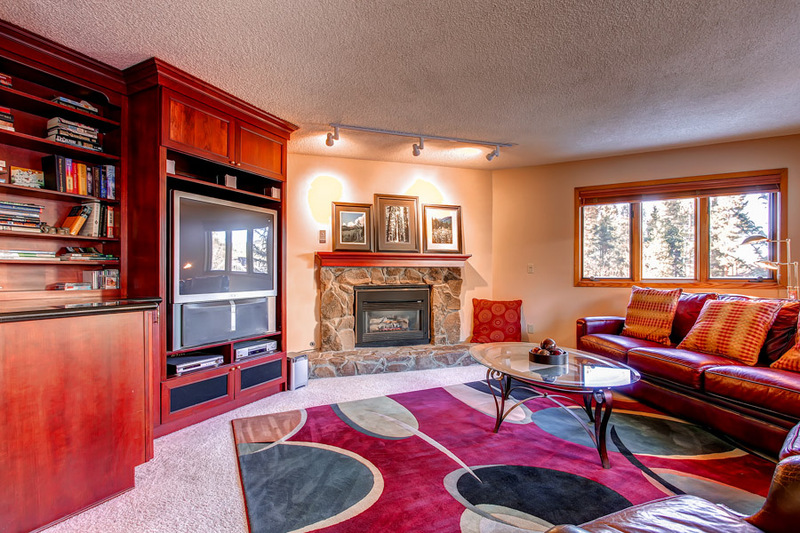 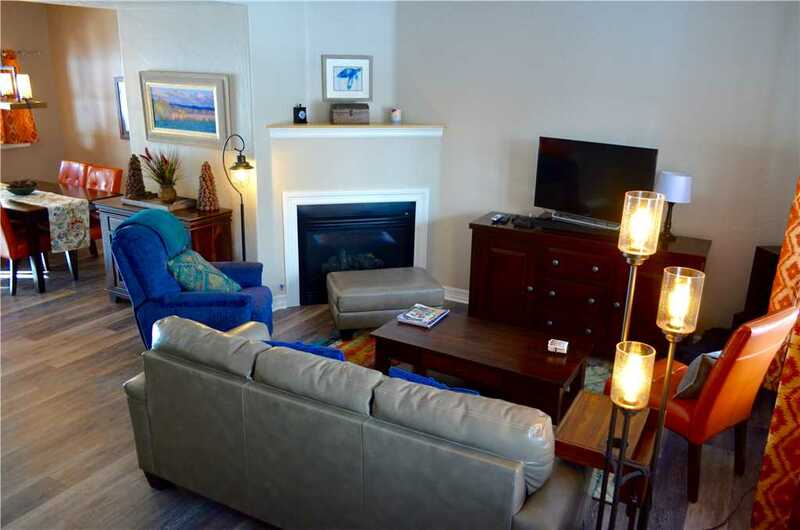 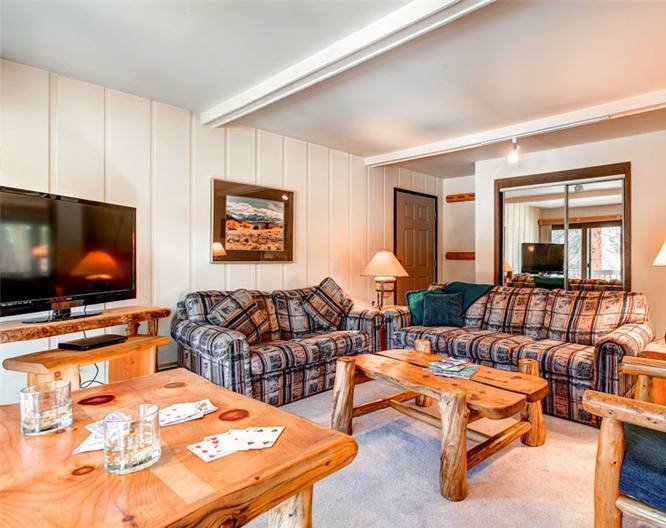 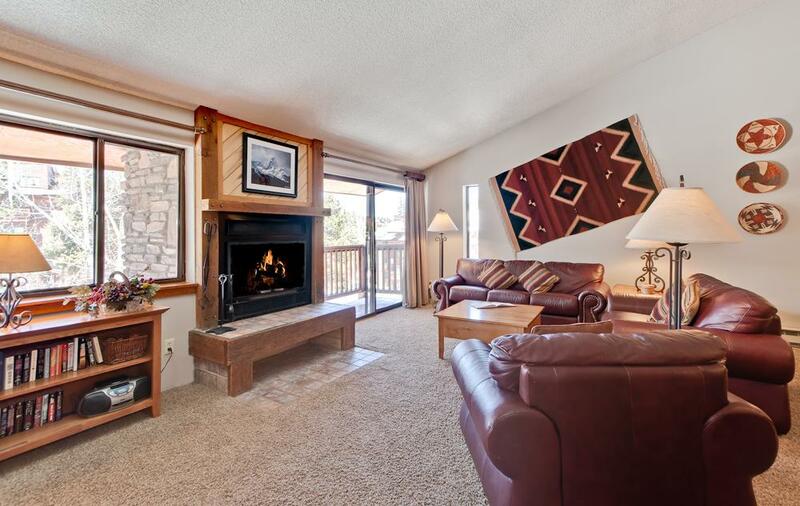 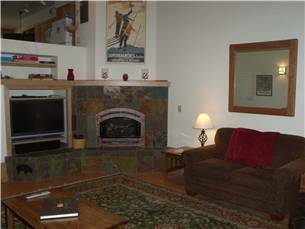 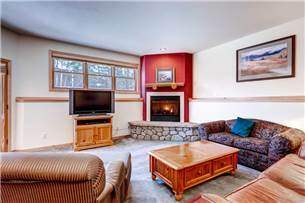 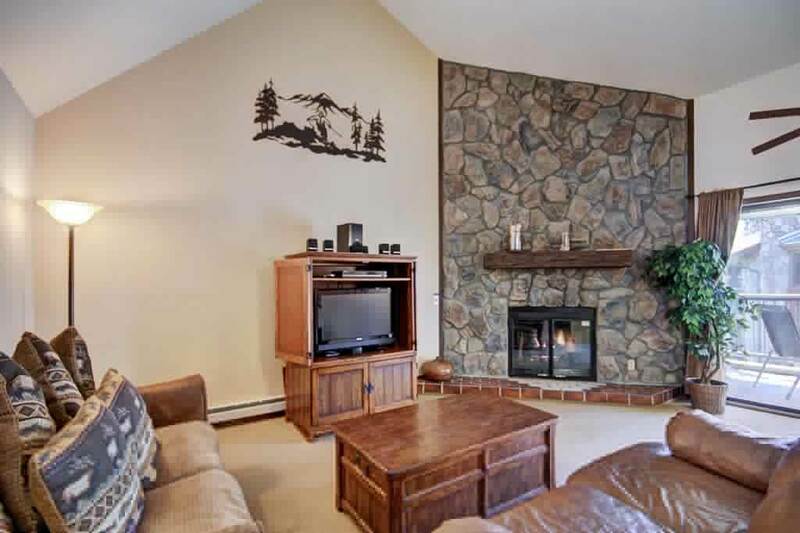 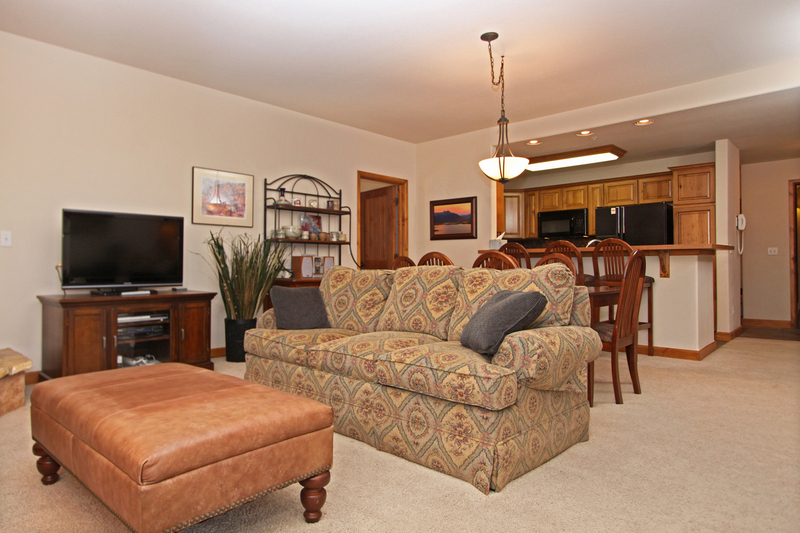 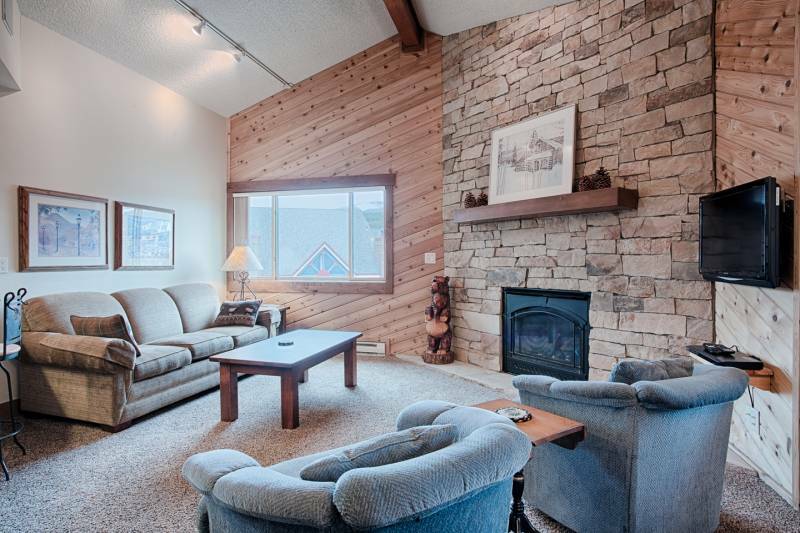 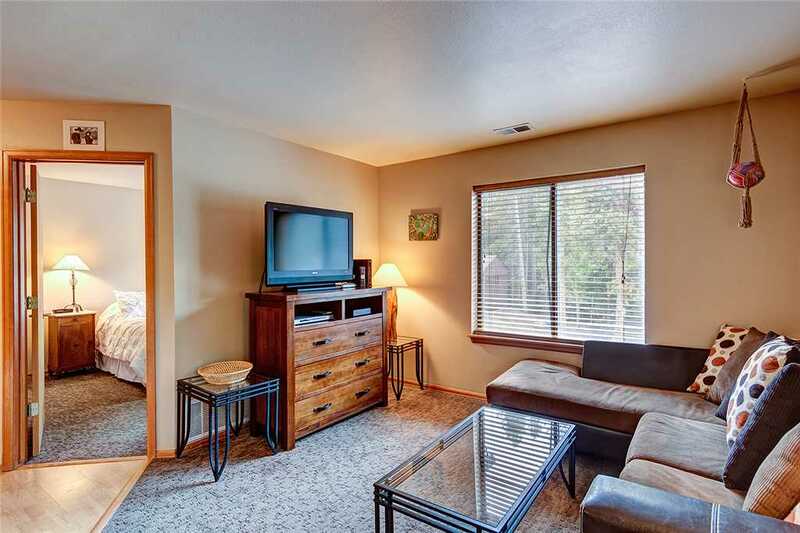 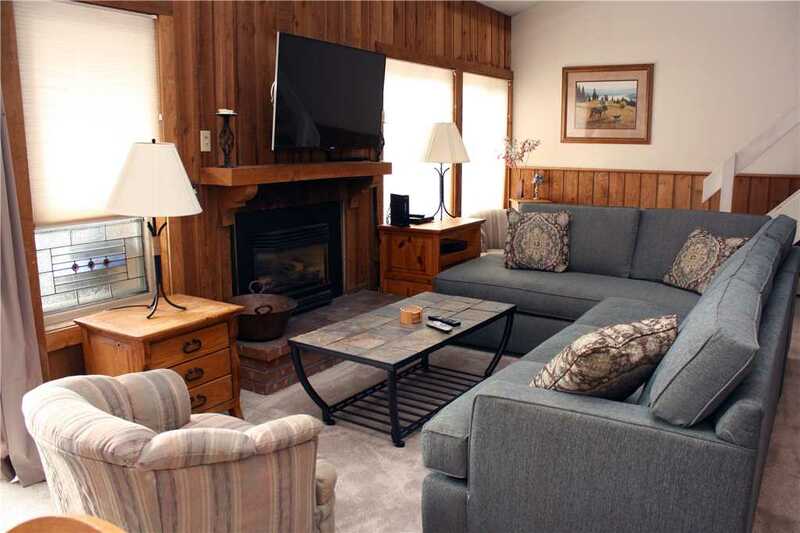 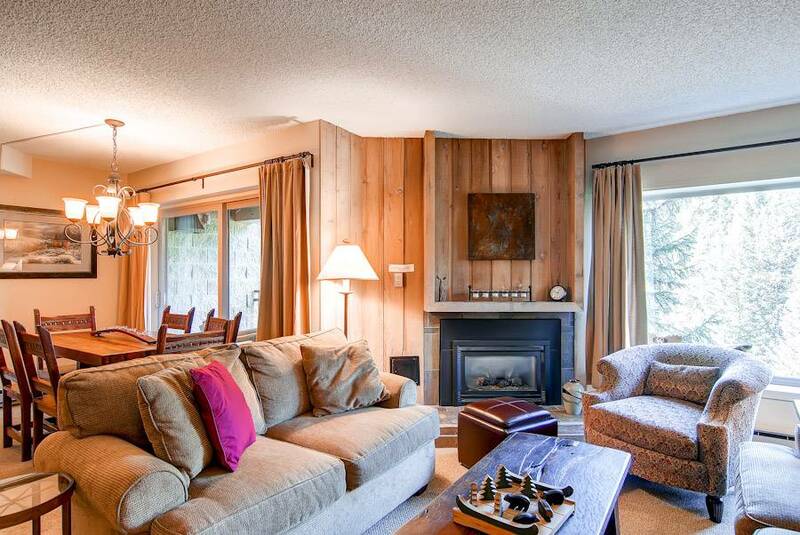 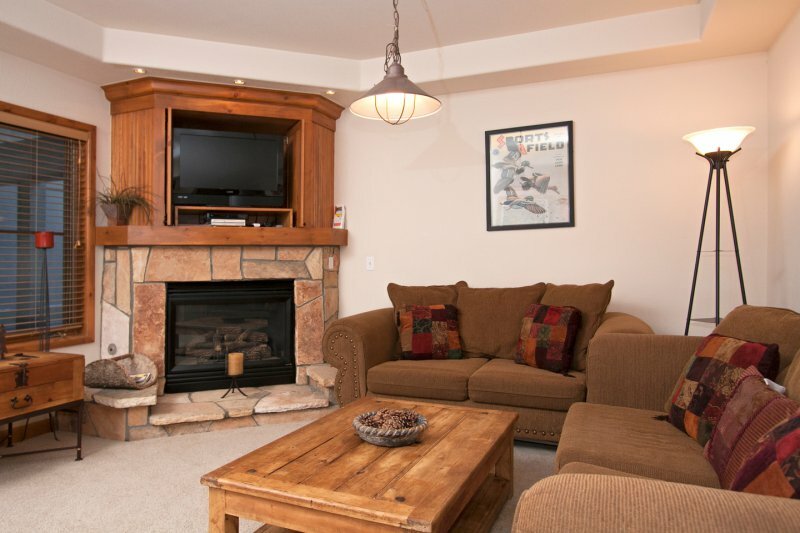 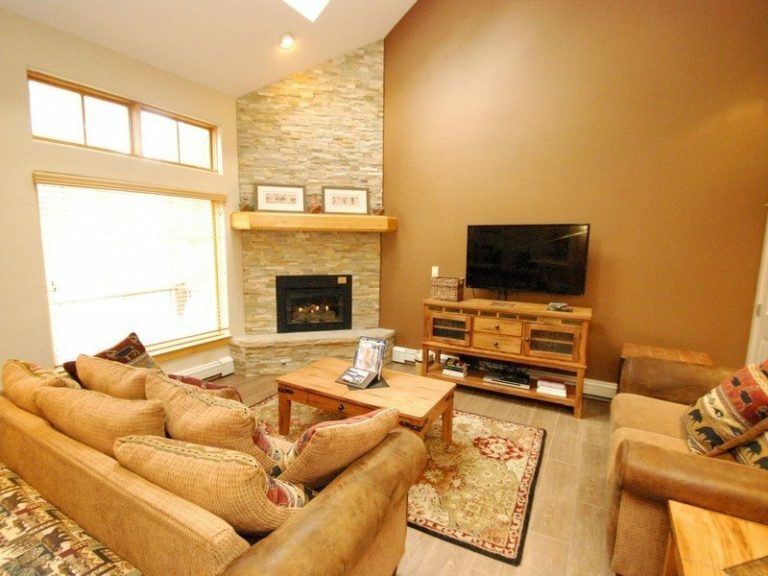 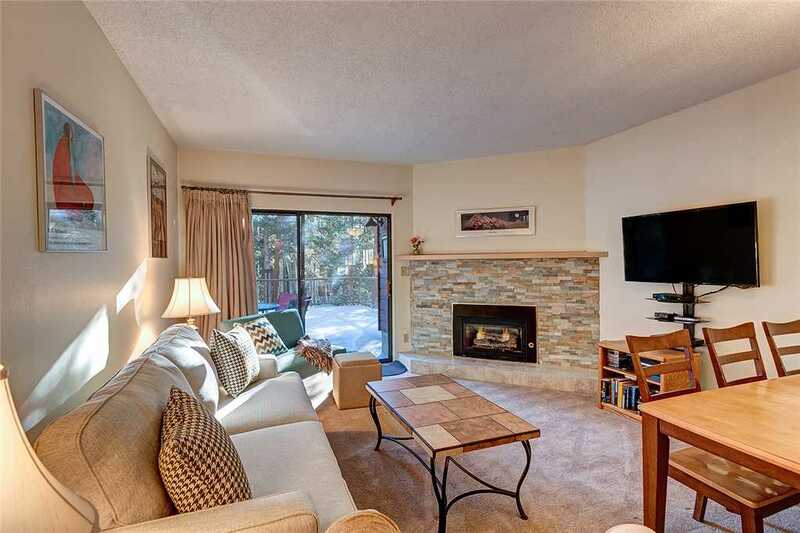 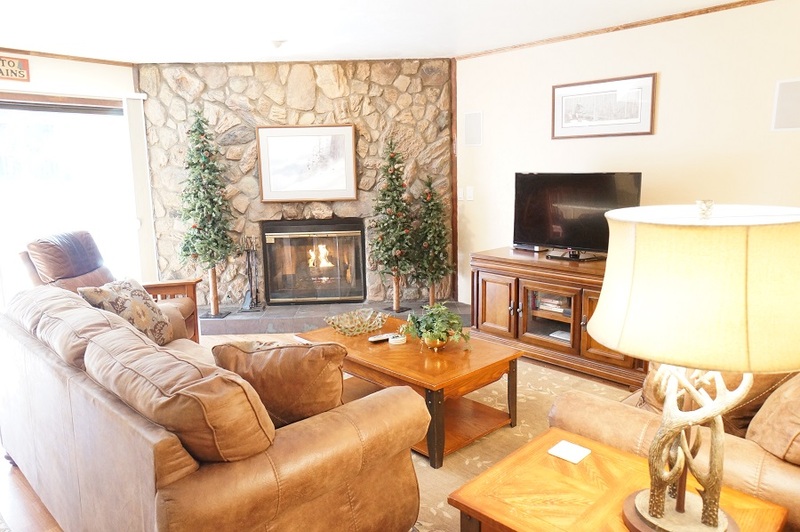 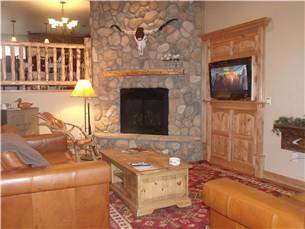 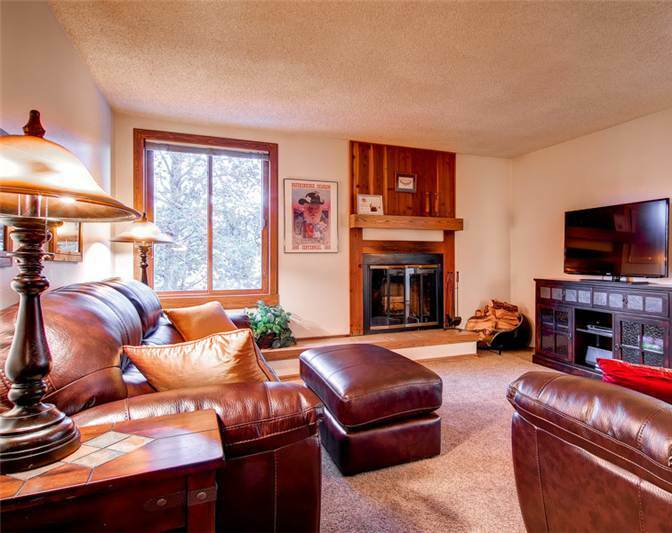 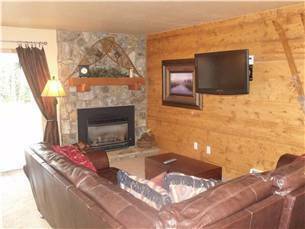 – Living area: LCD TV, gas fireplace, queen sleeper sofa and twin sleeper sofa. 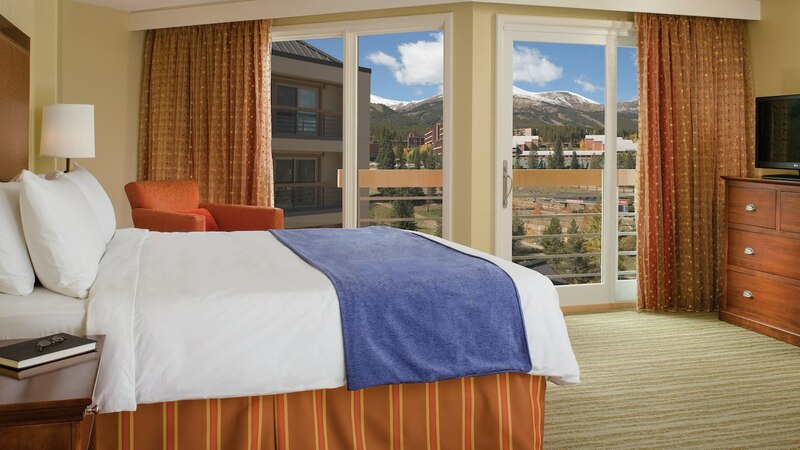 – A $500 refundable damage deposit will be charged to credit card at check in. 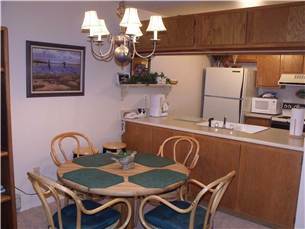 – Renters must be a minimum of 25 years old. 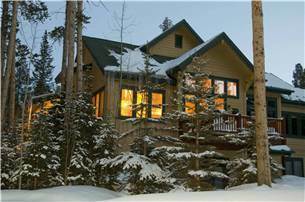 – A four-wheel drive vehicle is required during winter. 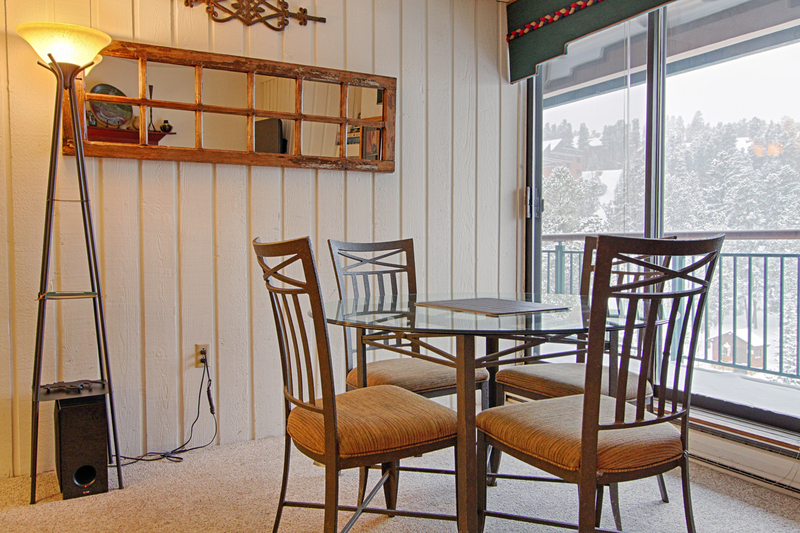 – Parking: 3 outdoor spaces total. 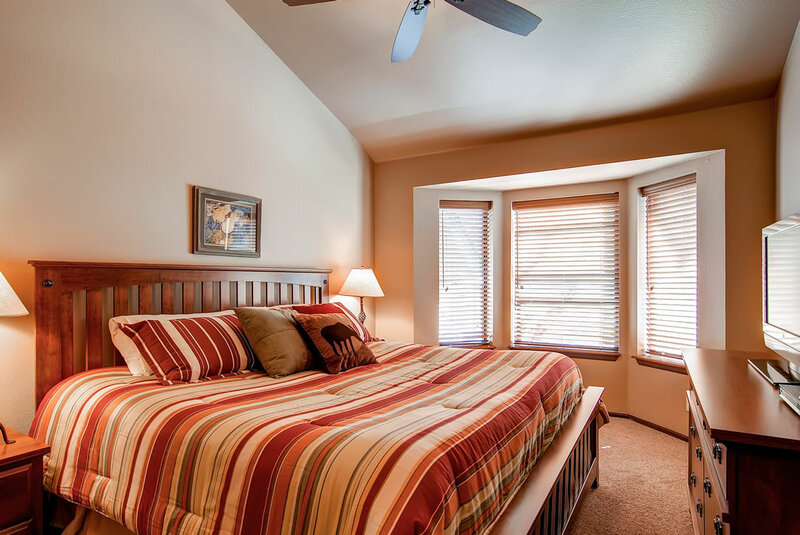 – No air conditioning. 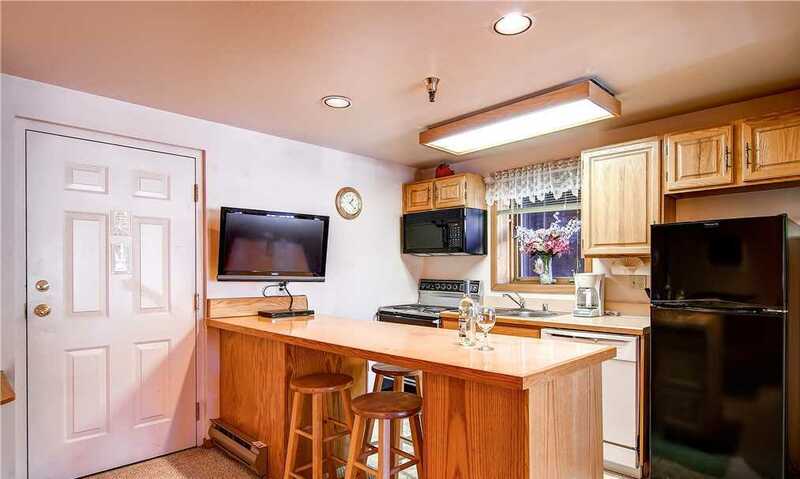 All units include at least one fan.